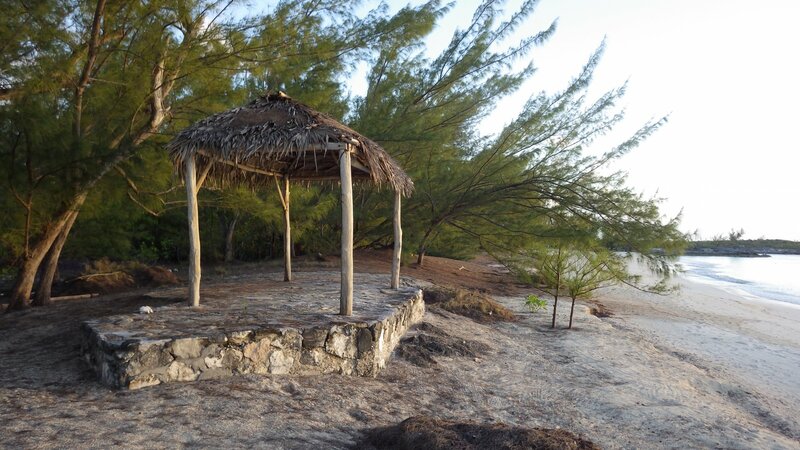 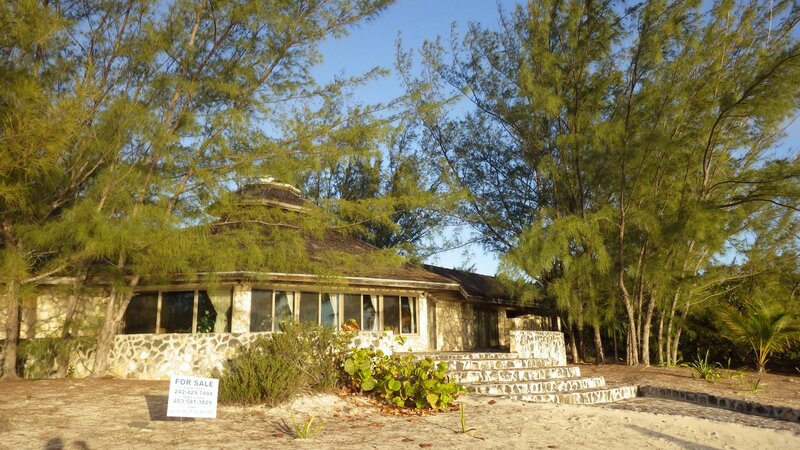 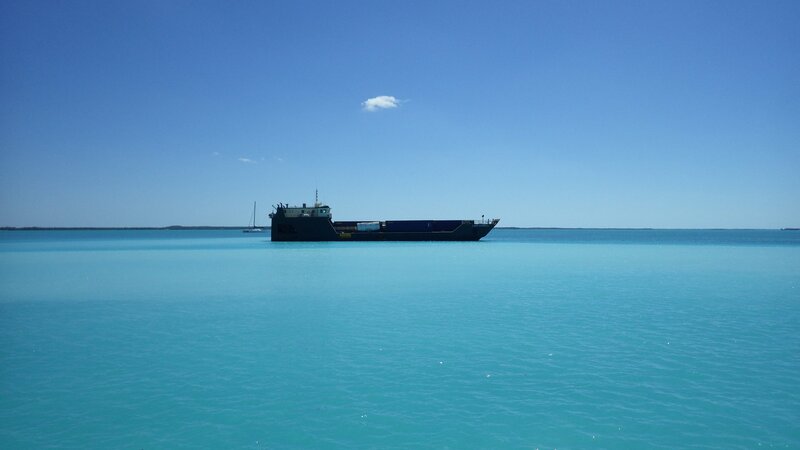 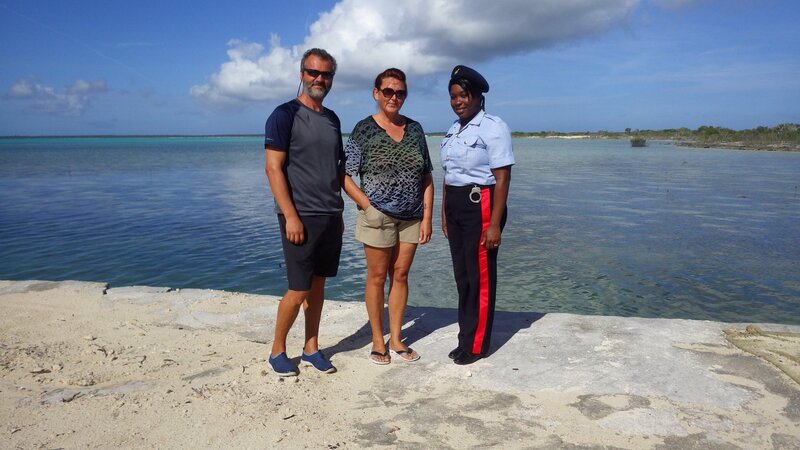 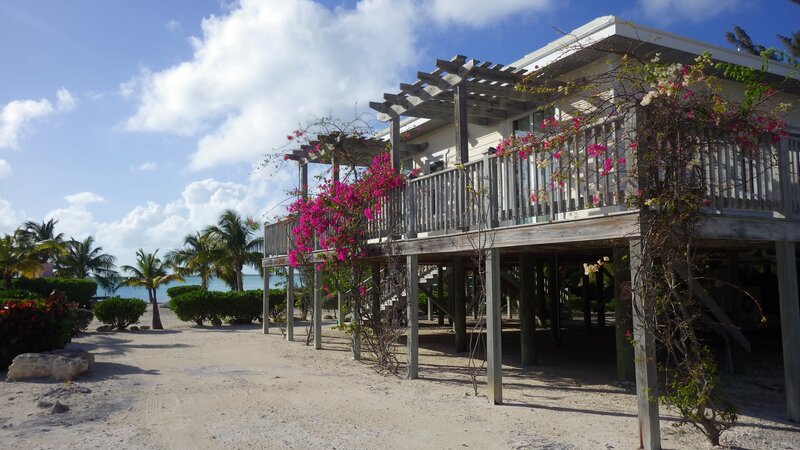 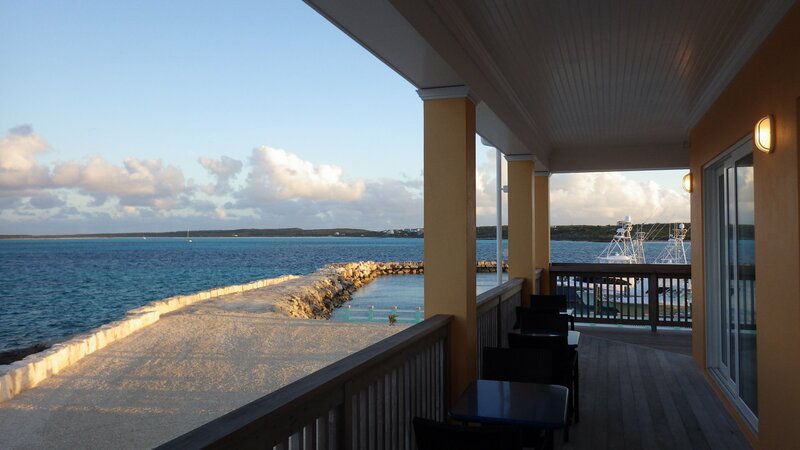 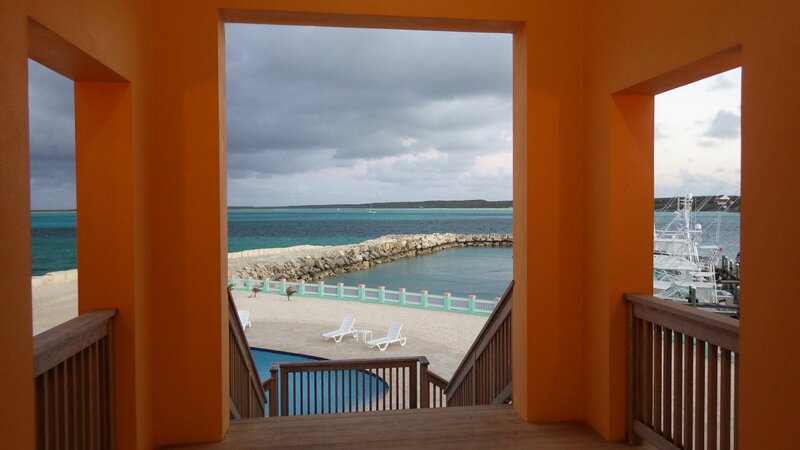 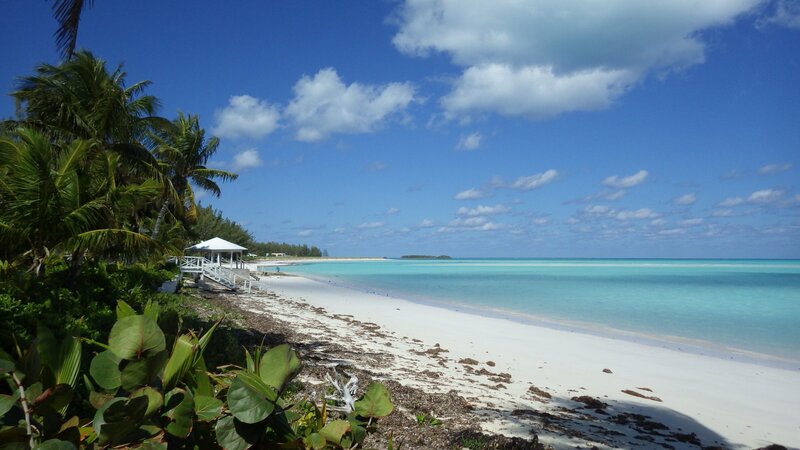 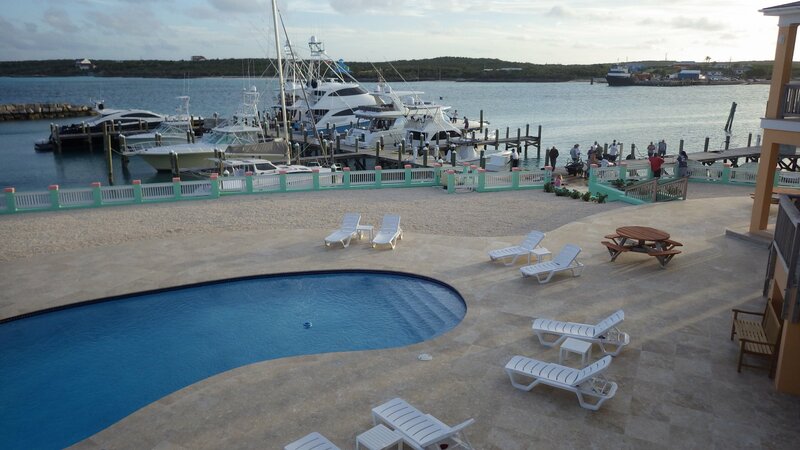 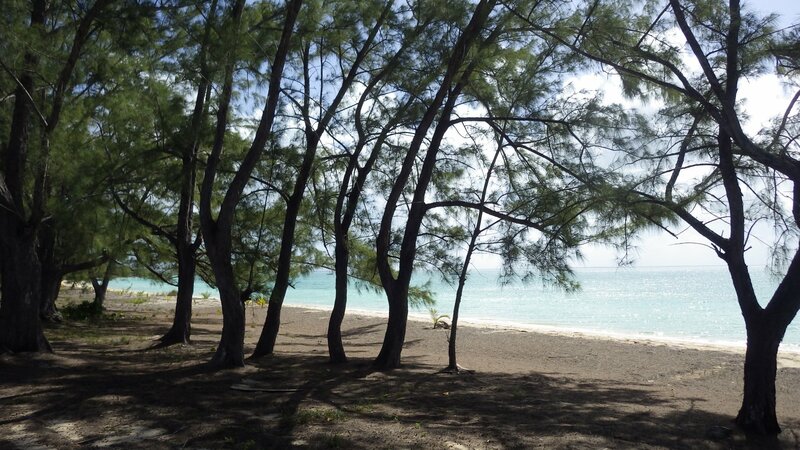 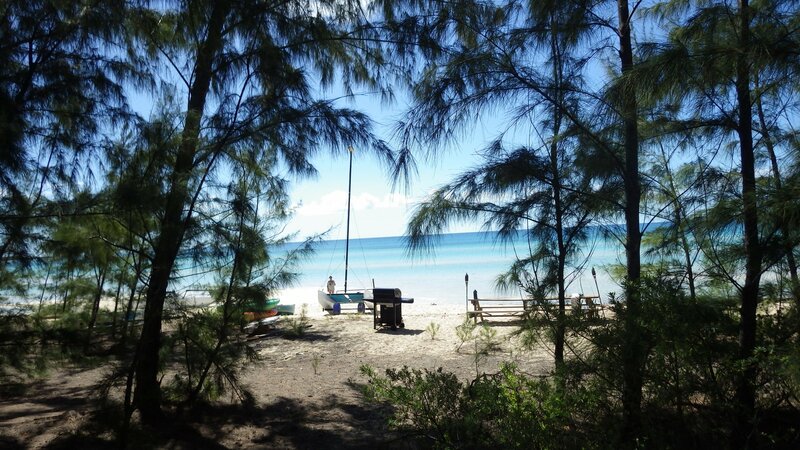 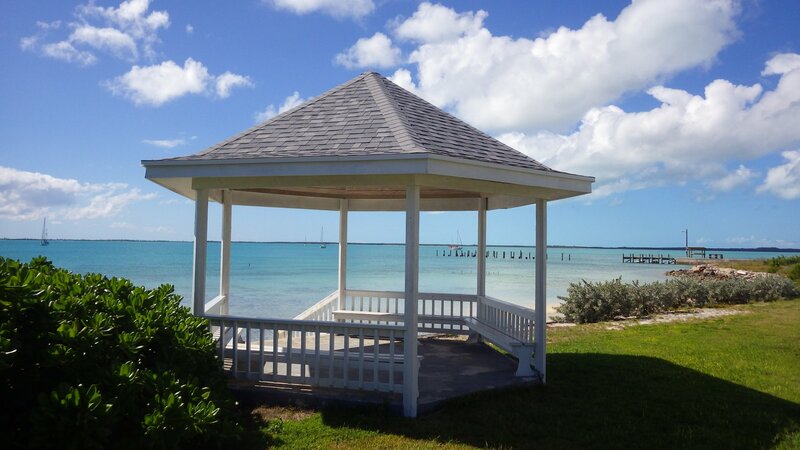 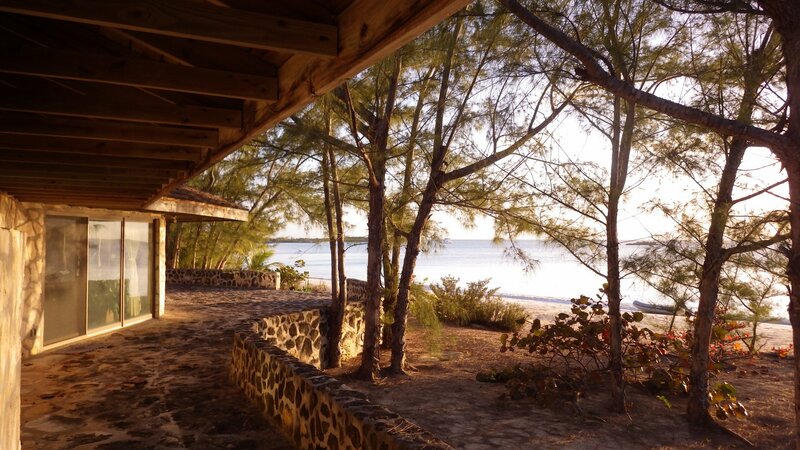 Checked-in with Bahamas' Customs at Abraham's Bay, Mayaguana. 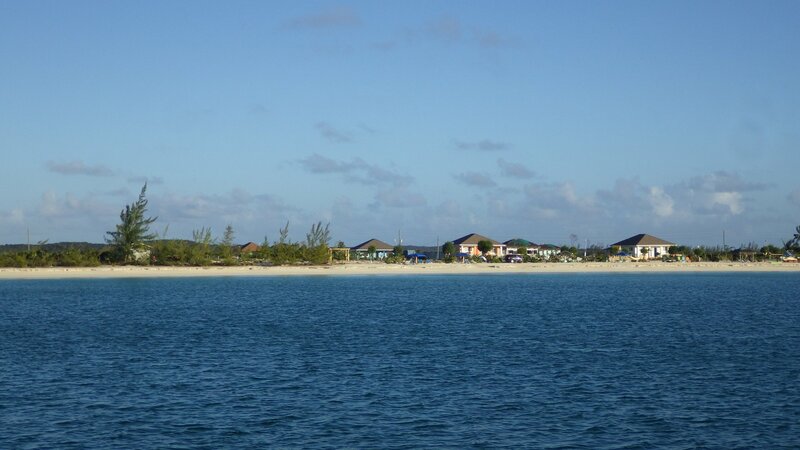 Spent some time around small town on this outpost island, seen flamingos in the bay nearby, picnicked on the beach couple times near shipwrecked boat. 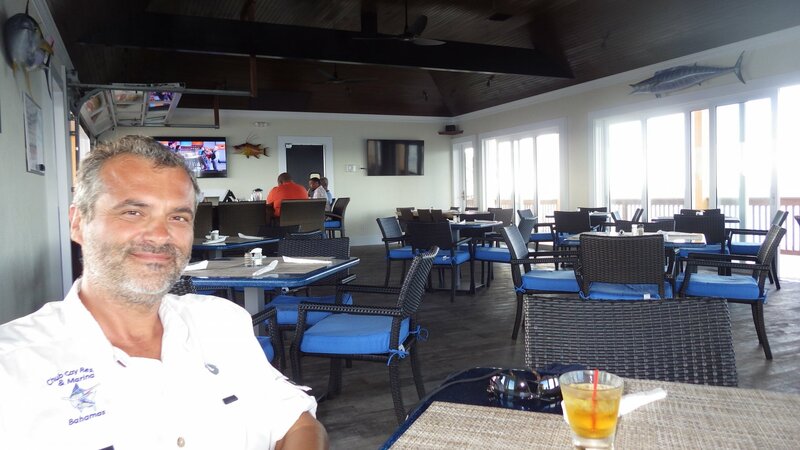 People here are quite friendly. 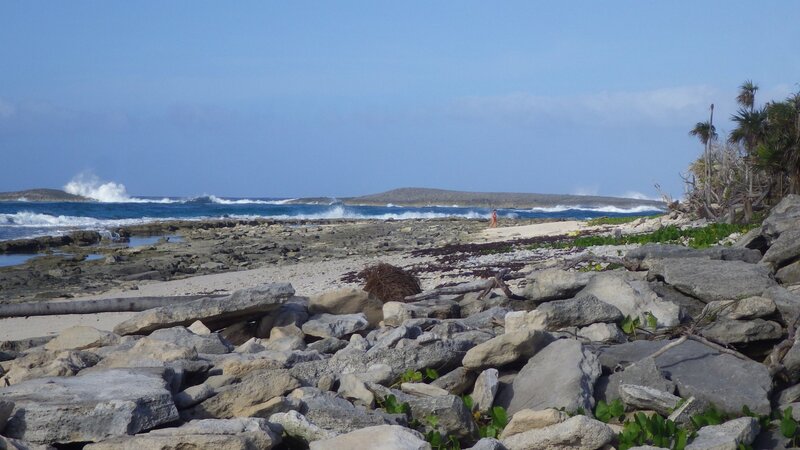 Weather forecast calls for quite few windy days, so we spent some time here. 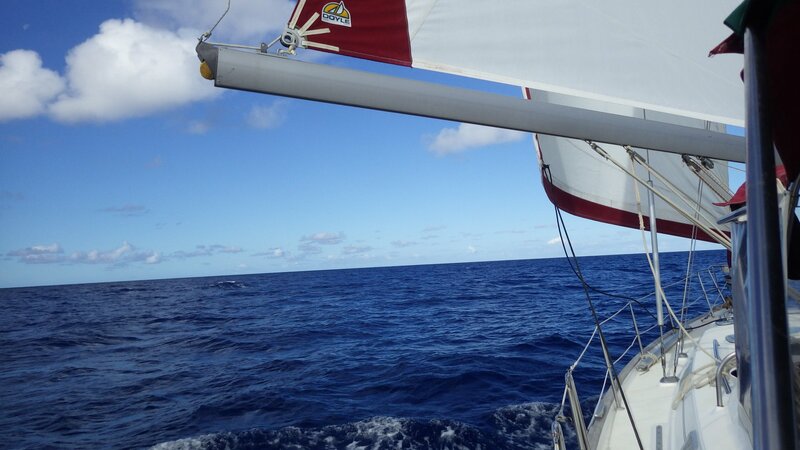 Moved to northwest corner of the island for couple days to change scenery and to stage our departure for the next passage. 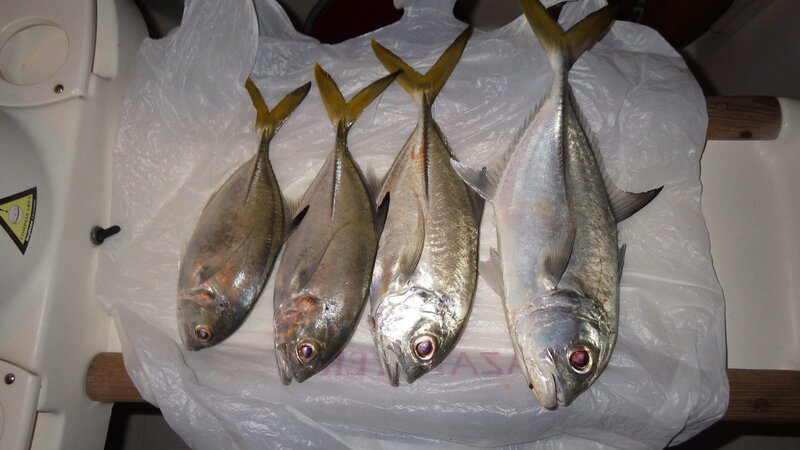 Caught few fish there while waiting. 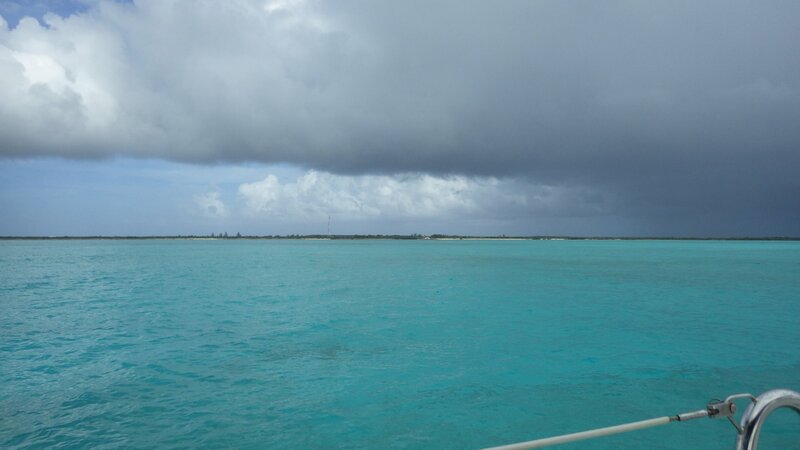 Weather is not really on our side this time around. 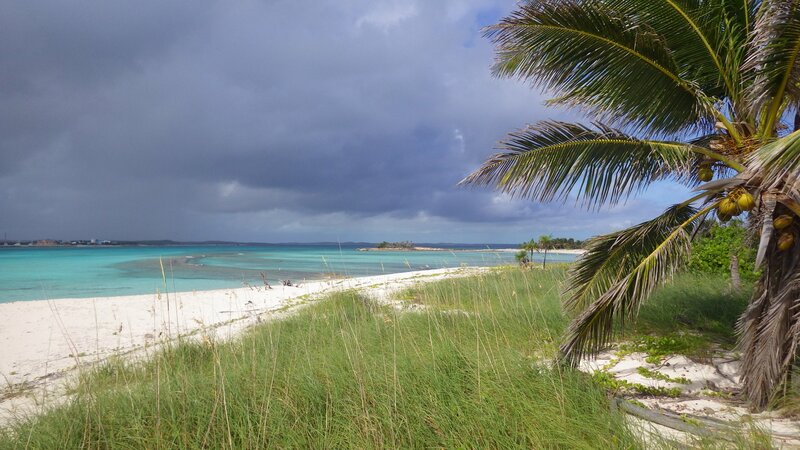 Have to stay and wait-out for a long time in one weather protected place, and move quickly before the next storm hit. 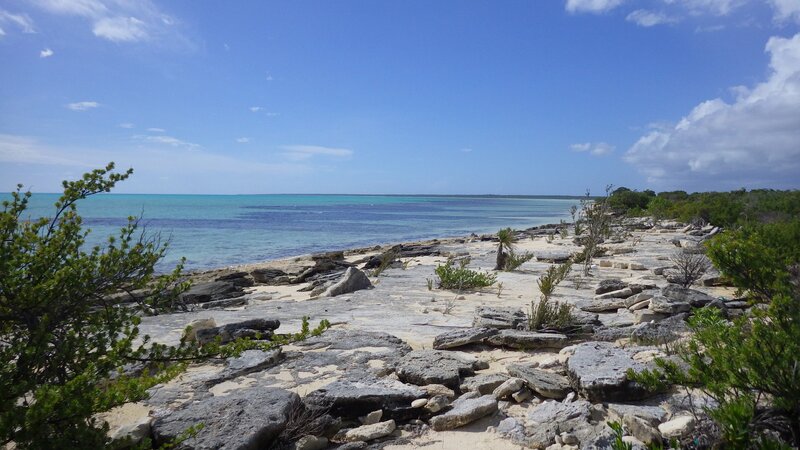 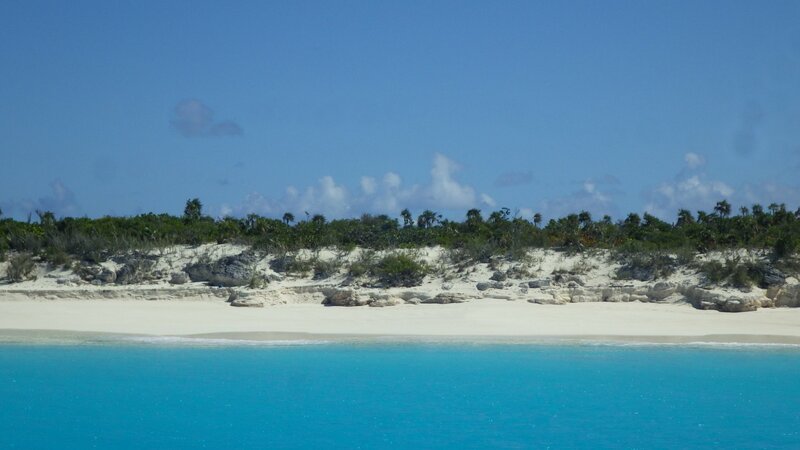 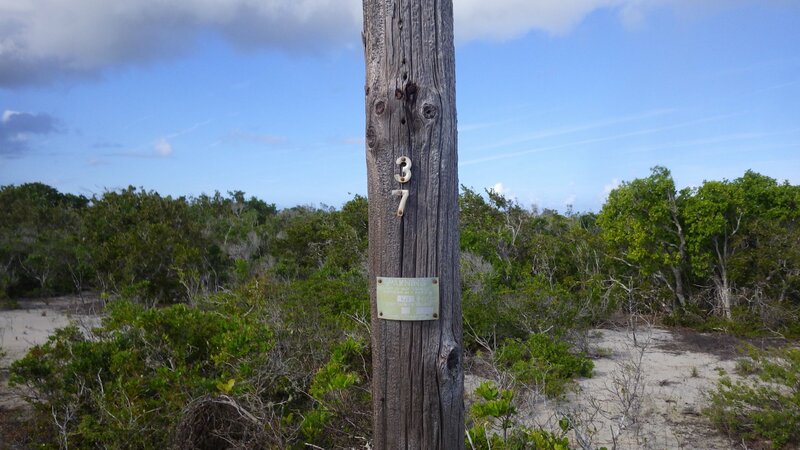 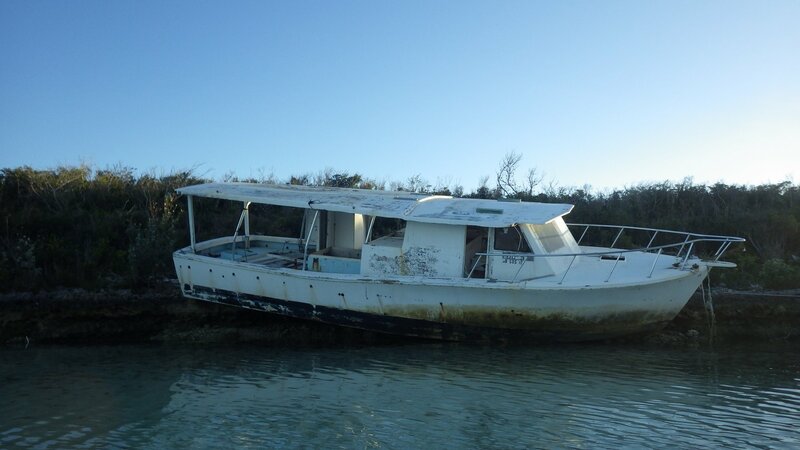 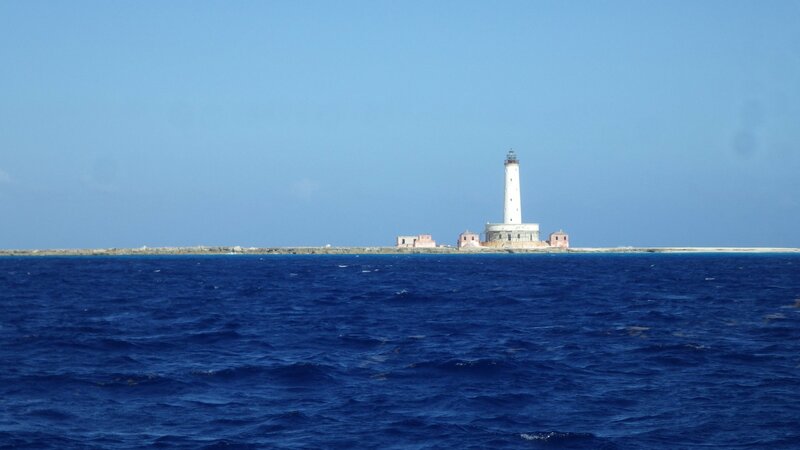 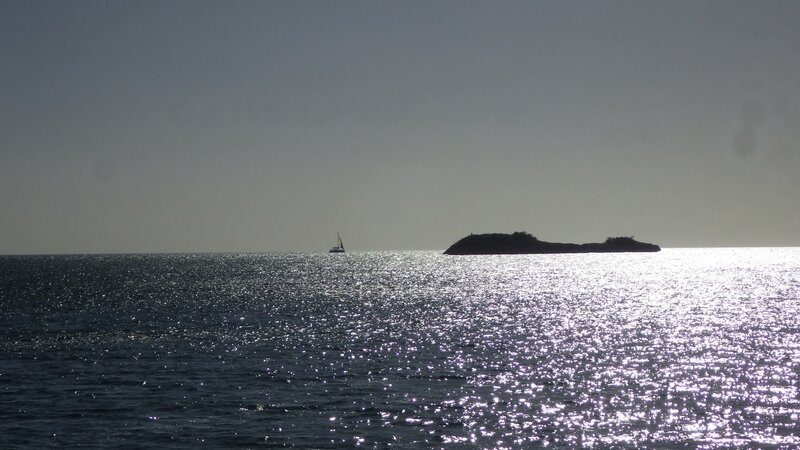 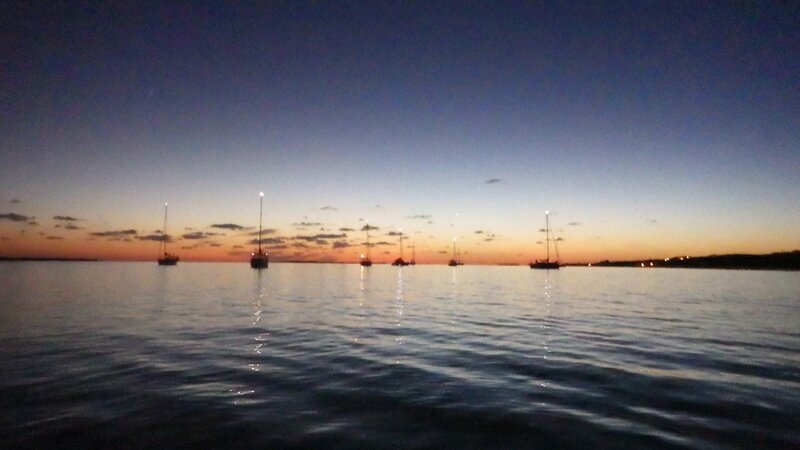 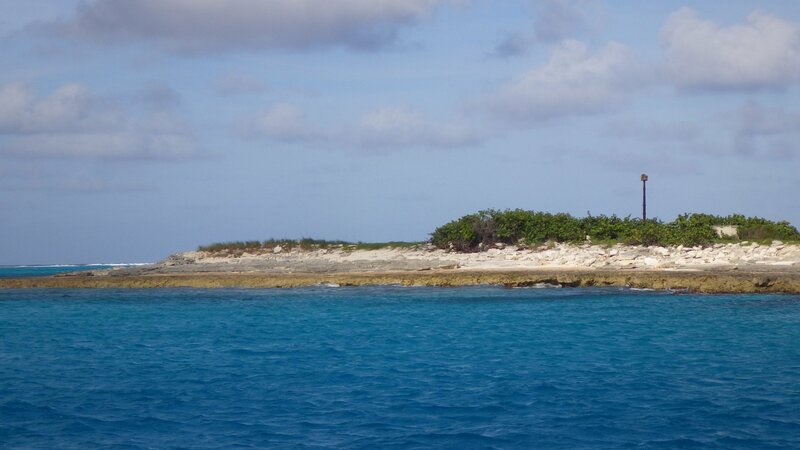 Brisk-sailed from Mayaguana to Long Island, passing Plana Cays, stopping only overnight at Attwood Harbour on Acklins Island and at the northwest point on Crooked Island. 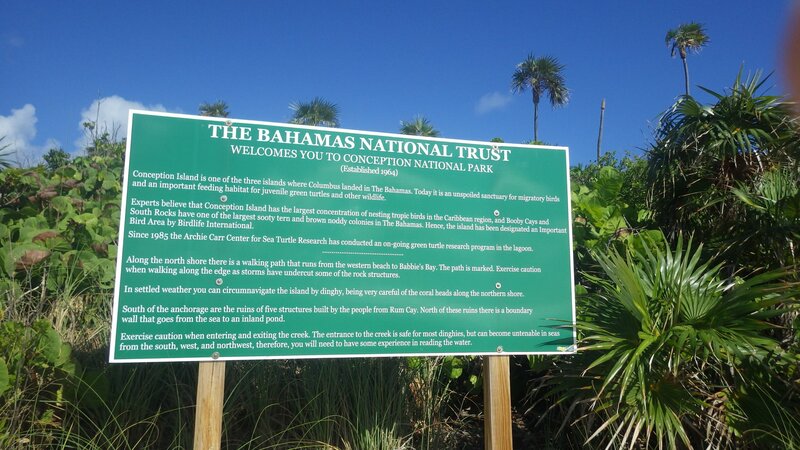 Feel sorry we didn't have more time to spend in these nice places, however we did have such opportunity two years ago on or southbound trip through Bahamas. 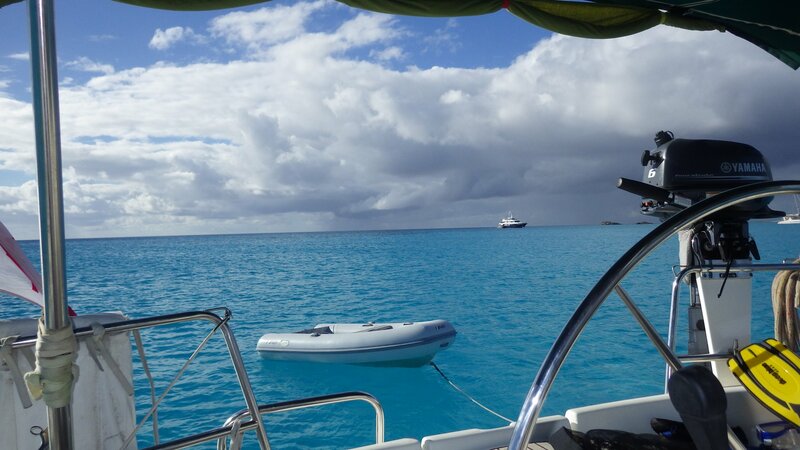 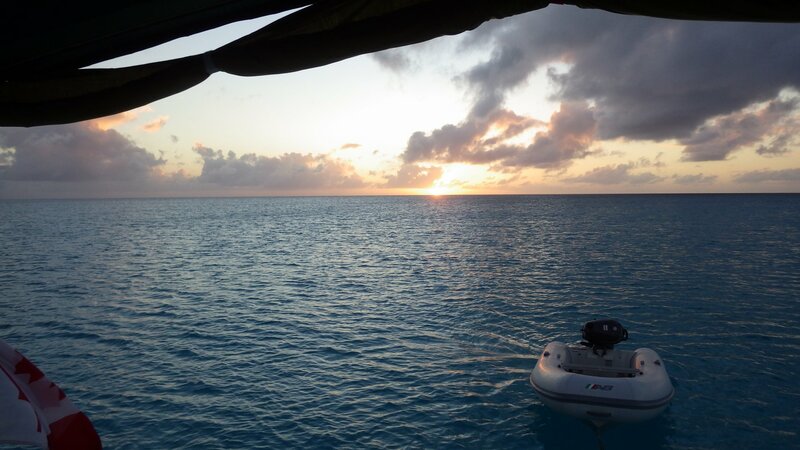 Our autopilot got broken during rough passage � couldn�t keep up with load of heavy wind and rough waves. 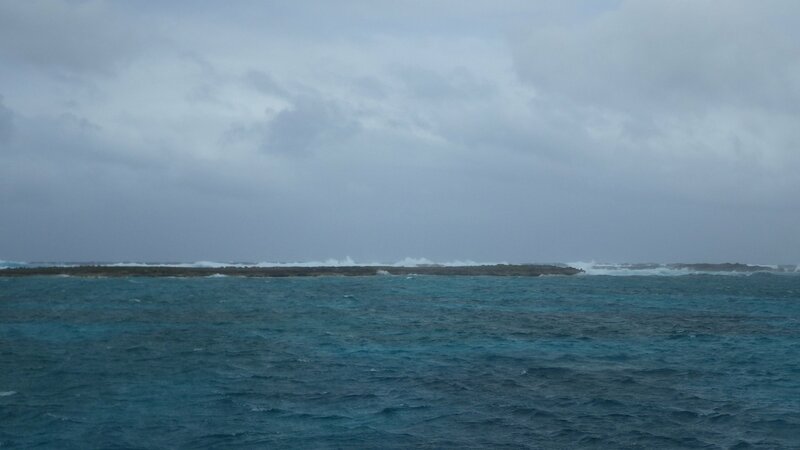 With several days of strong easterly winds in the forecast, Clarence Town on Long Island seemed like the only reasonable place in the area to ride the storm. 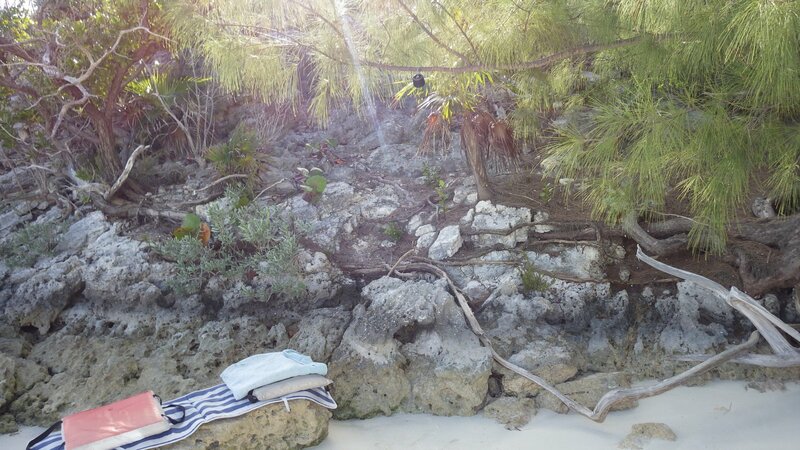 Ended up staying 10 days there. 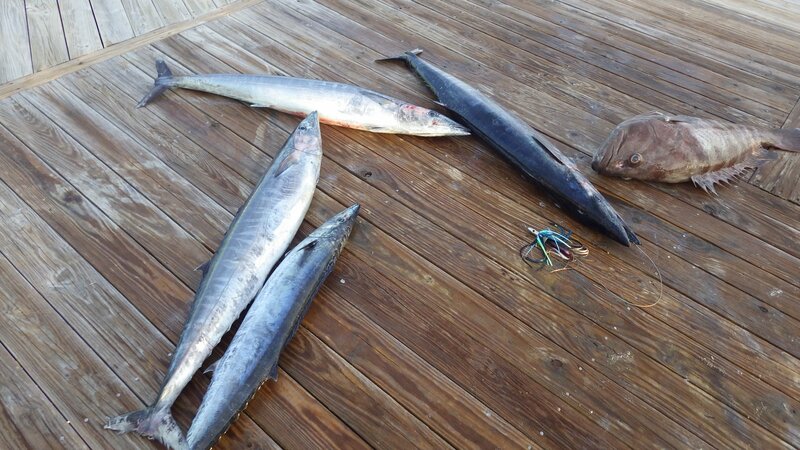 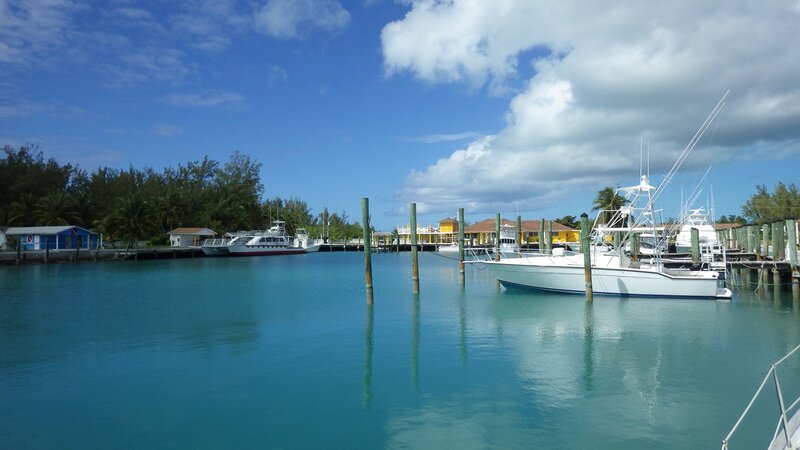 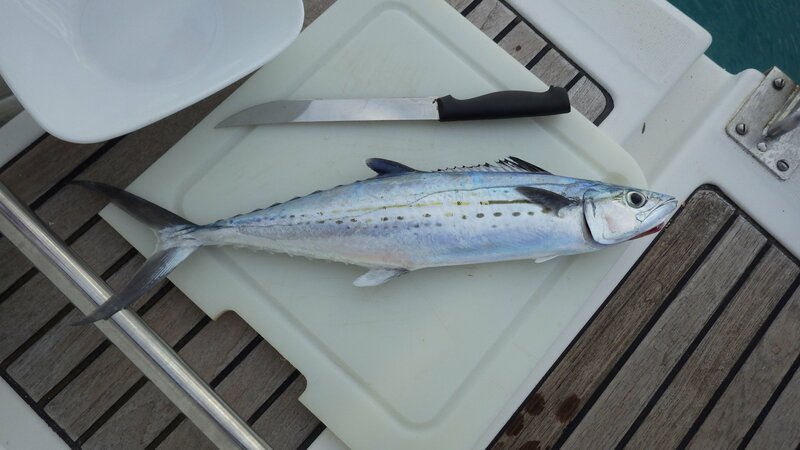 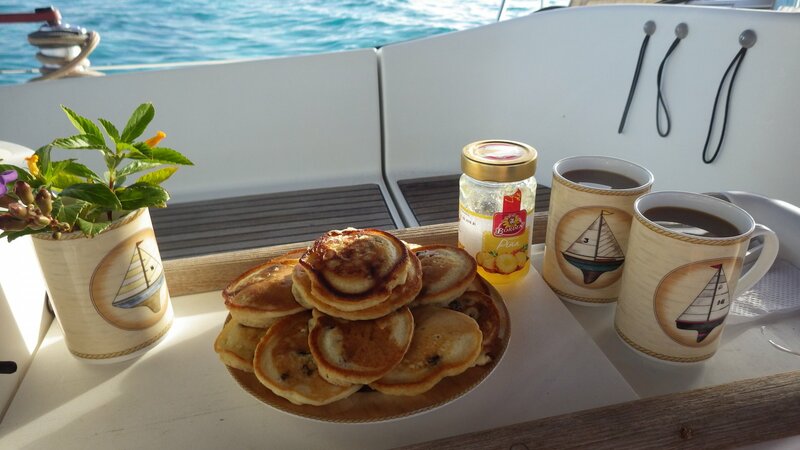 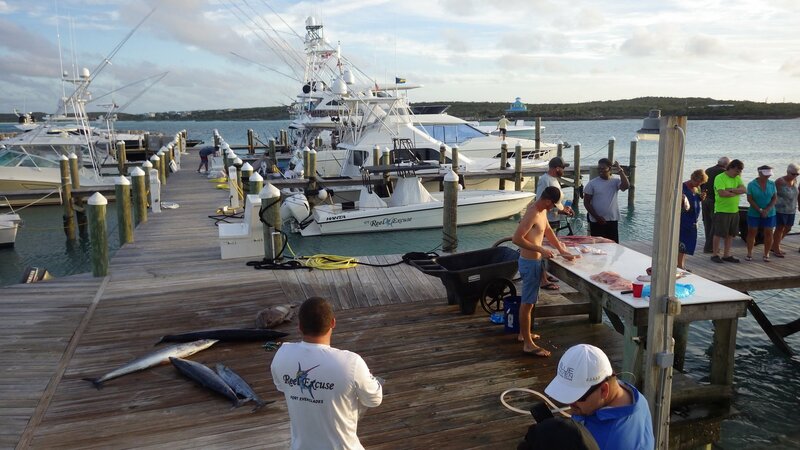 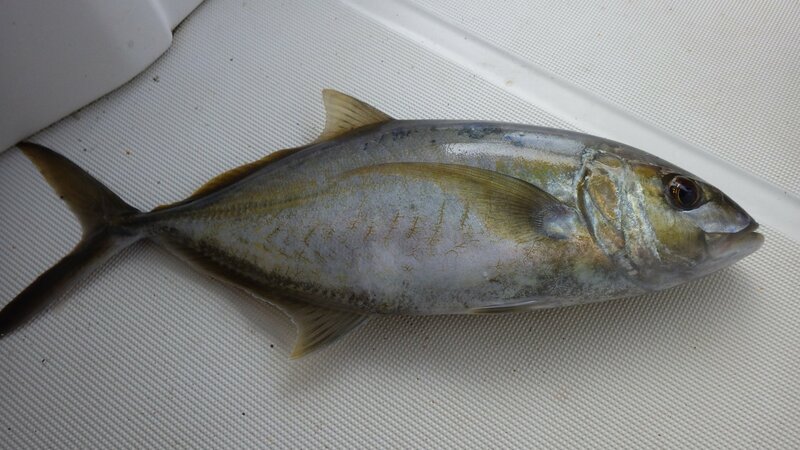 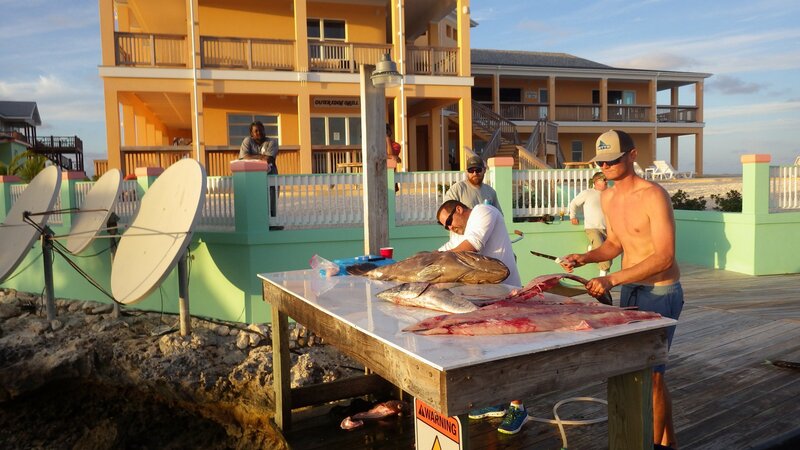 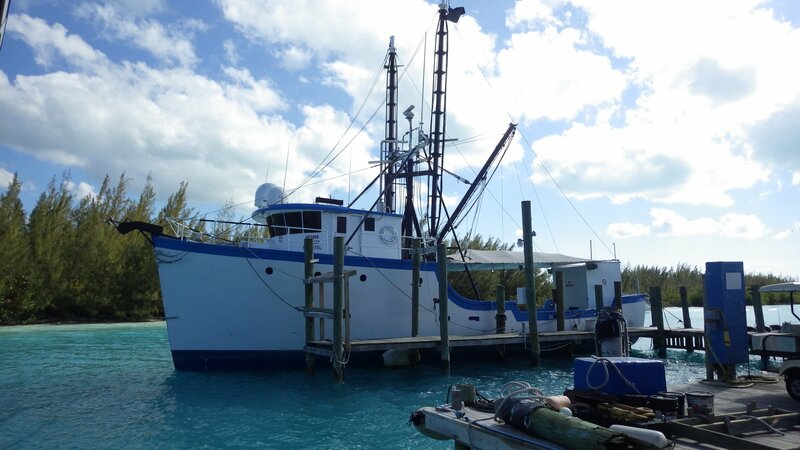 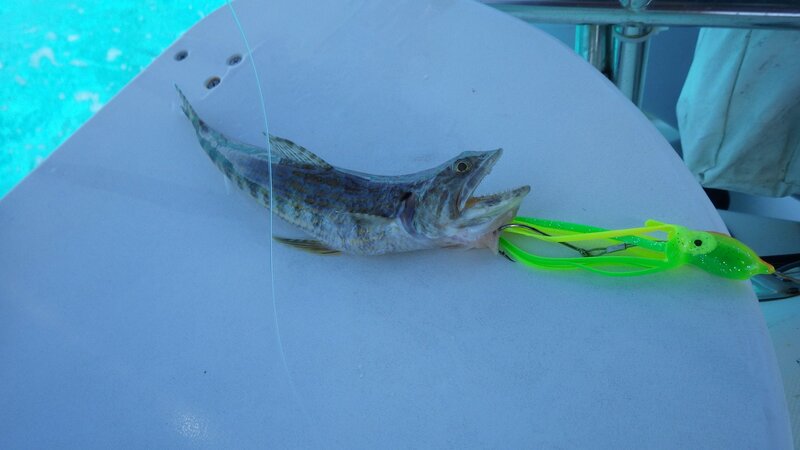 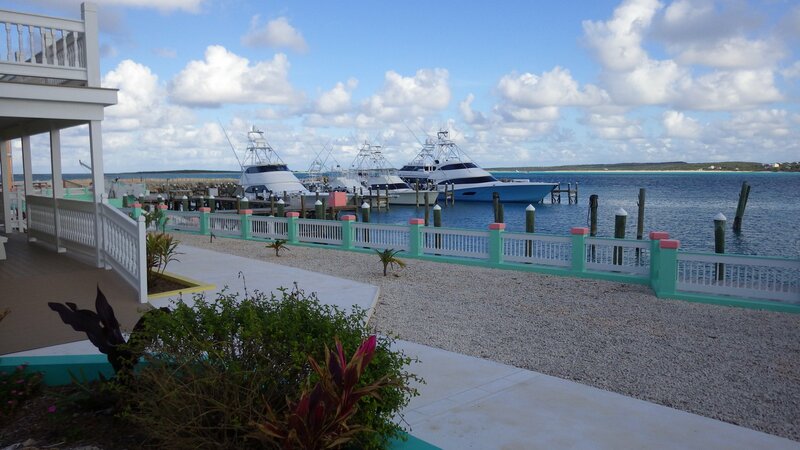 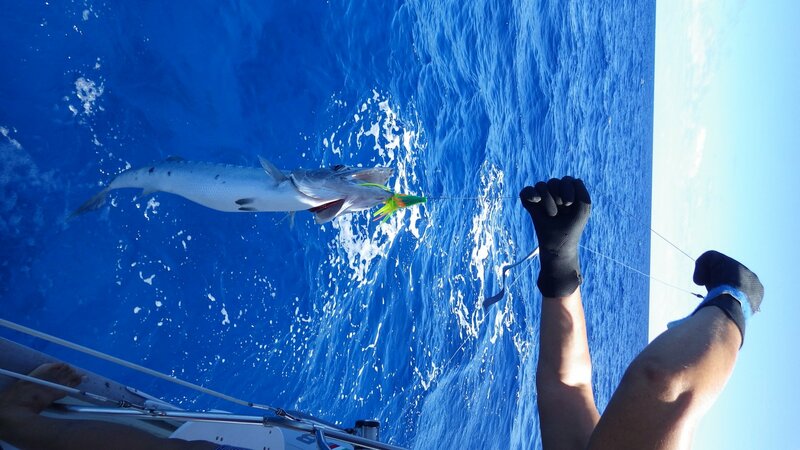 Our visit coincided with the fishing tournament at the local marina � have seen quite few big fish cough by sport fishermen, even had a change to try some Wahoo. 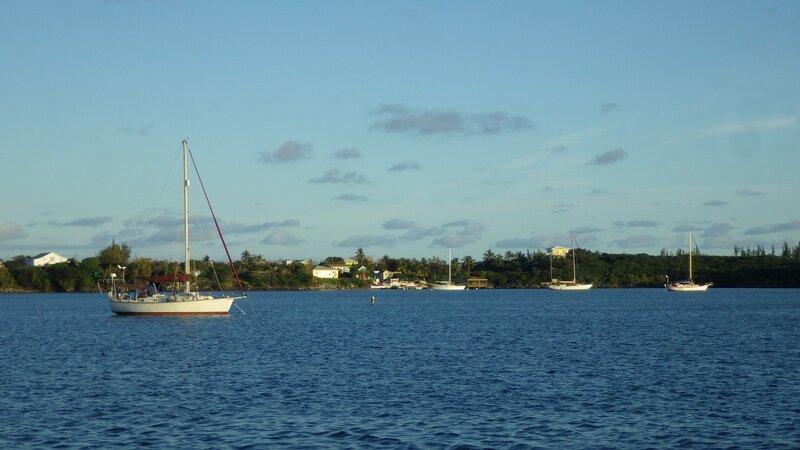 We anchored far from town, right behind the reef protecting us form waves. 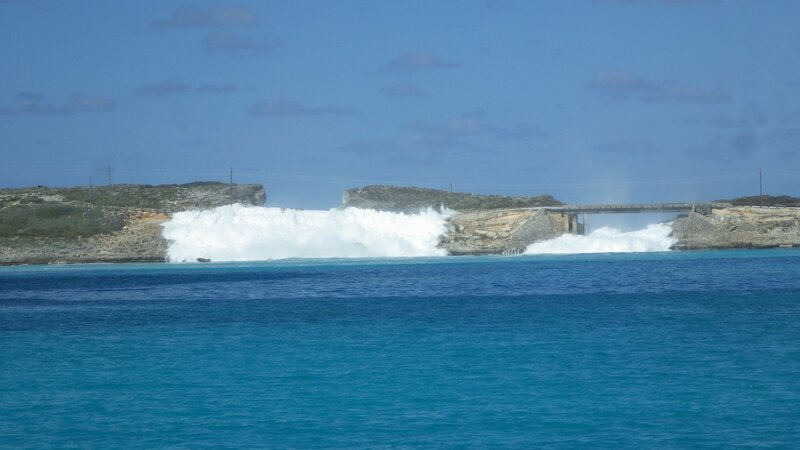 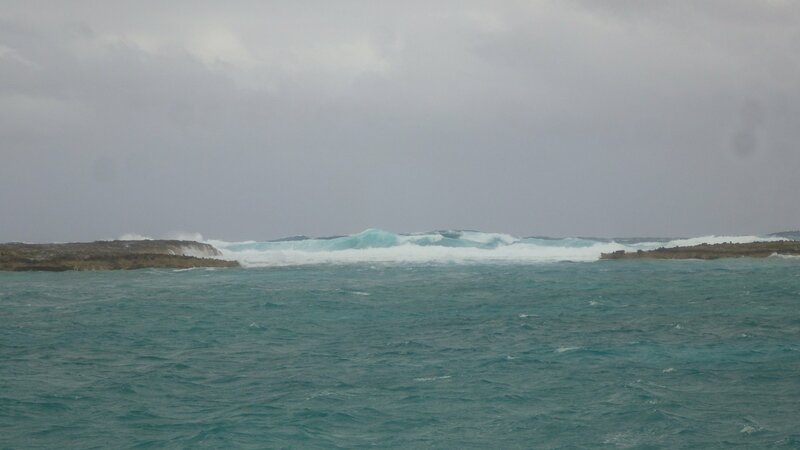 Large waves crashing the reef stones made a salty mist that left our yacht in a layer of salt after few days. 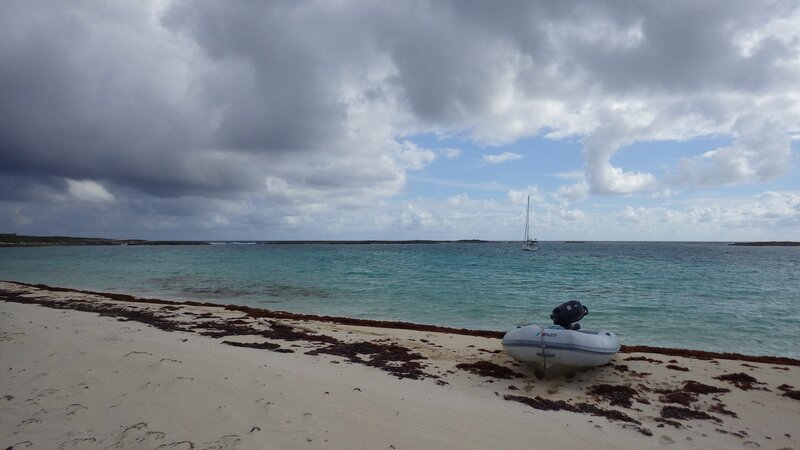 Long and wet dinghy ride to and from town. 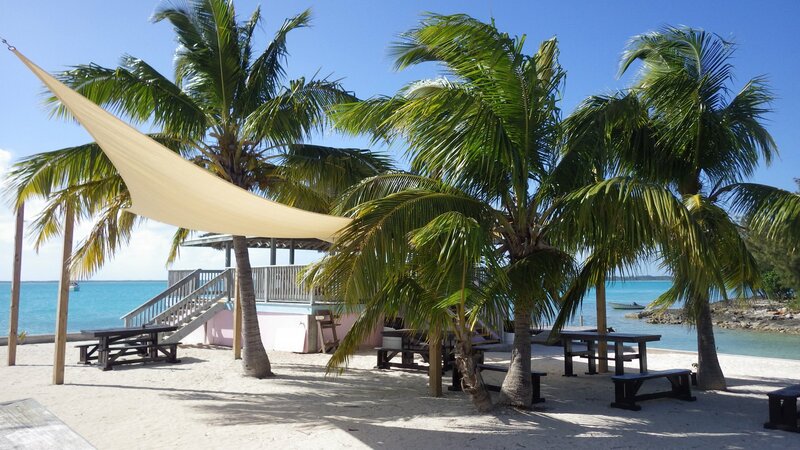 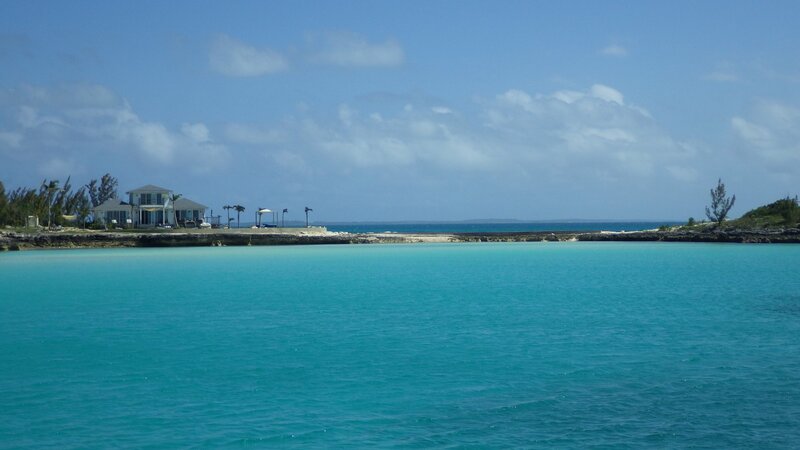 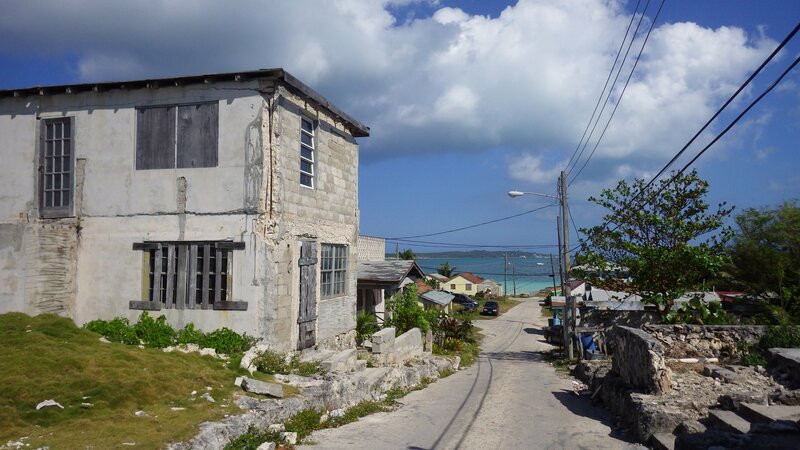 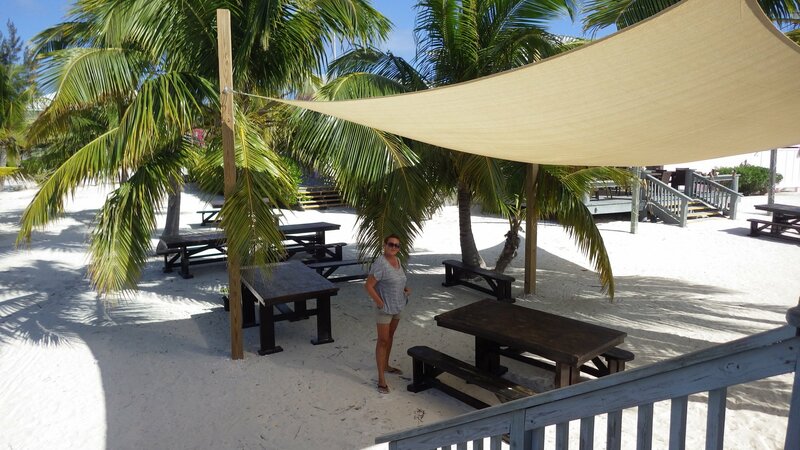 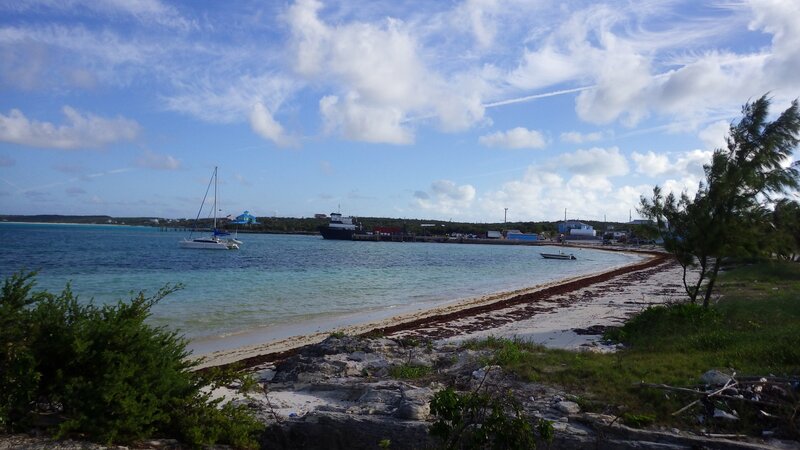 Also had a chance to visit few small islands and cays around the harbour. 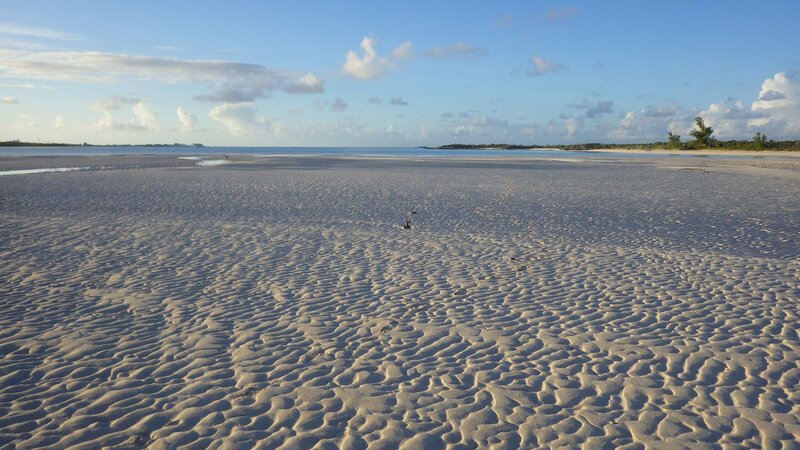 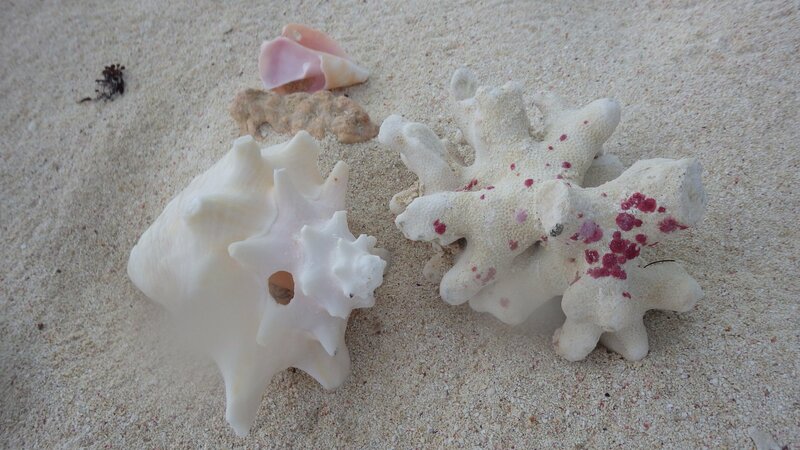 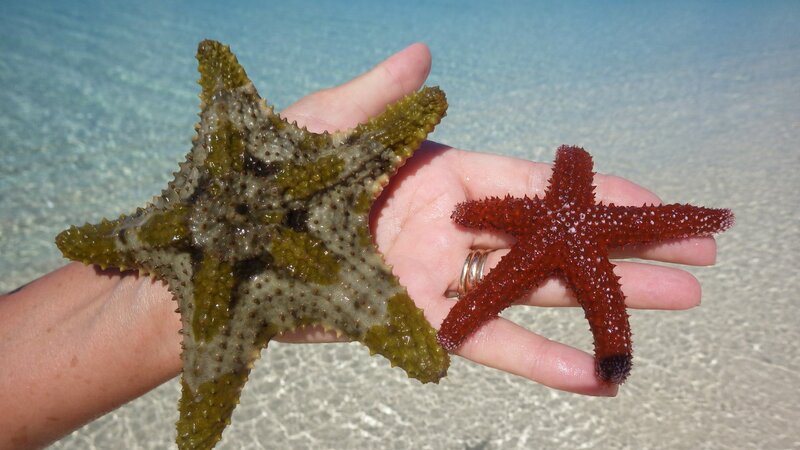 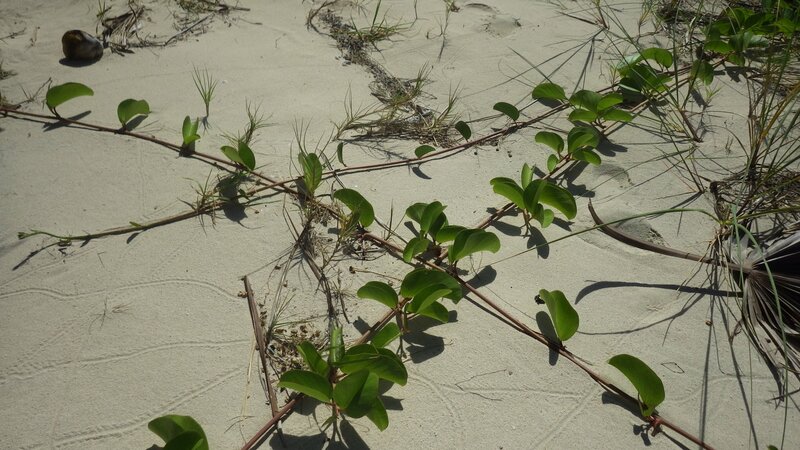 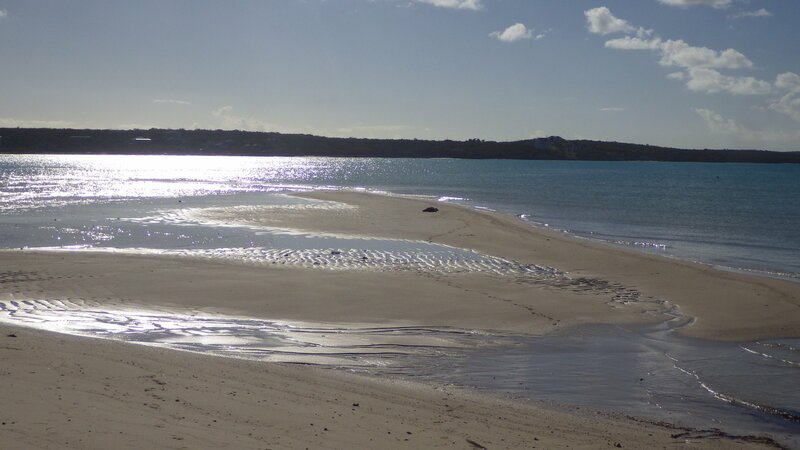 Small sandy islands would appear at the low tide, making a pleasant spot to explore and sun tanning, and then disappear under water during high tide. 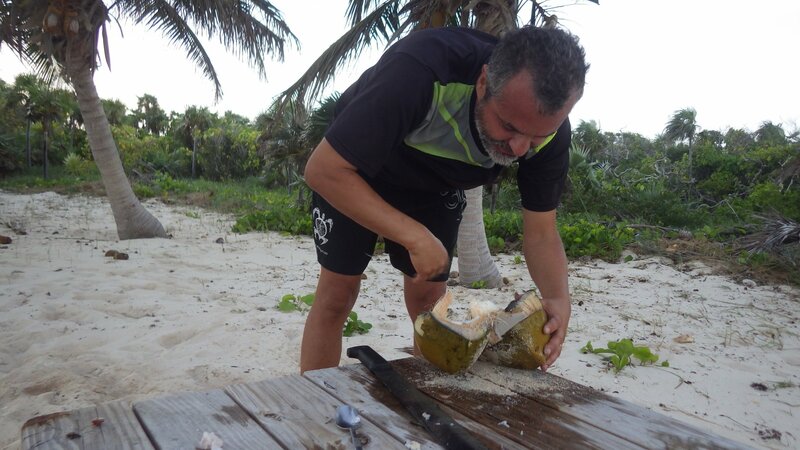 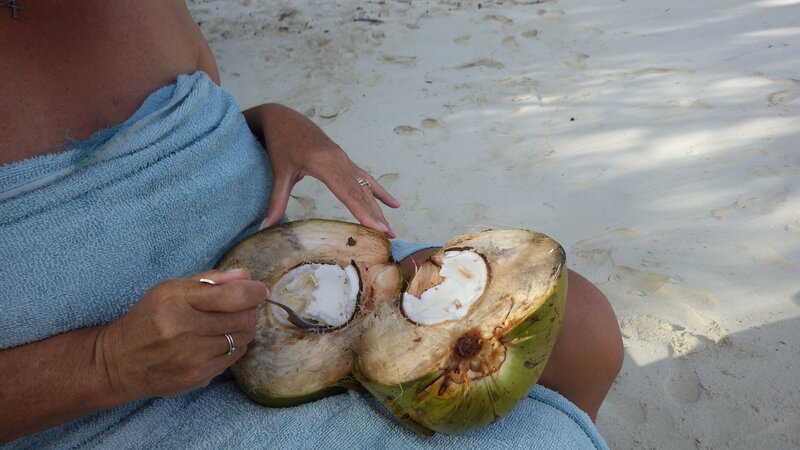 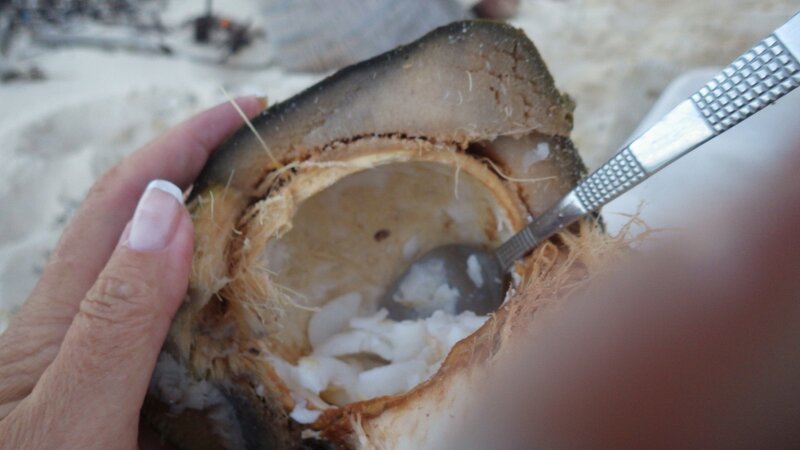 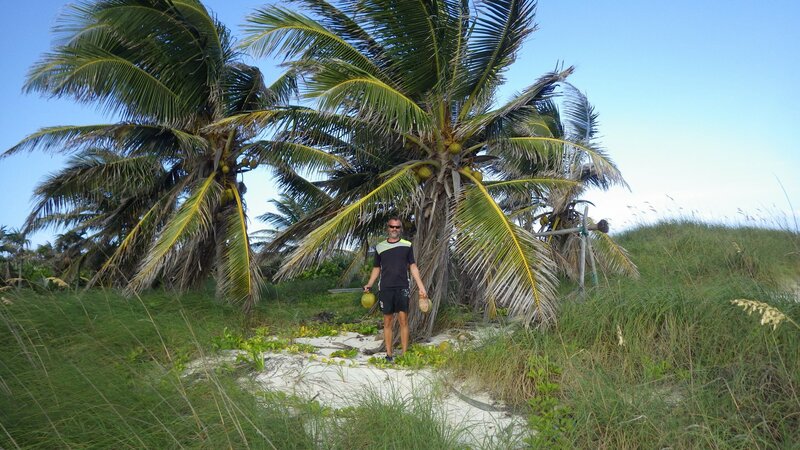 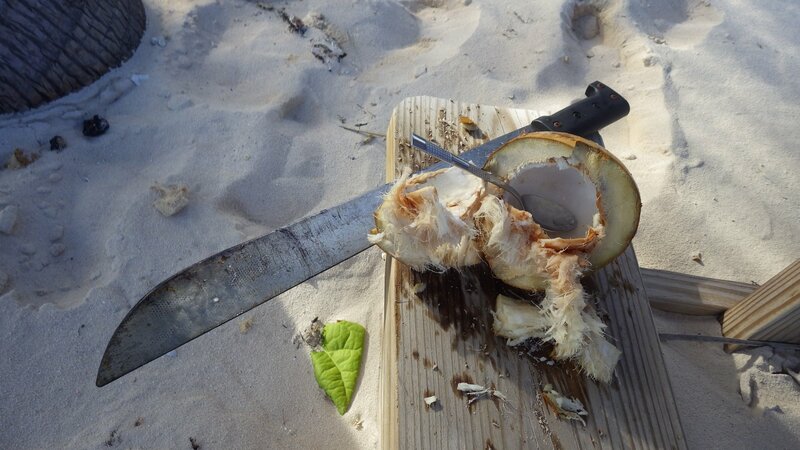 Macheteing and eating fresh coconuts was a real treat. 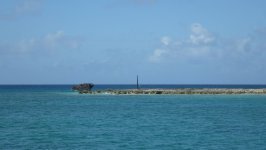 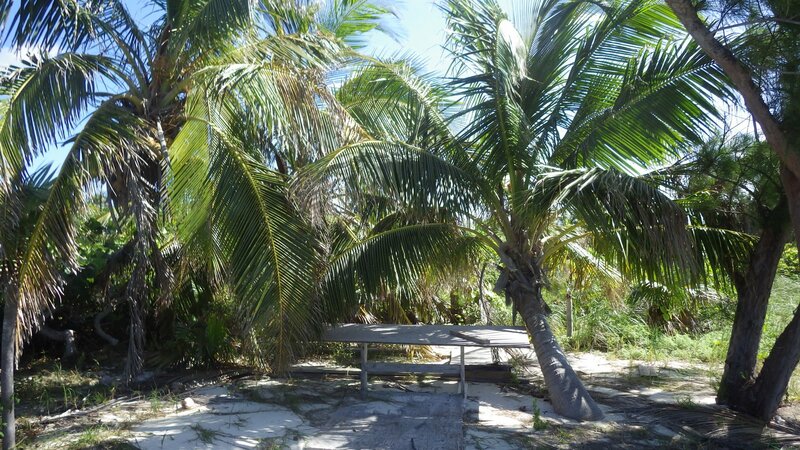 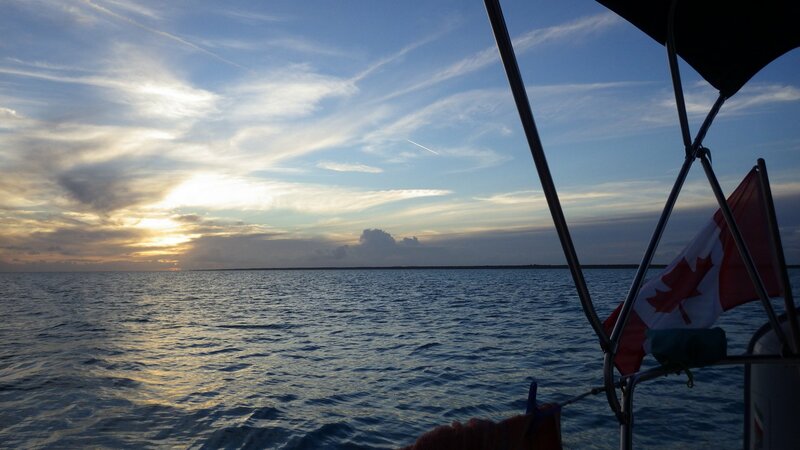 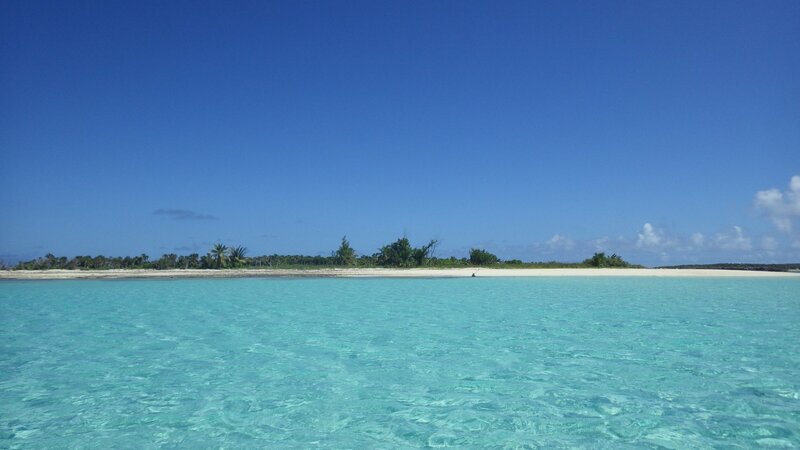 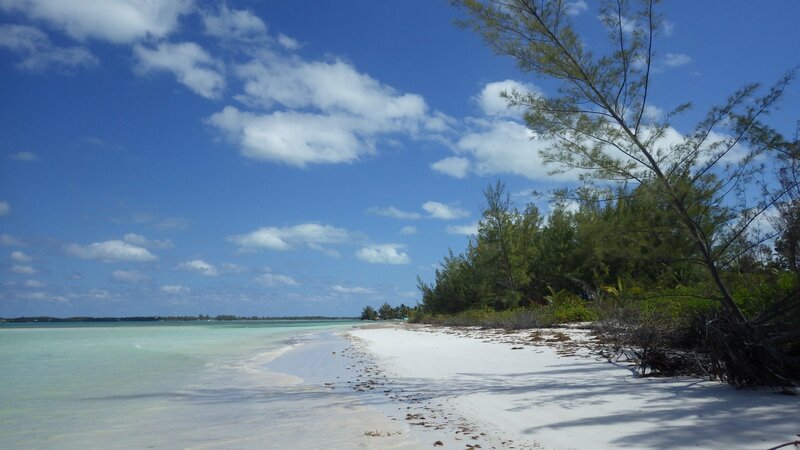 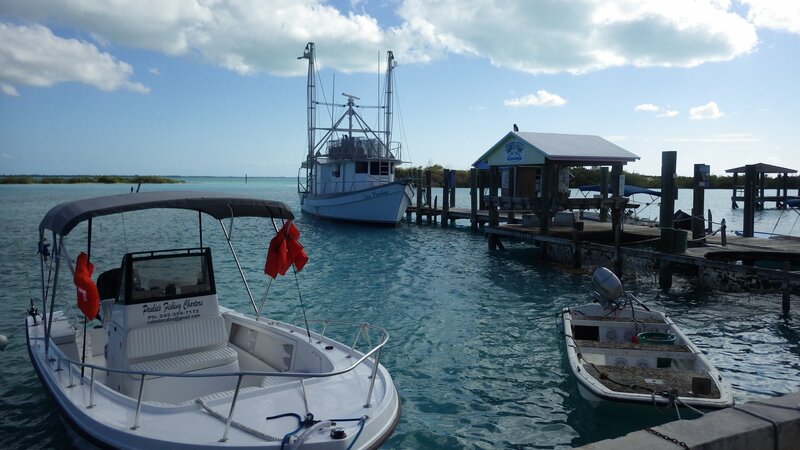 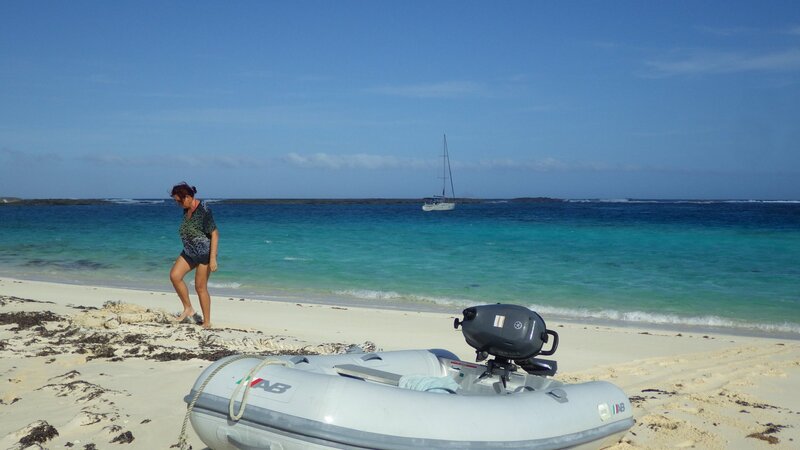 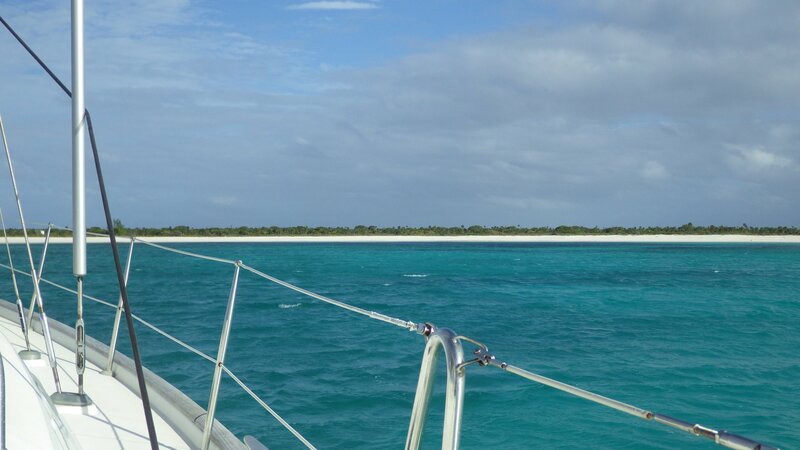 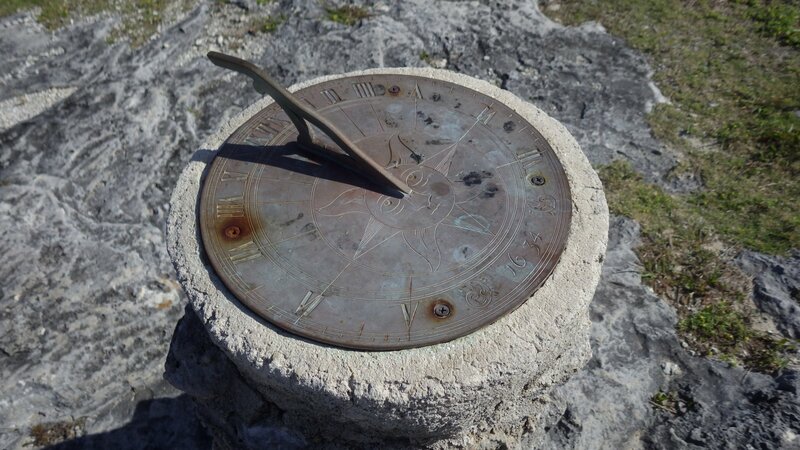 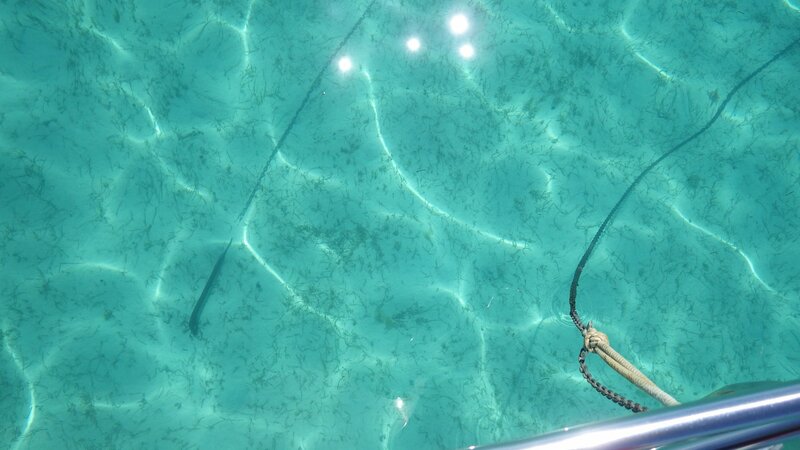 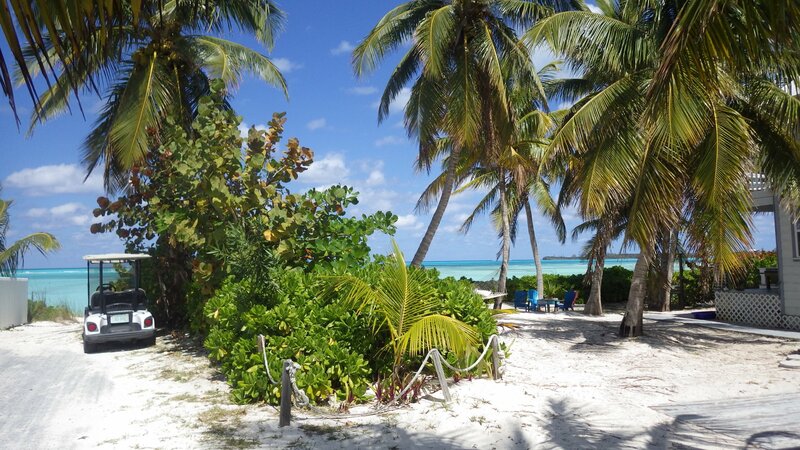 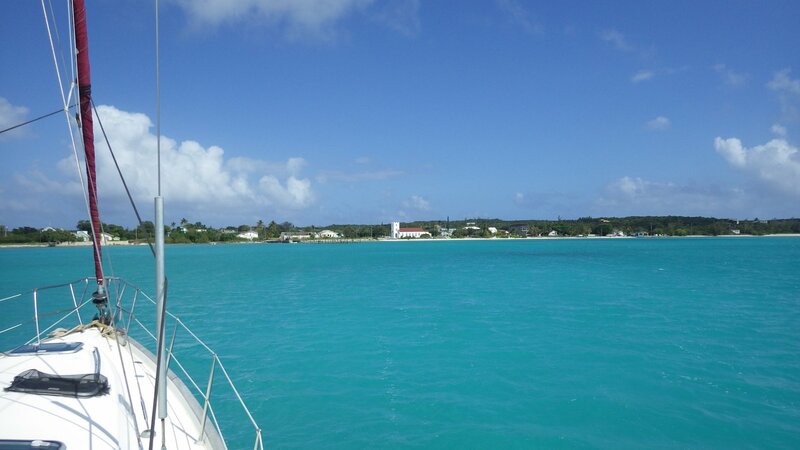 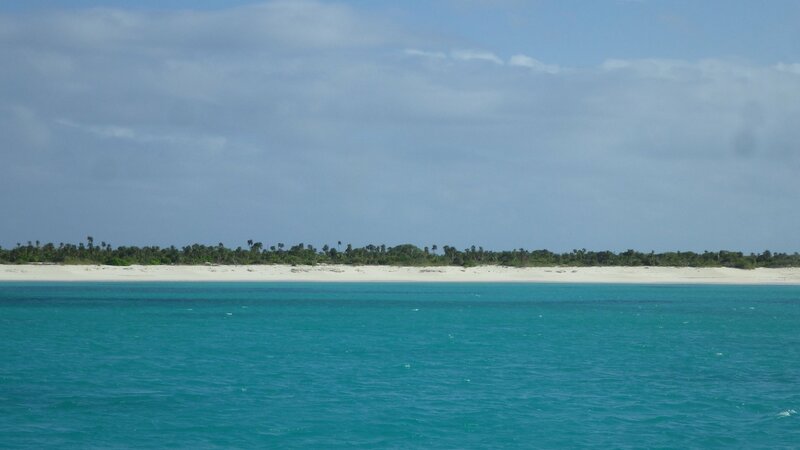 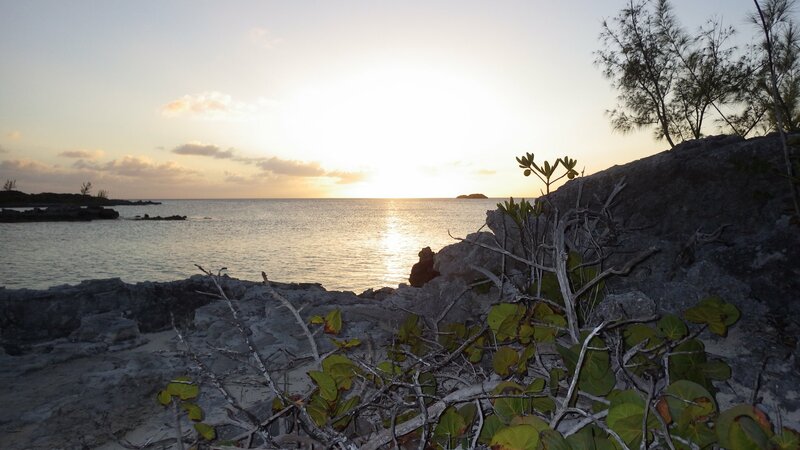 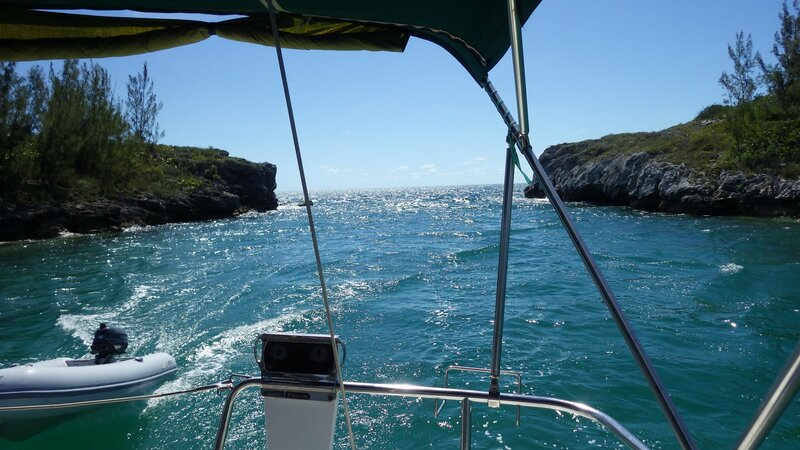 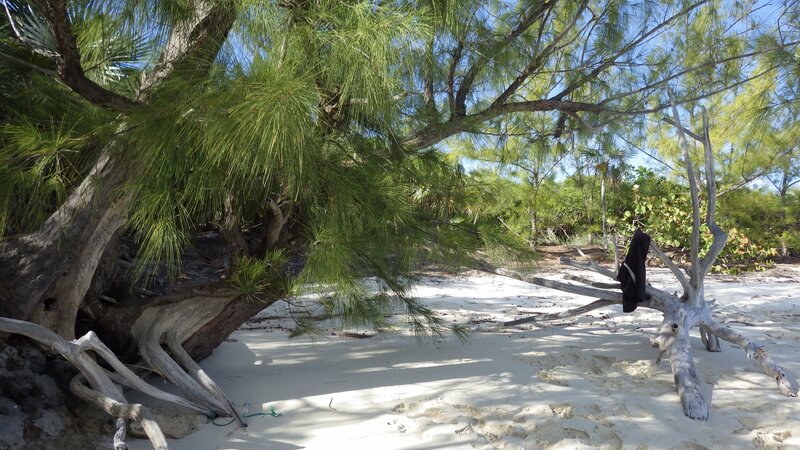 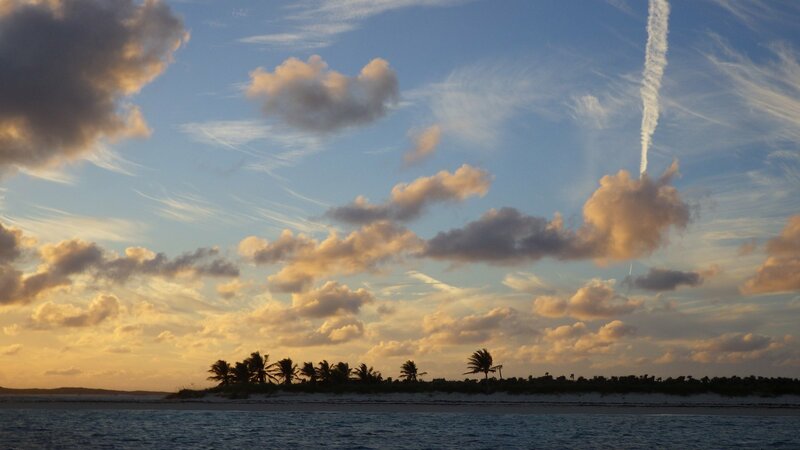 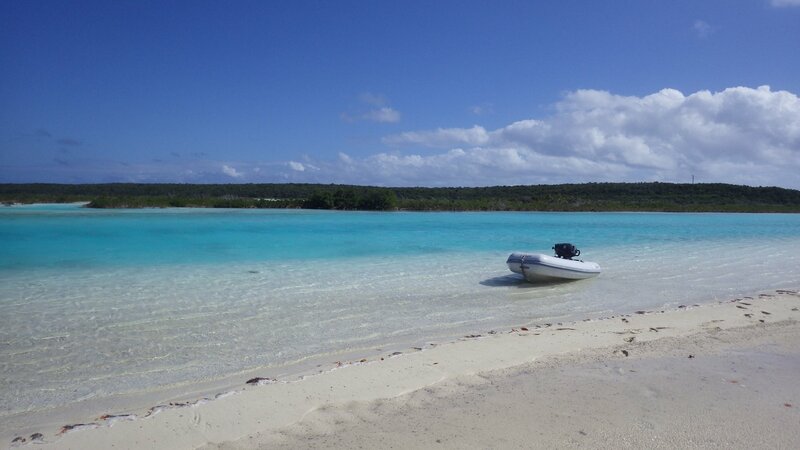 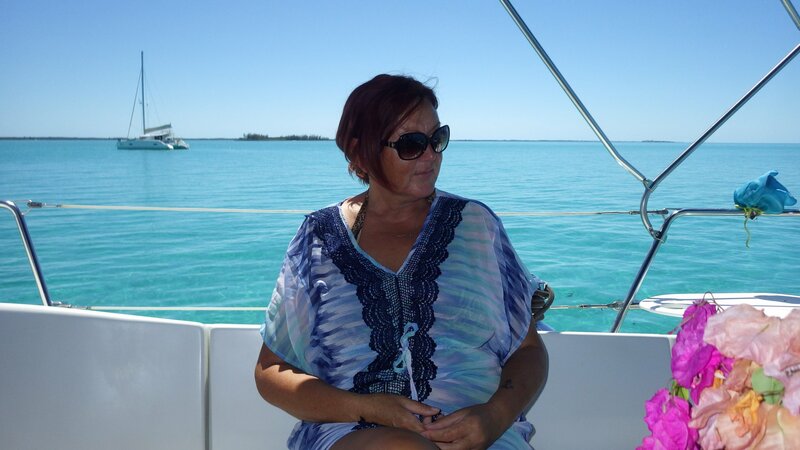 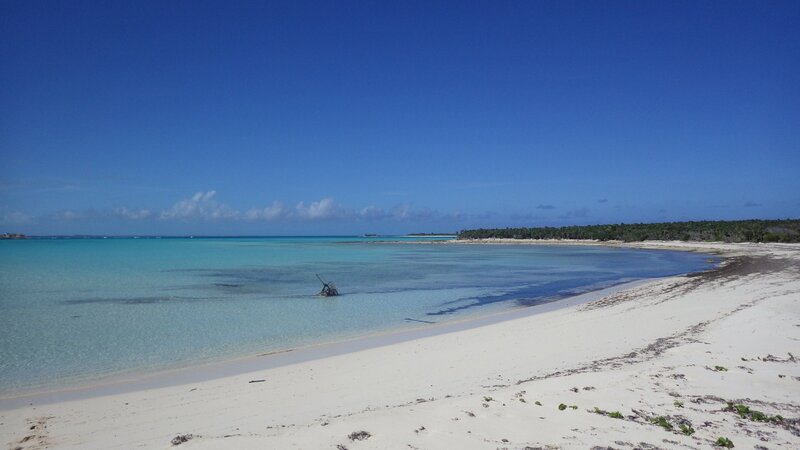 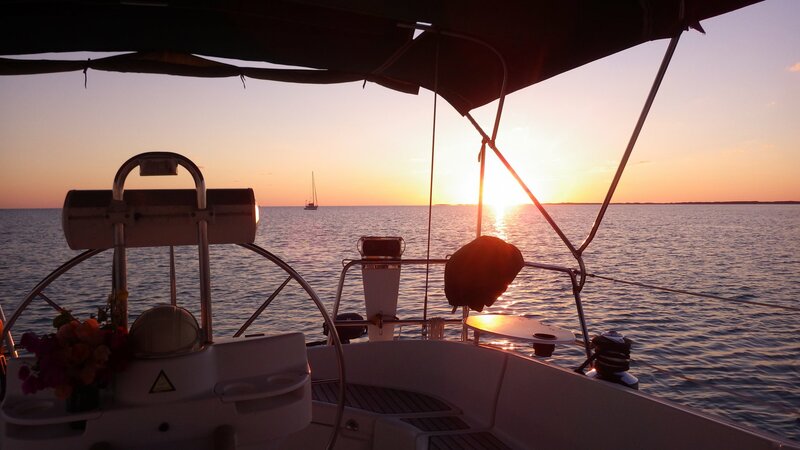 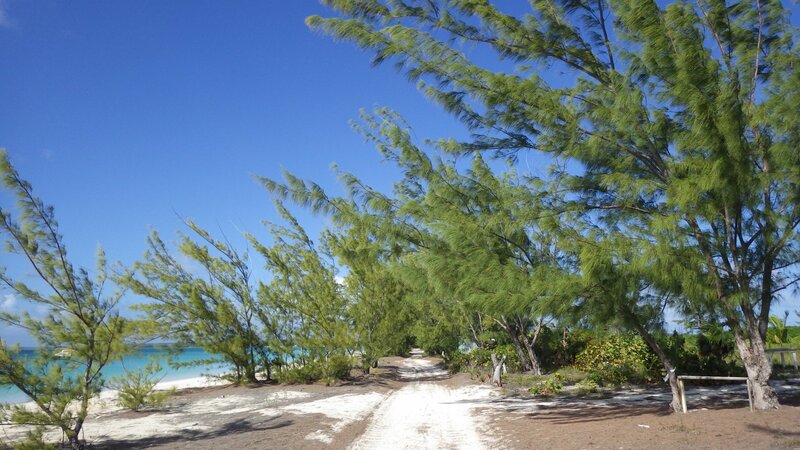 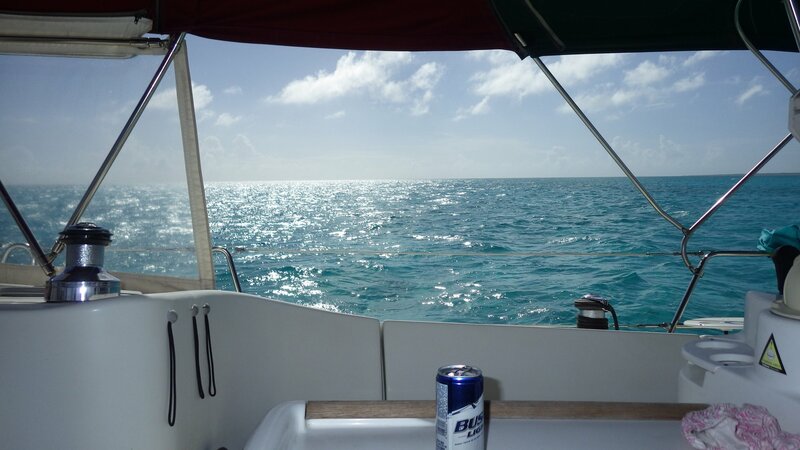 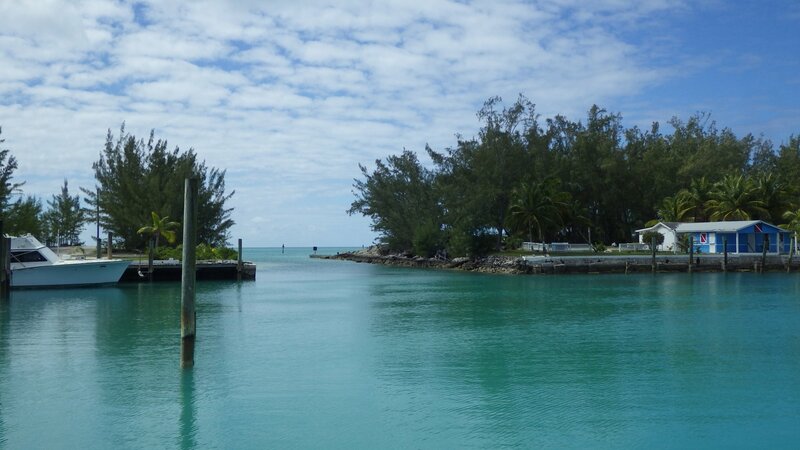 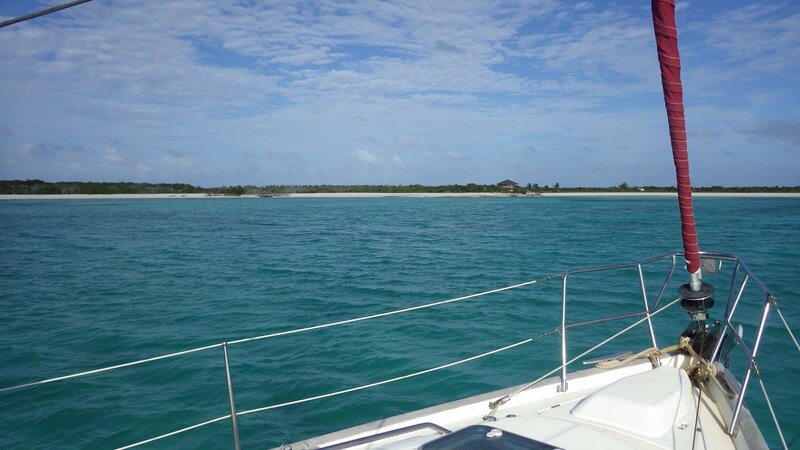 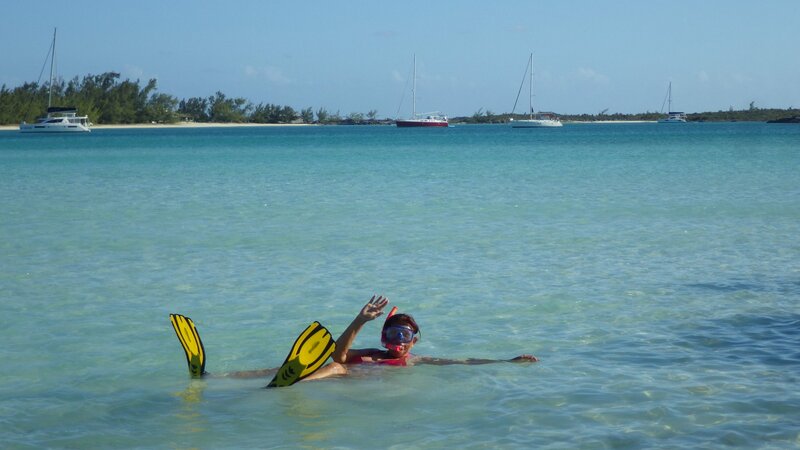 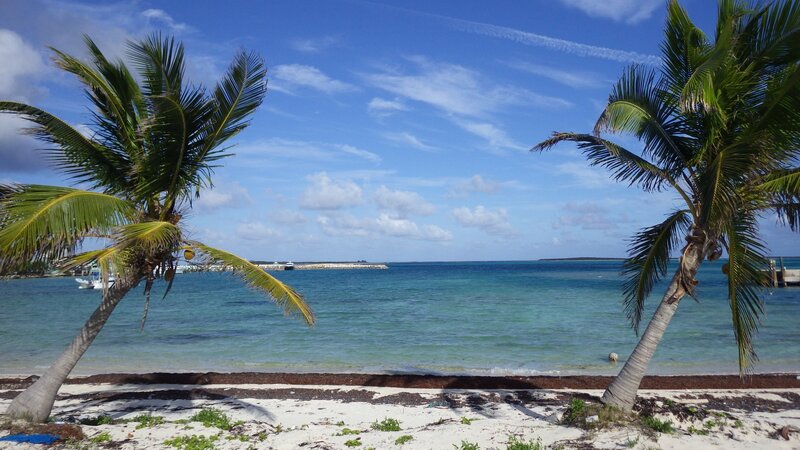 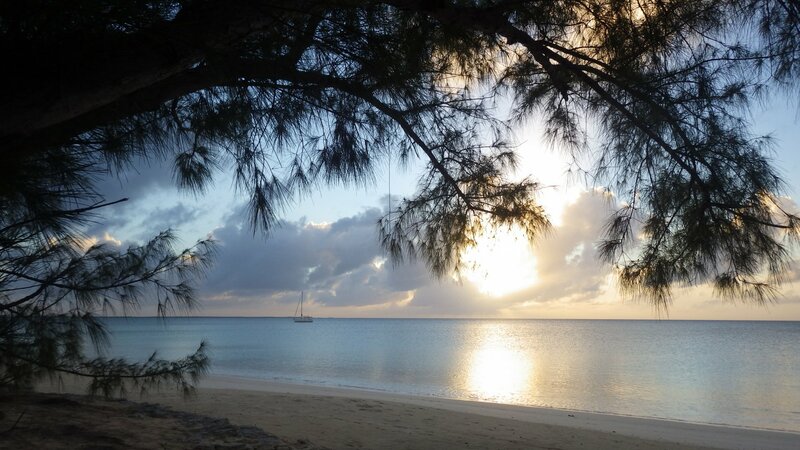 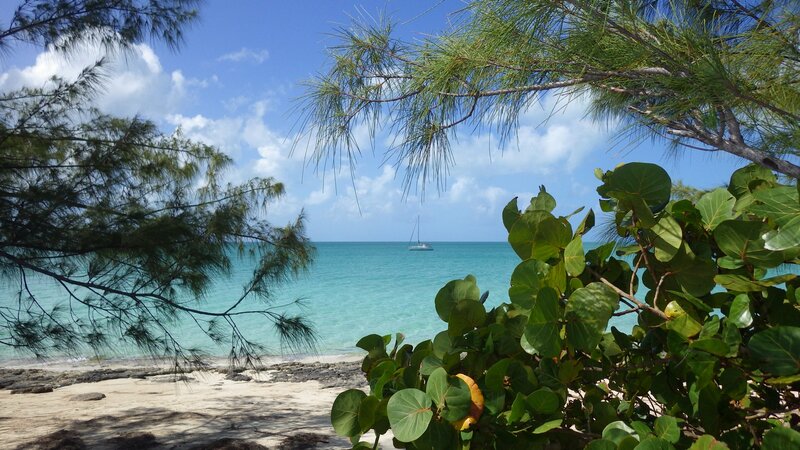 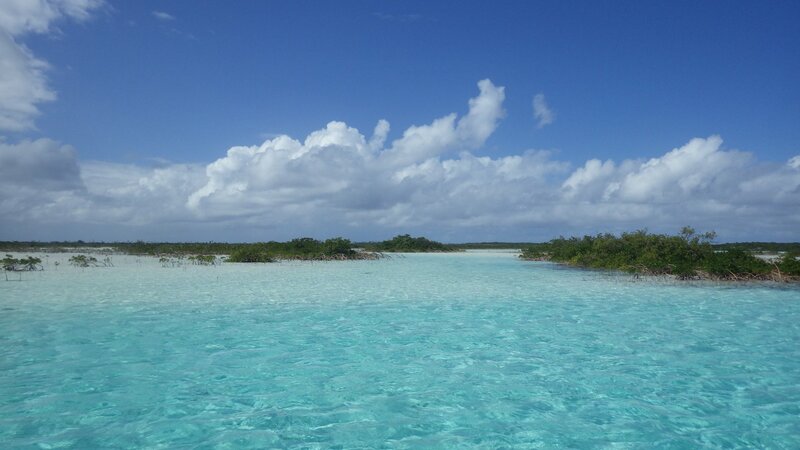 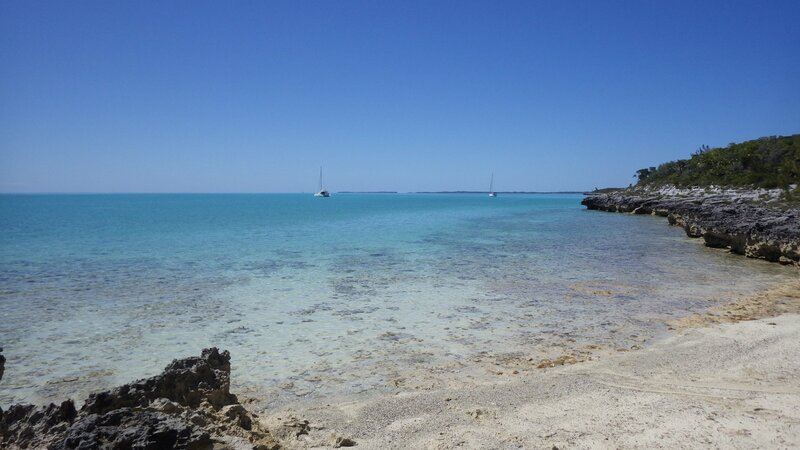 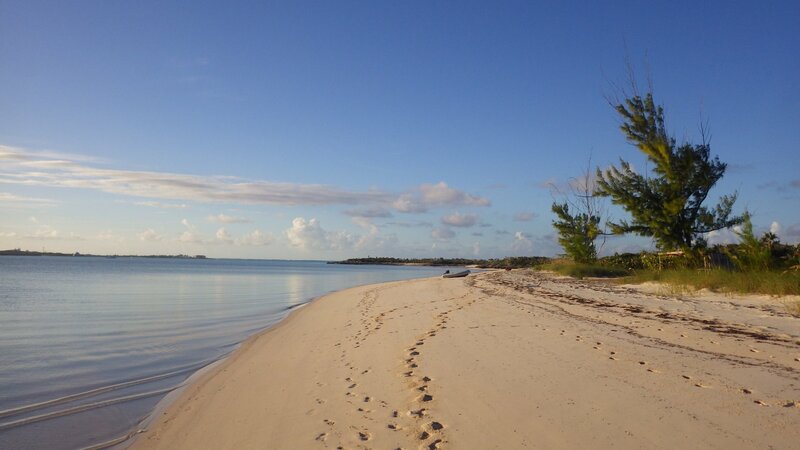 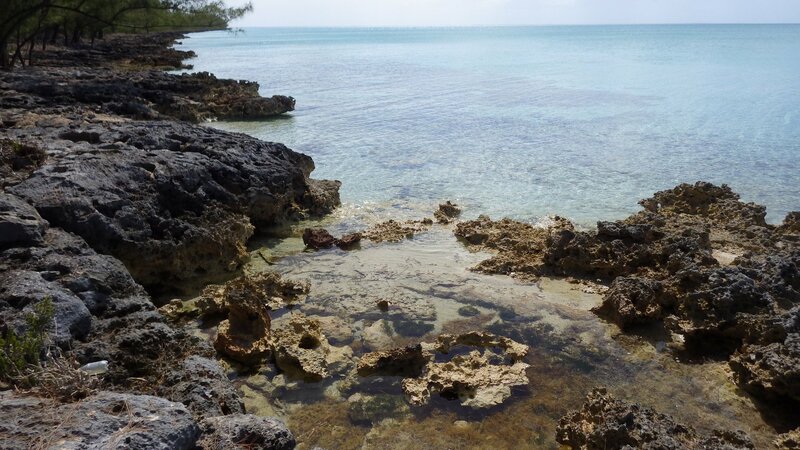 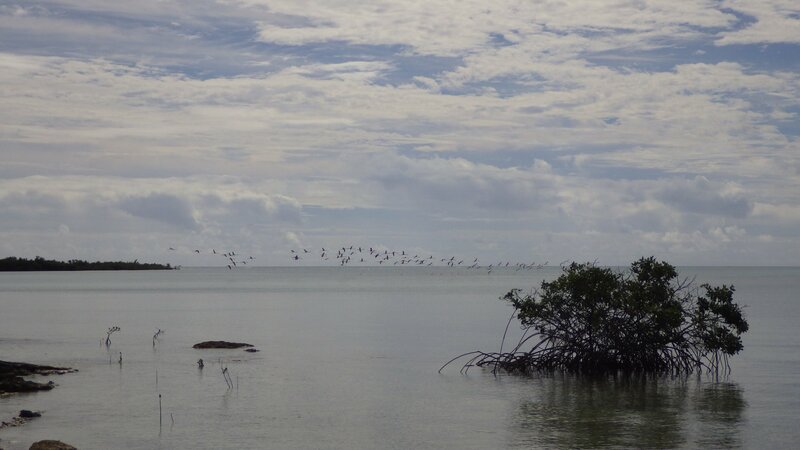 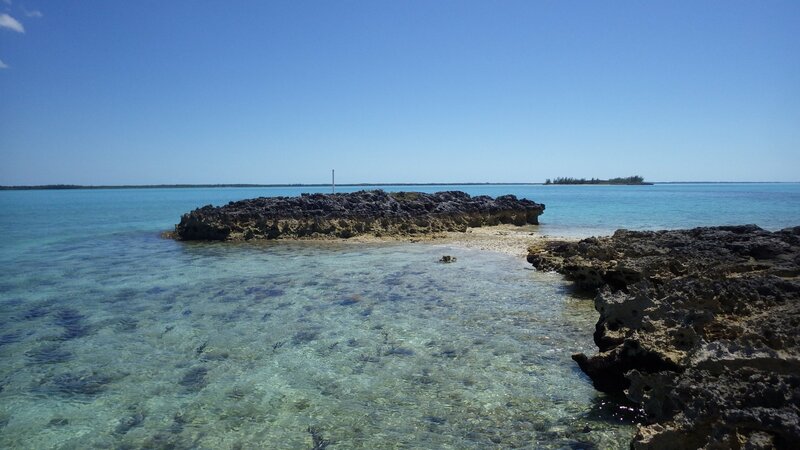 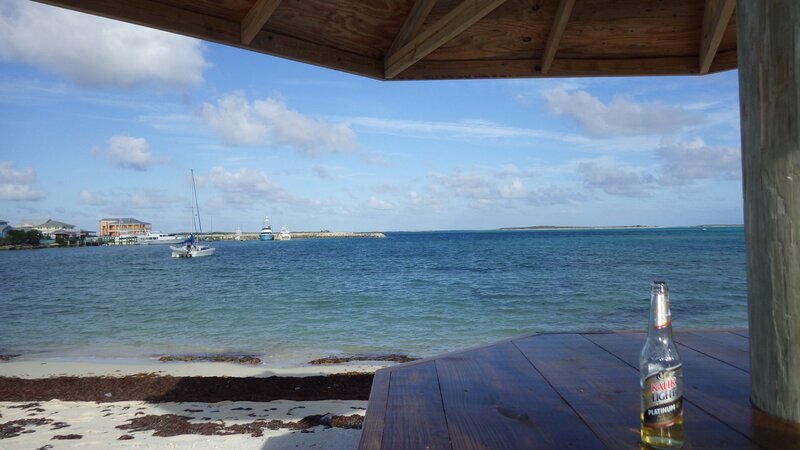 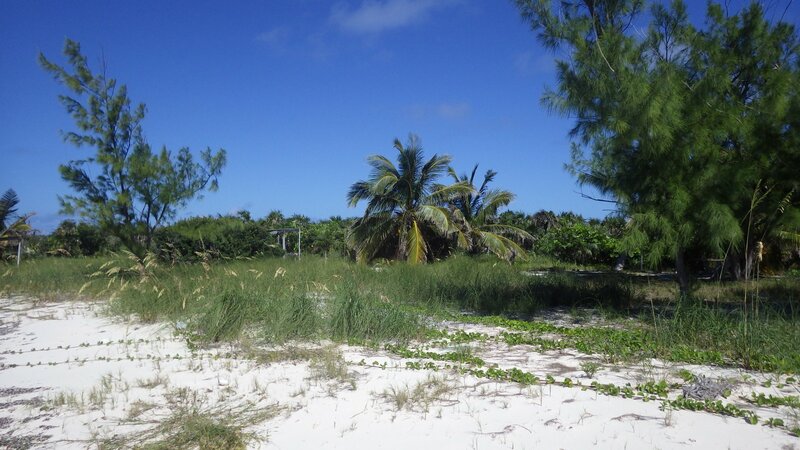 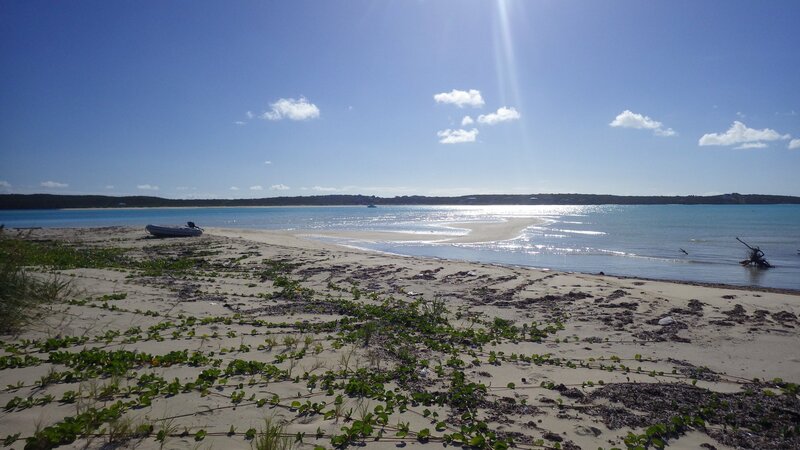 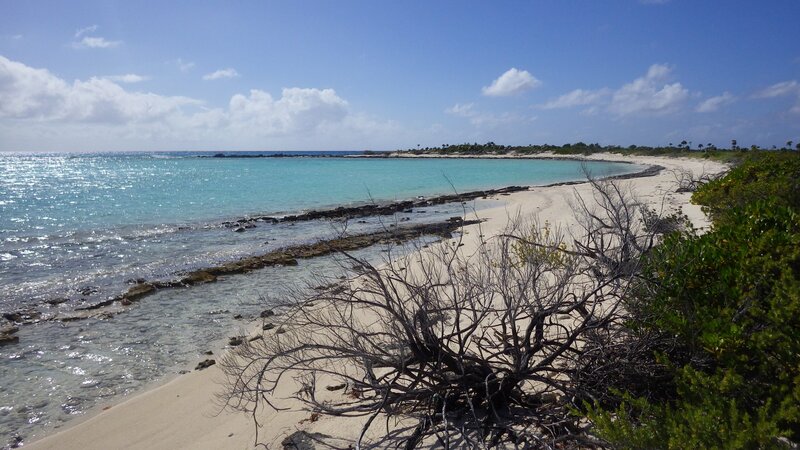 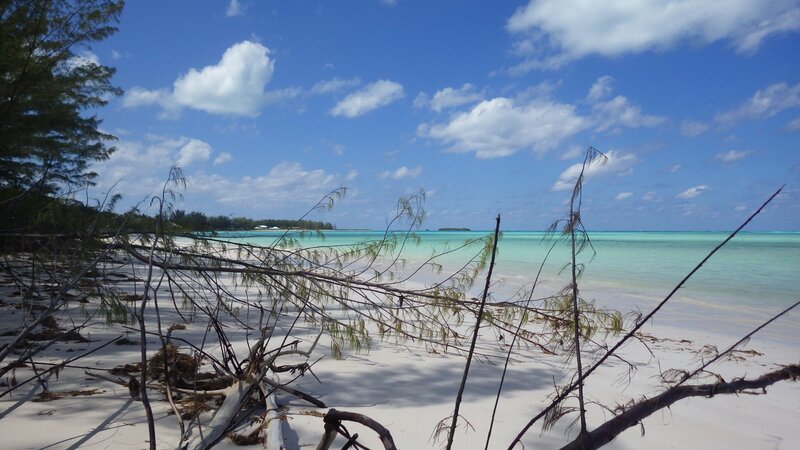 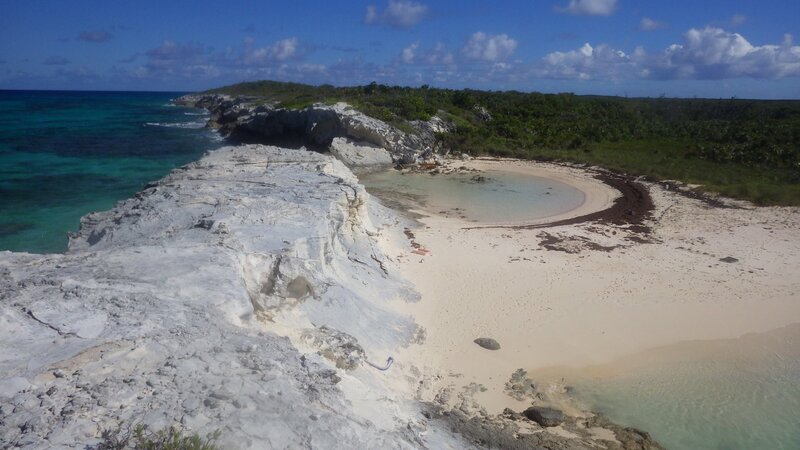 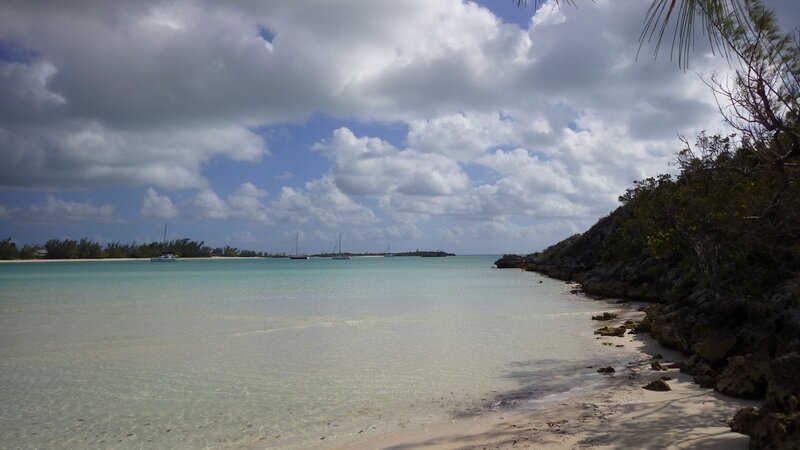 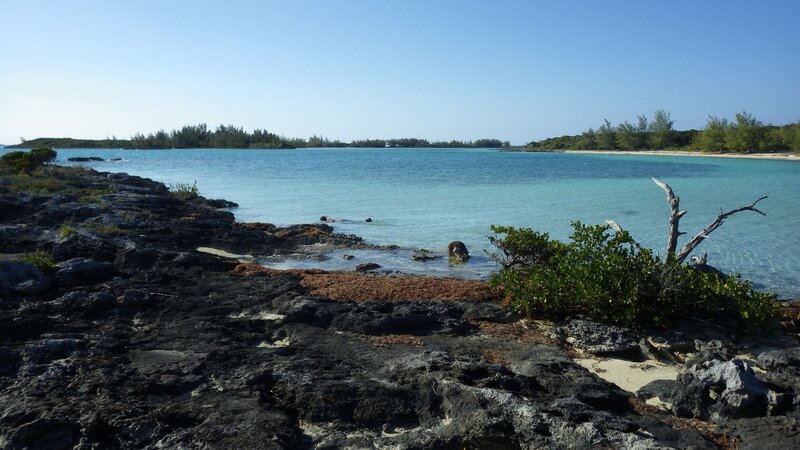 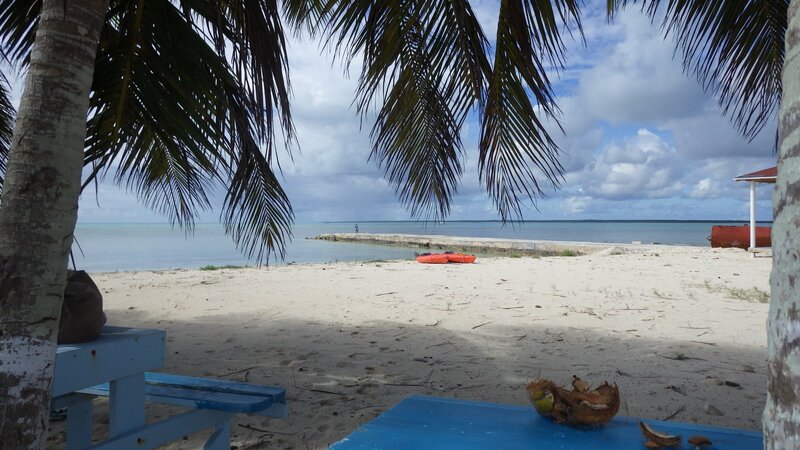 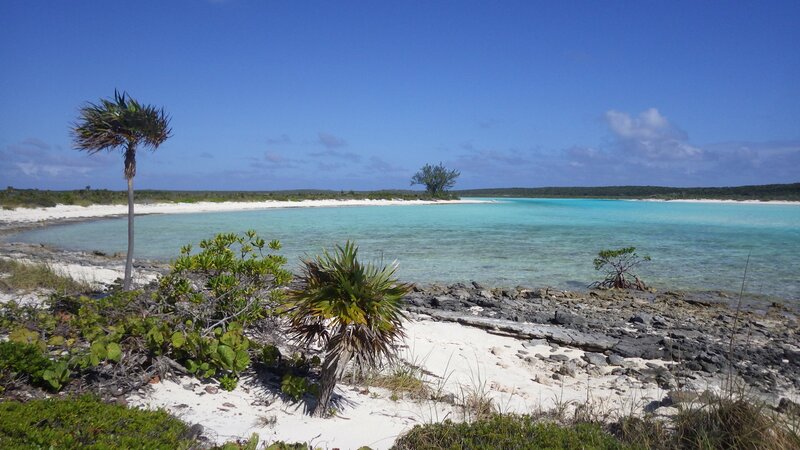 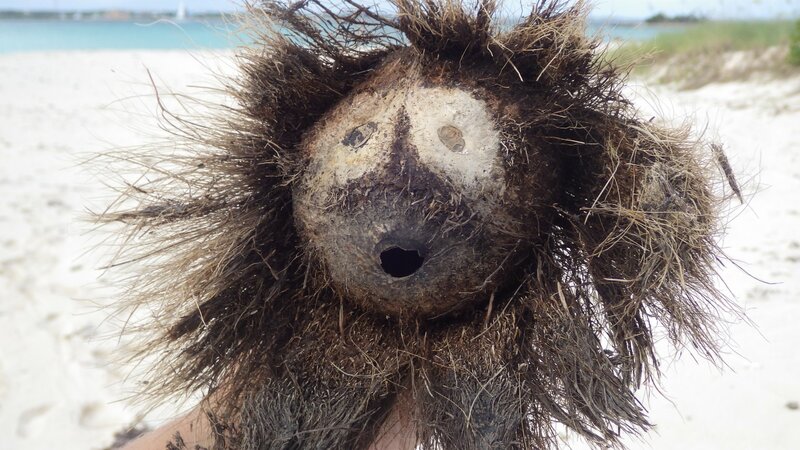 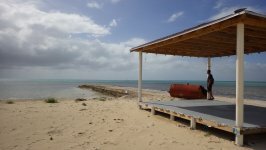 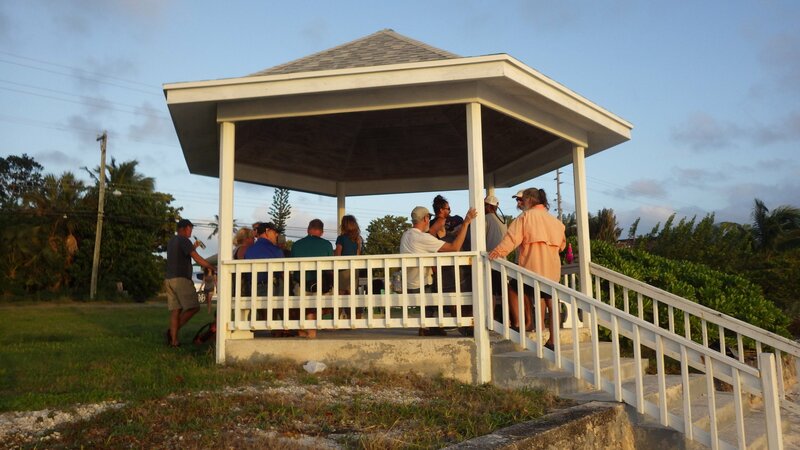 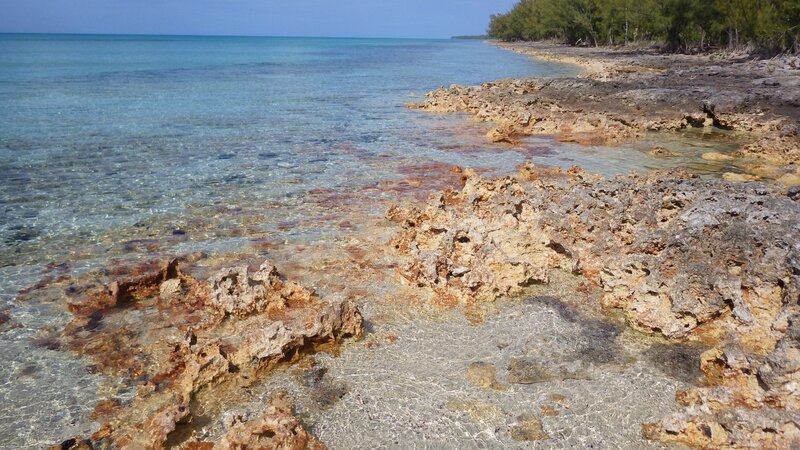 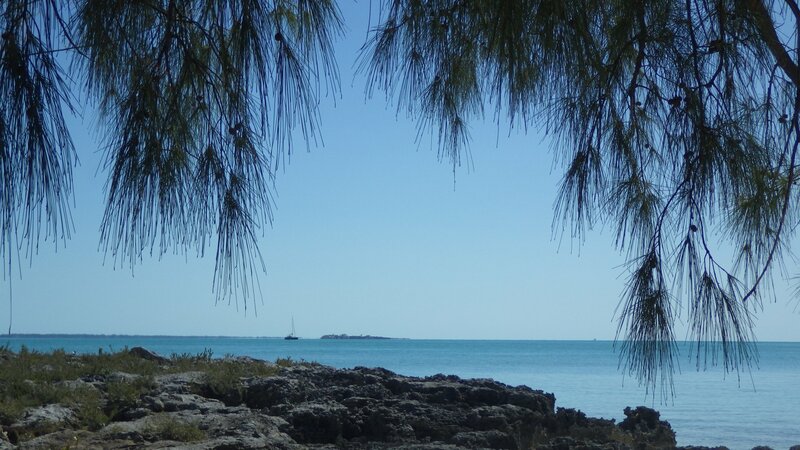 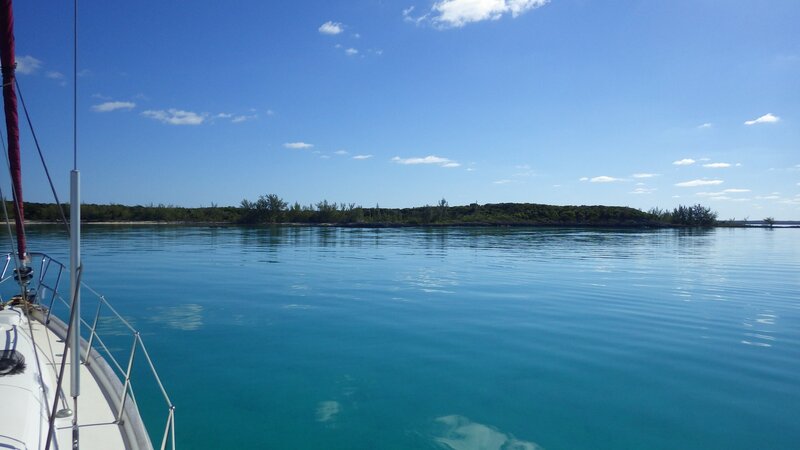 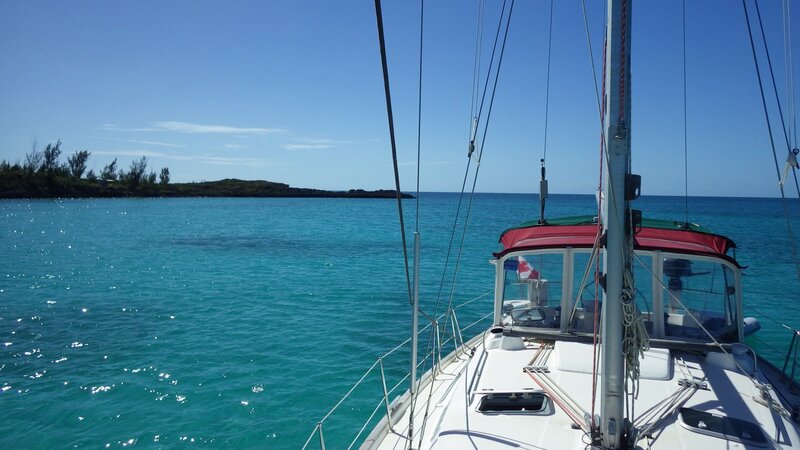 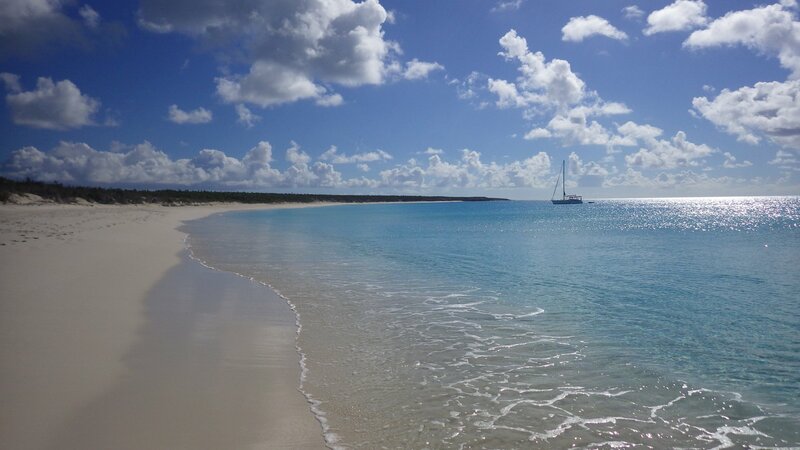 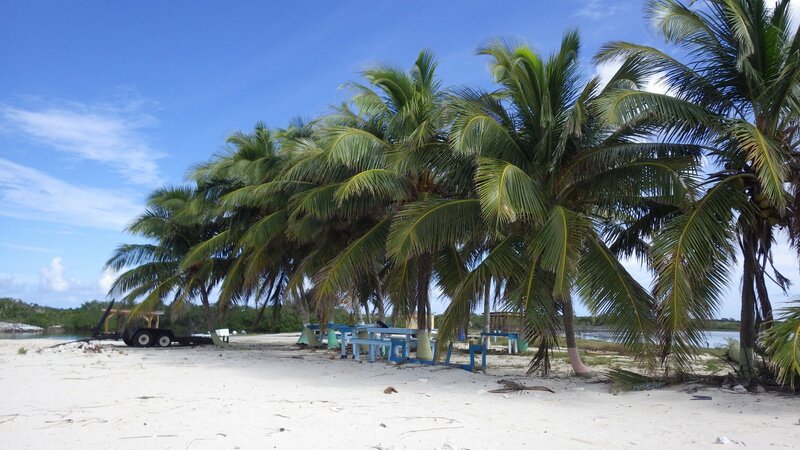 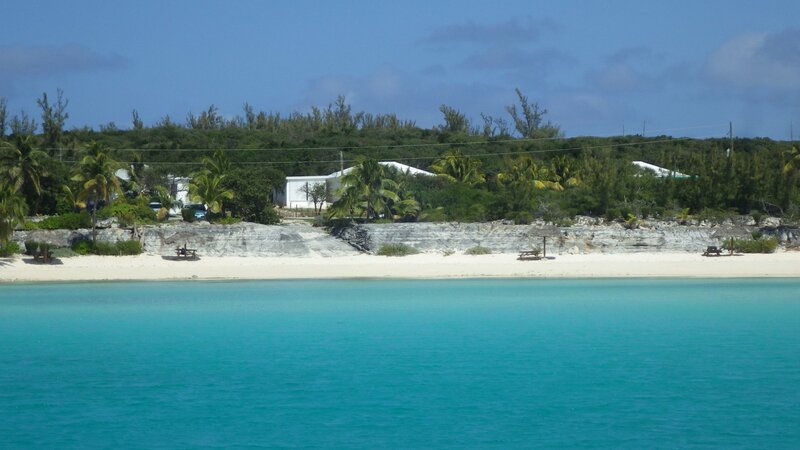 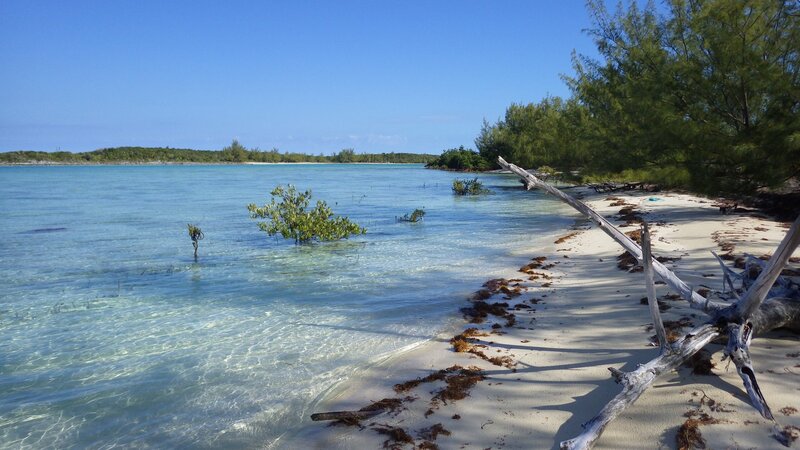 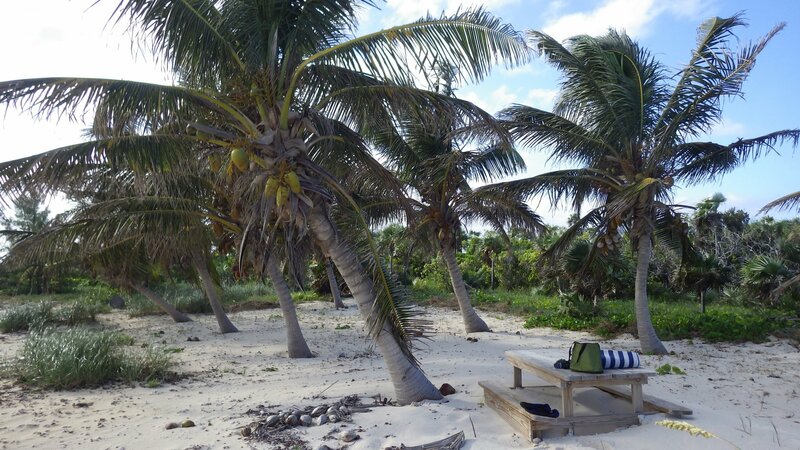 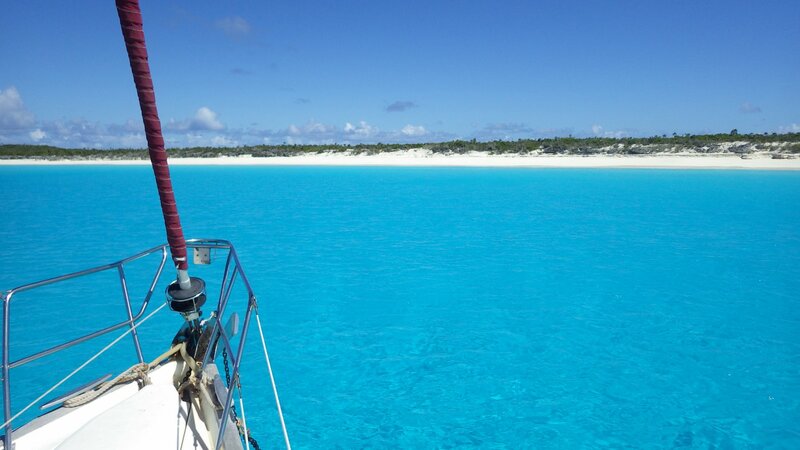 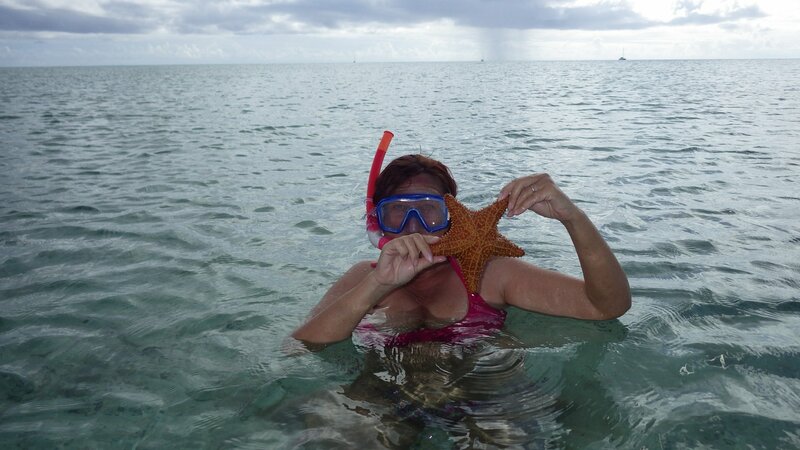 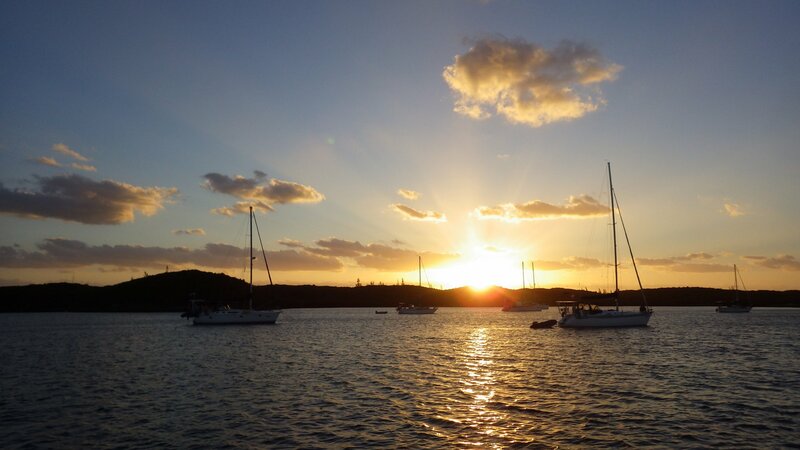 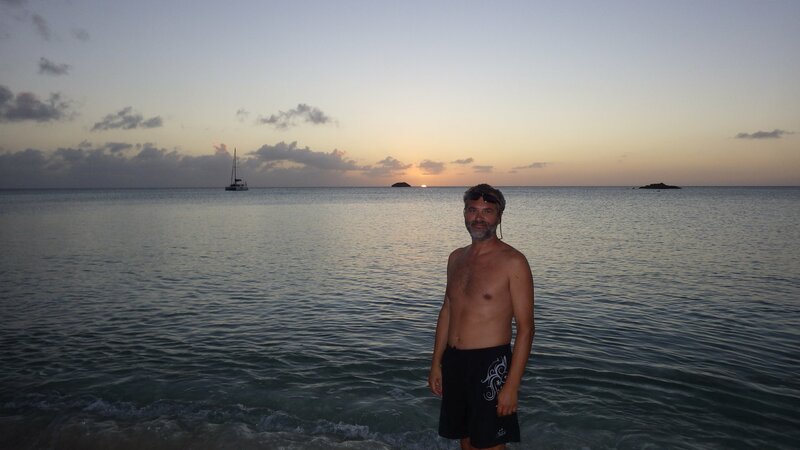 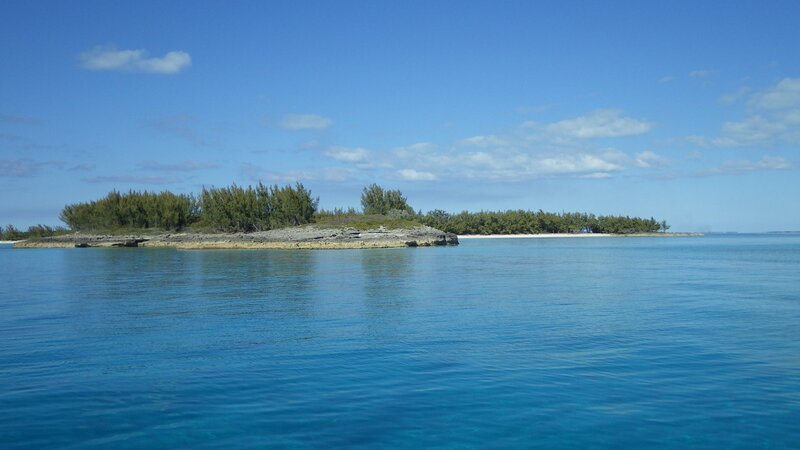 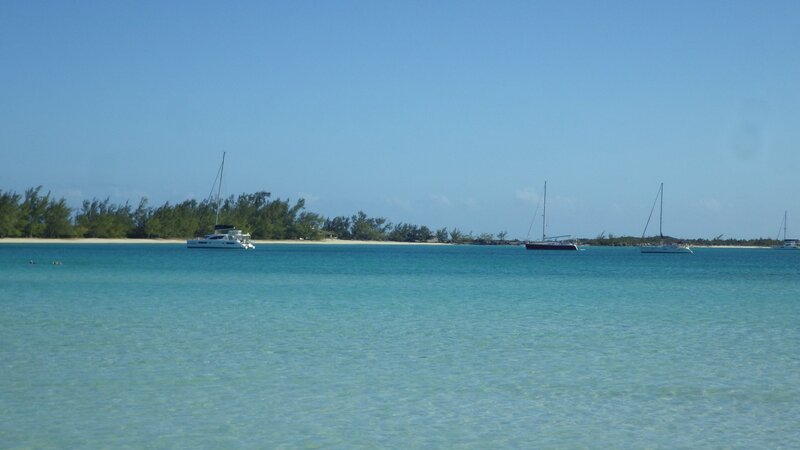 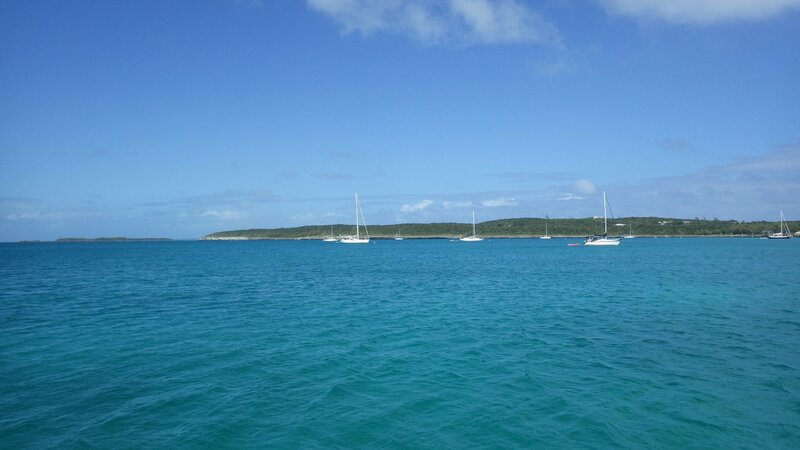 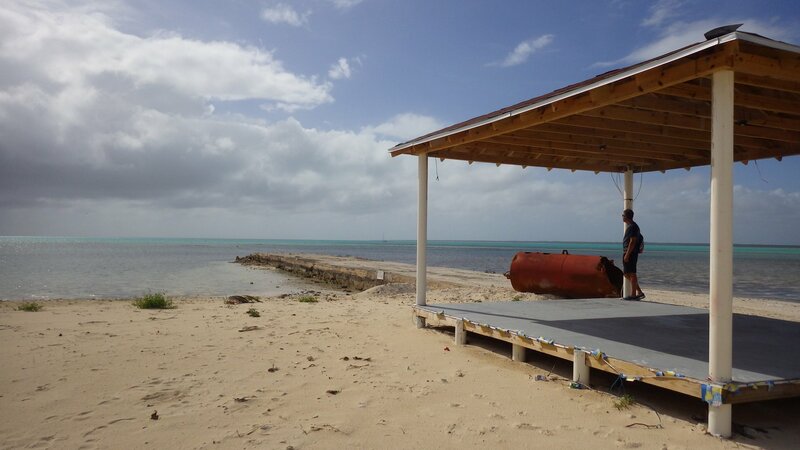 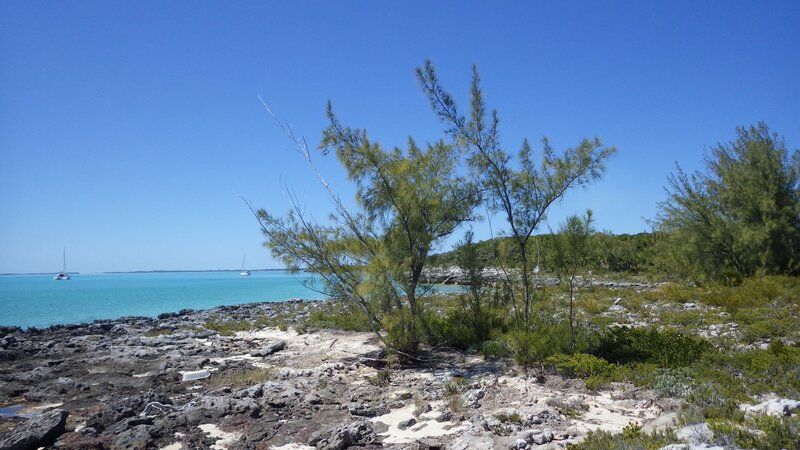 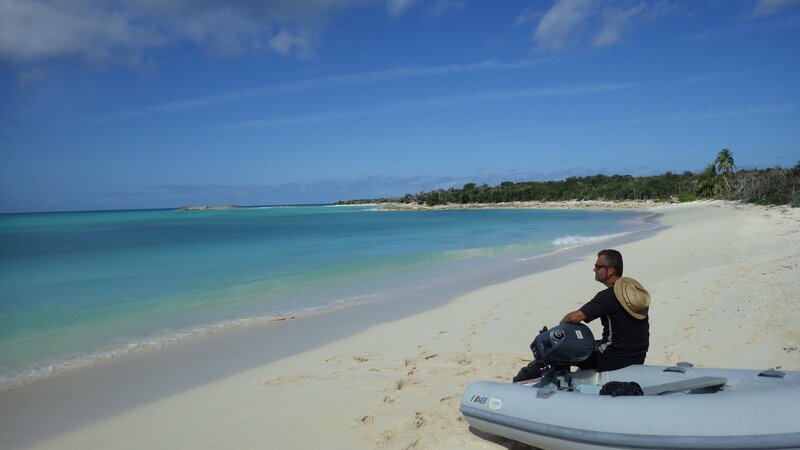 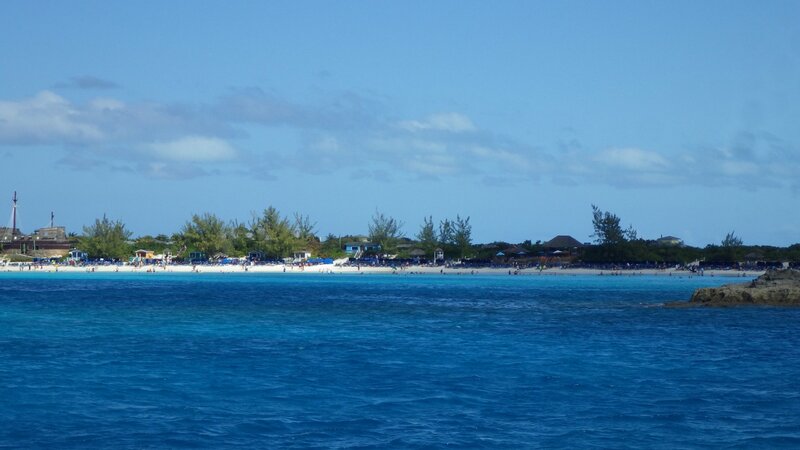 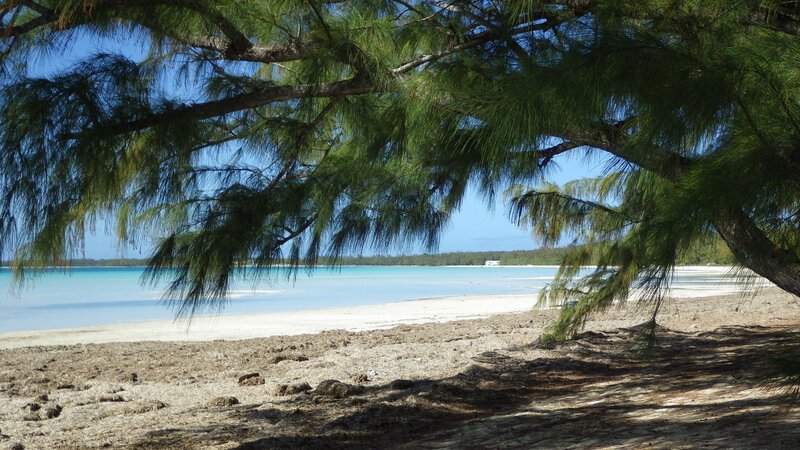 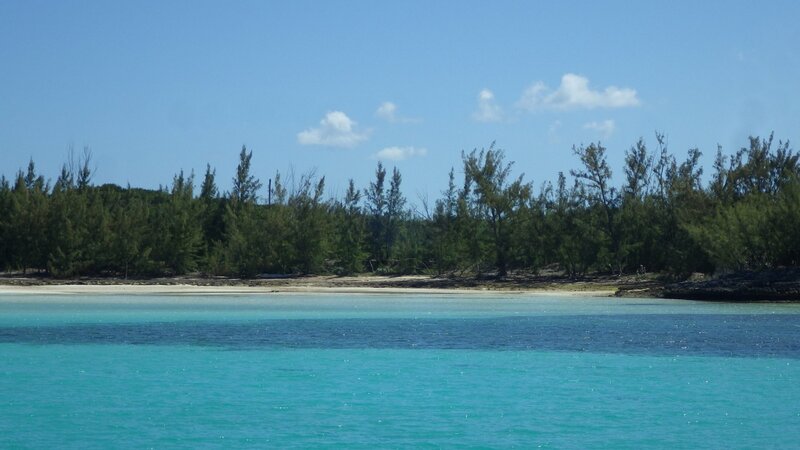 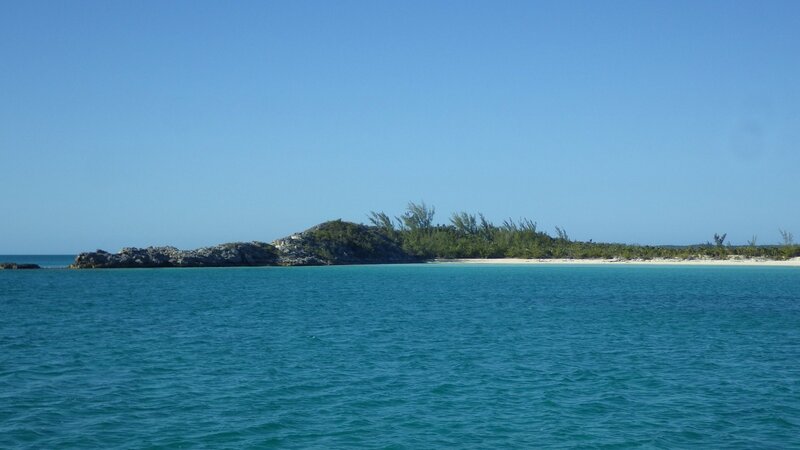 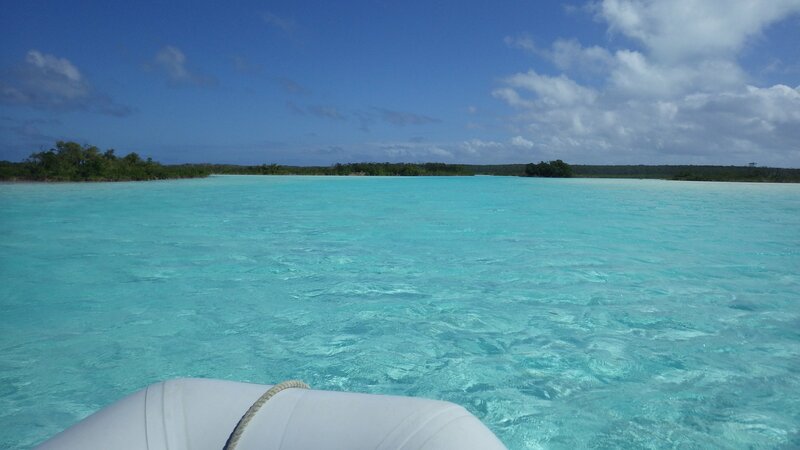 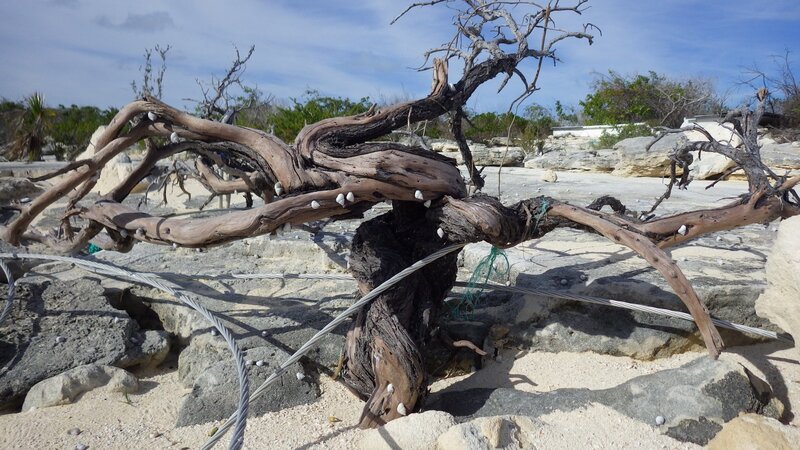 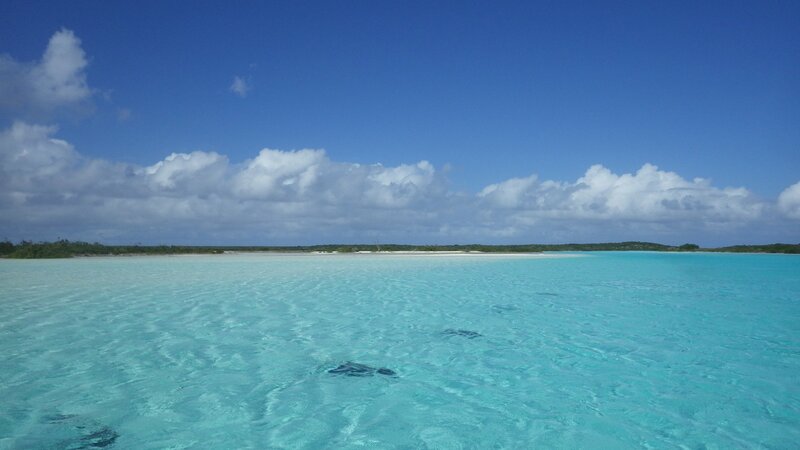 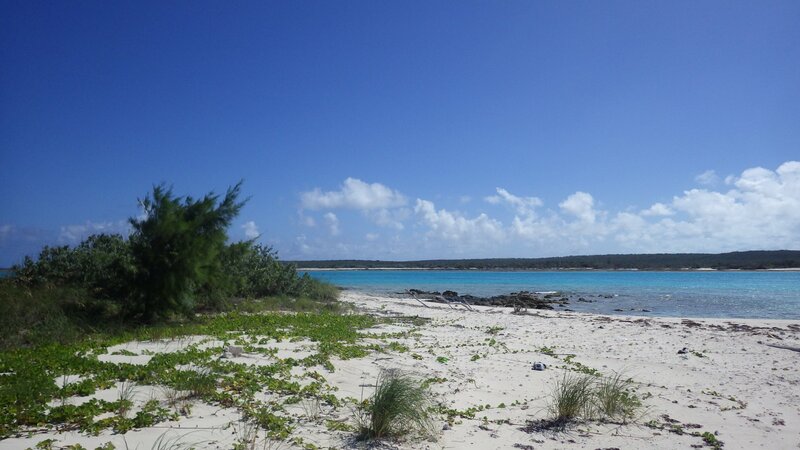 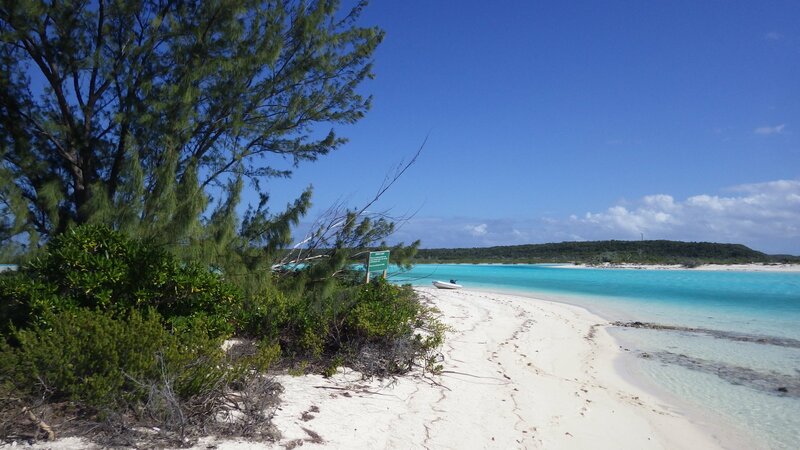 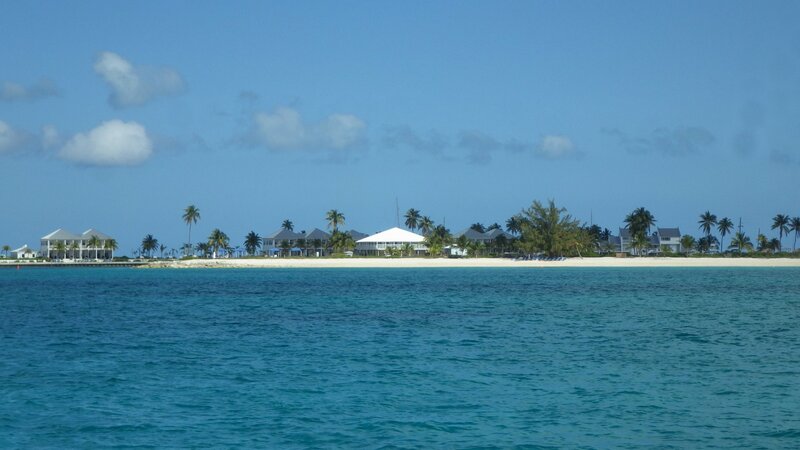 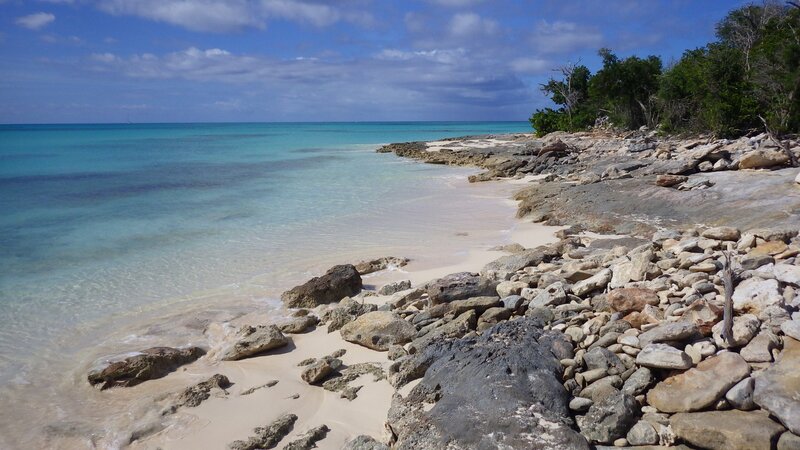 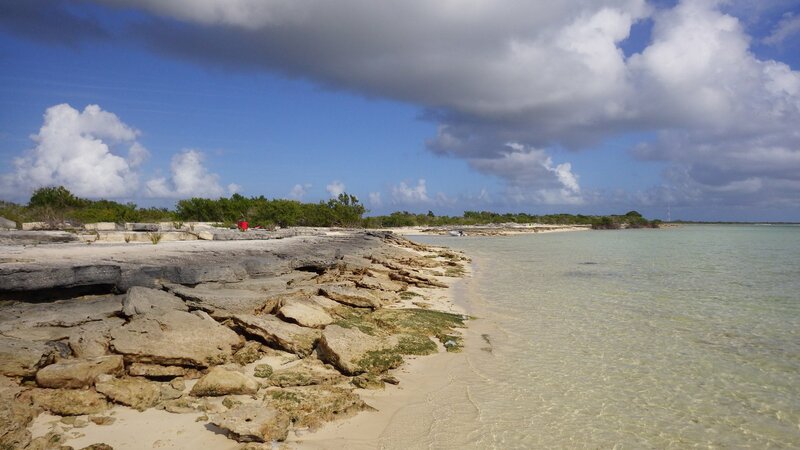 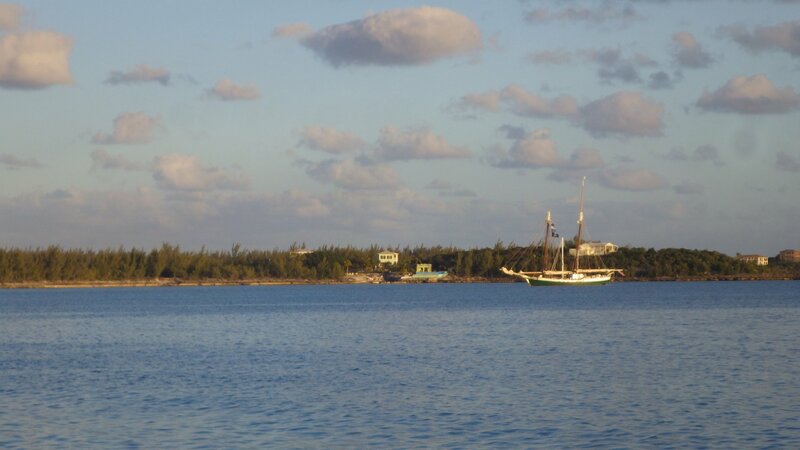 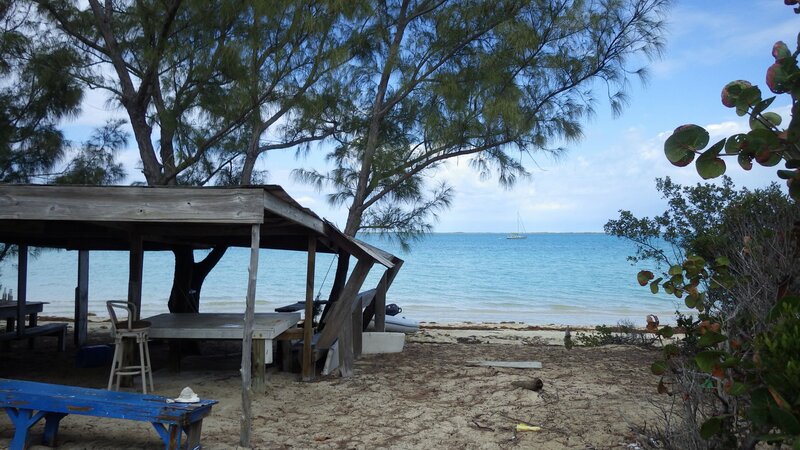 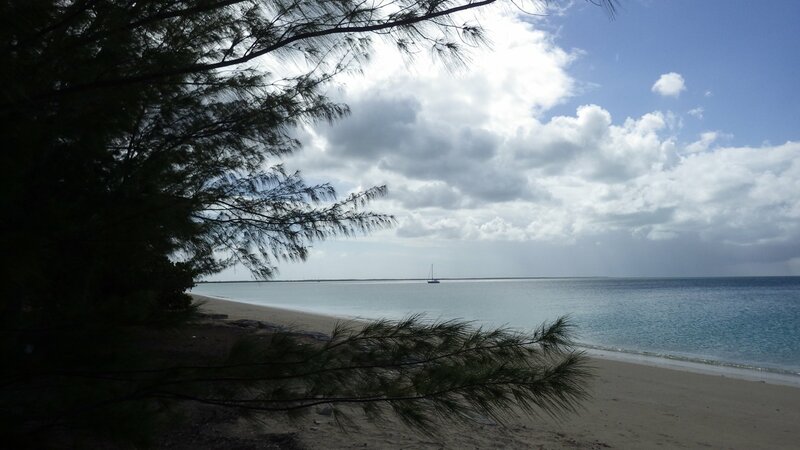 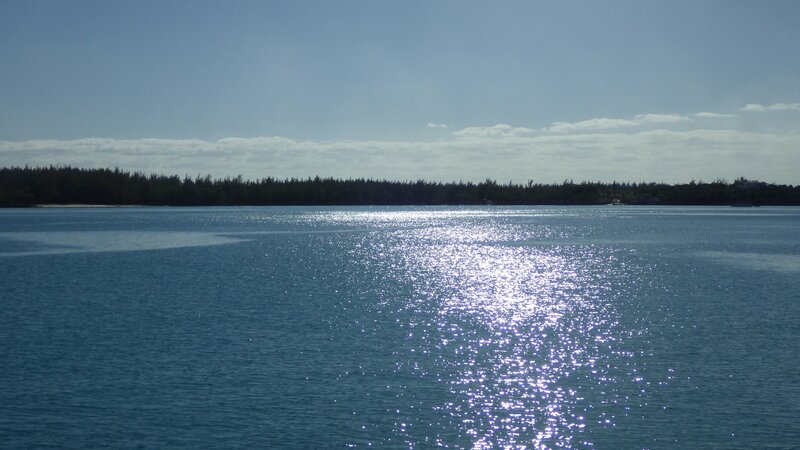 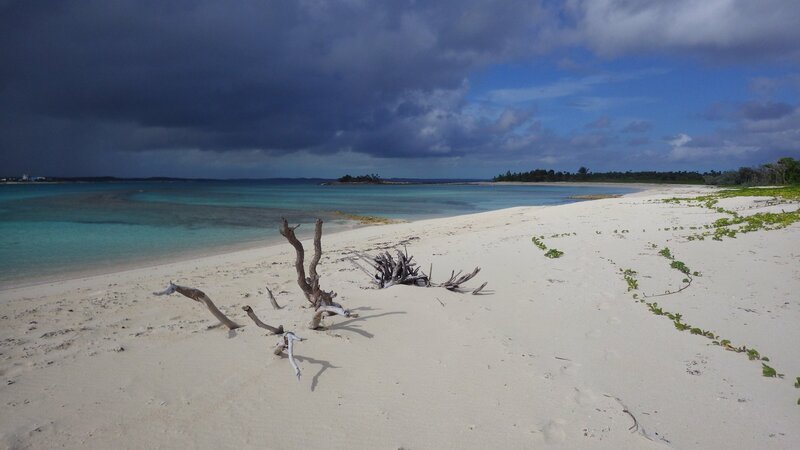 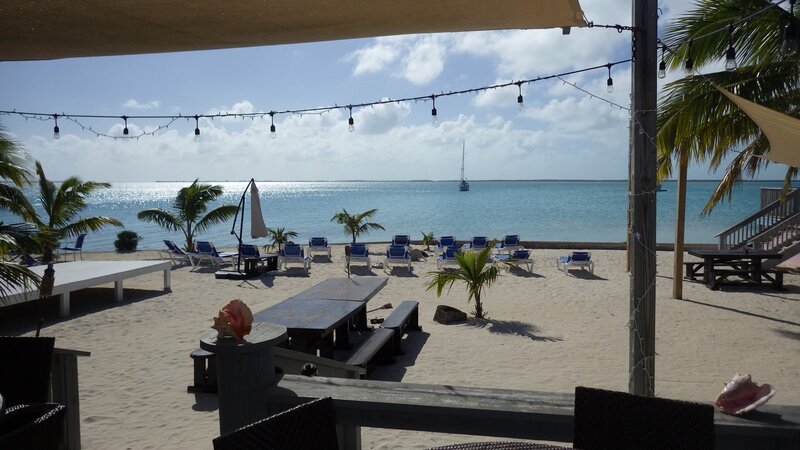 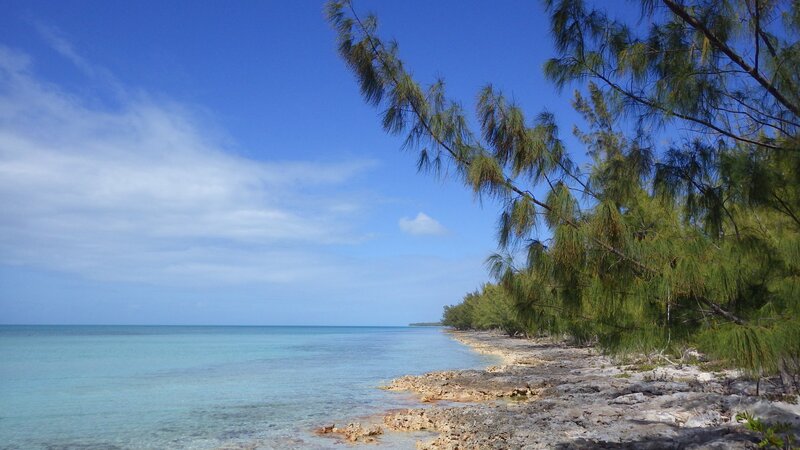 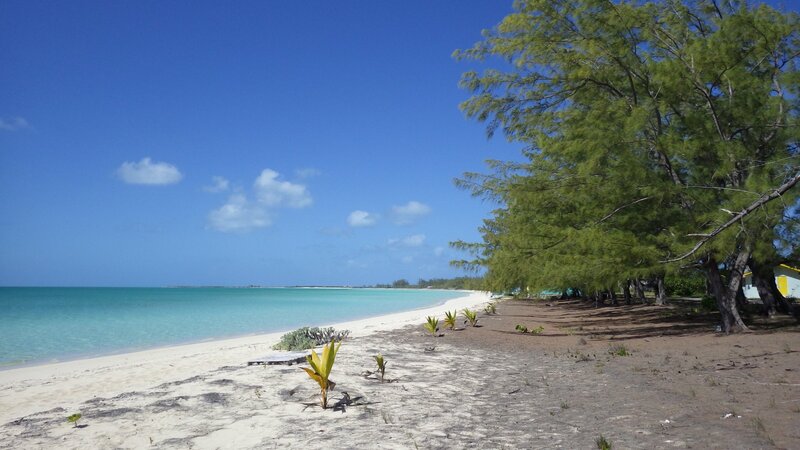 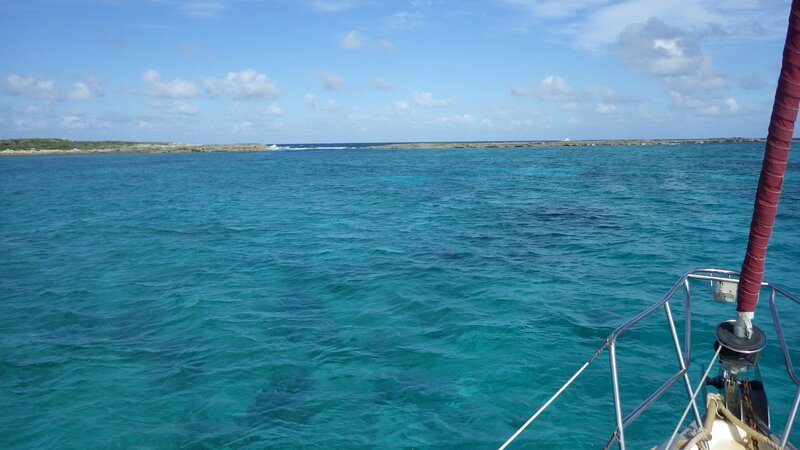 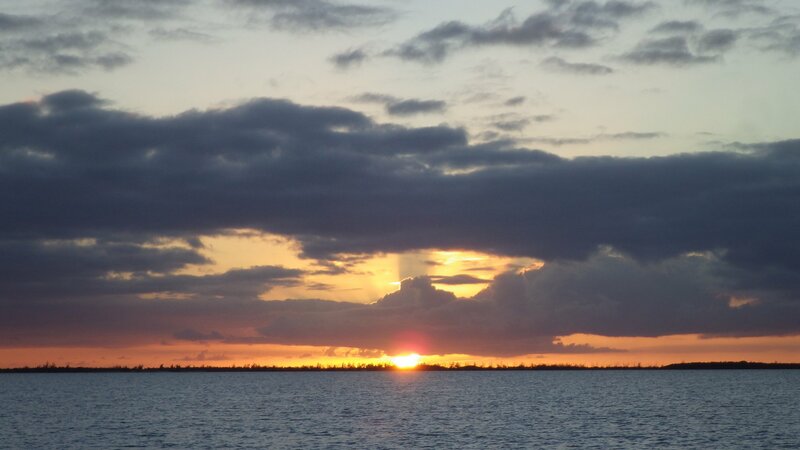 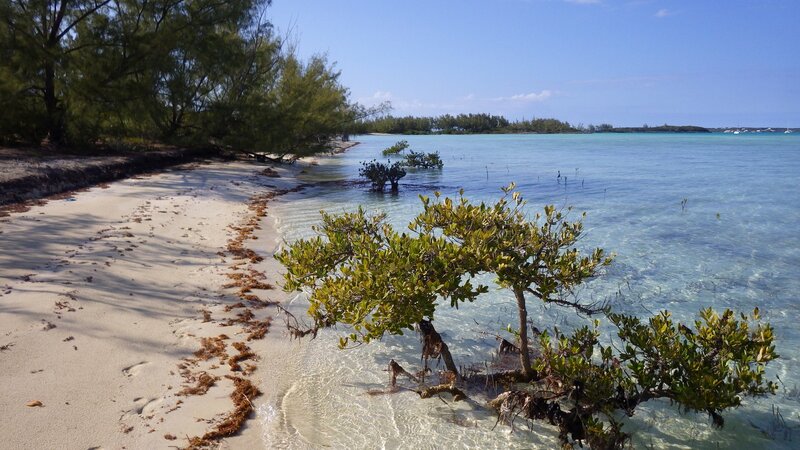 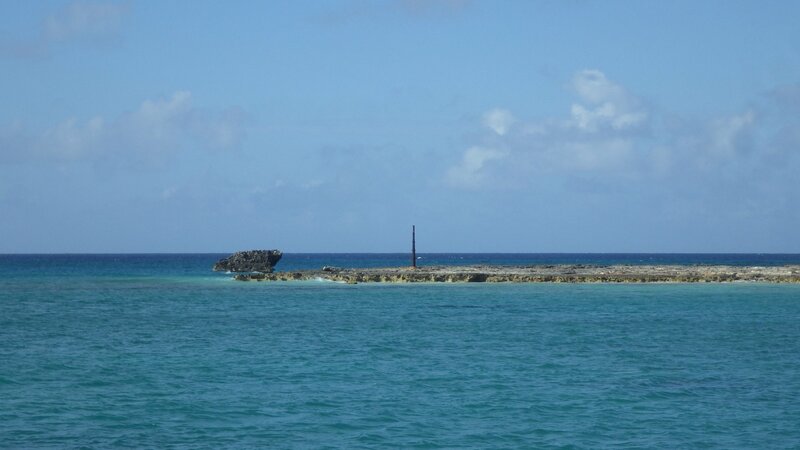 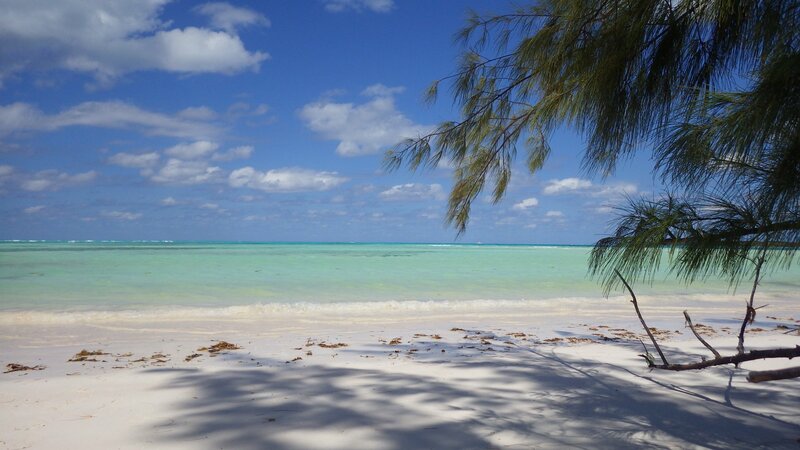 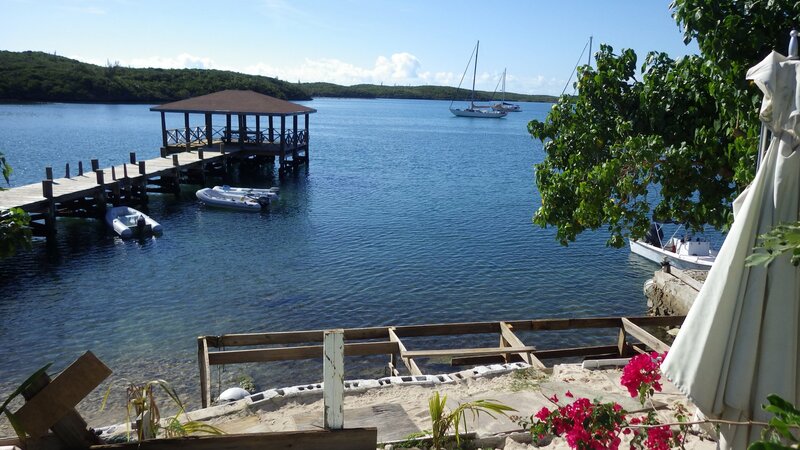 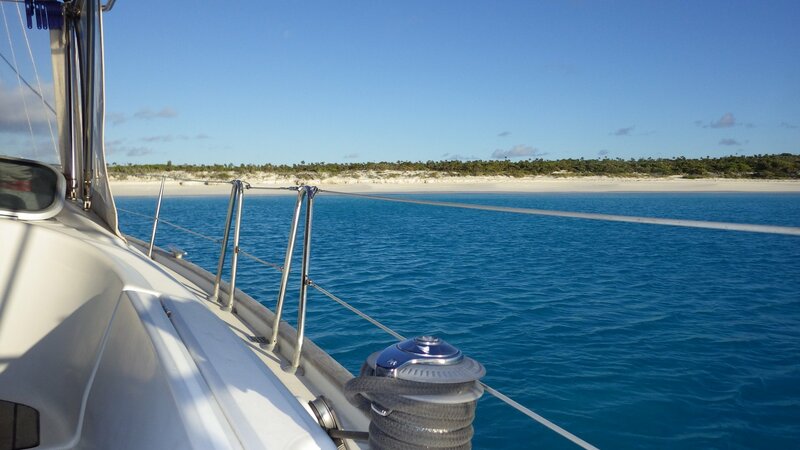 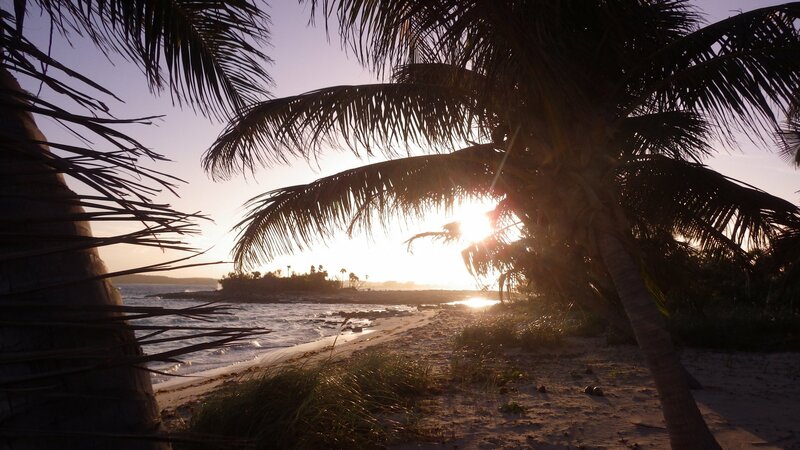 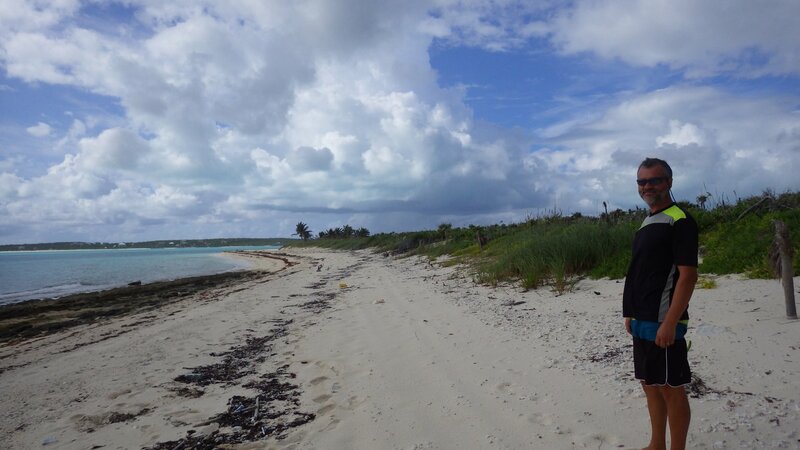 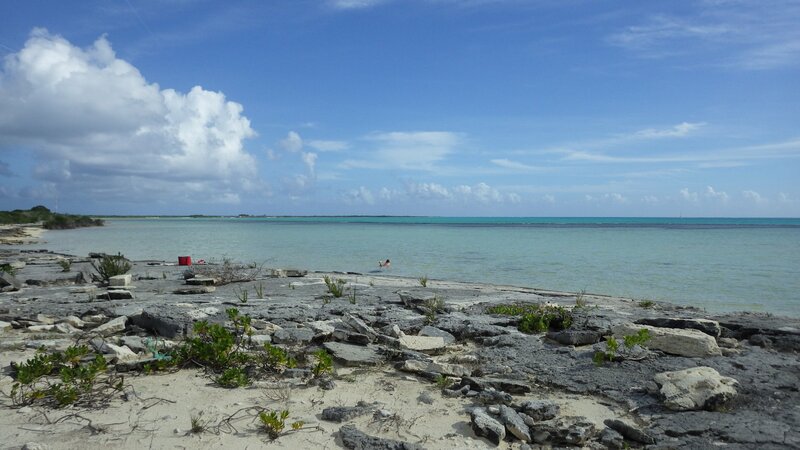 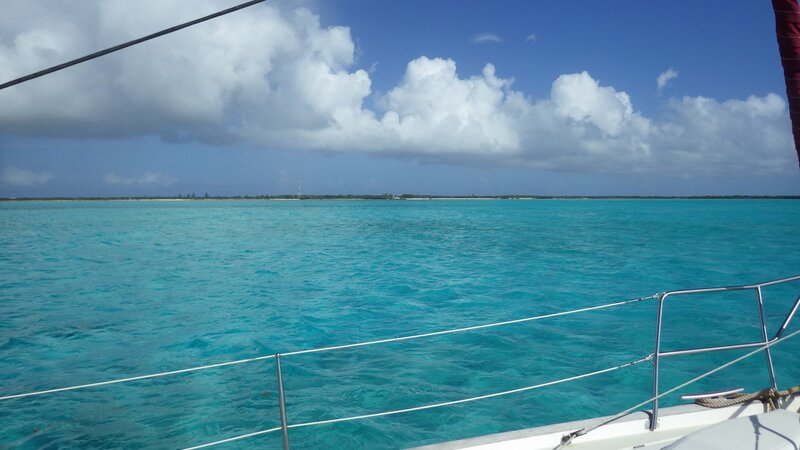 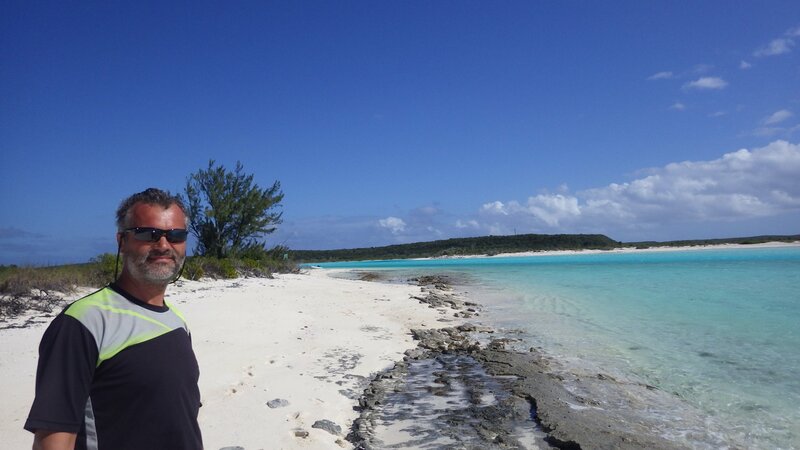 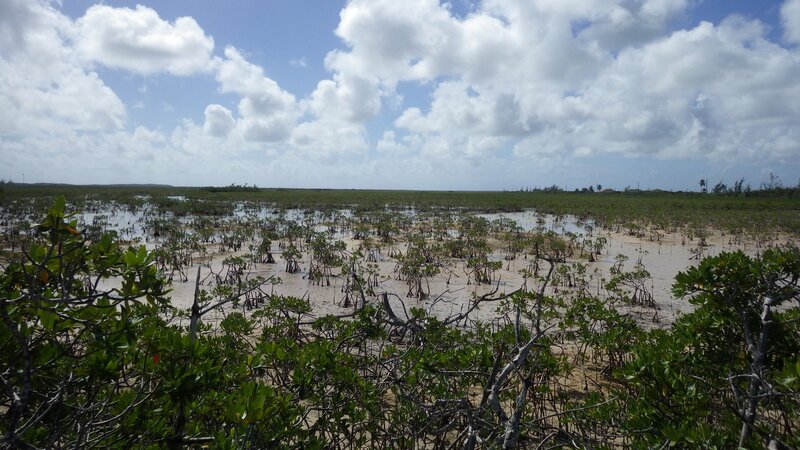 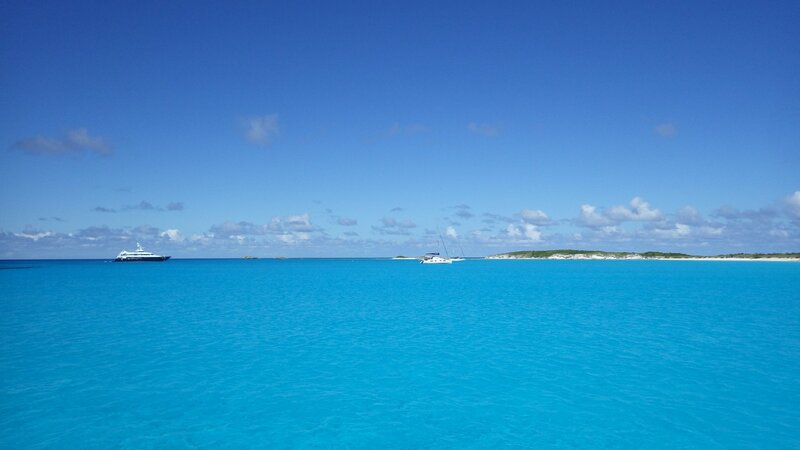 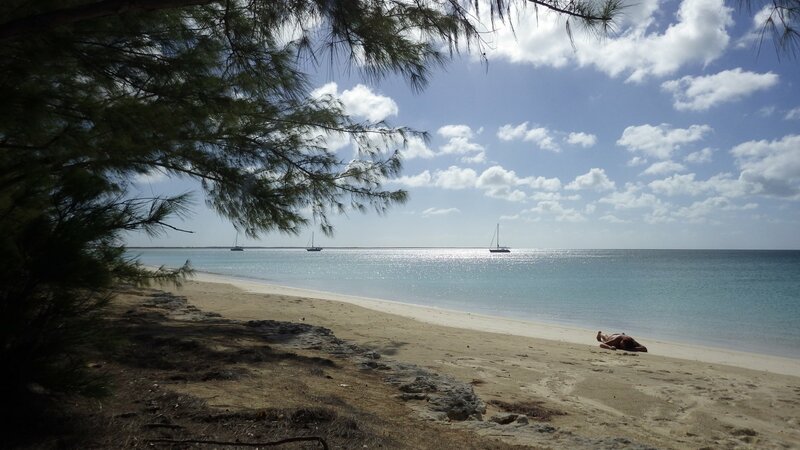 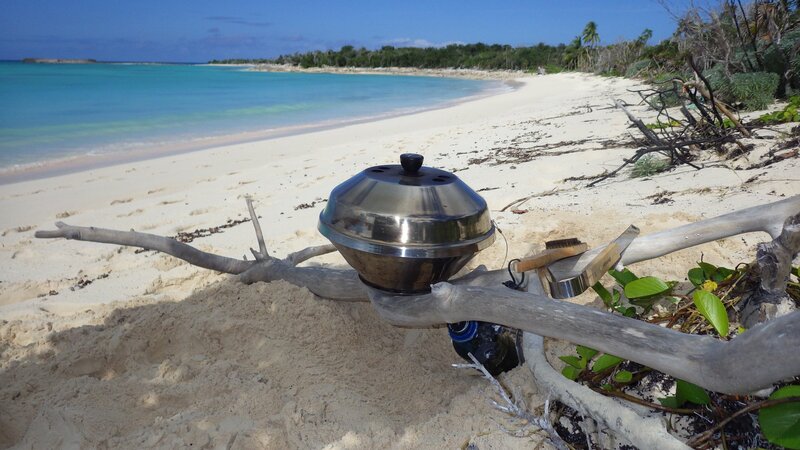 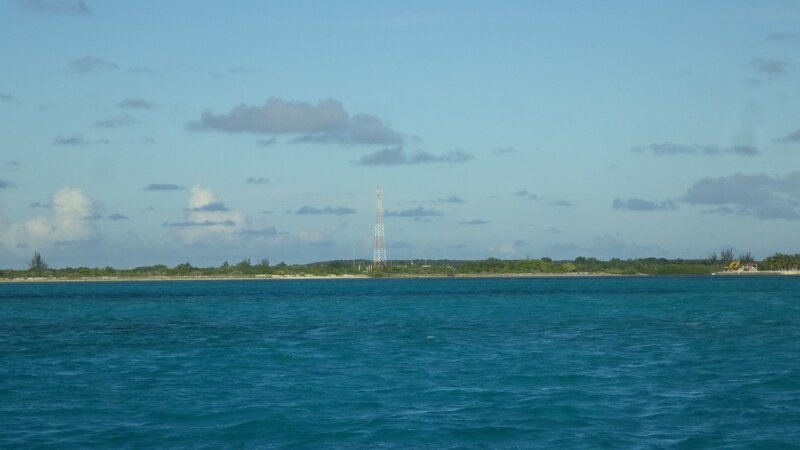 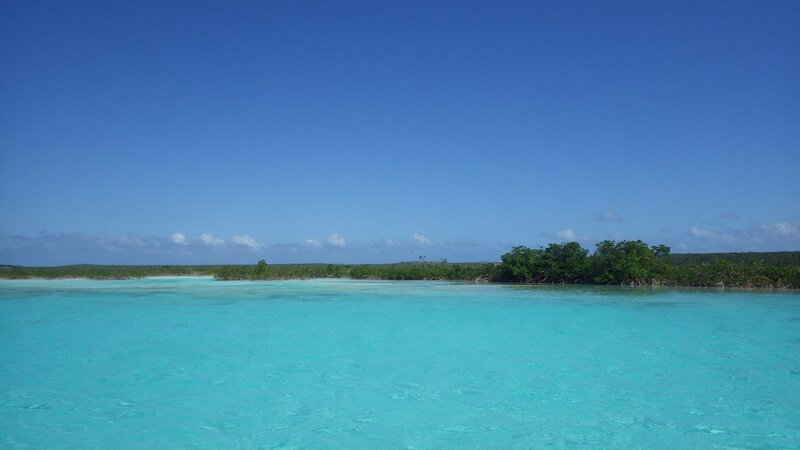 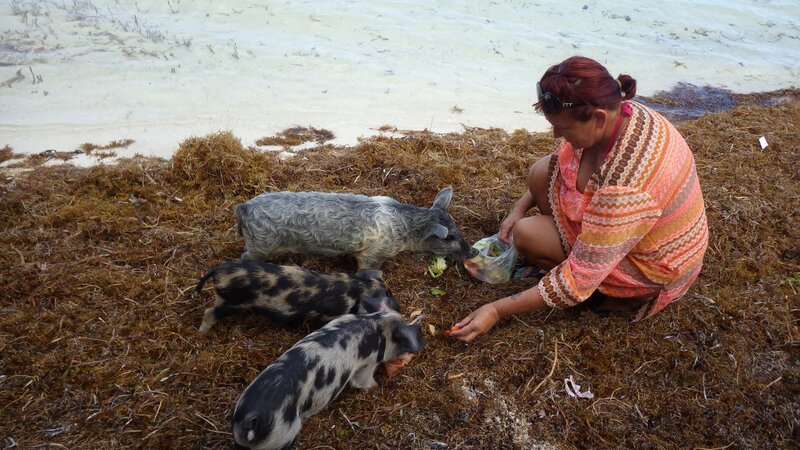 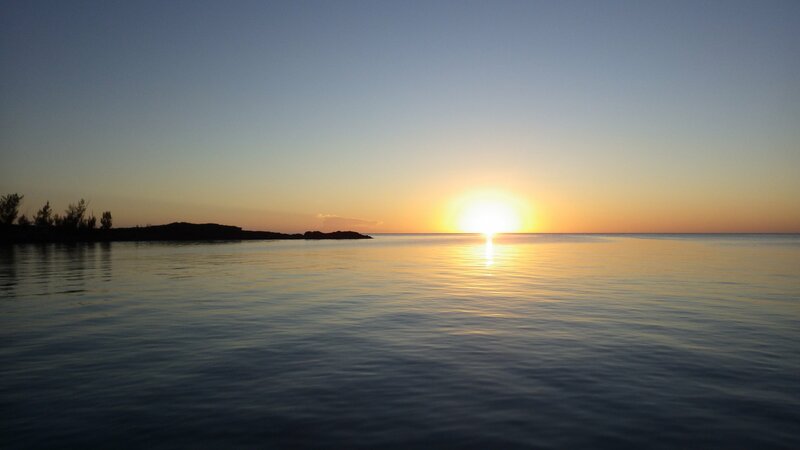 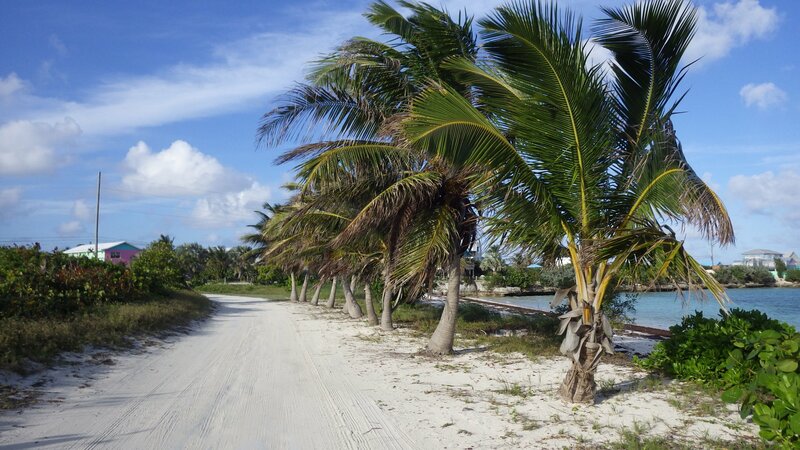 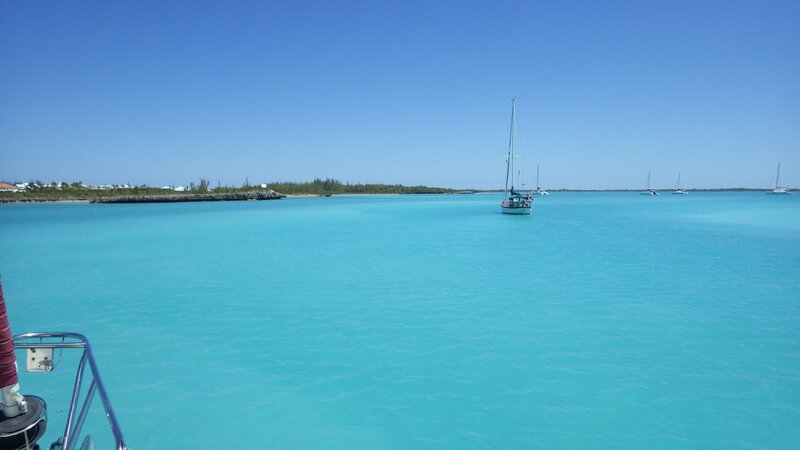 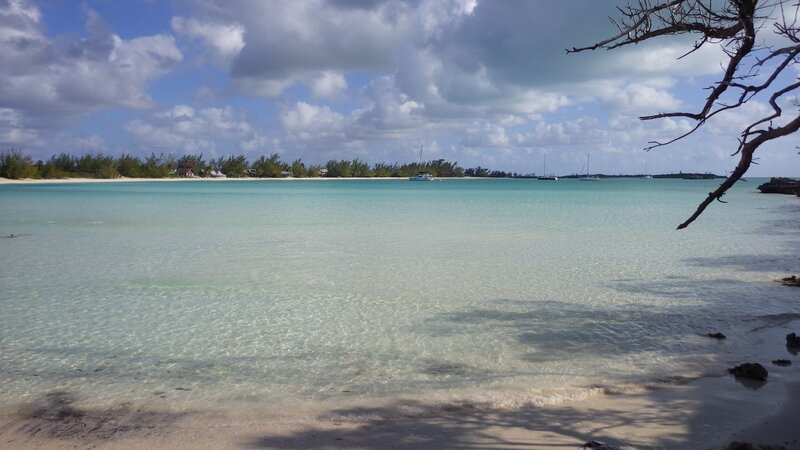 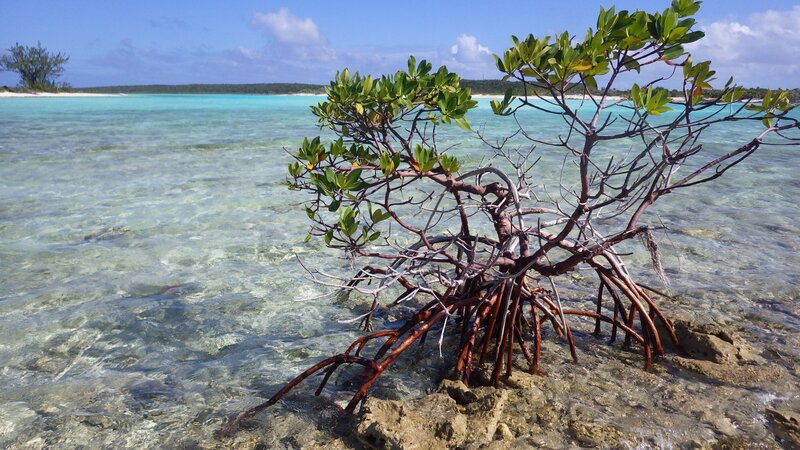 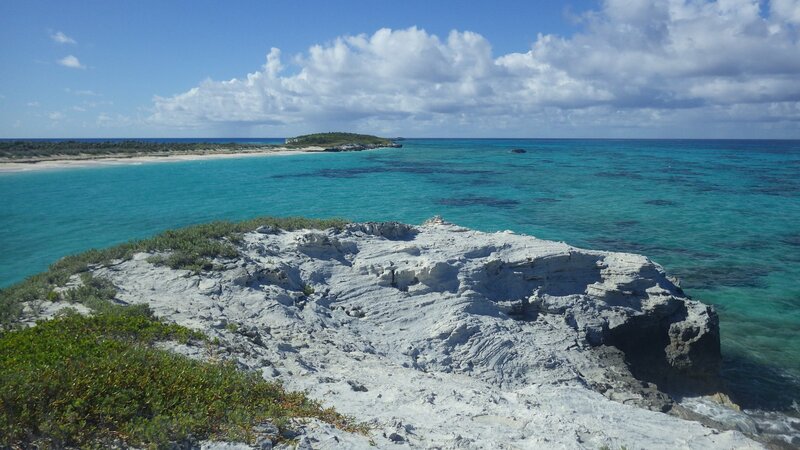 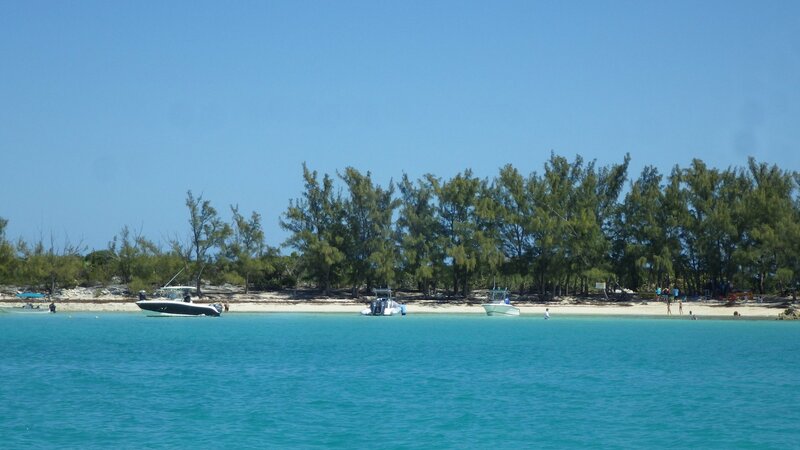 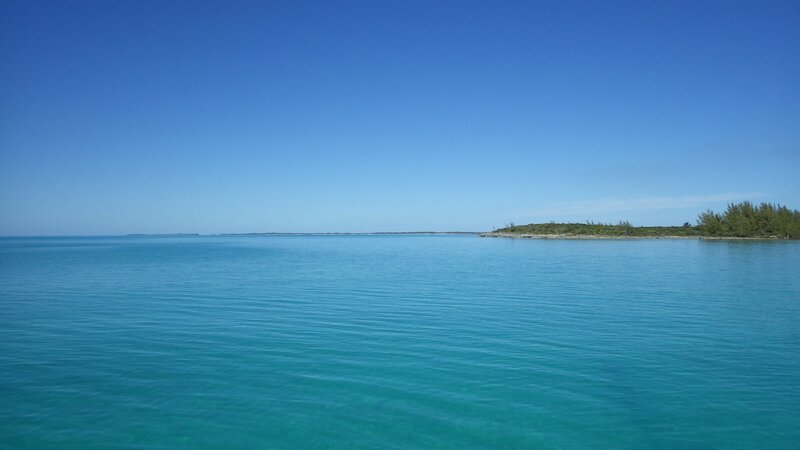 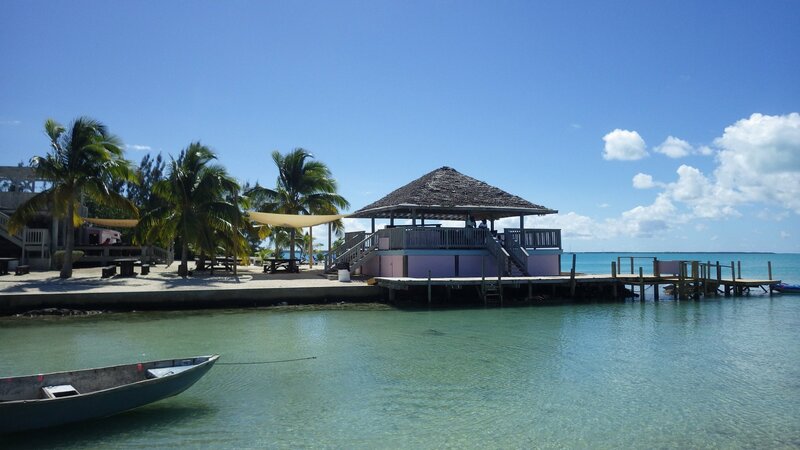 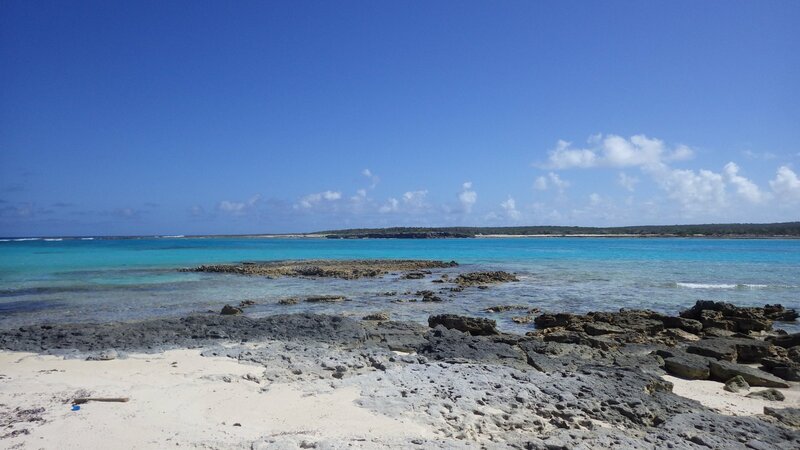 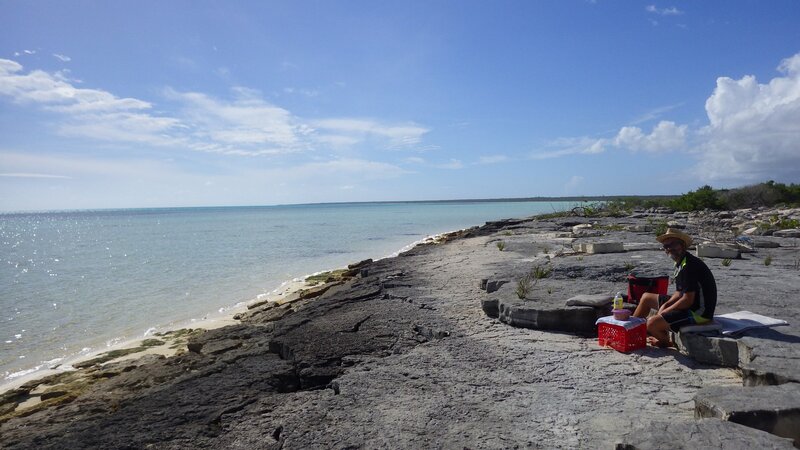 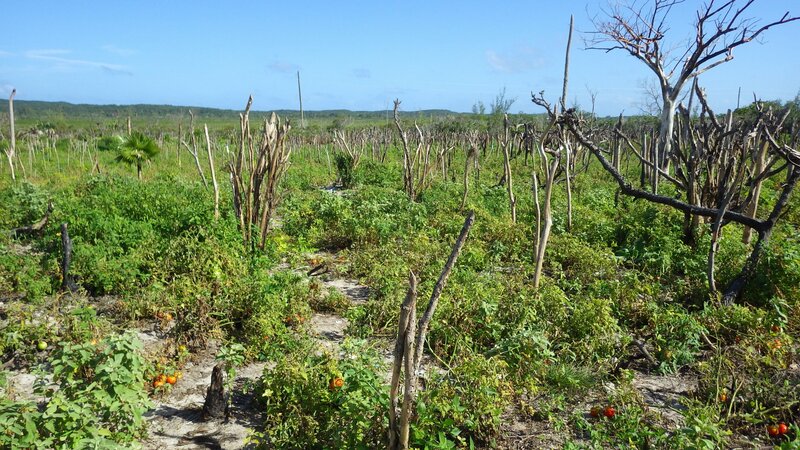 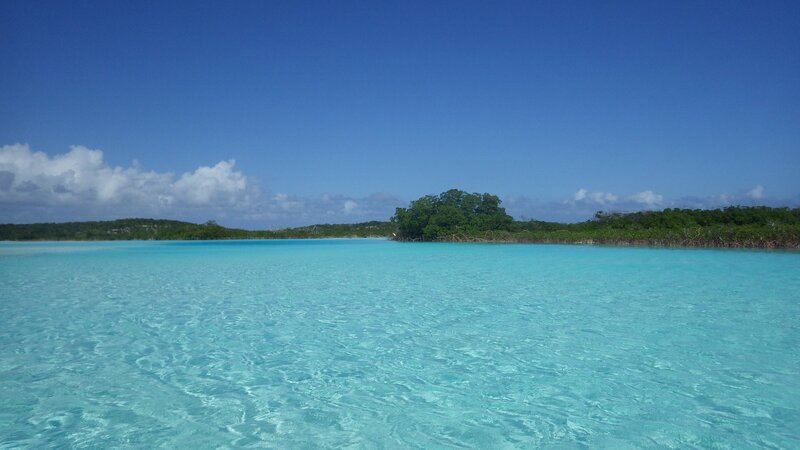 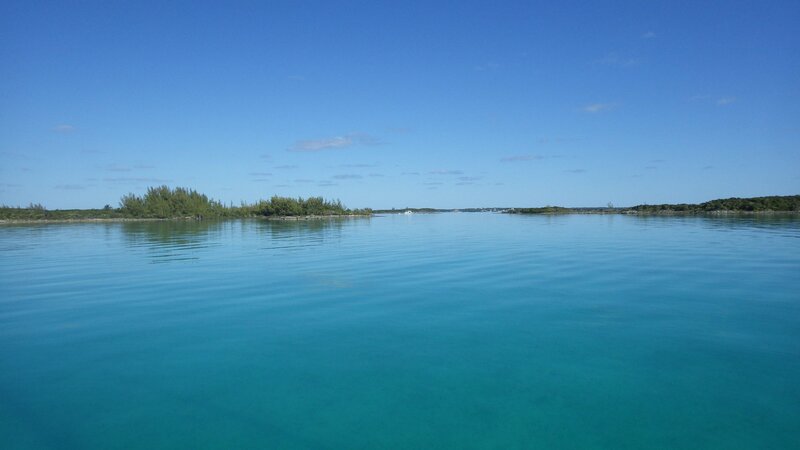 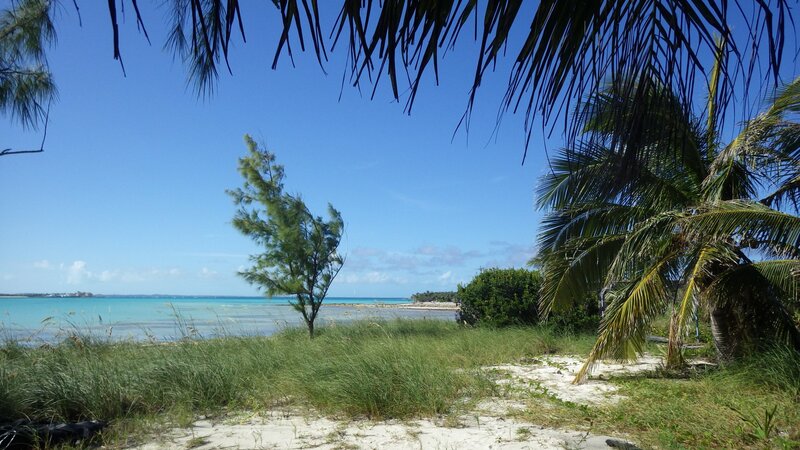 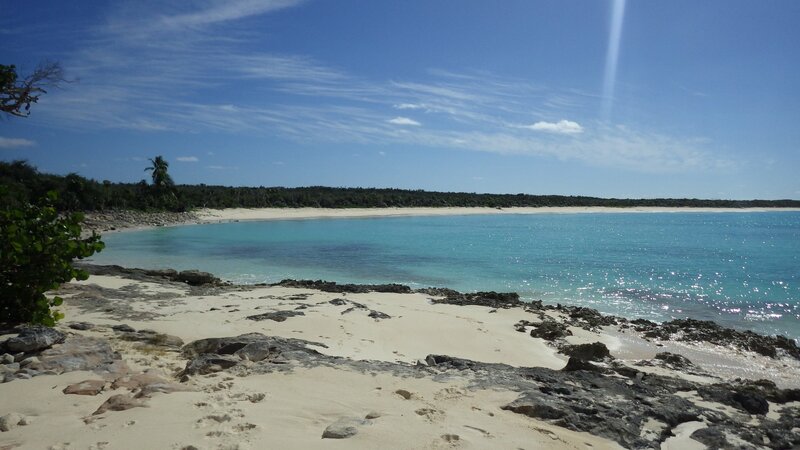 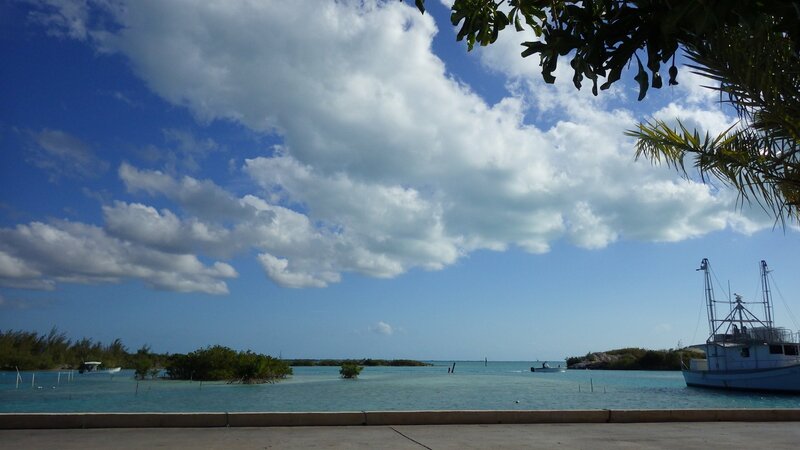 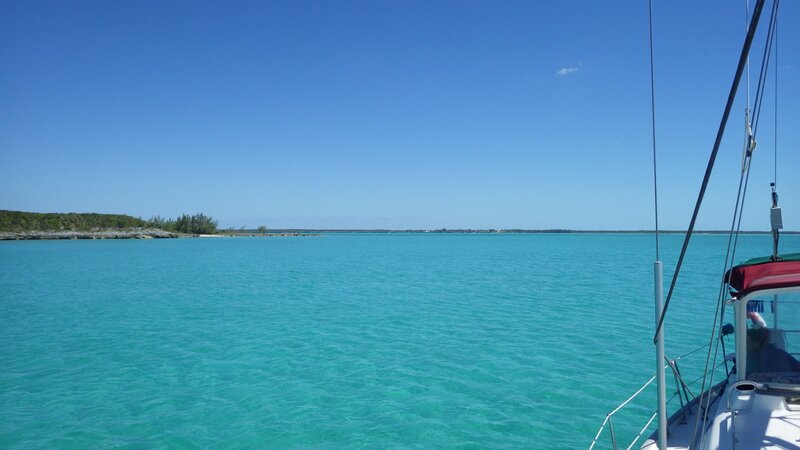 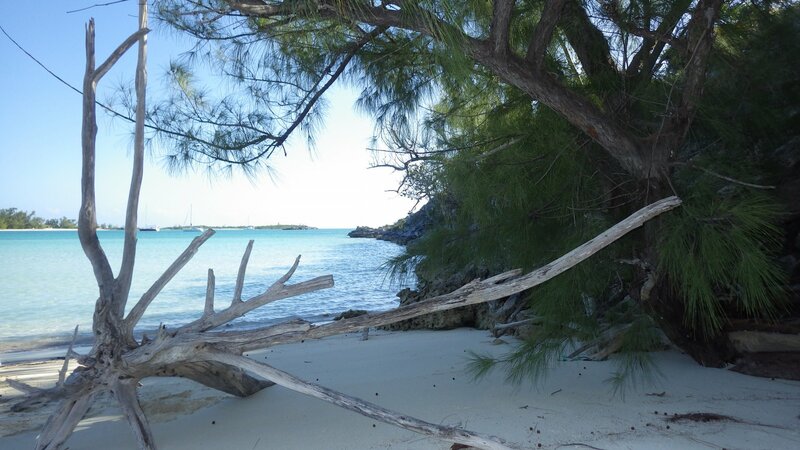 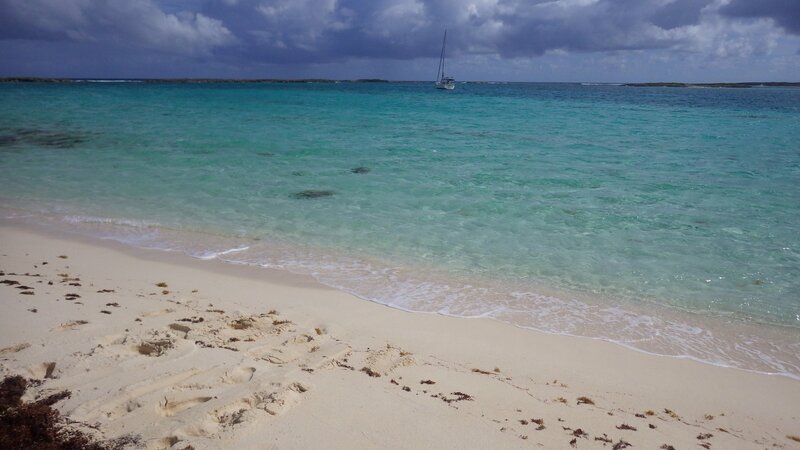 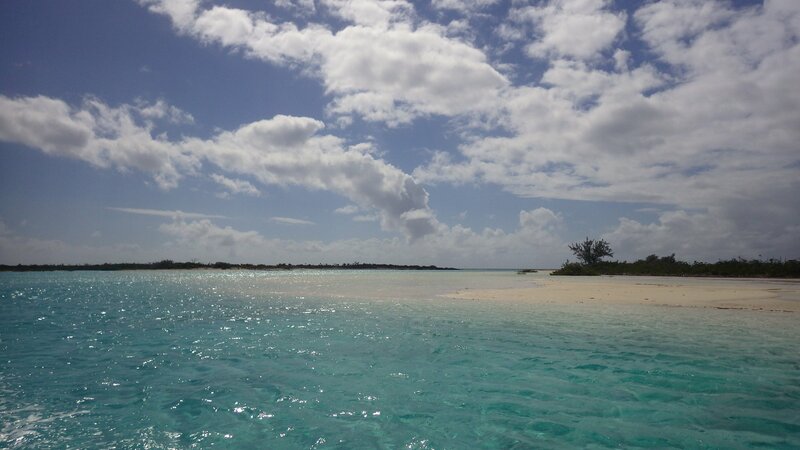 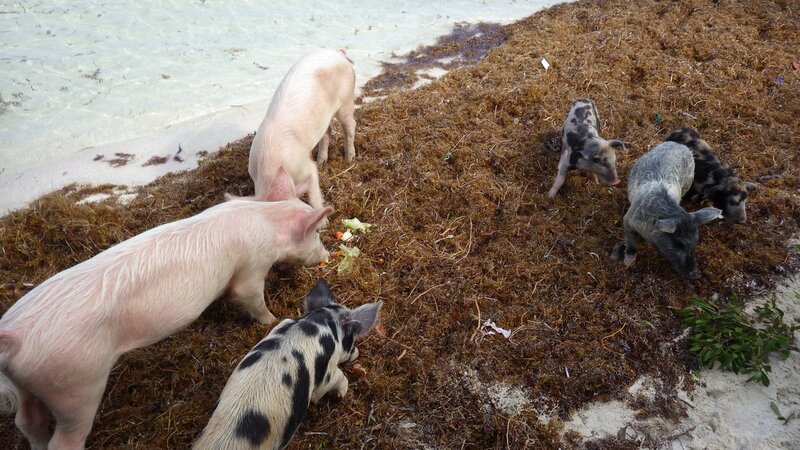 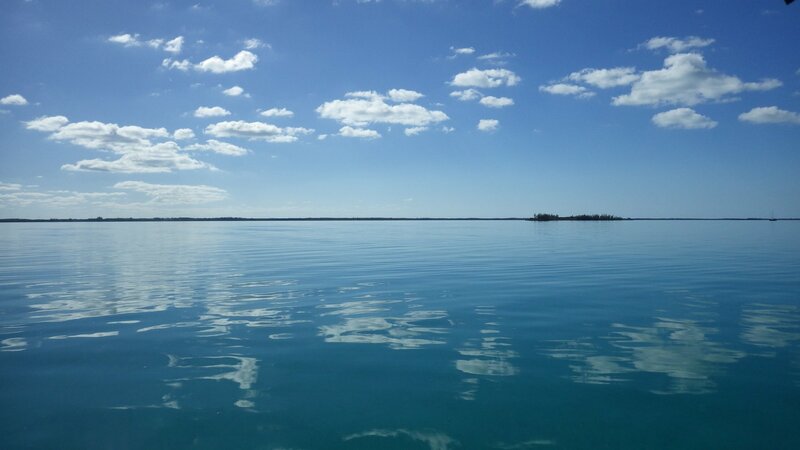 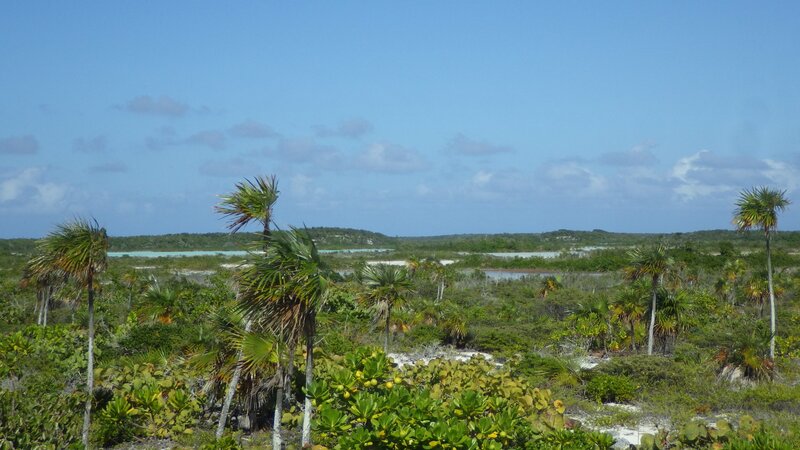 After a short stop at Flamingo Bay on the NW tip of Rum Cay, we sailed to Conception Island. 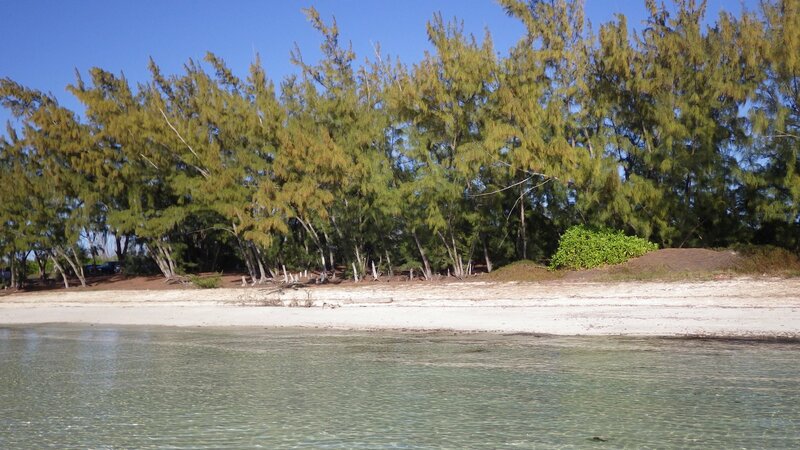 The island is a Nature Reserve, surrounded by reefs. 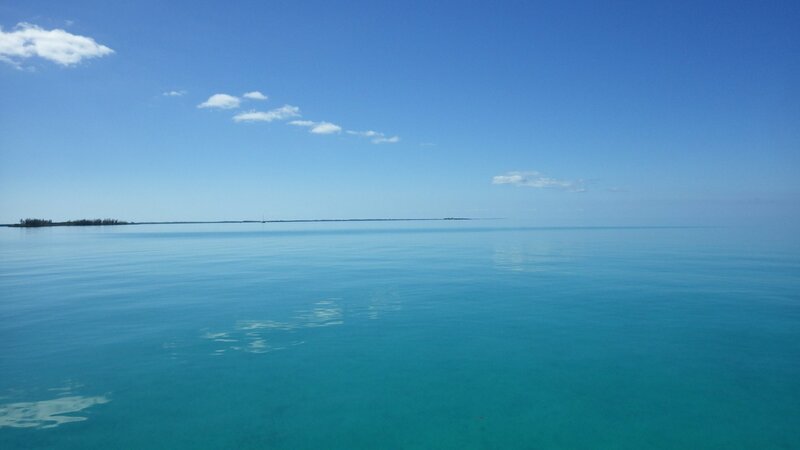 There are no inhabitants here. 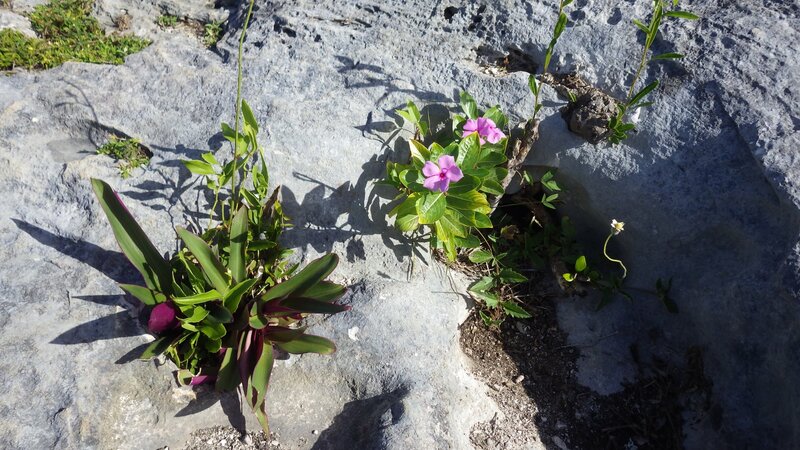 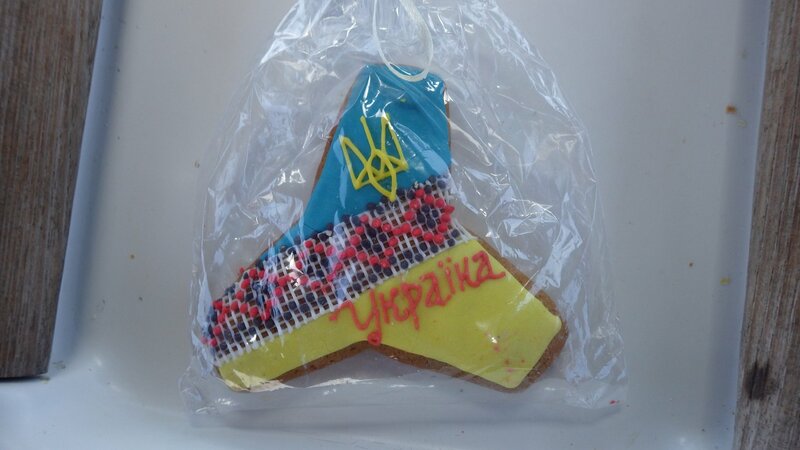 It is fairly small but quite interesting. 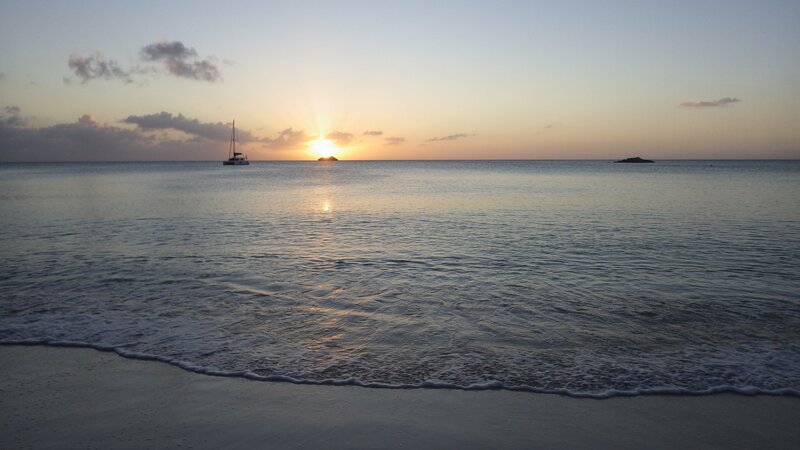 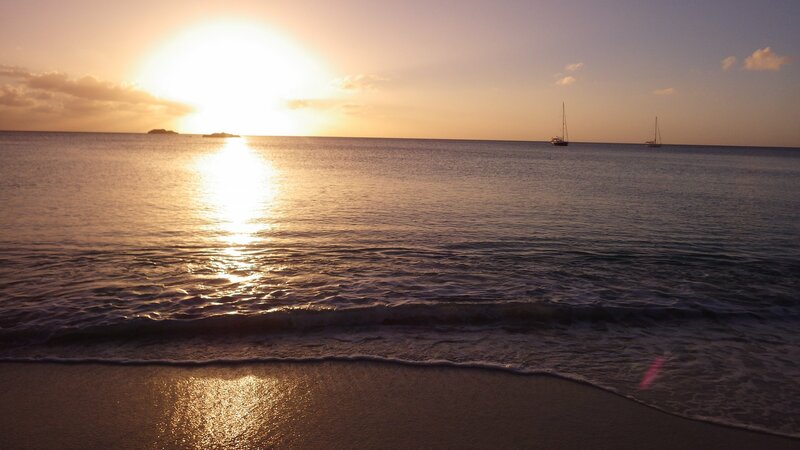 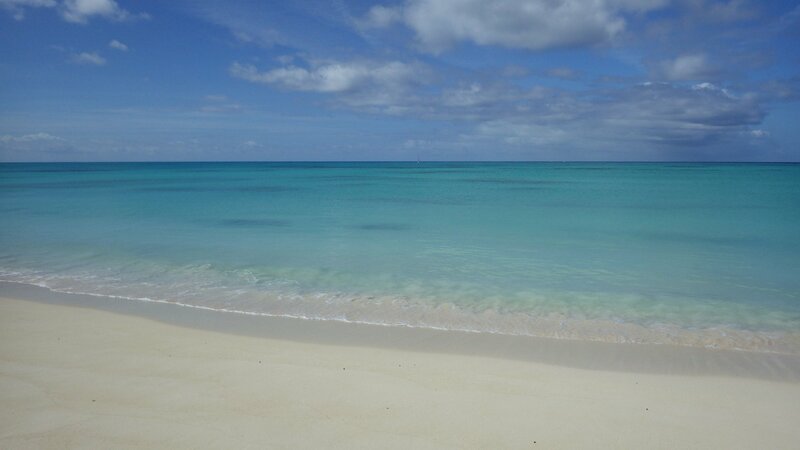 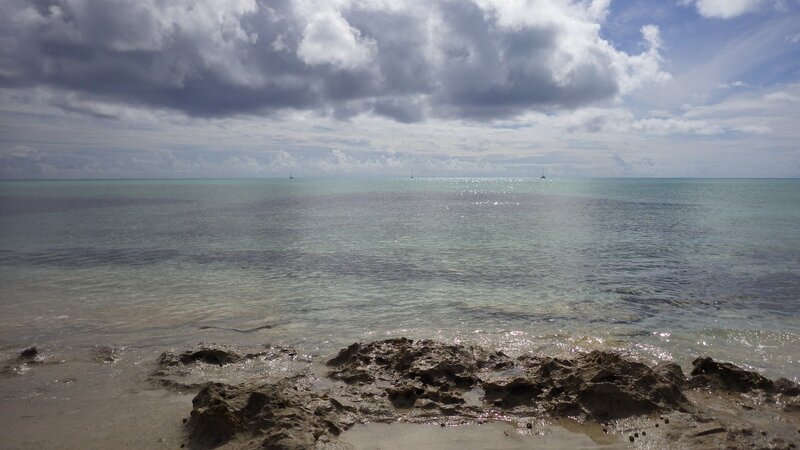 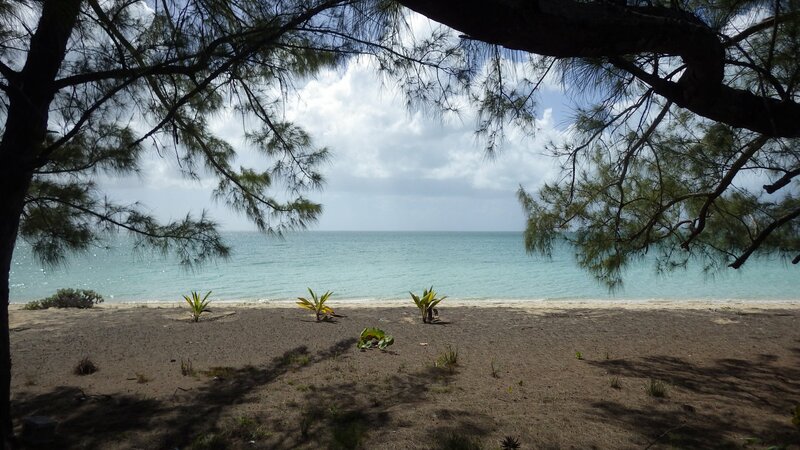 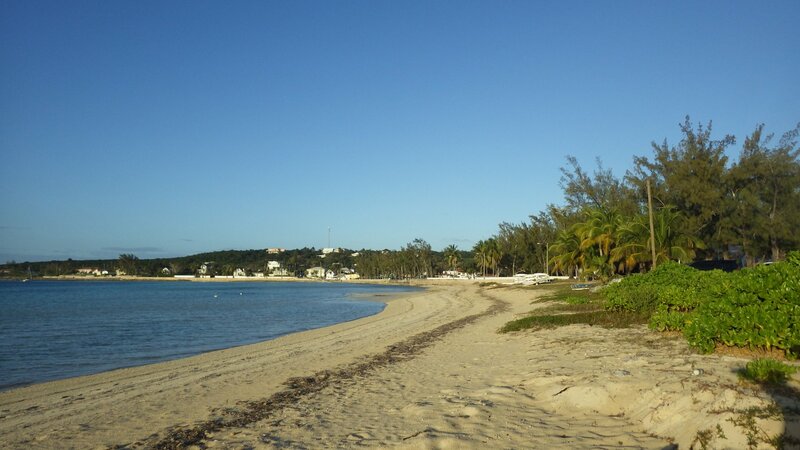 The leeward side has nice and calm beach. 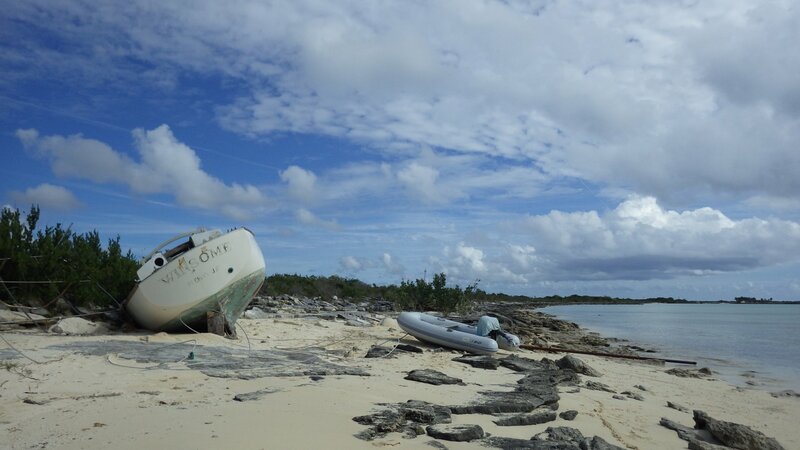 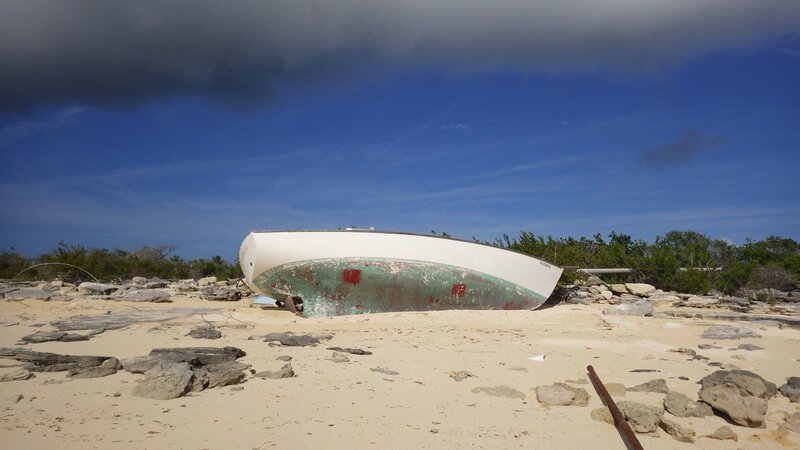 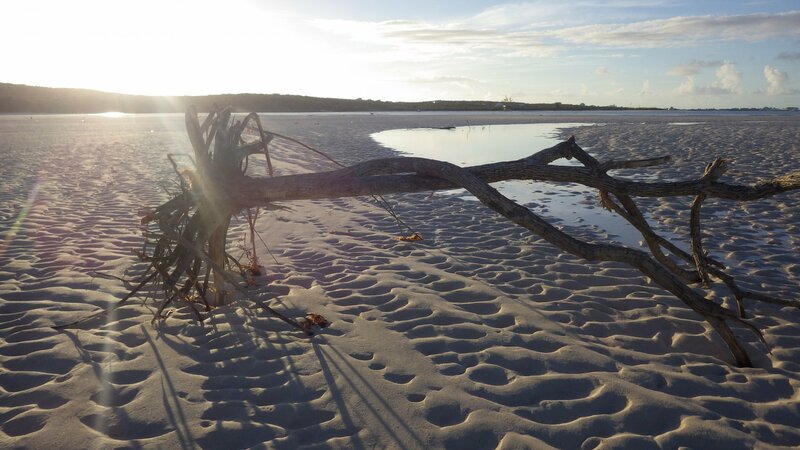 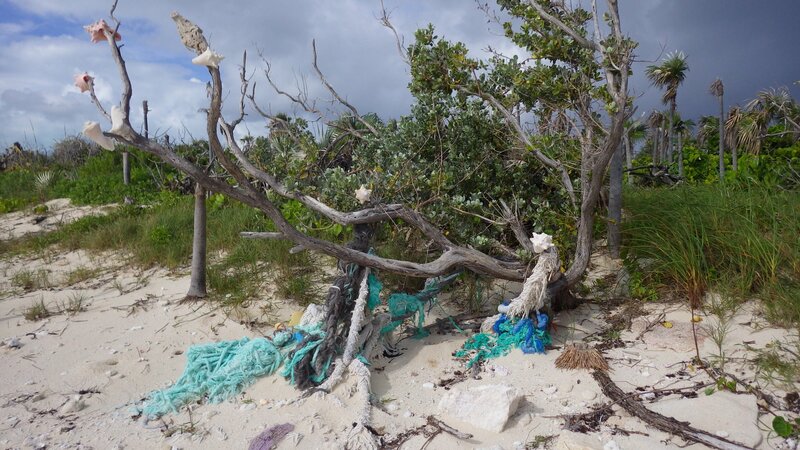 Short walk across the narrow part of the island lays the windward beach, which is rougher, with all kinds of floatsam debris washed ashore. 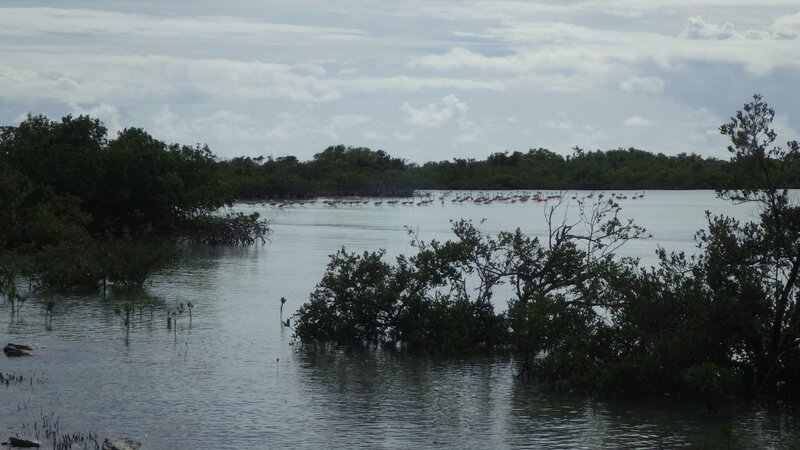 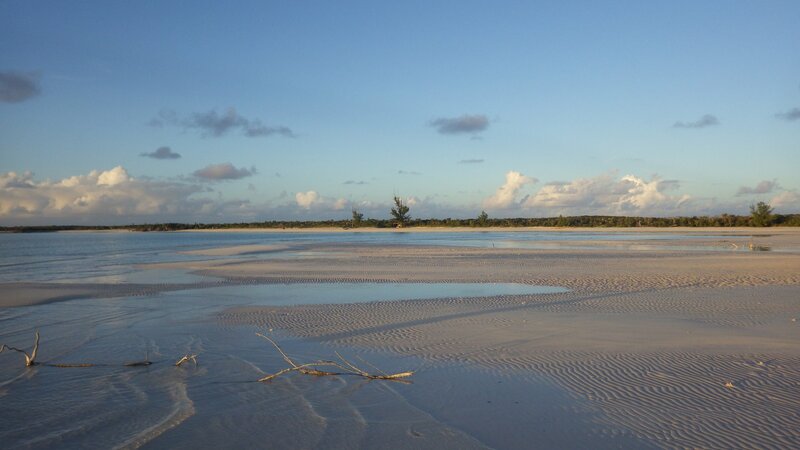 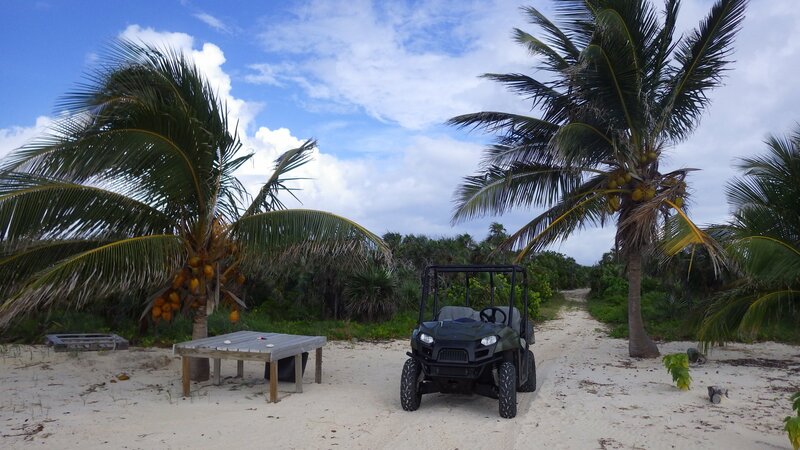 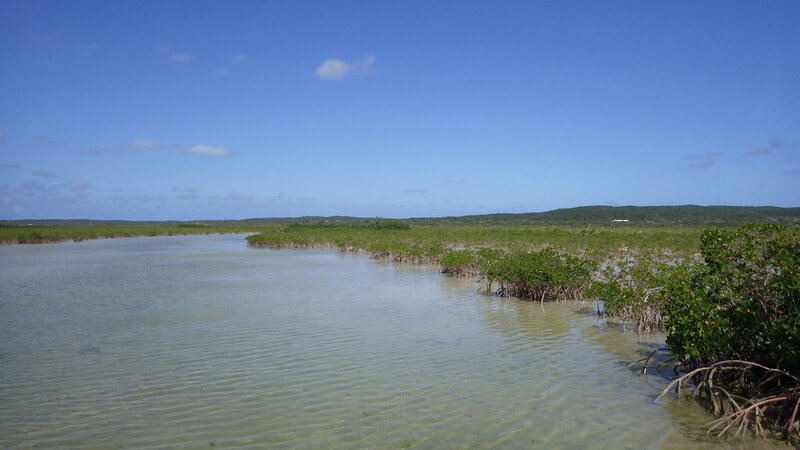 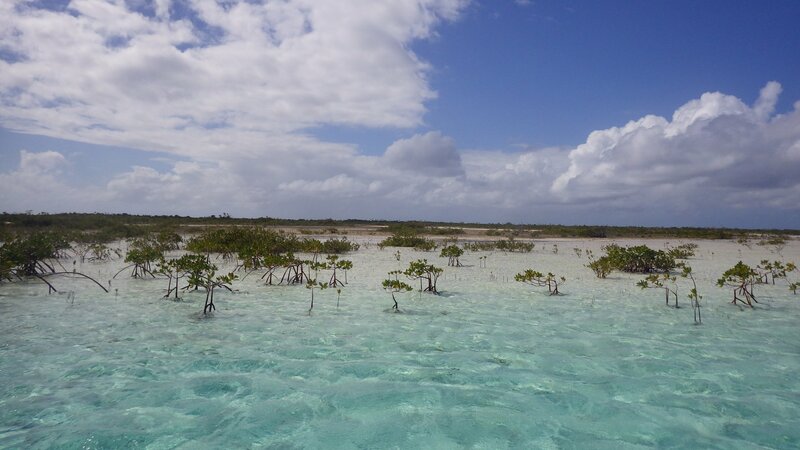 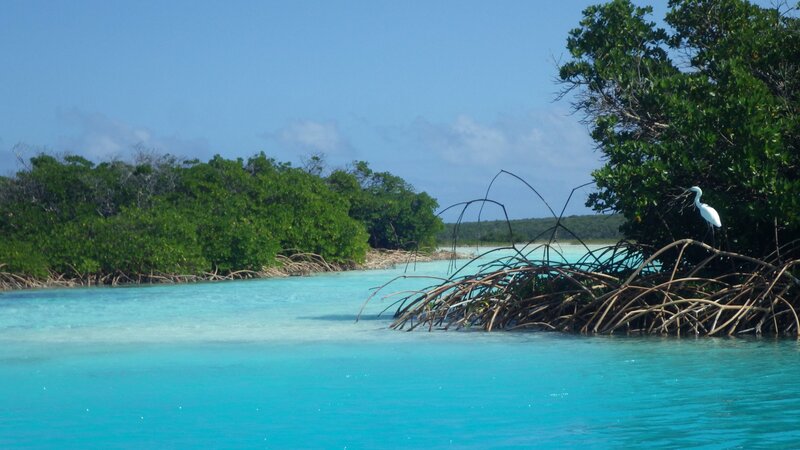 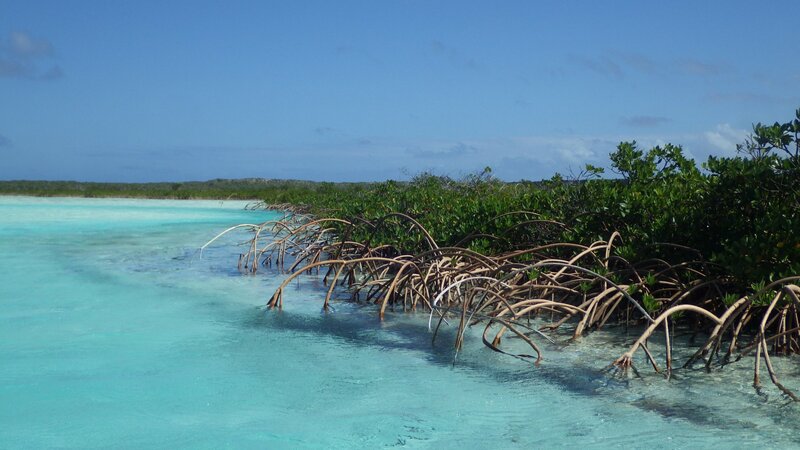 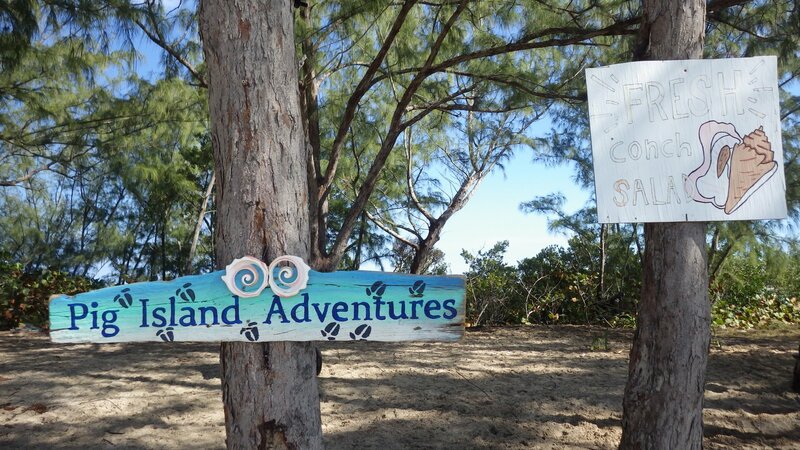 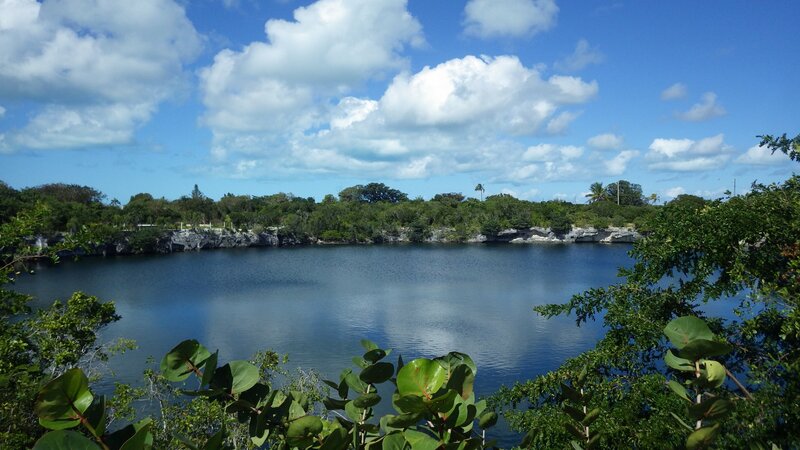 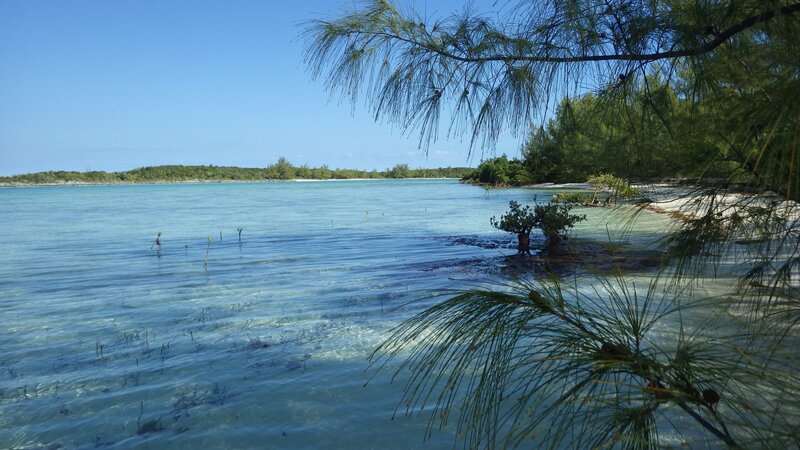 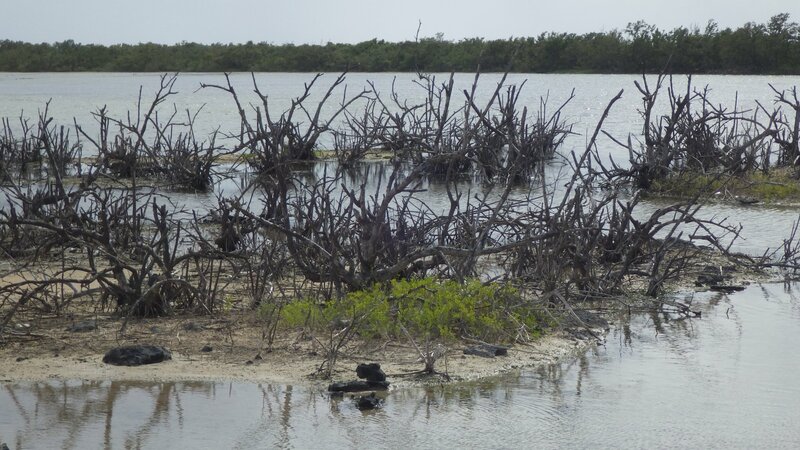 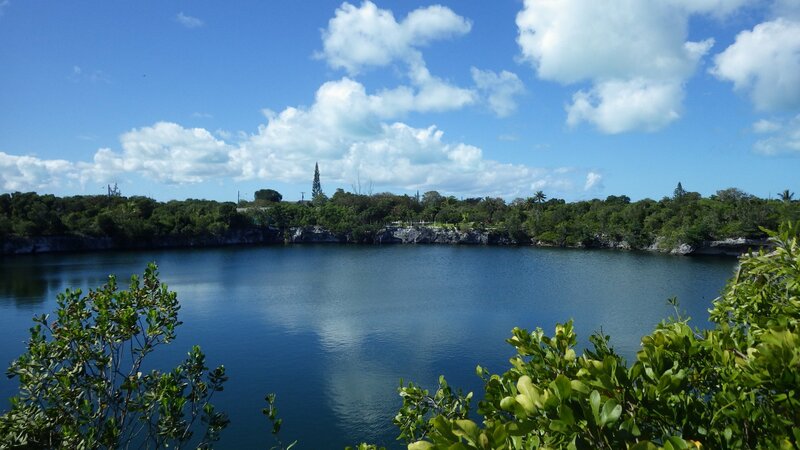 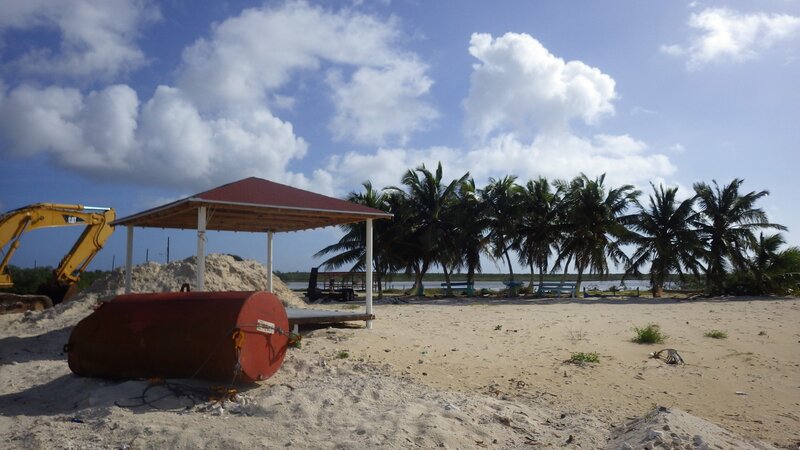 In the middle of the island there is a large mangrove lagoon perfect for dinghy exploration, full with birds and sea turtles. 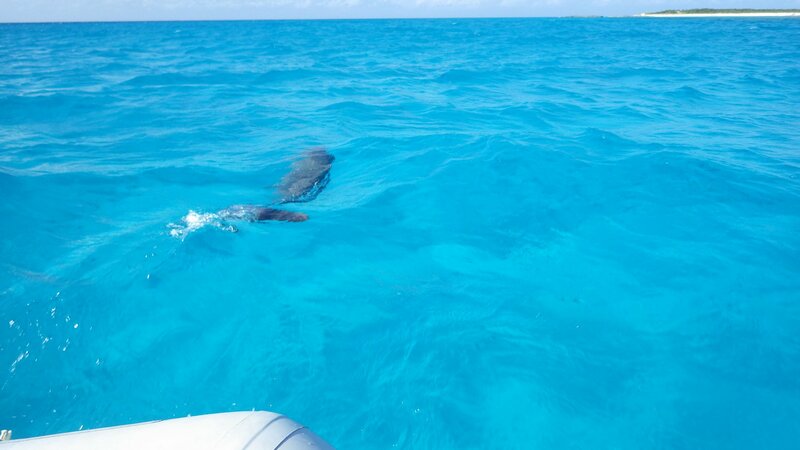 On a way back our dinghy was followed by a playful dolphin. 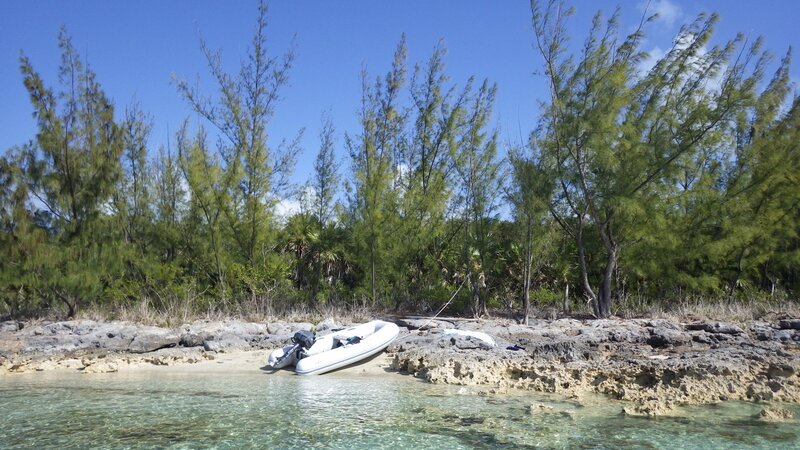 Cat Island was lovely. 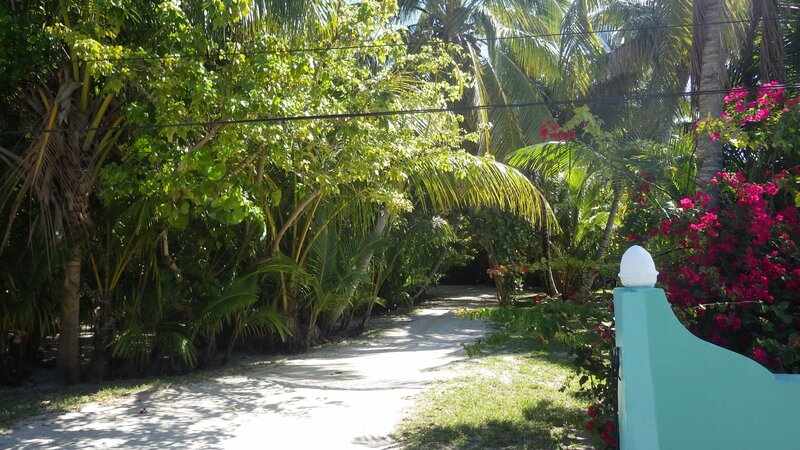 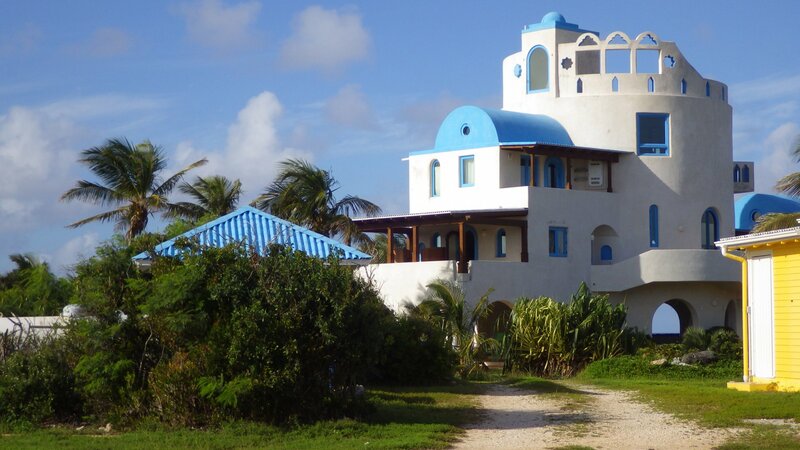 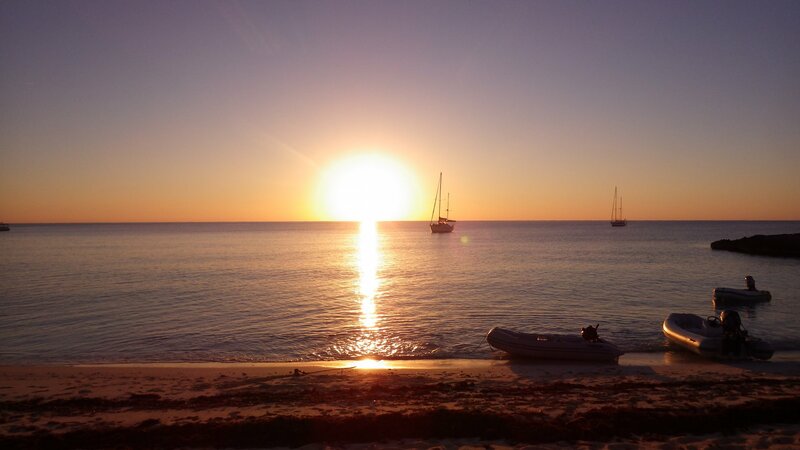 It is somewhat off the beaten track, sparsely populated, with nice beaches, places to explore and friendly locals. 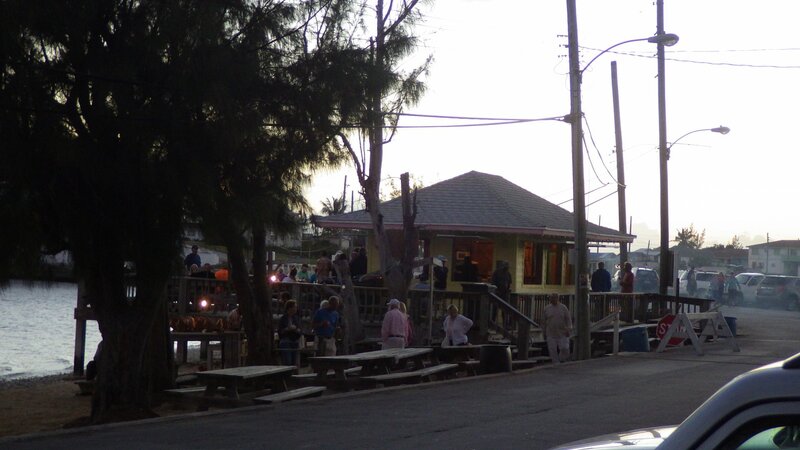 I mean locals are really friendly � when they meet you, they ask your name, and they remember it next time you see them! 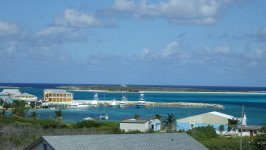 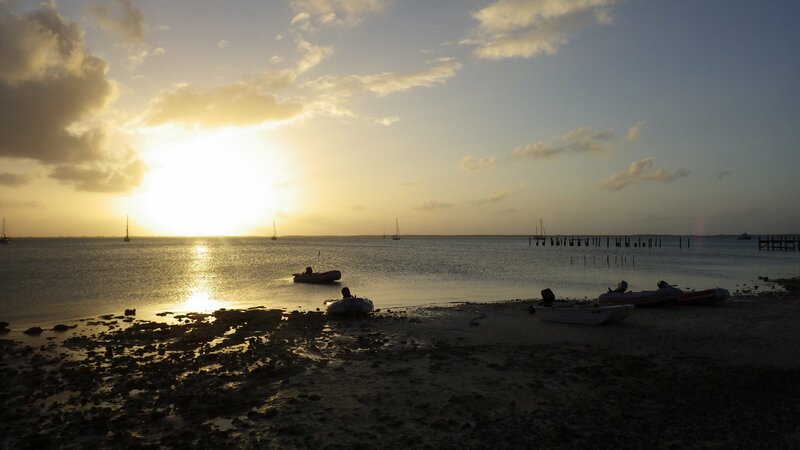 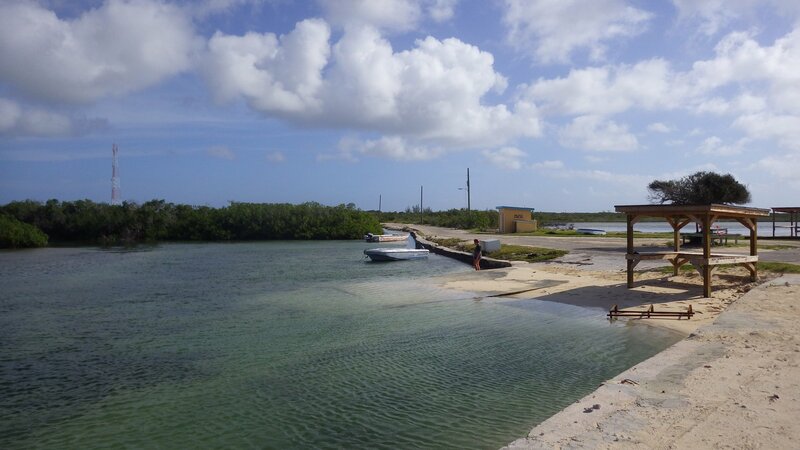 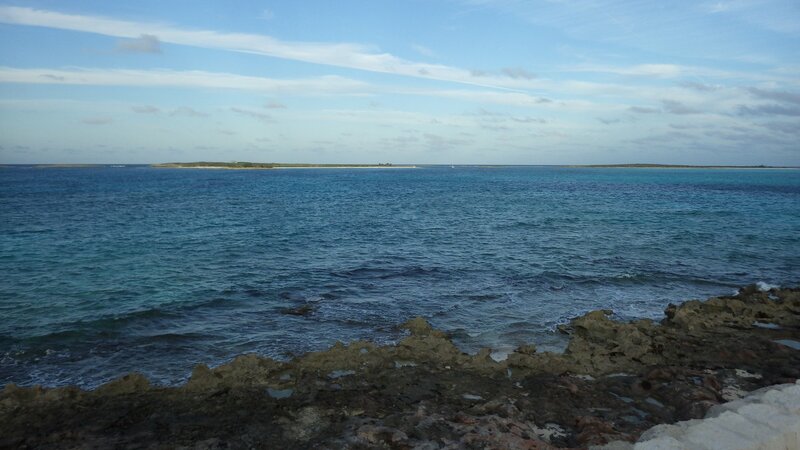 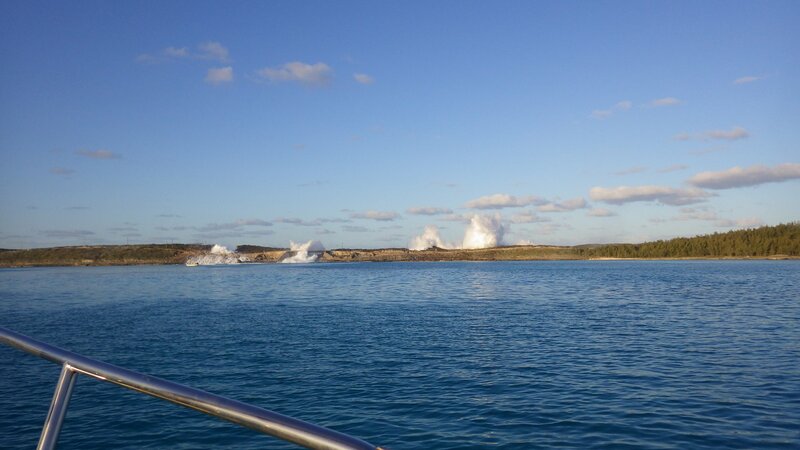 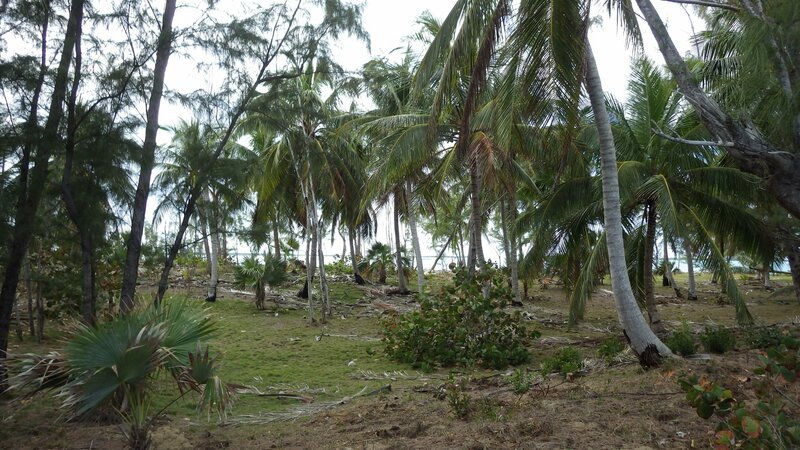 Visited several anchorages along its West shore � Old Bight, New Bight, Fernandez Bay. 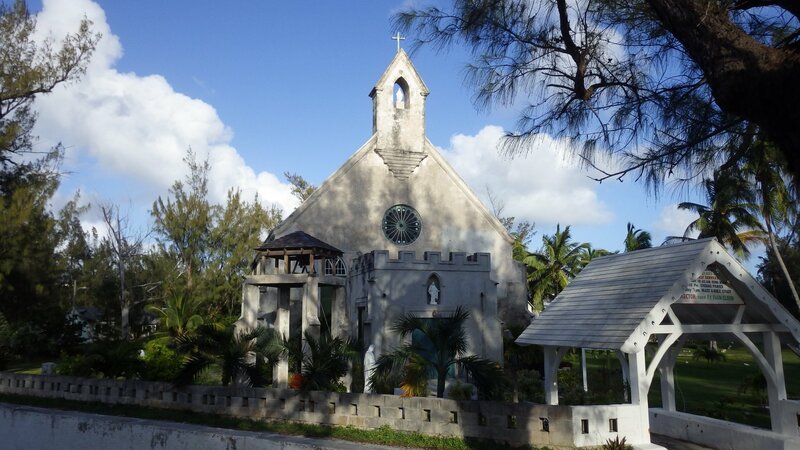 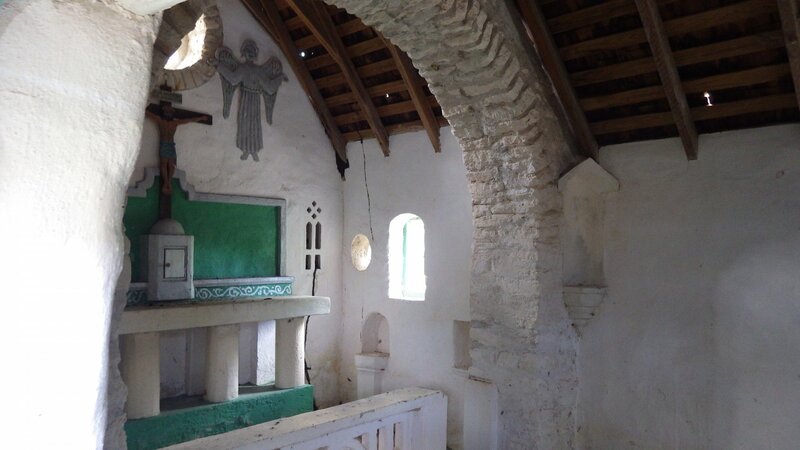 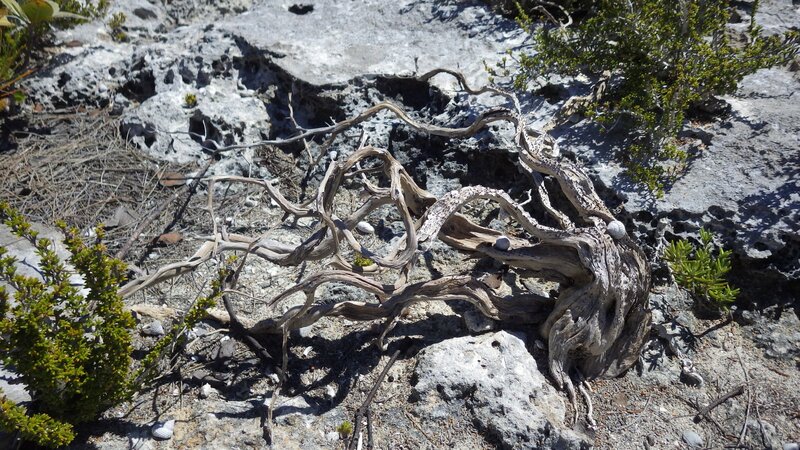 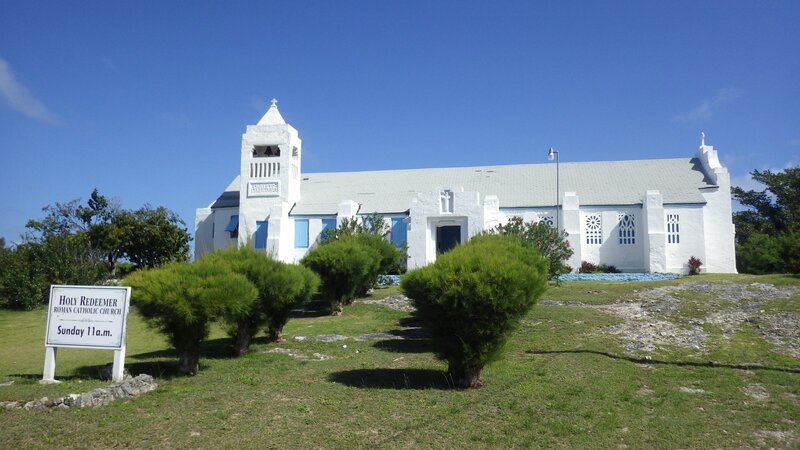 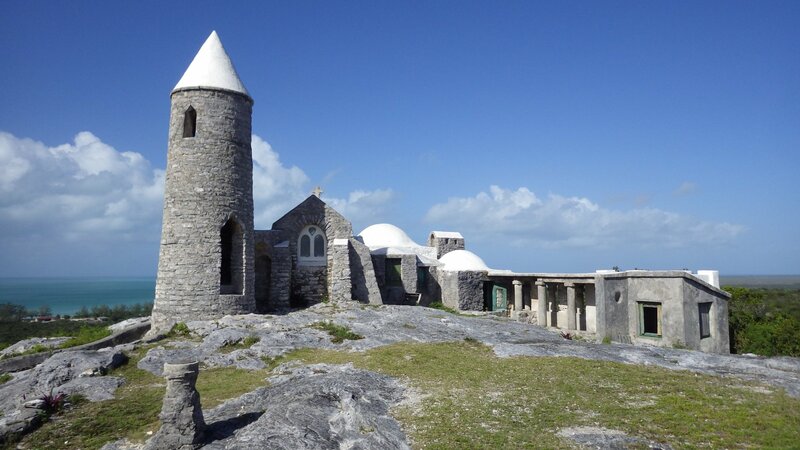 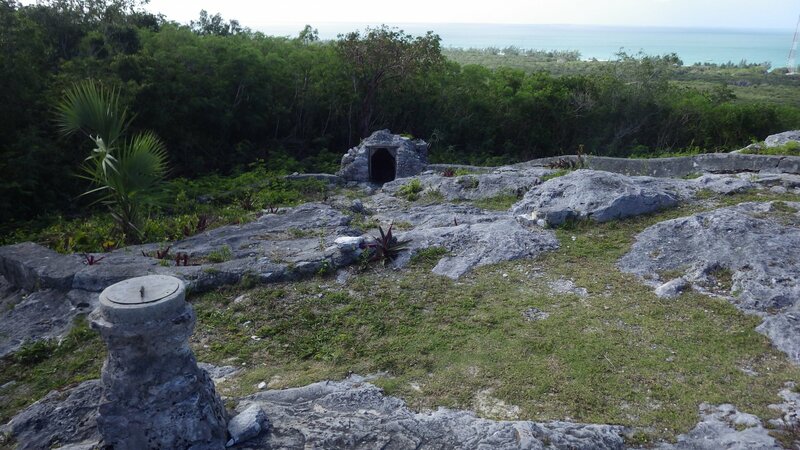 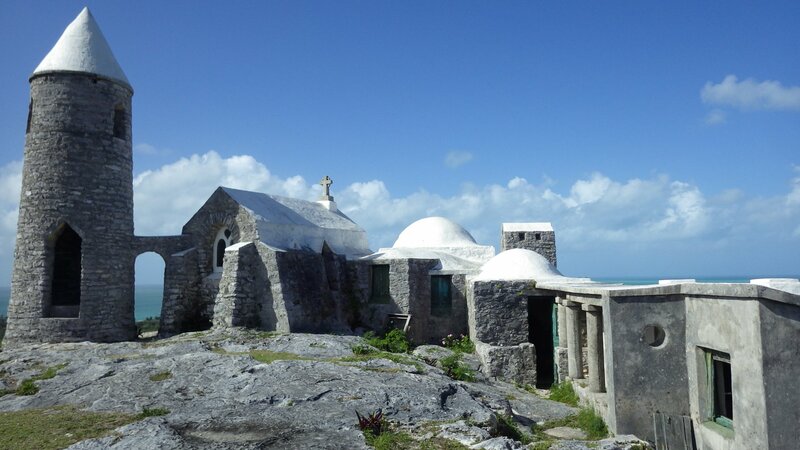 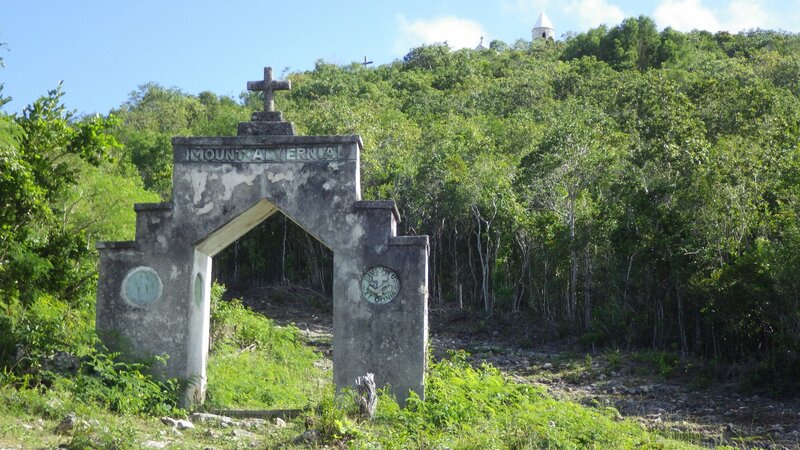 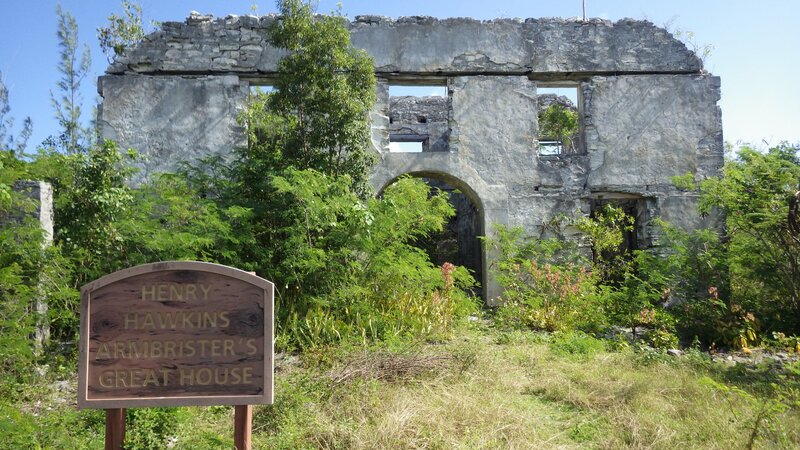 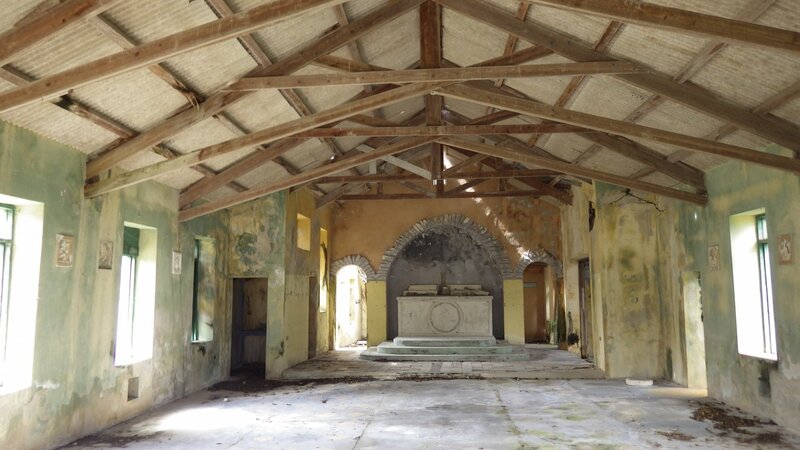 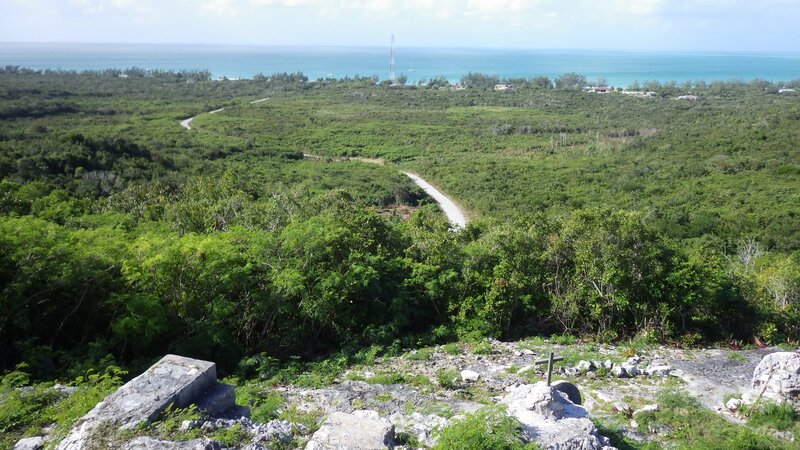 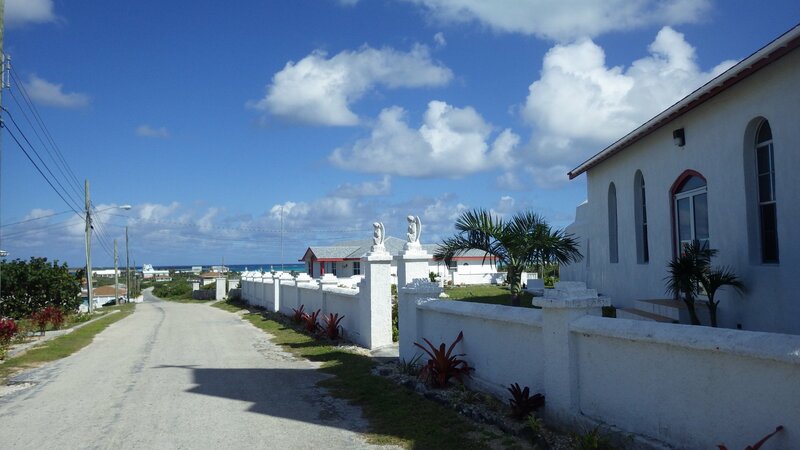 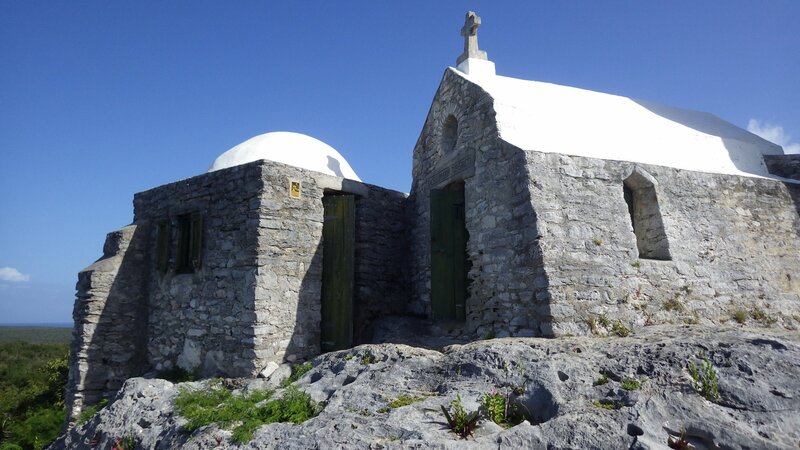 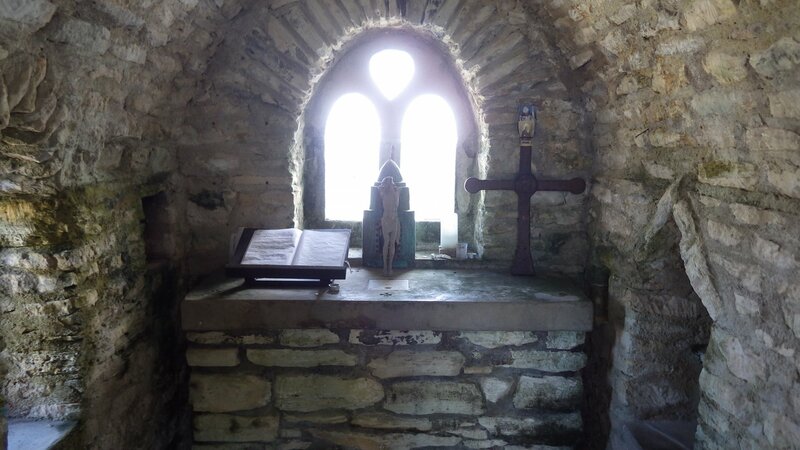 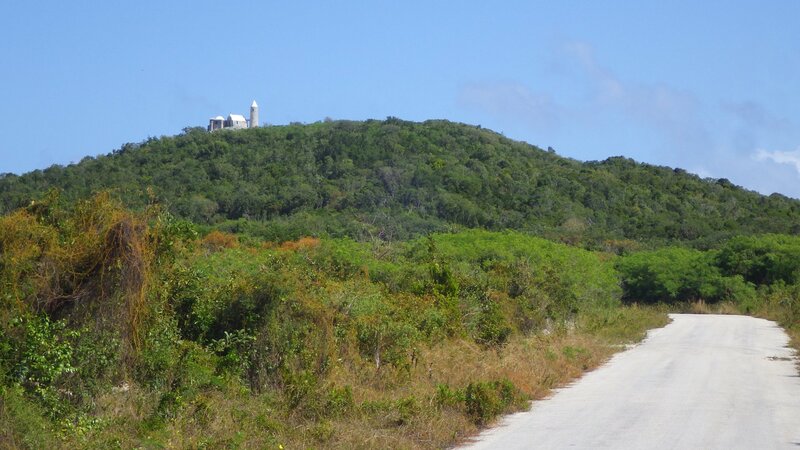 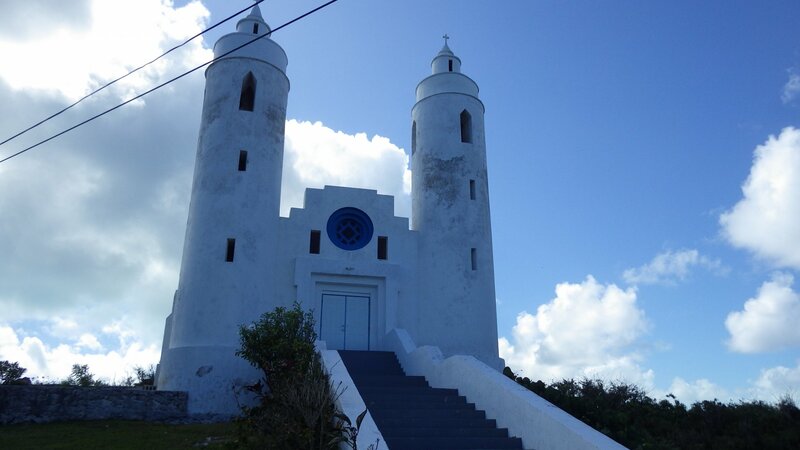 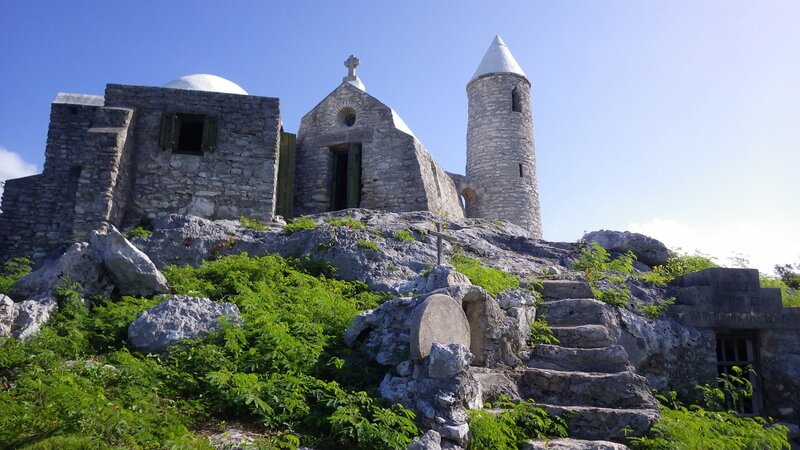 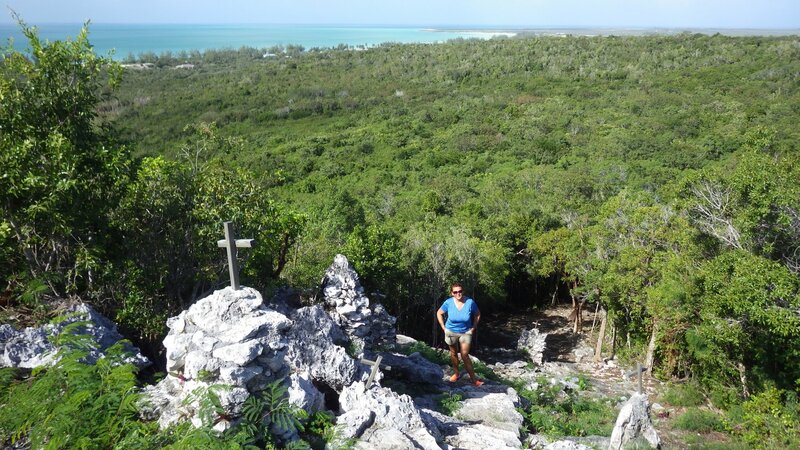 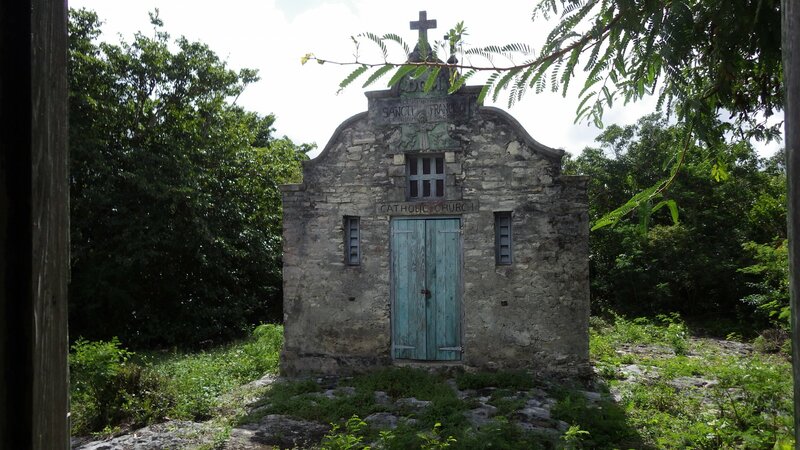 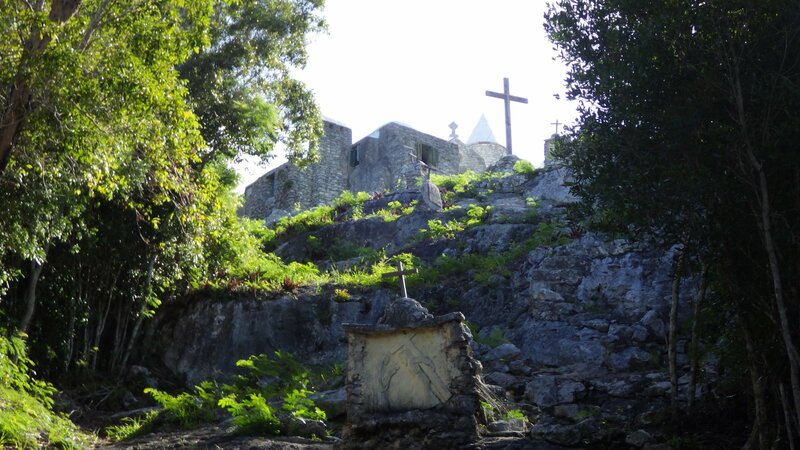 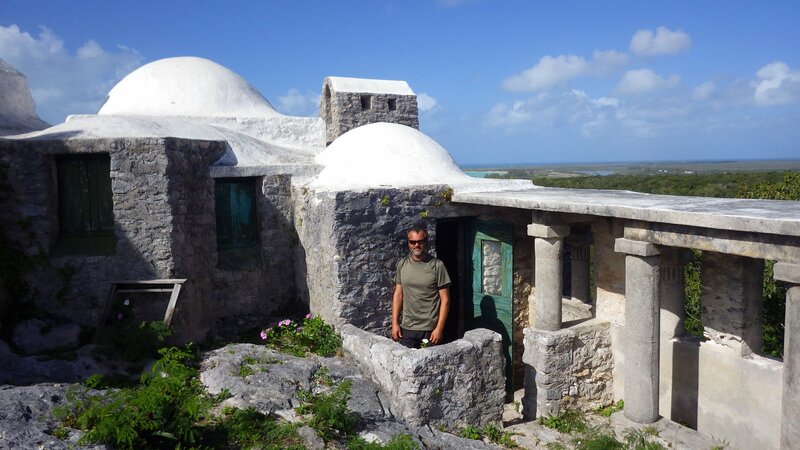 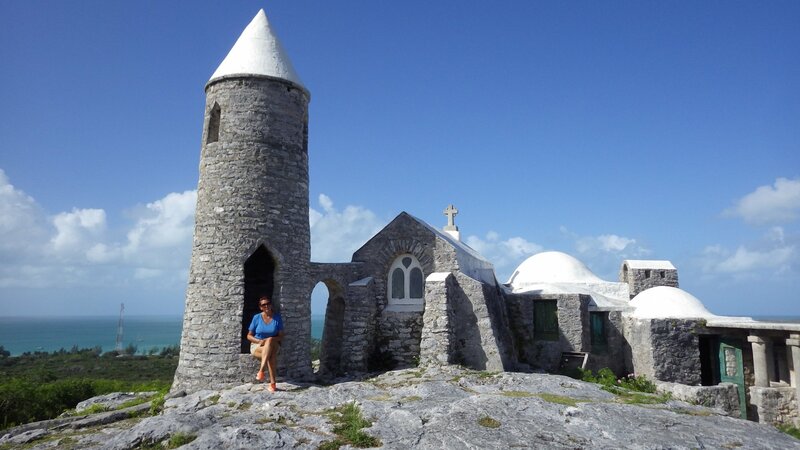 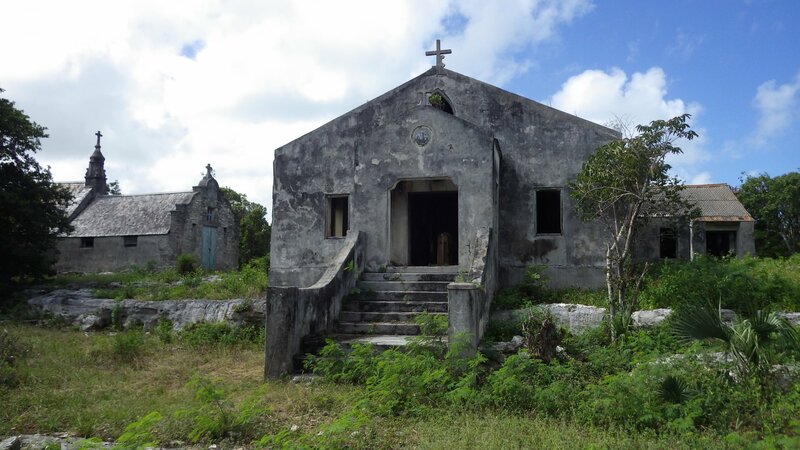 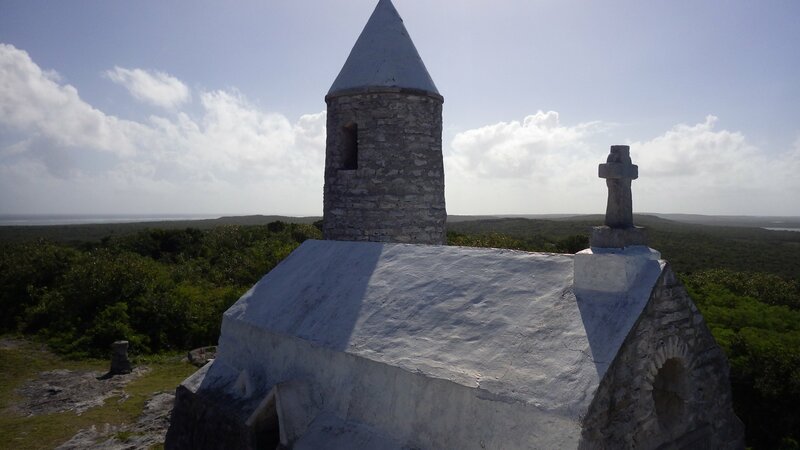 Also climbed Alvernia, the highest mountain in the Bahamas to visit the Hermitage, a miniature replica of the monastery. 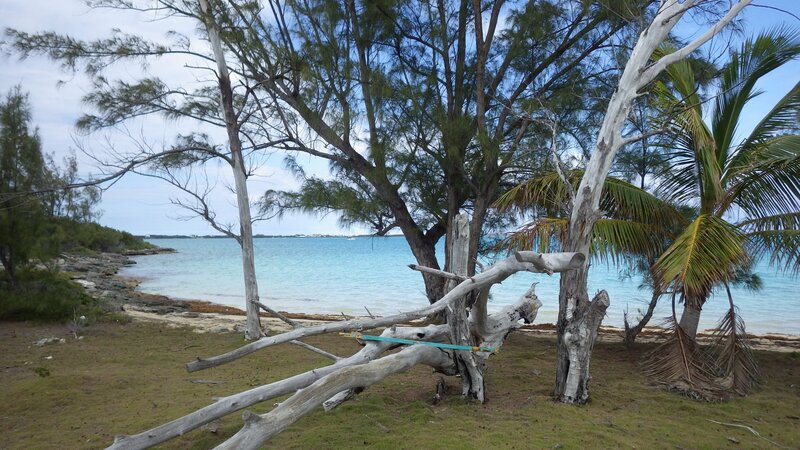 Interesting and peaceful place. 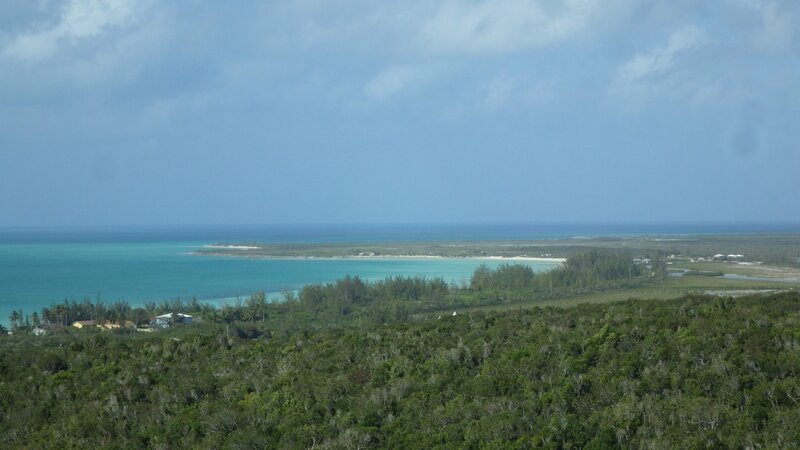 The 360 degrees views from the mountain top are great. 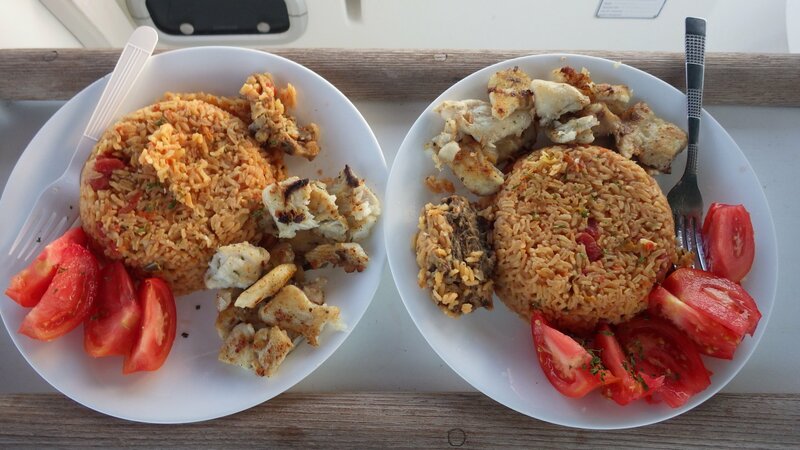 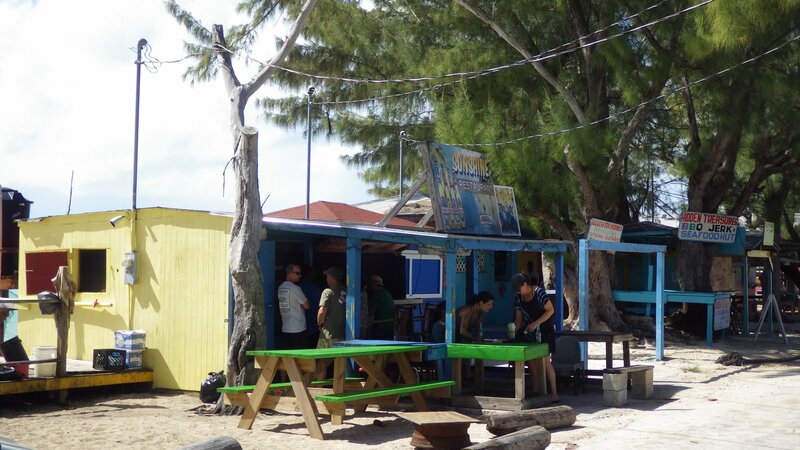 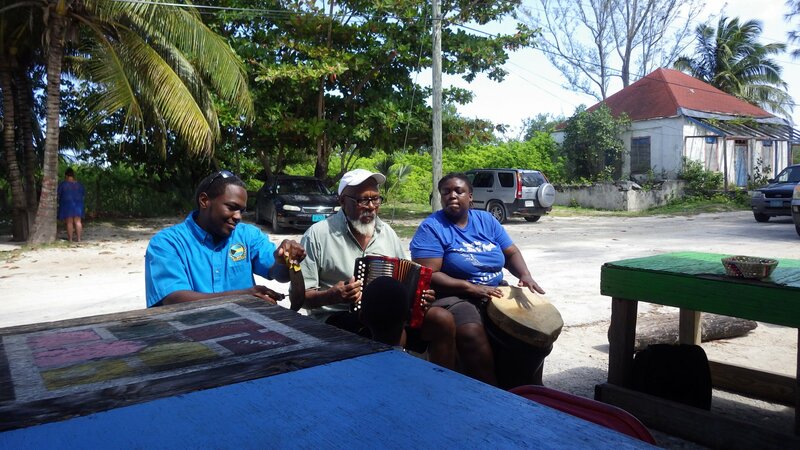 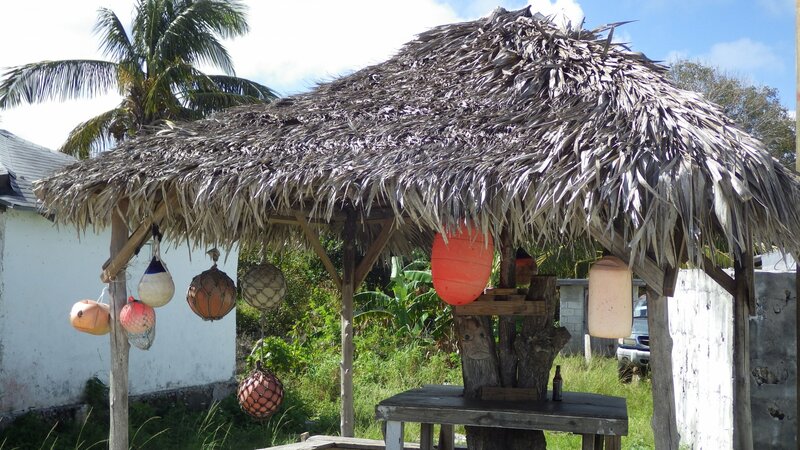 Had a chance to try cracked lobster at the beach restaurant/hut, accompanied by friendly conversations with visiting tourists and live traditional island music Rake n' Scrape. 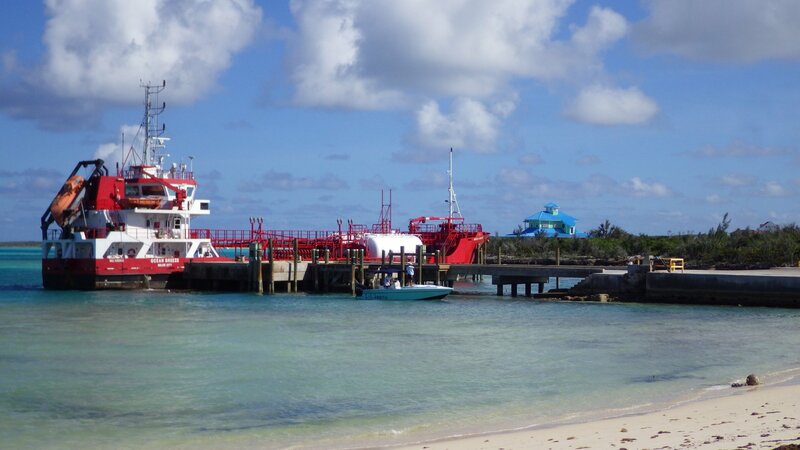 After leaving Cat Island, we had a short stop on the Little San Salvador, where cruiseships bring their tourists for a day of fun. 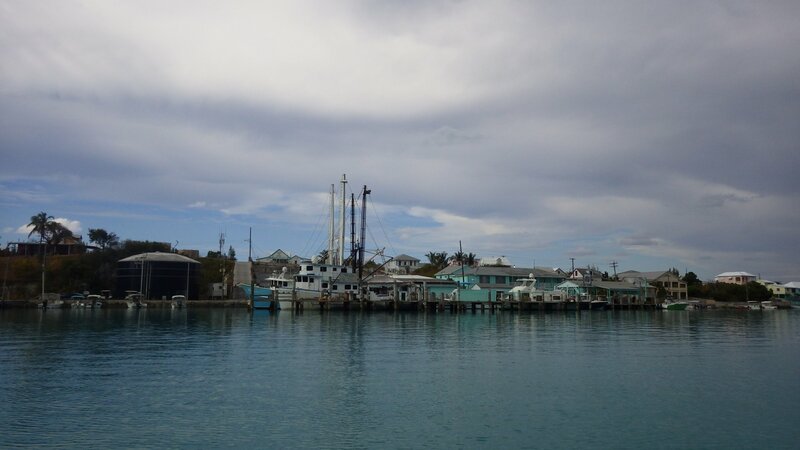 First, we had a quick Davis Harbour Marina to fill up water and get some fuel. 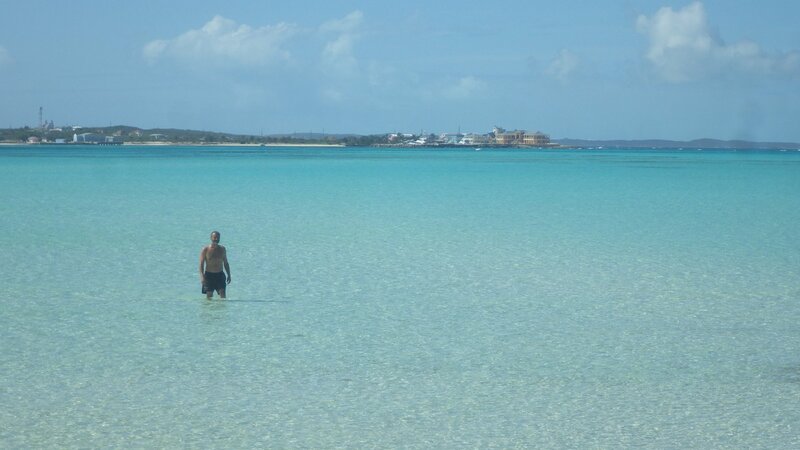 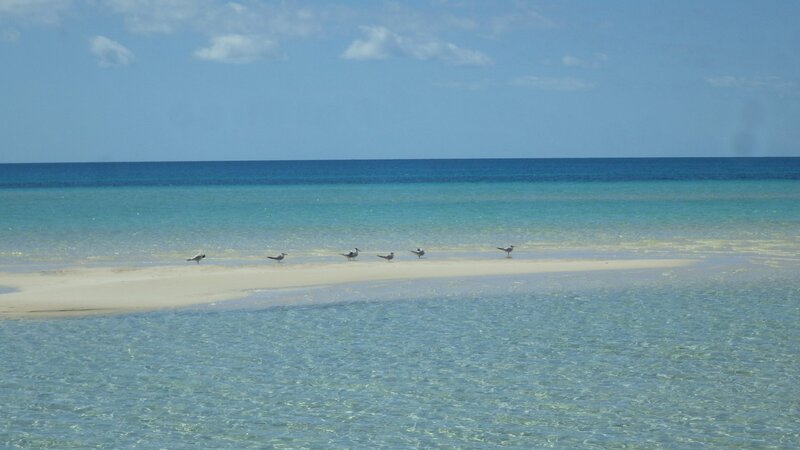 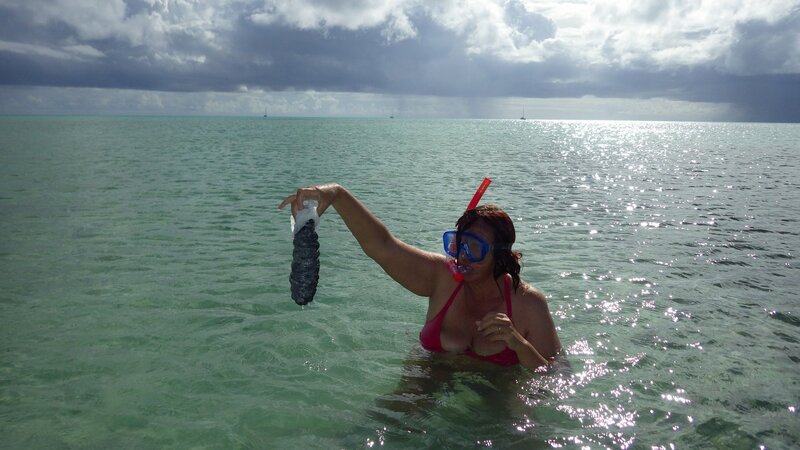 The sand bar at the entrance is very shallow, but we barely made over it there and back. 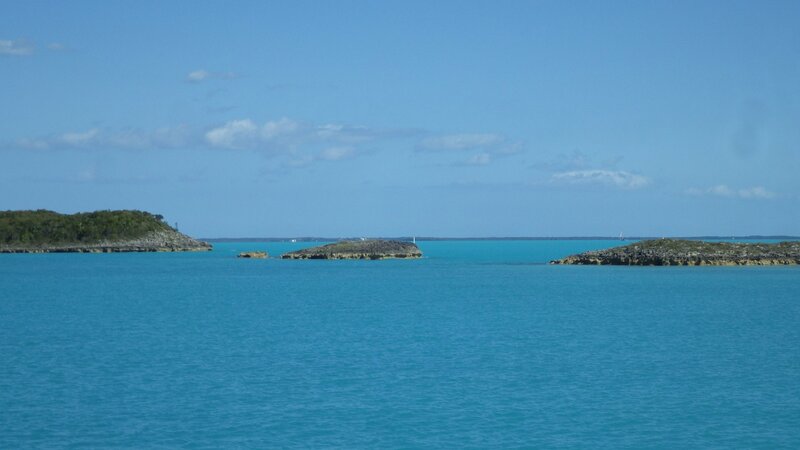 Rock Sound is a large bay, protected all around. 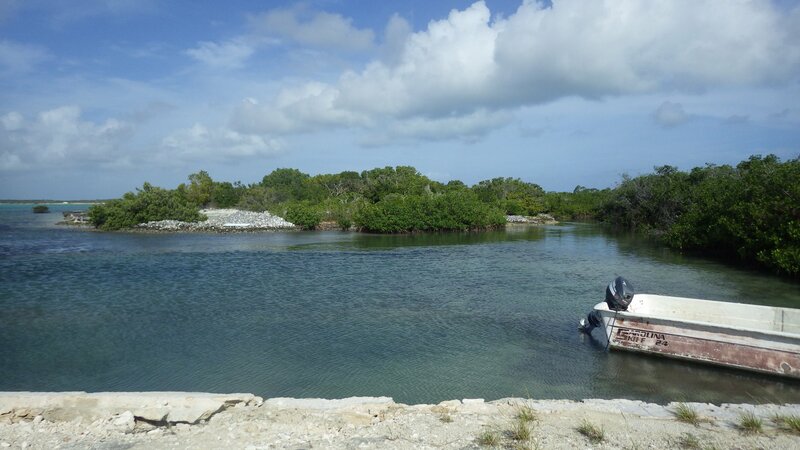 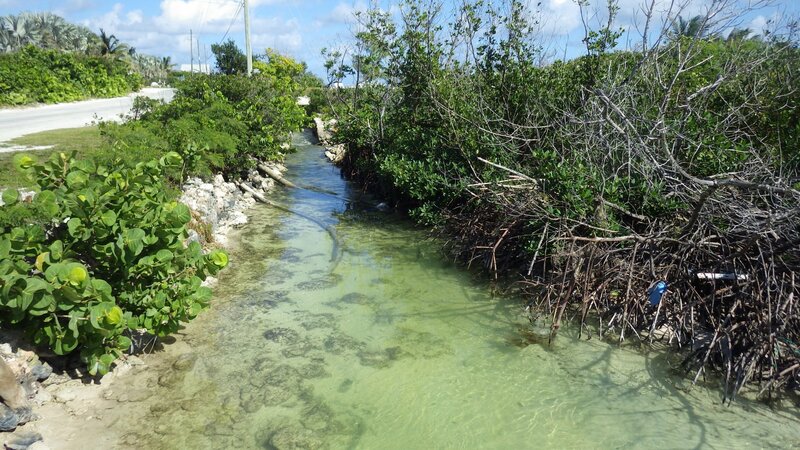 There is an interesting Blue Ocean Hole on the town outskirts, with brackish water and plenty of tropical fish. 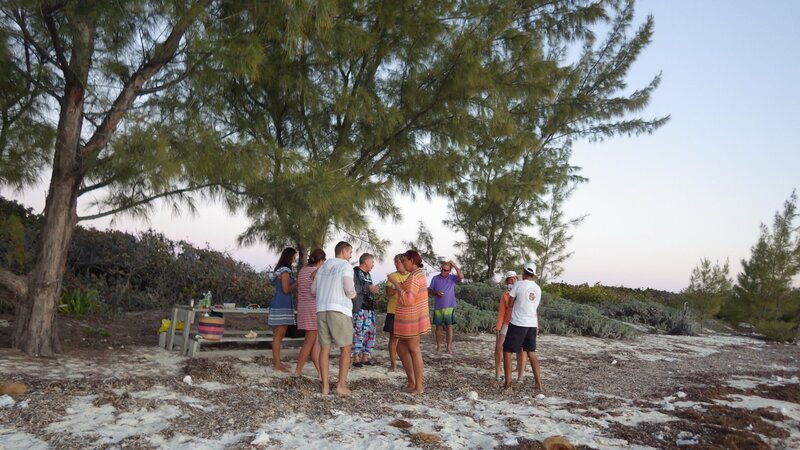 Had cruiser's potluck party in the park with busy conversations. 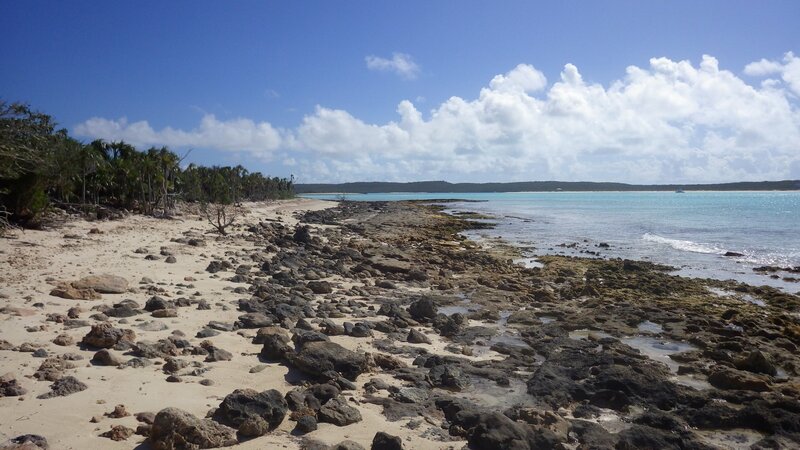 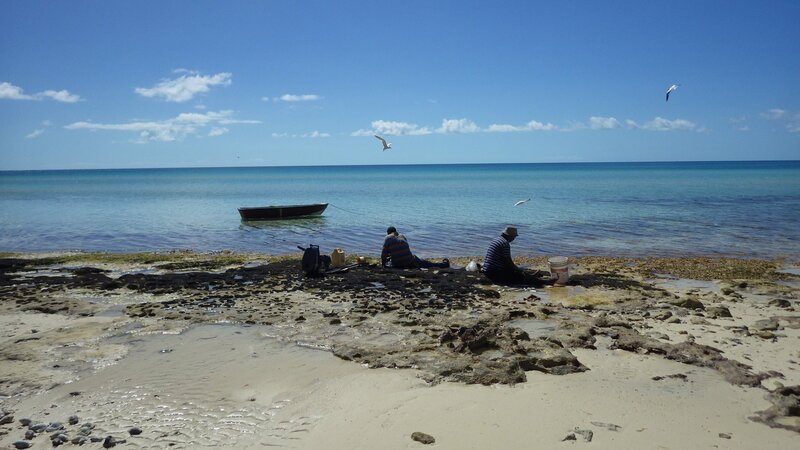 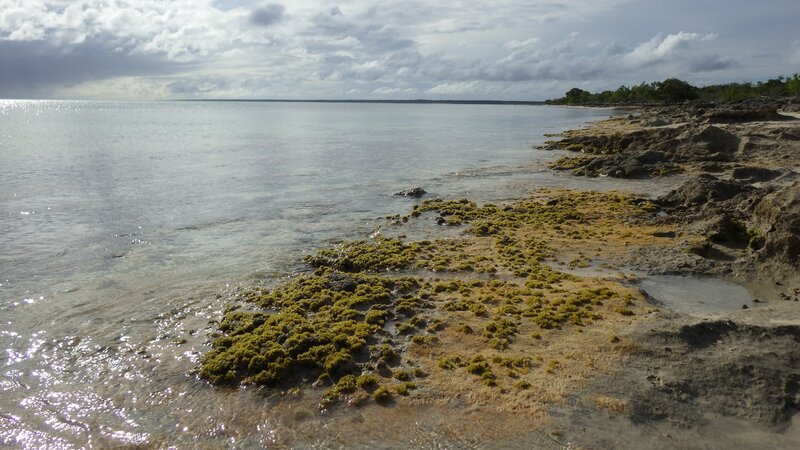 For a change of scenery, we spent a day along on unnamed rocky beach NW of Rock Sound. 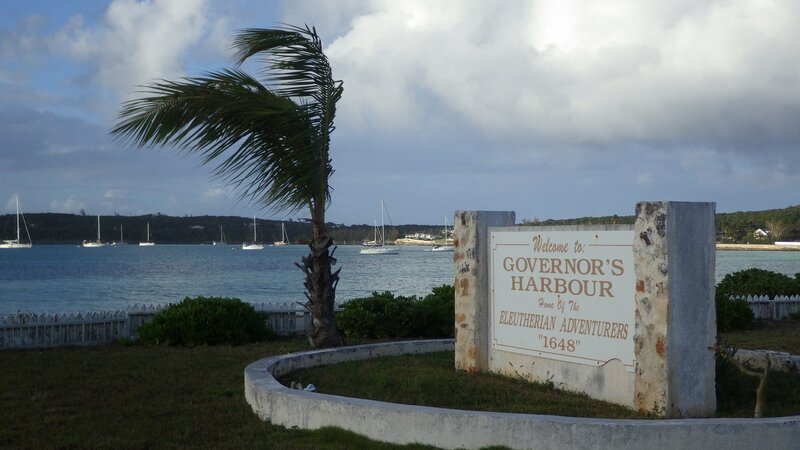 Then we sailed to Governors Harbour, the center of activity on the island. 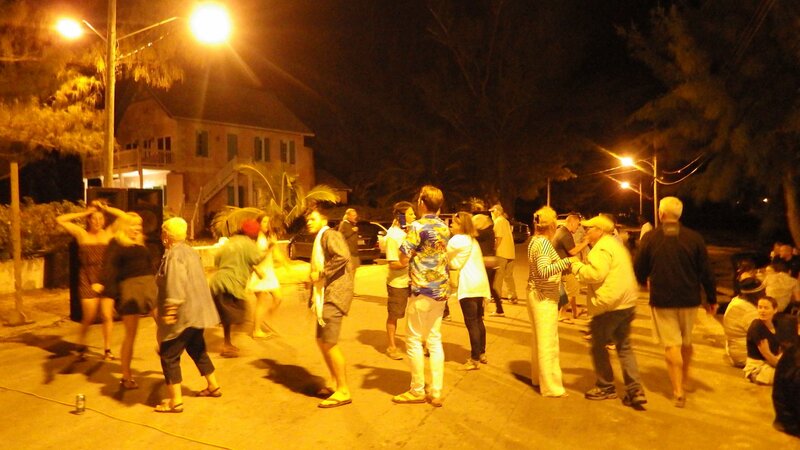 Fish Fry Night party there was fun. 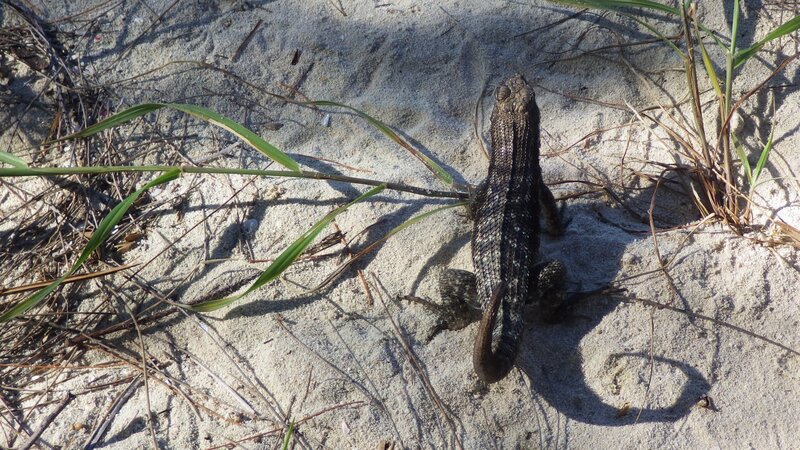 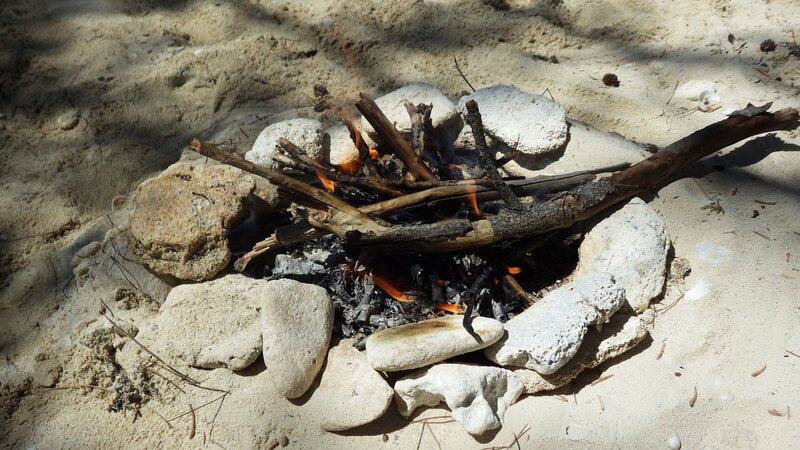 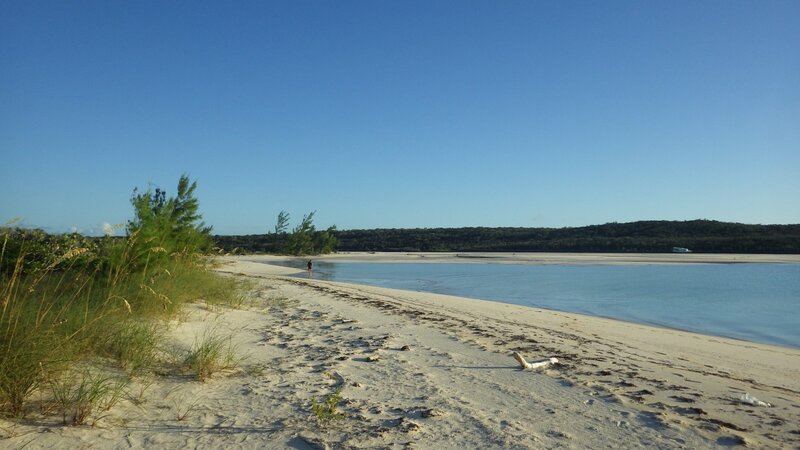 We liked the nice long beach along the Alabaster Bay, although it had quite noisy party on weekend. 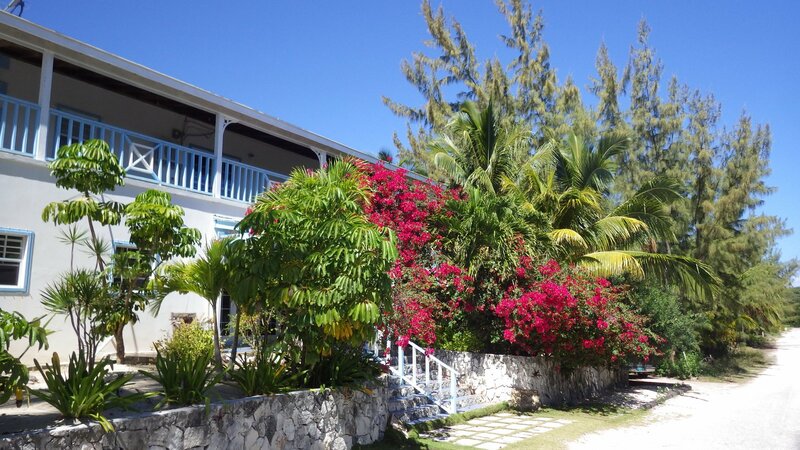 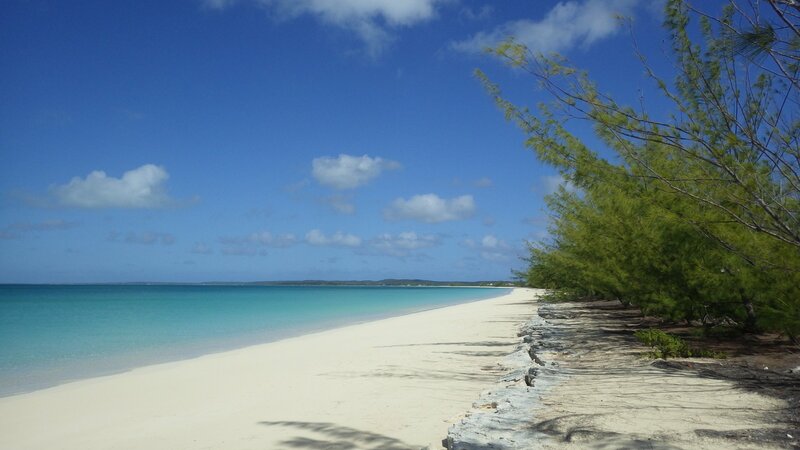 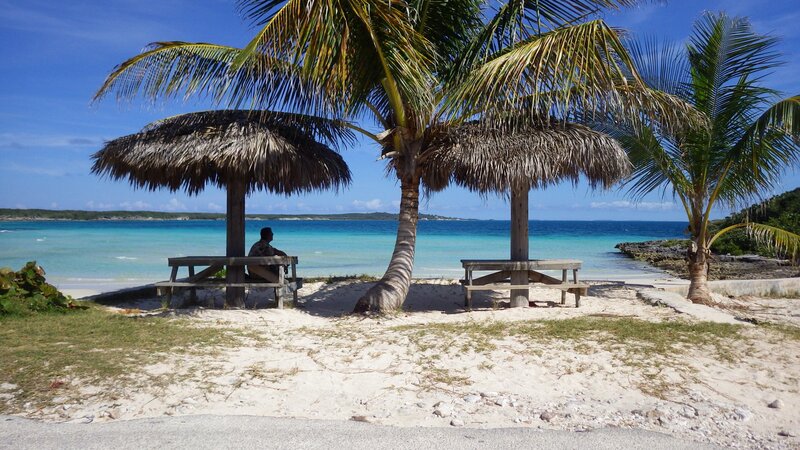 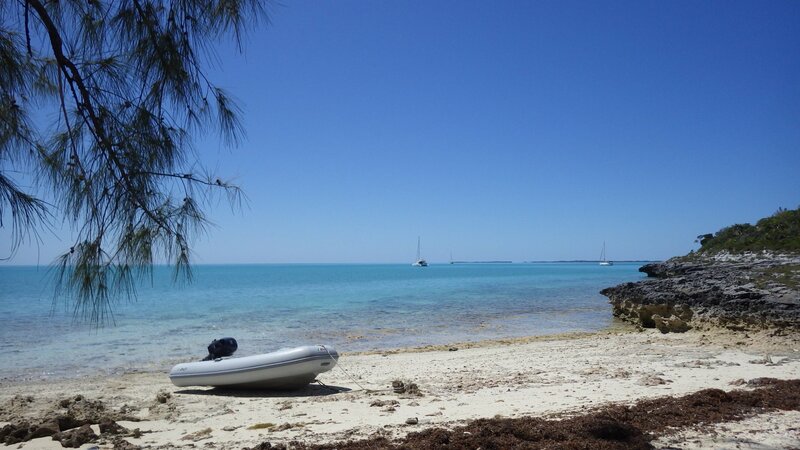 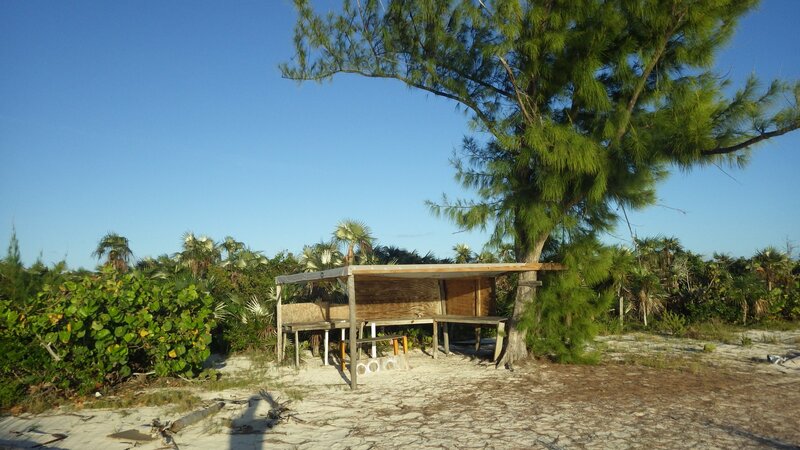 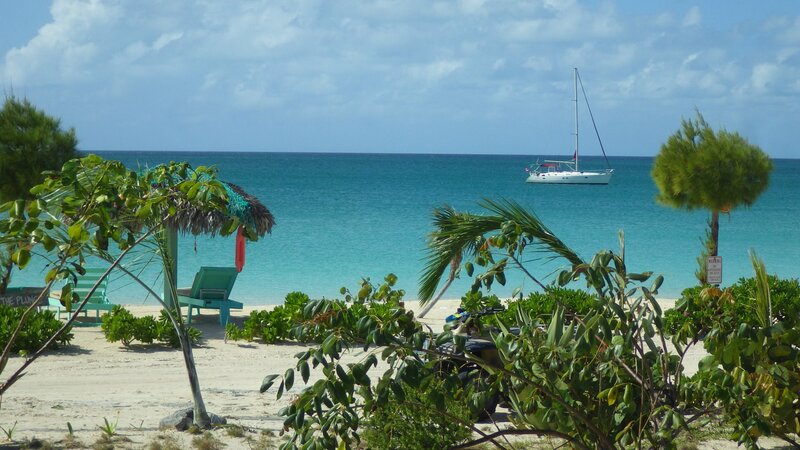 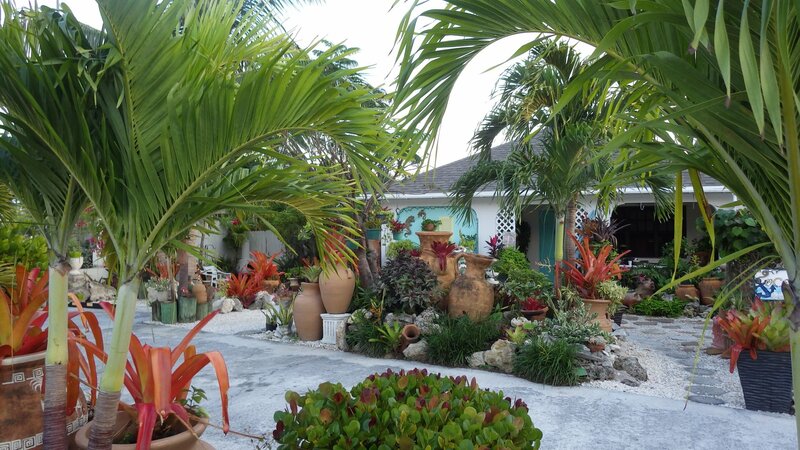 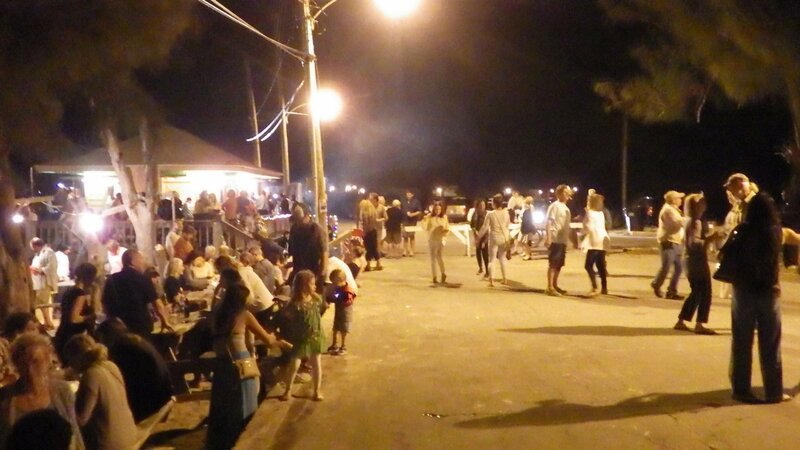 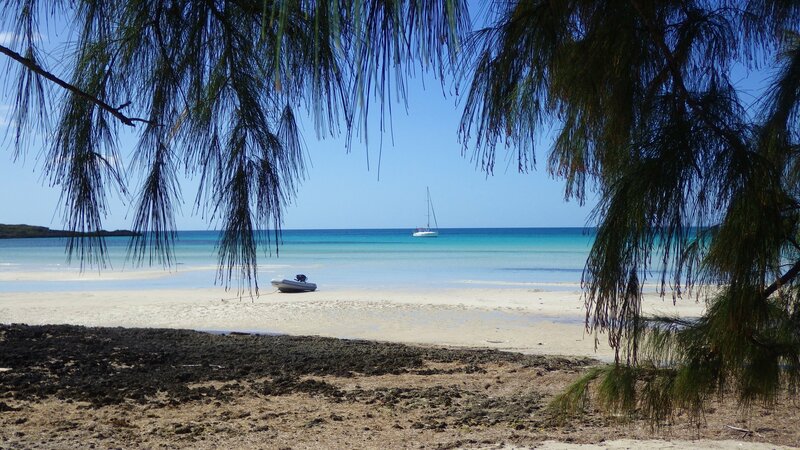 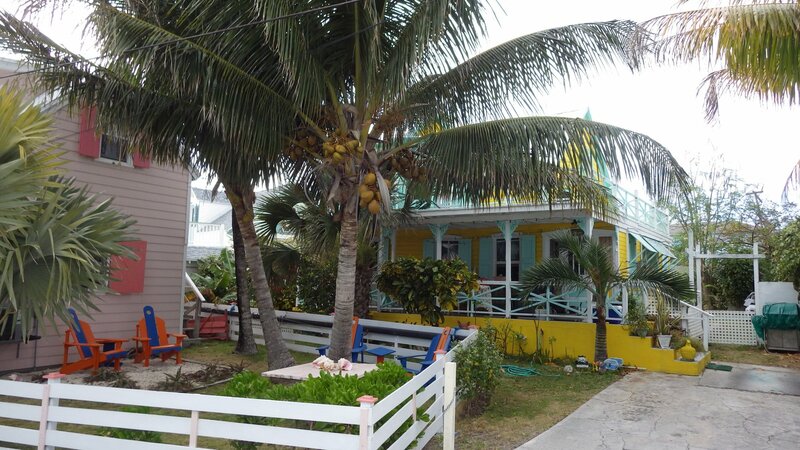 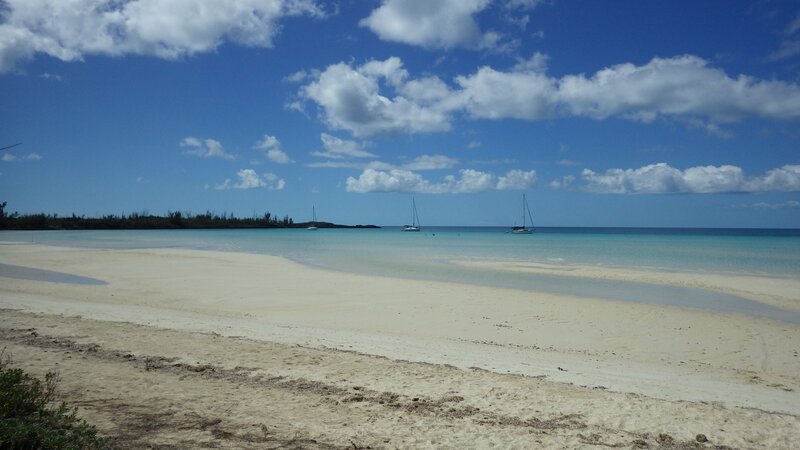 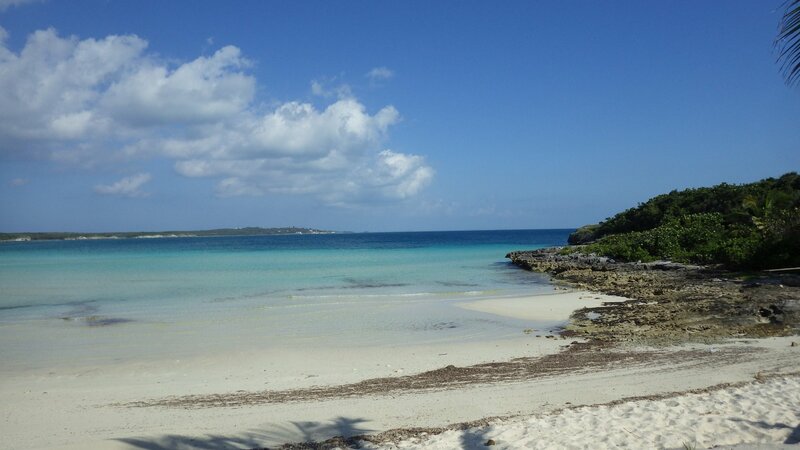 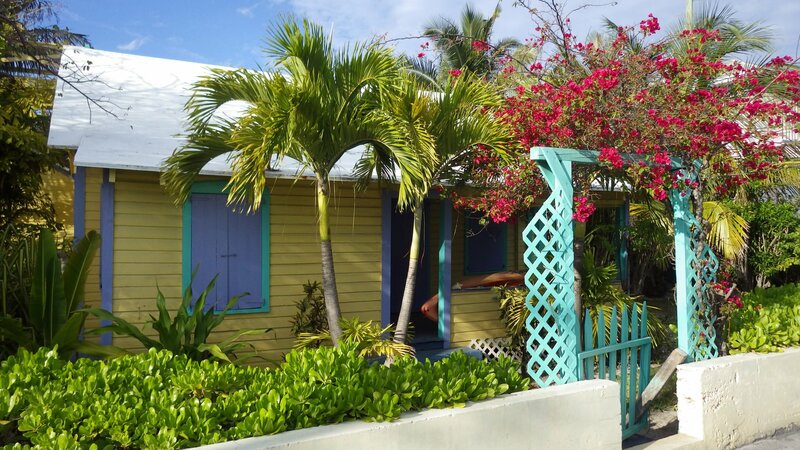 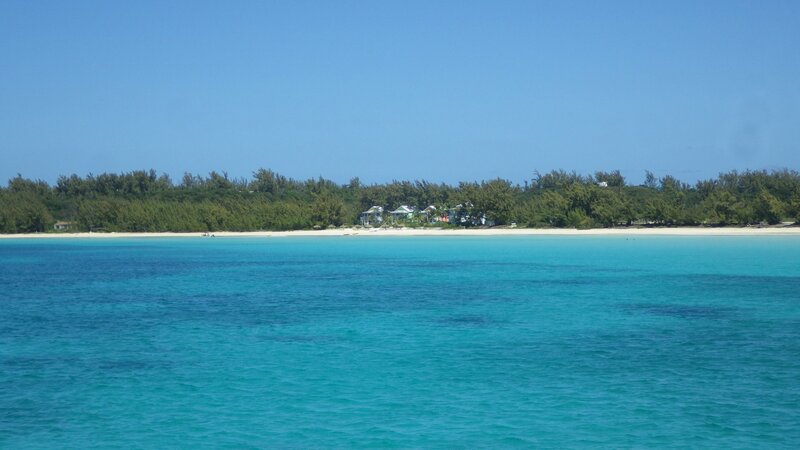 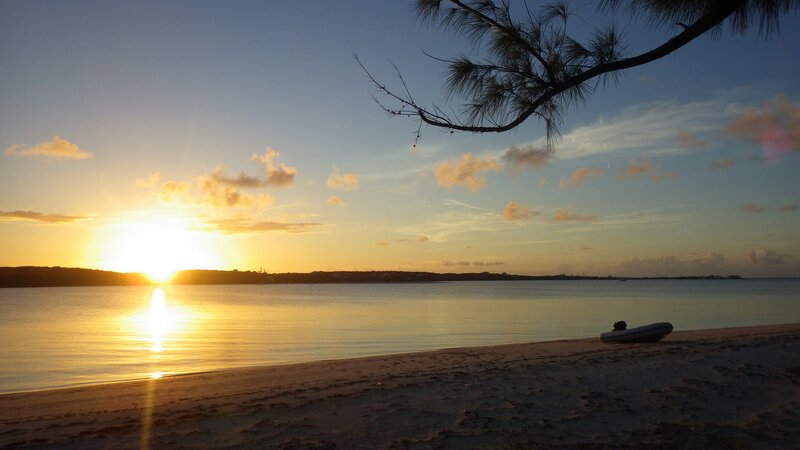 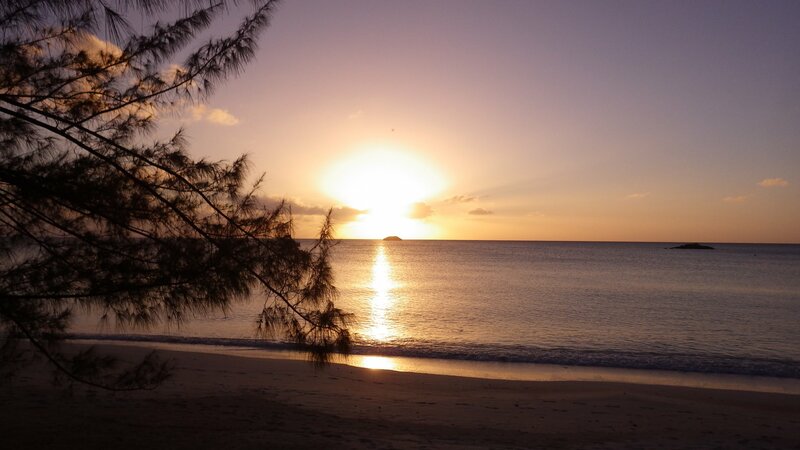 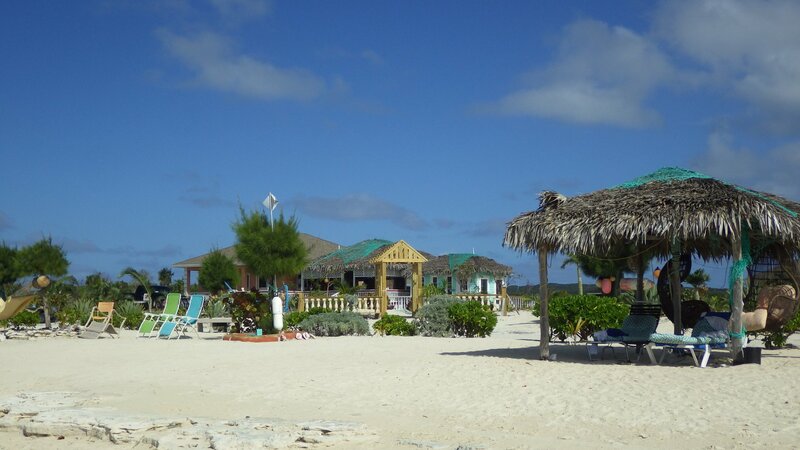 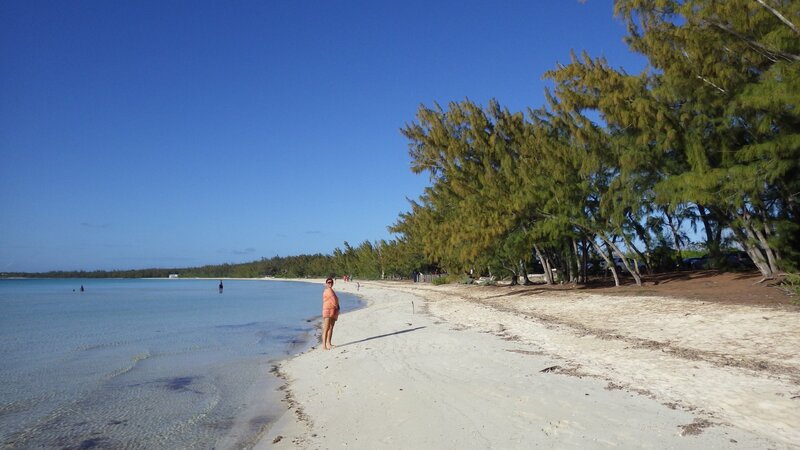 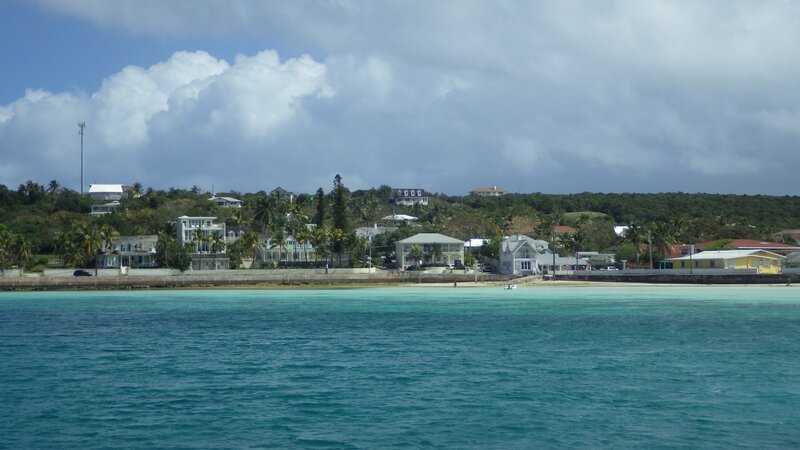 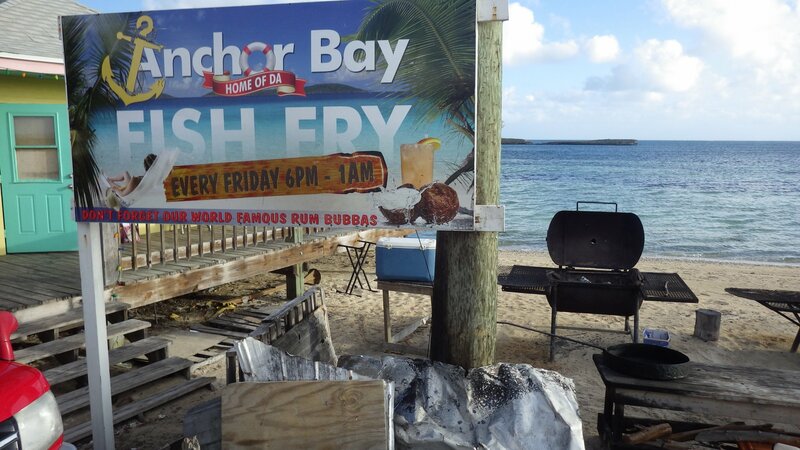 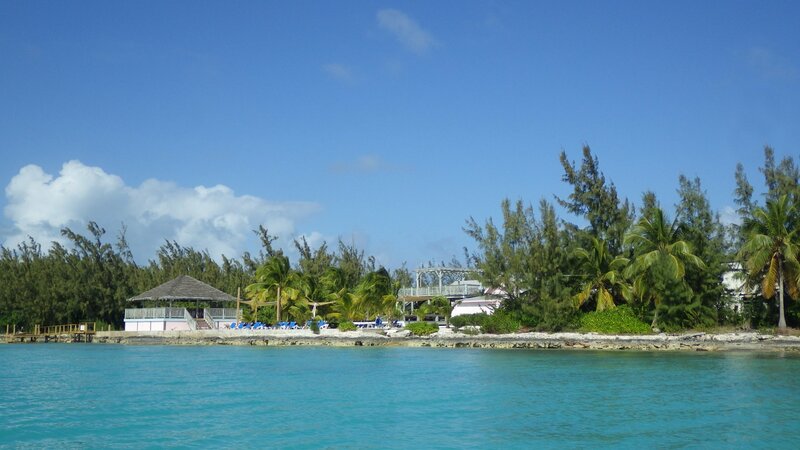 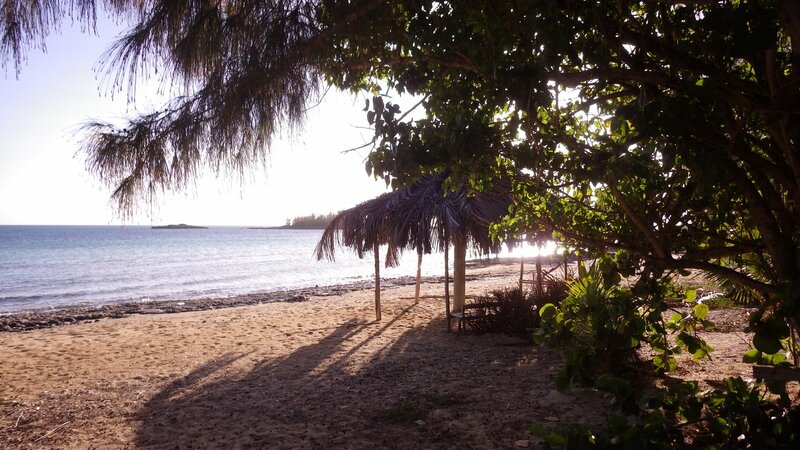 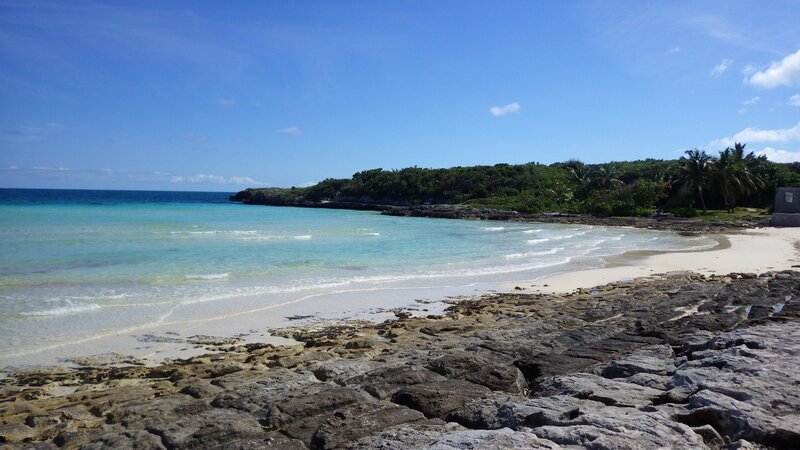 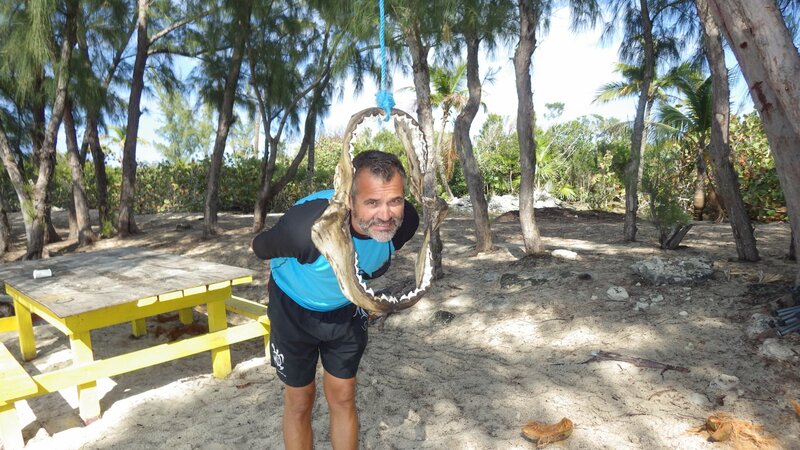 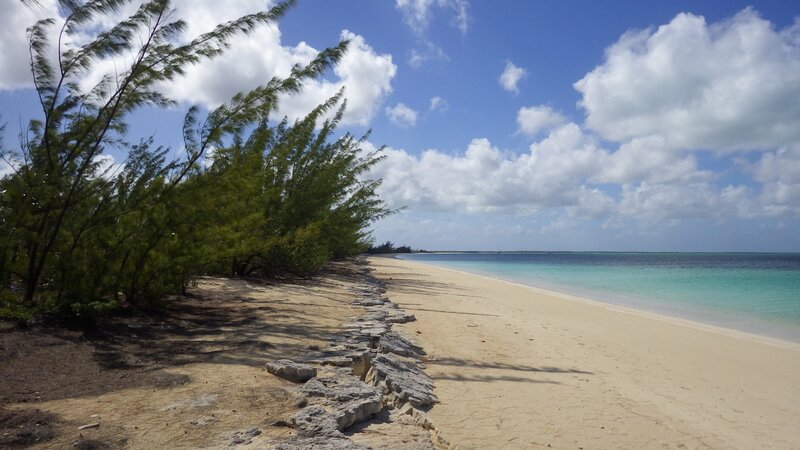 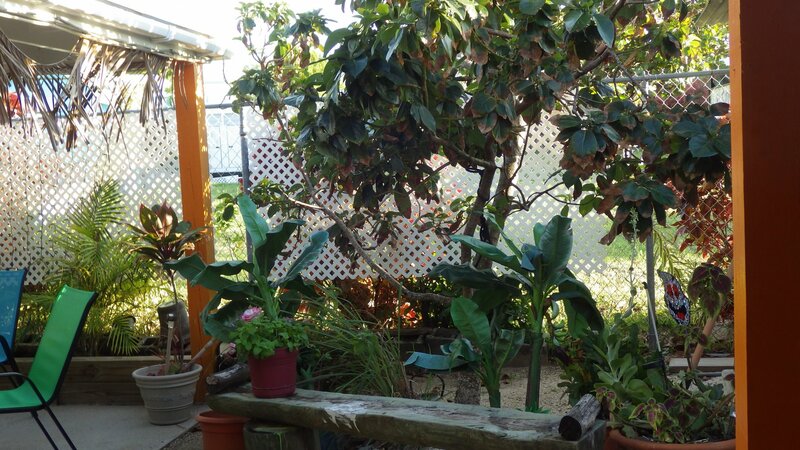 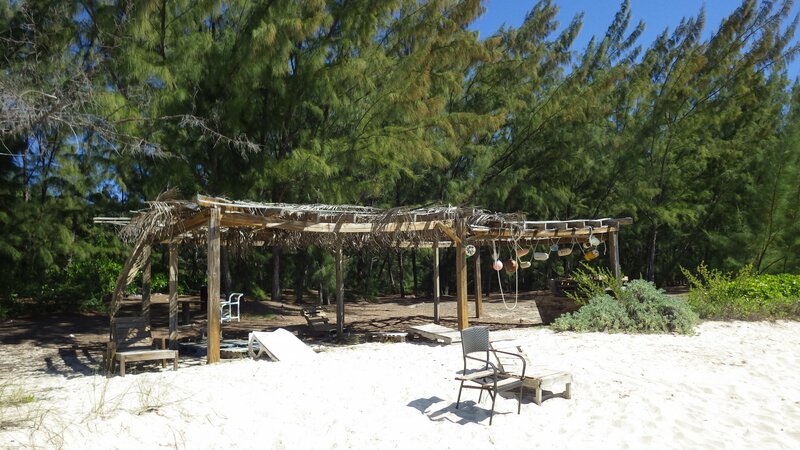 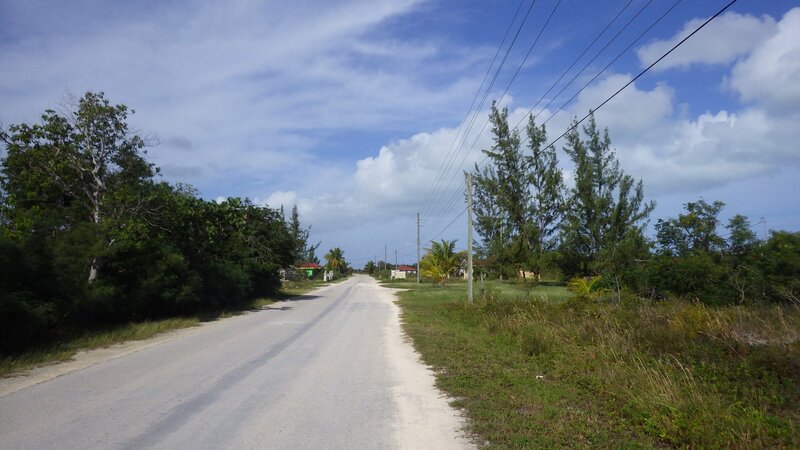 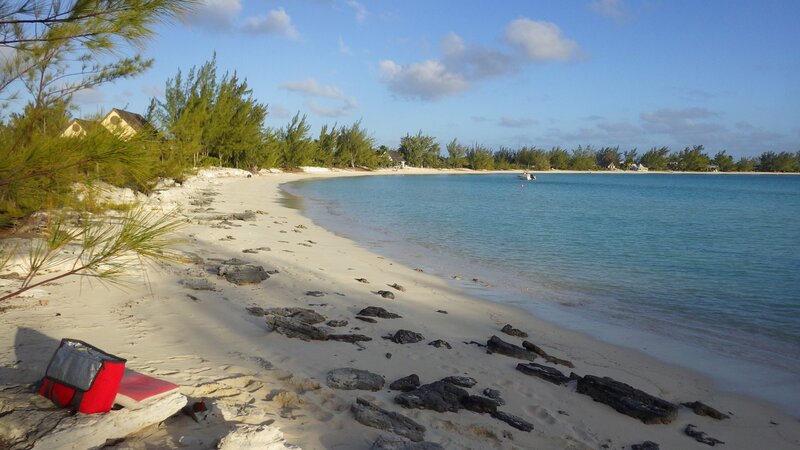 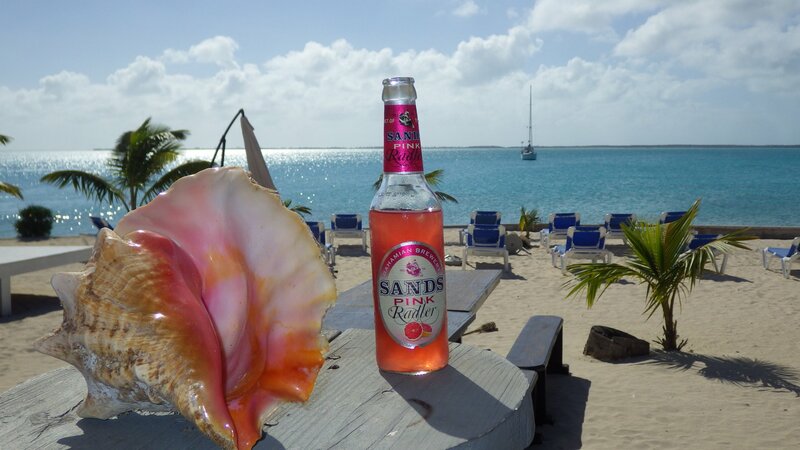 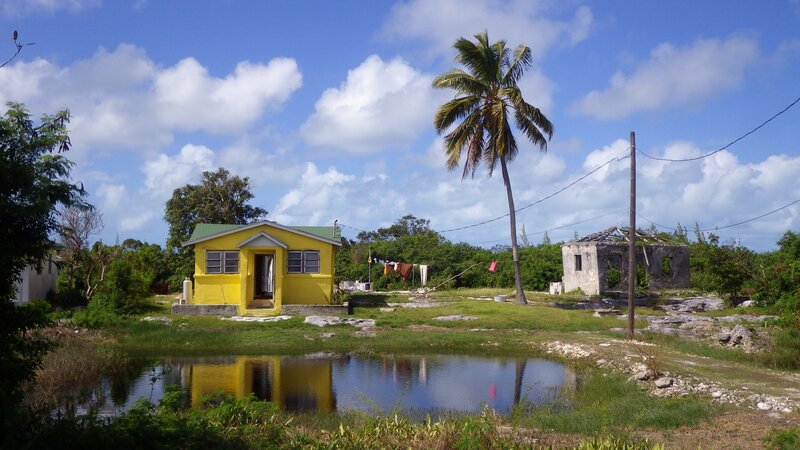 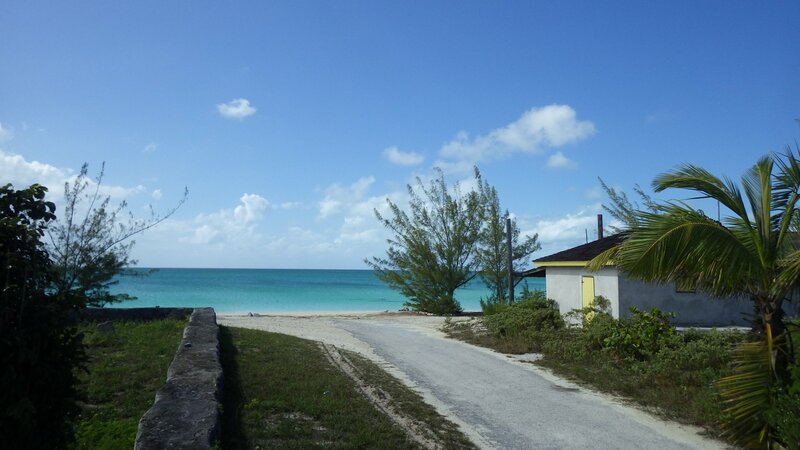 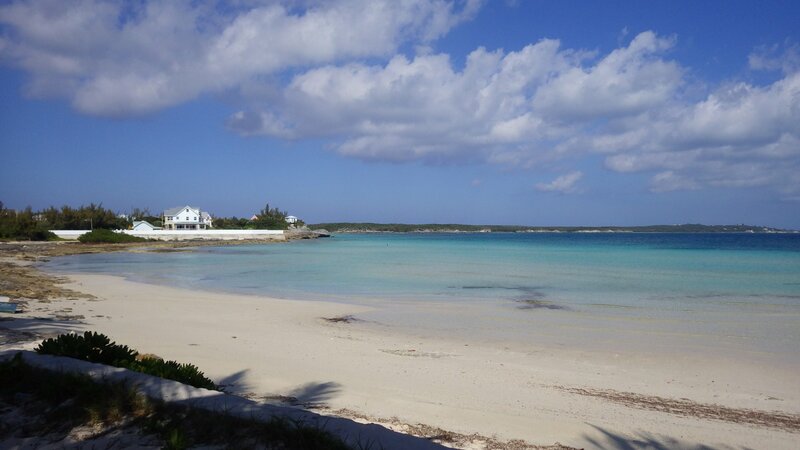 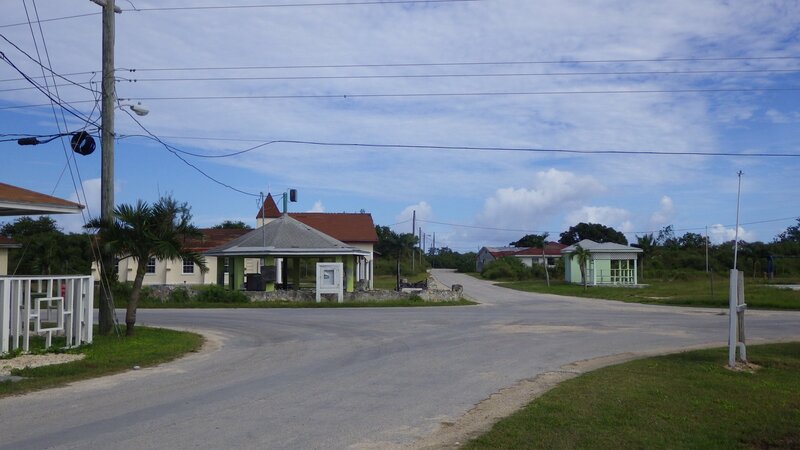 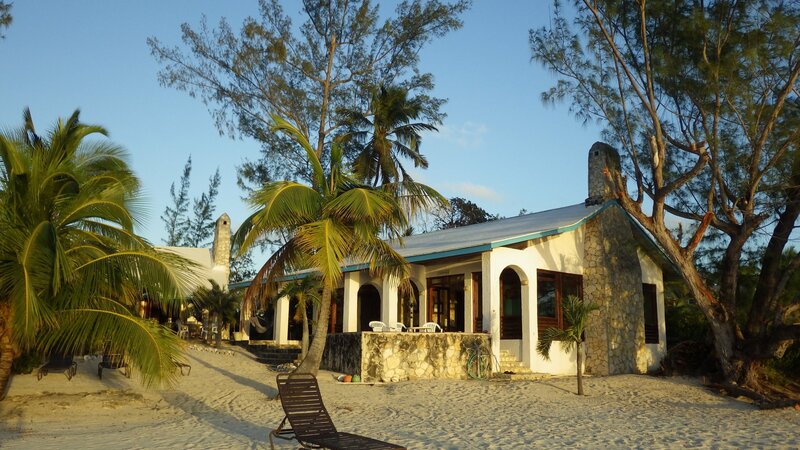 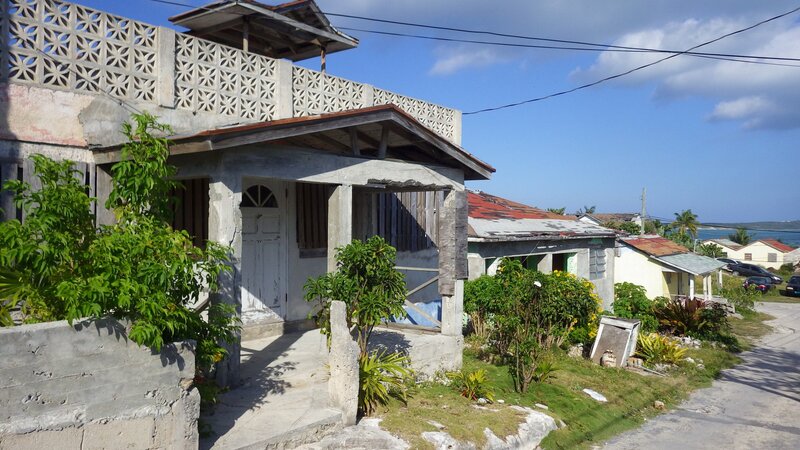 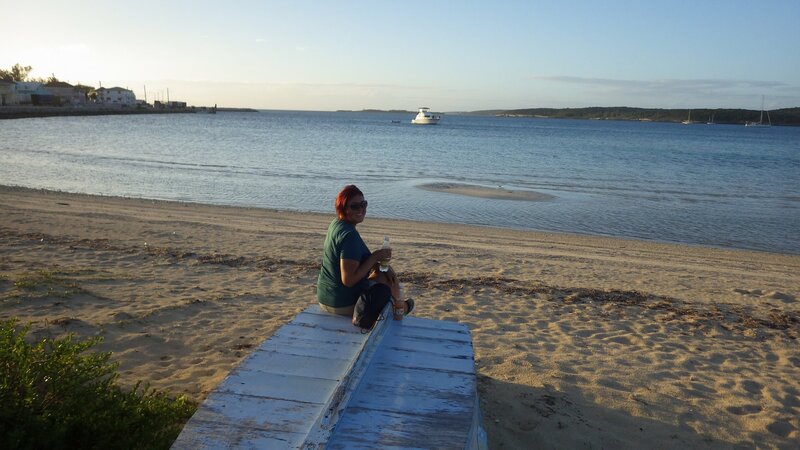 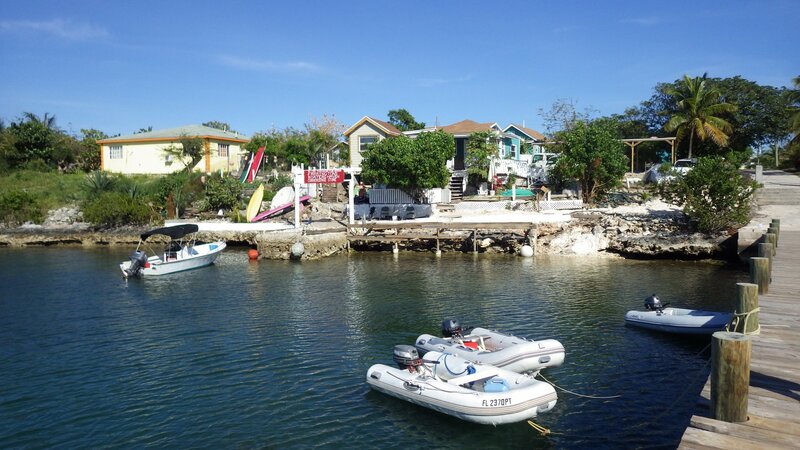 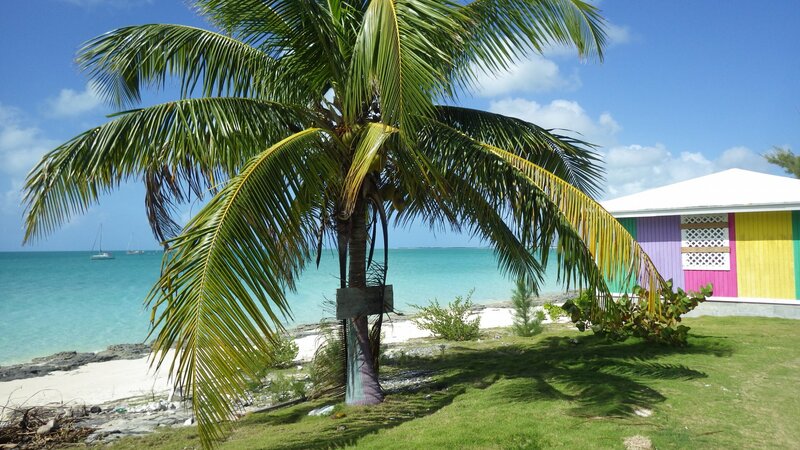 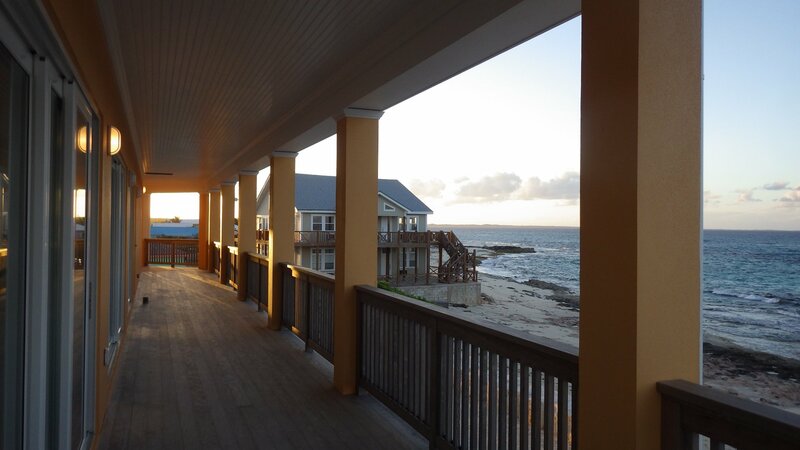 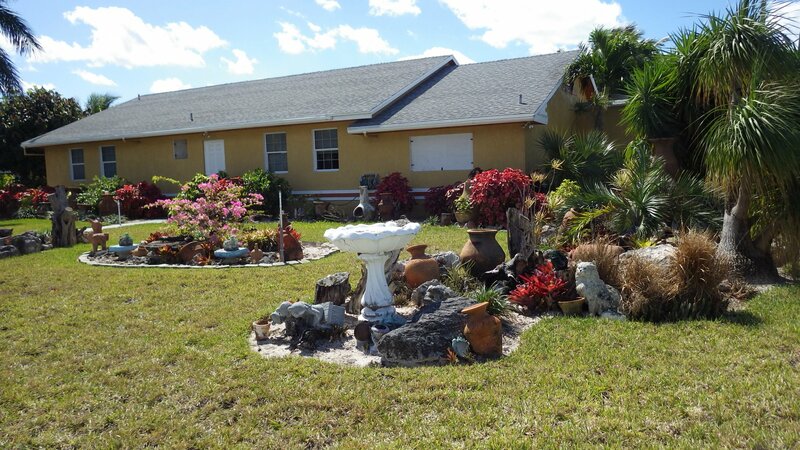 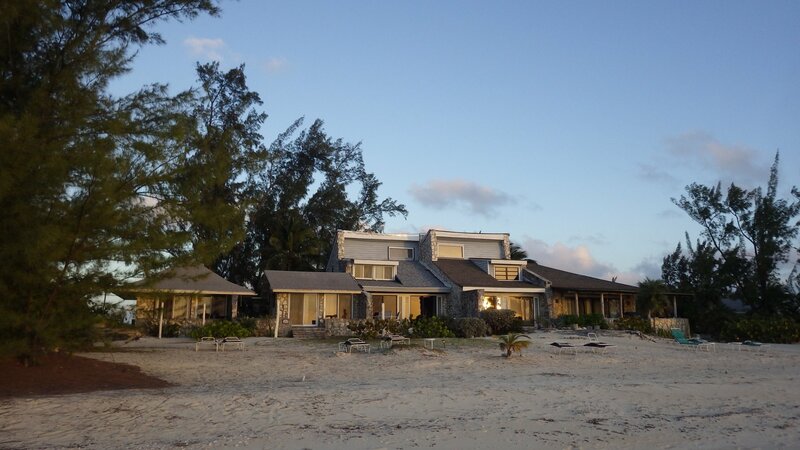 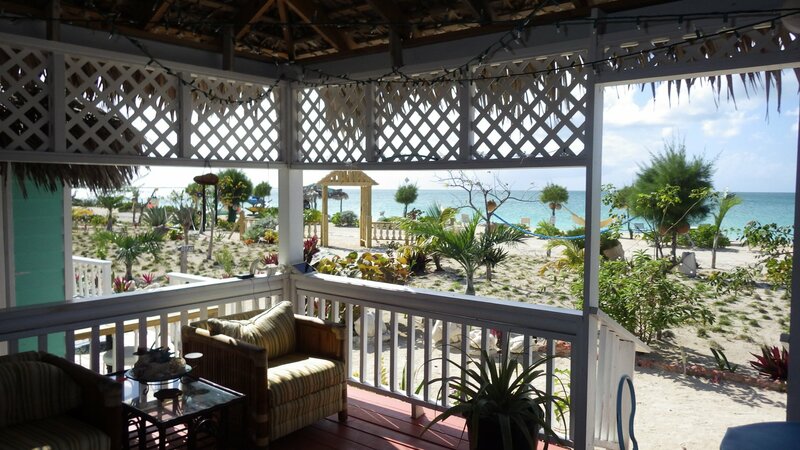 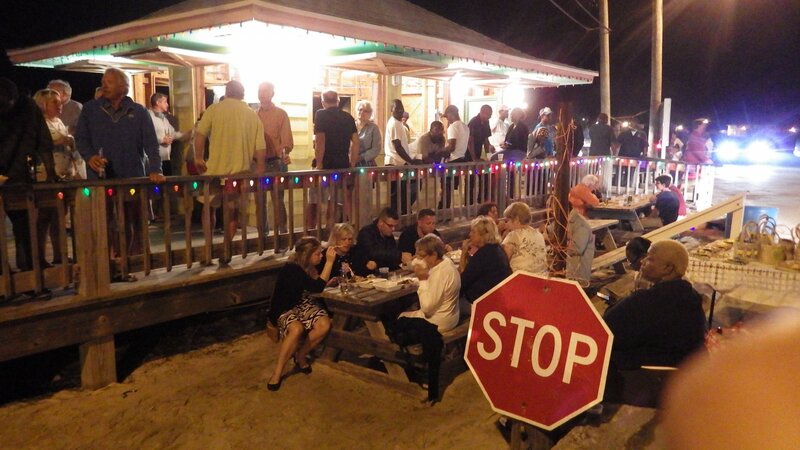 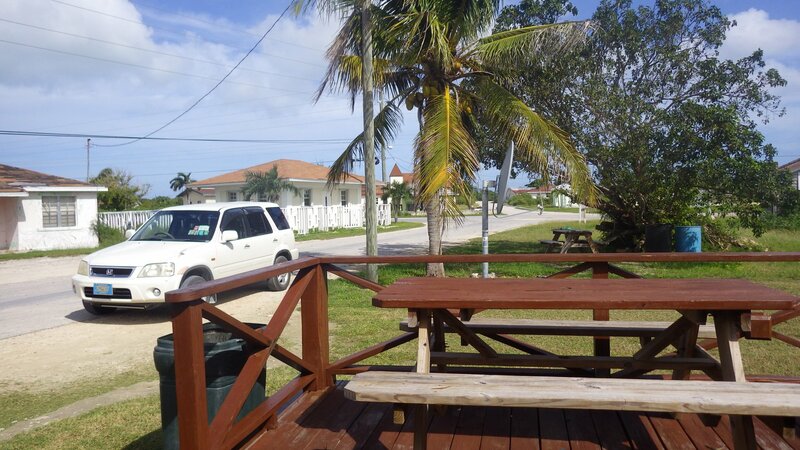 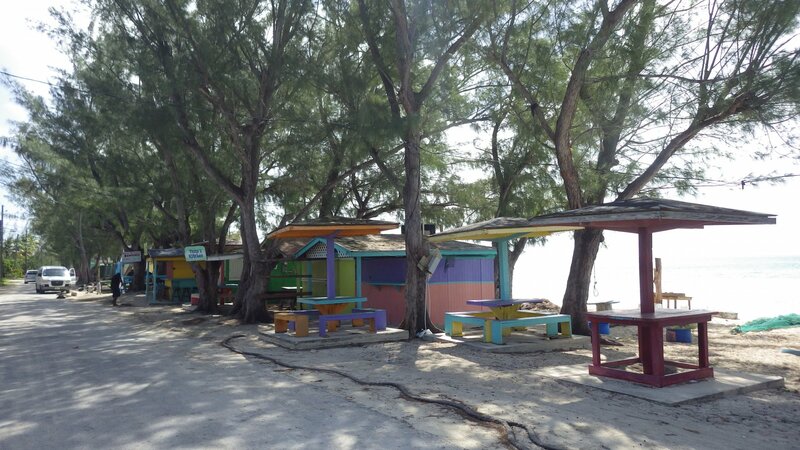 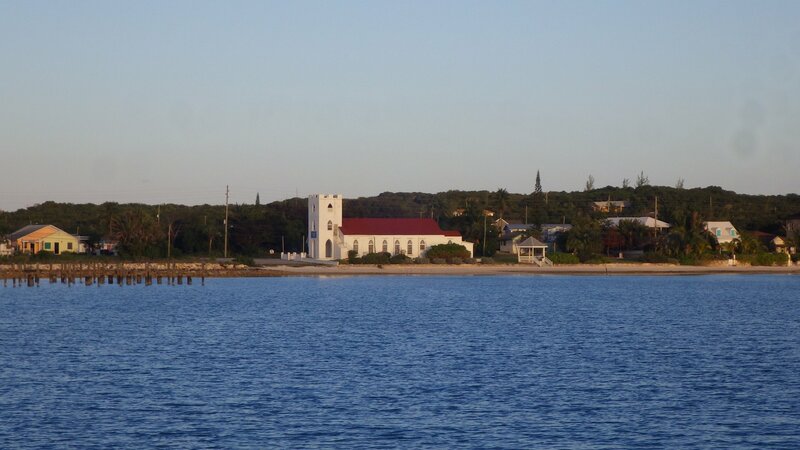 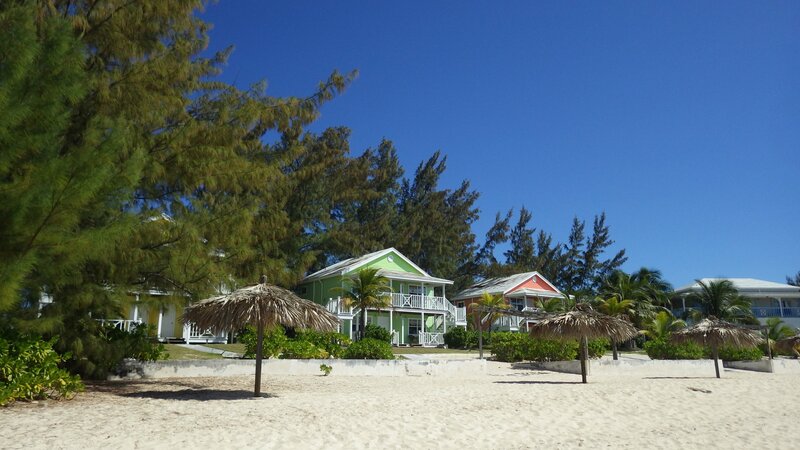 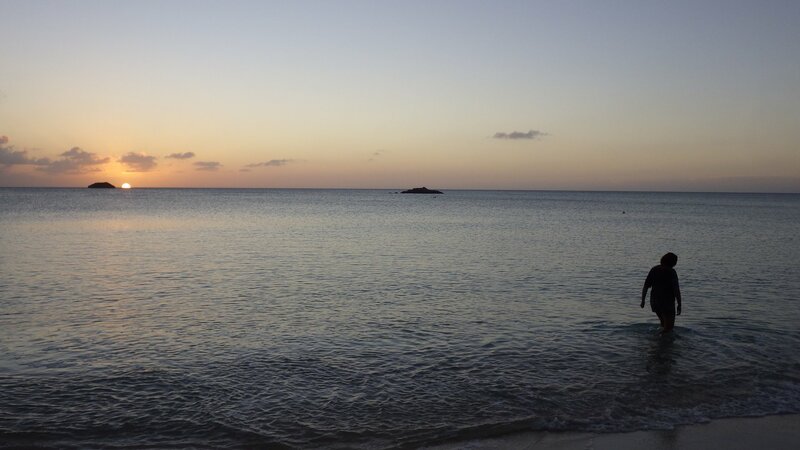 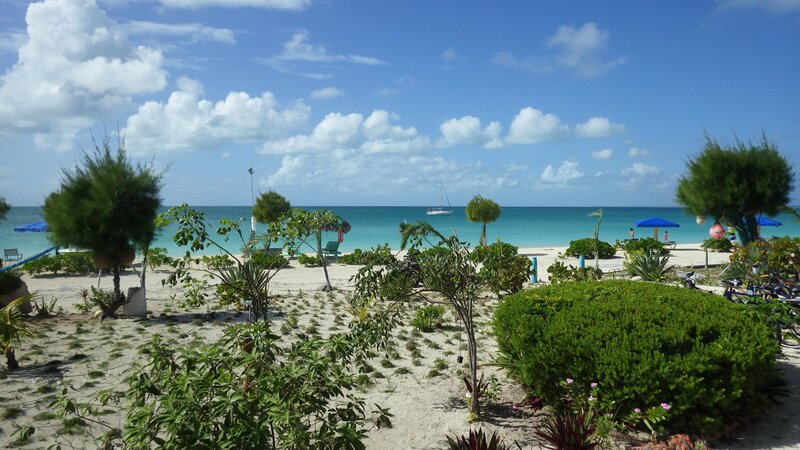 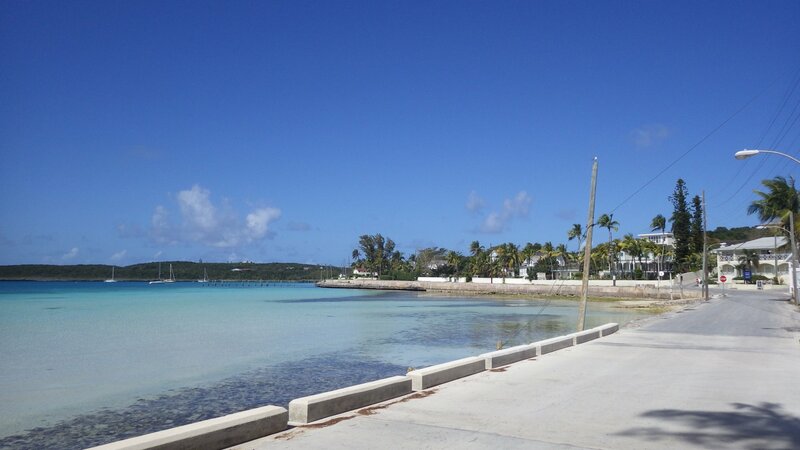 Then a short stopover at Rainbow Bay � a small vacationing community. 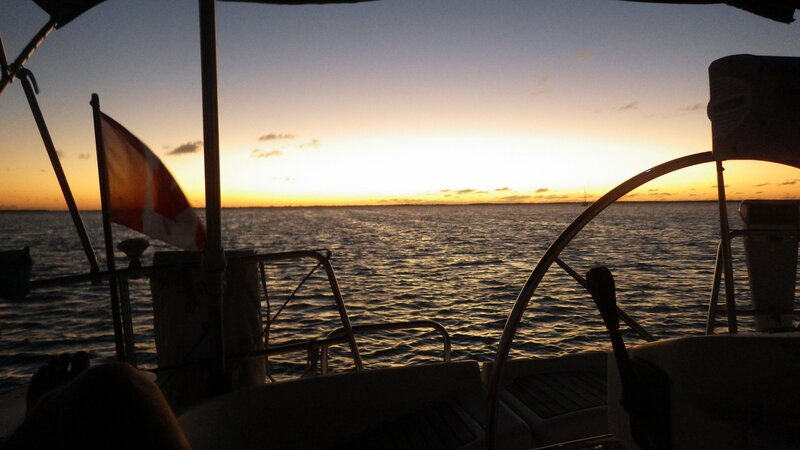 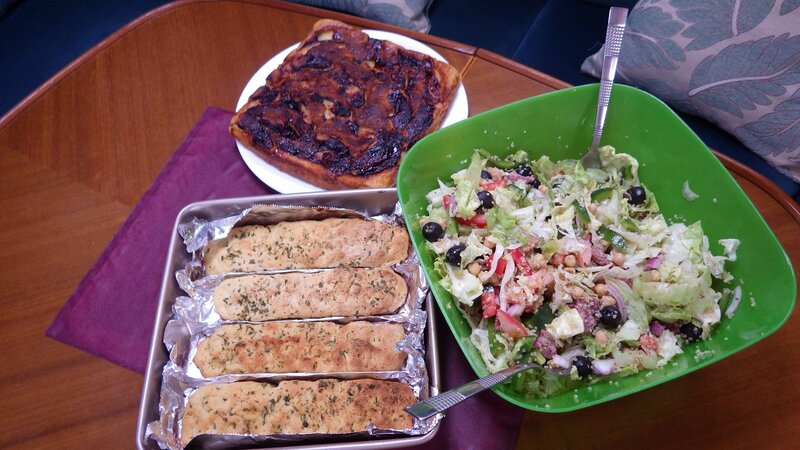 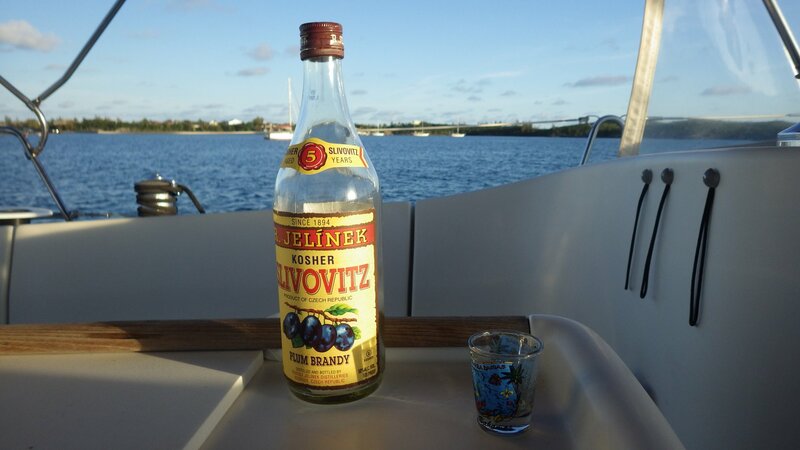 That day we hosted a small party night with a cruising couple from another boat. 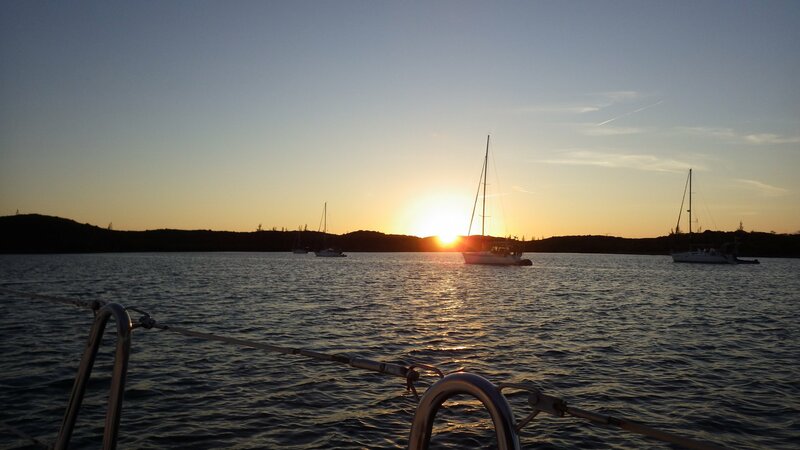 Stayed several days at Hatchet Bay Harbour. 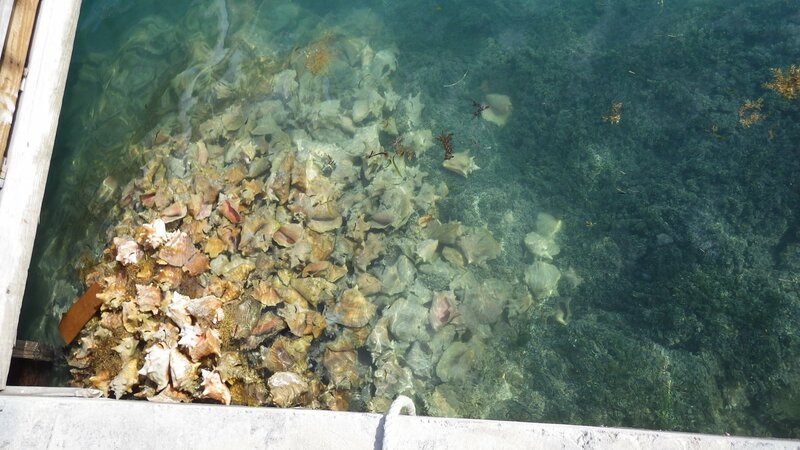 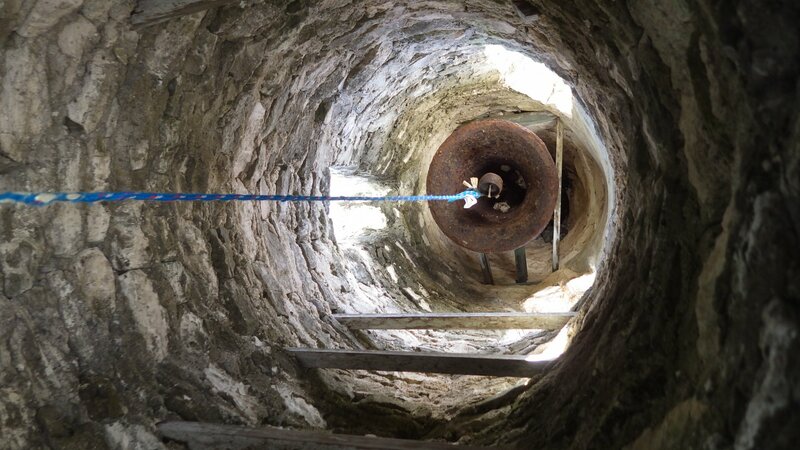 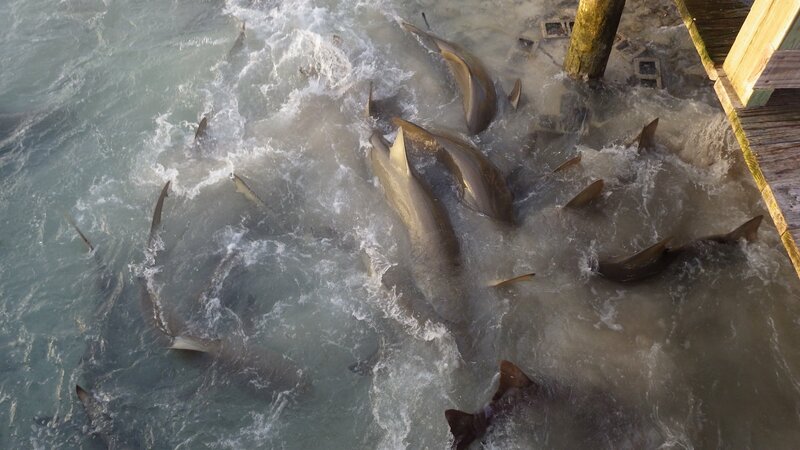 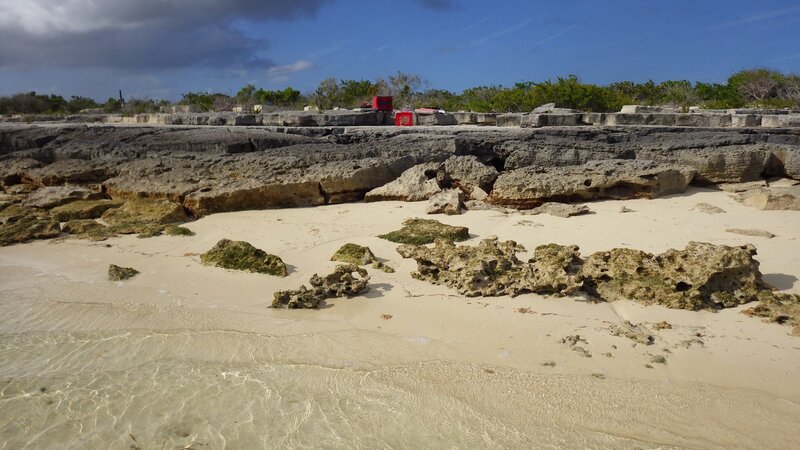 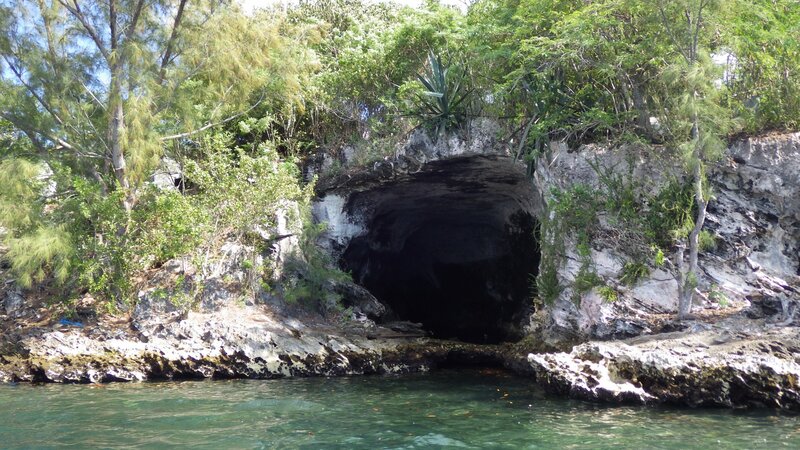 It is completely enclosed harbor with very narrow passage blasted through the rock. 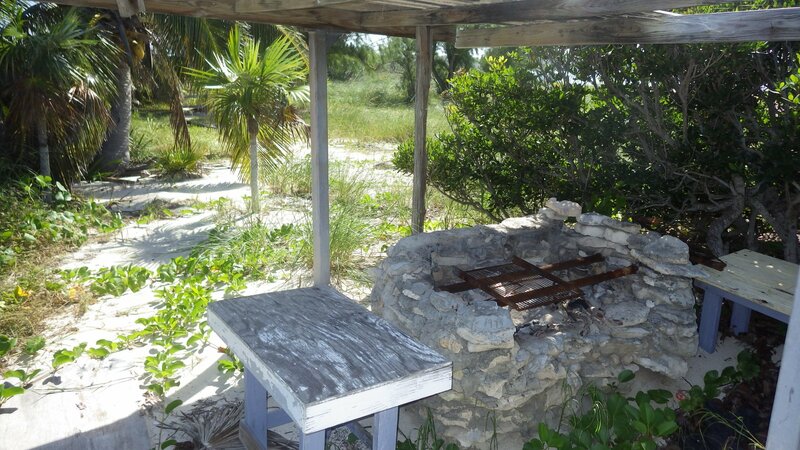 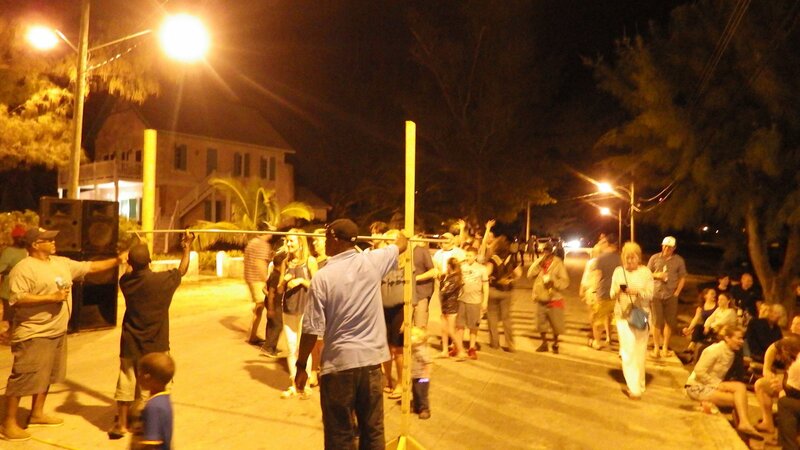 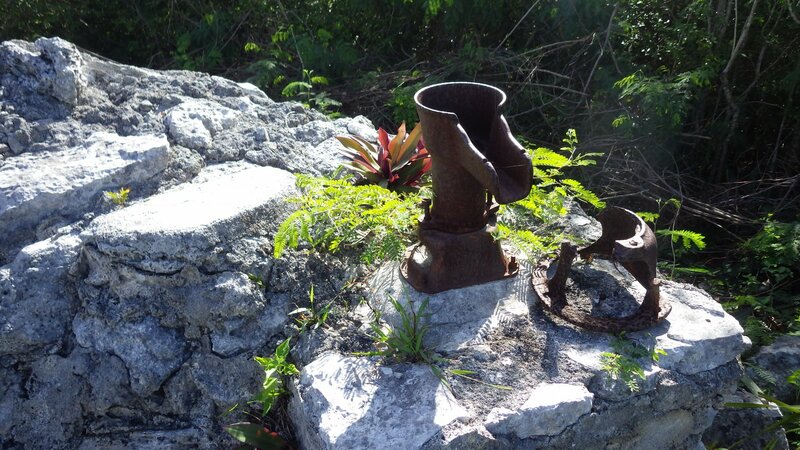 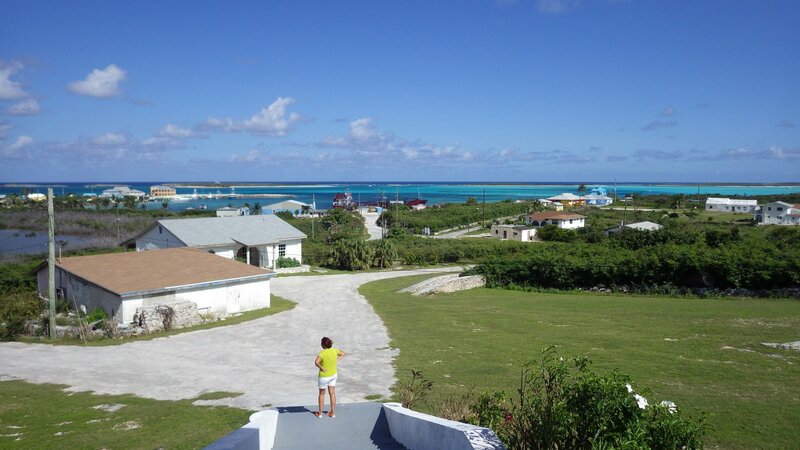 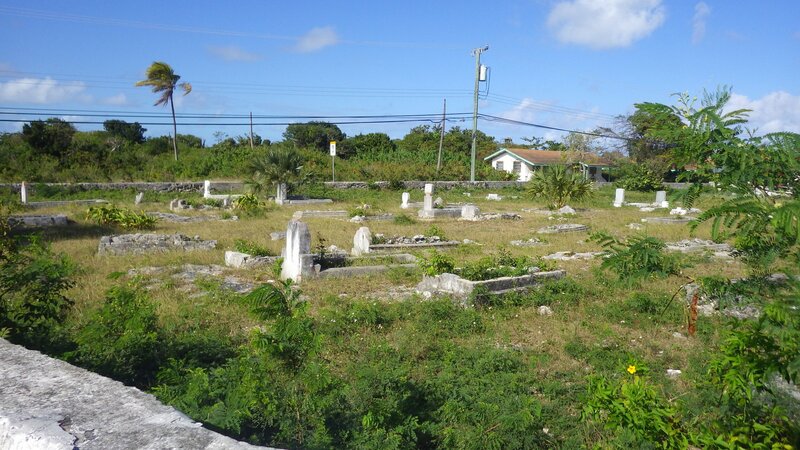 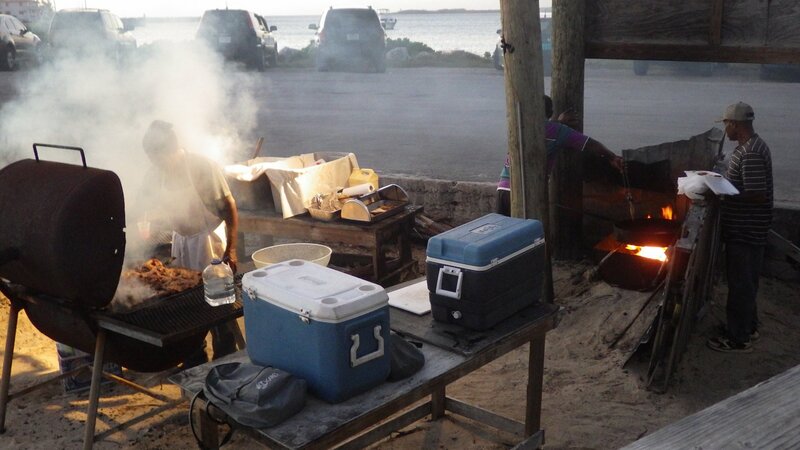 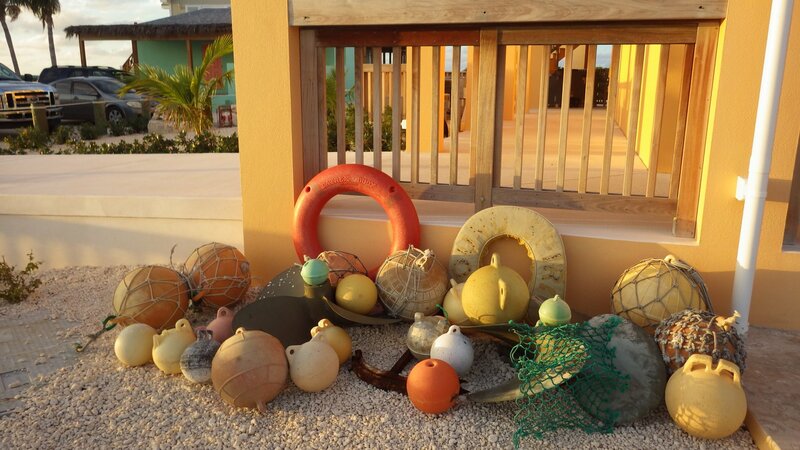 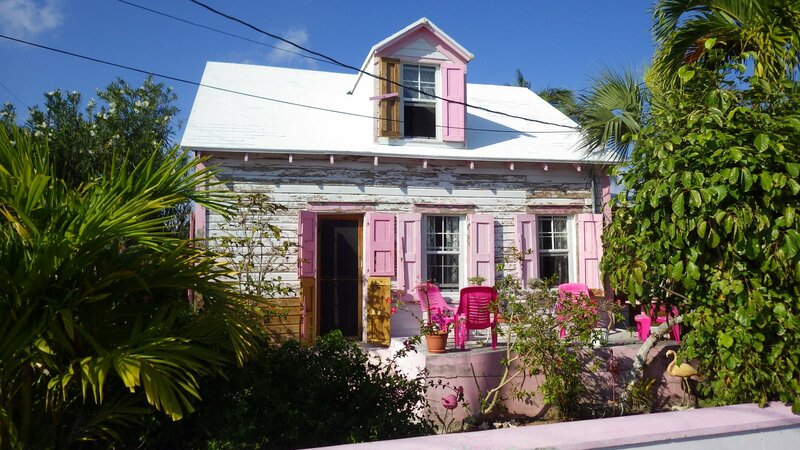 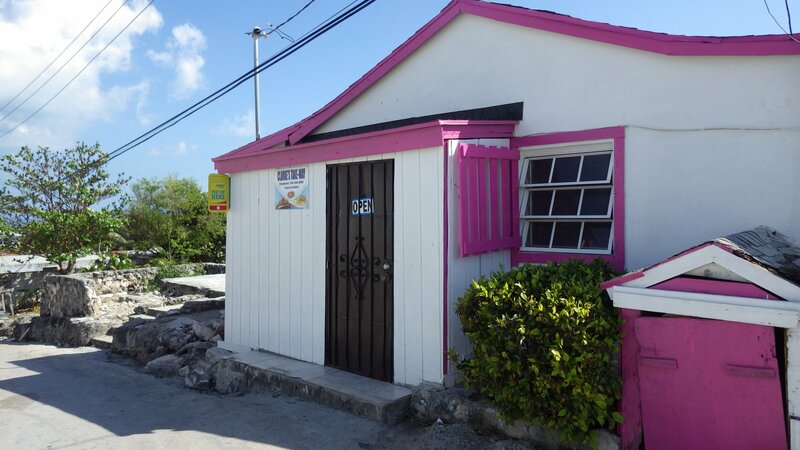 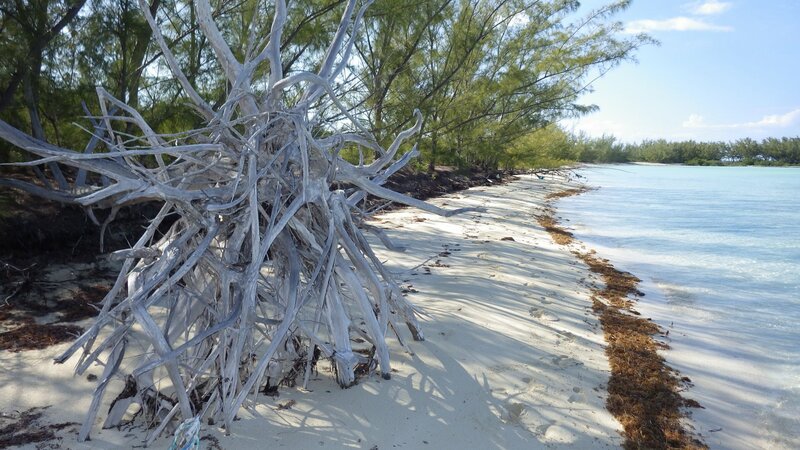 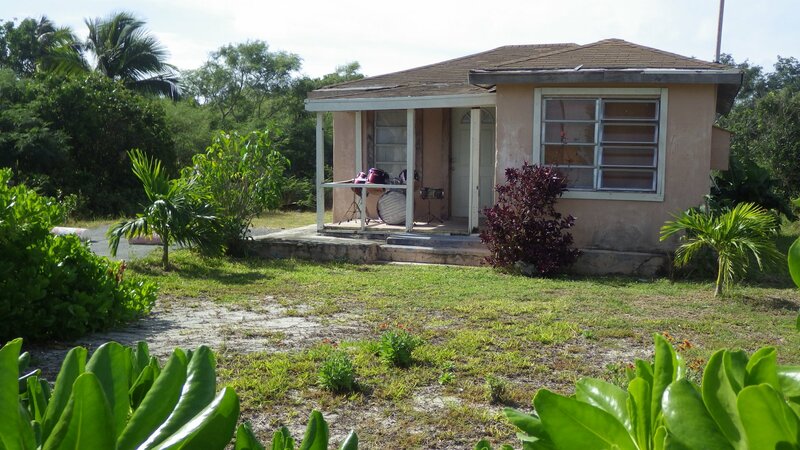 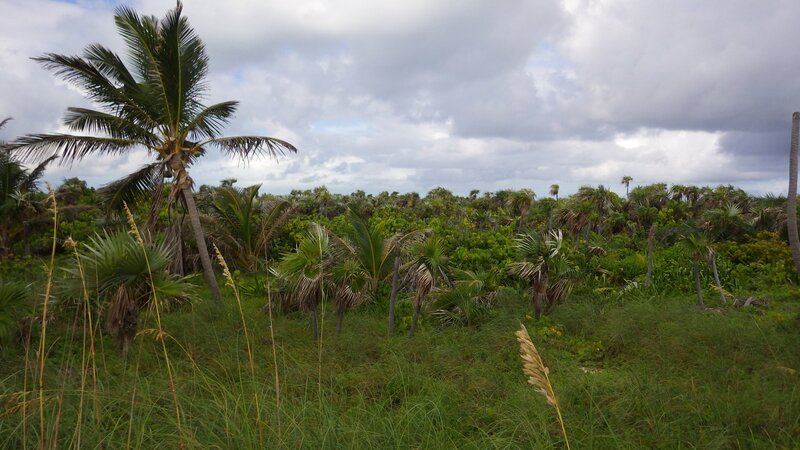 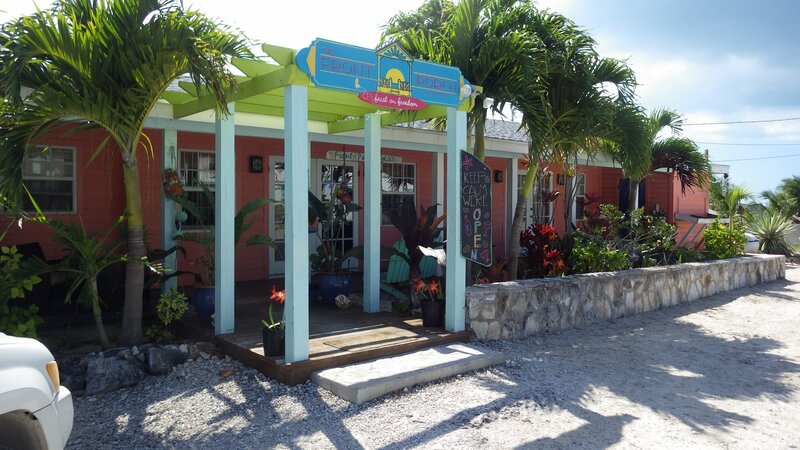 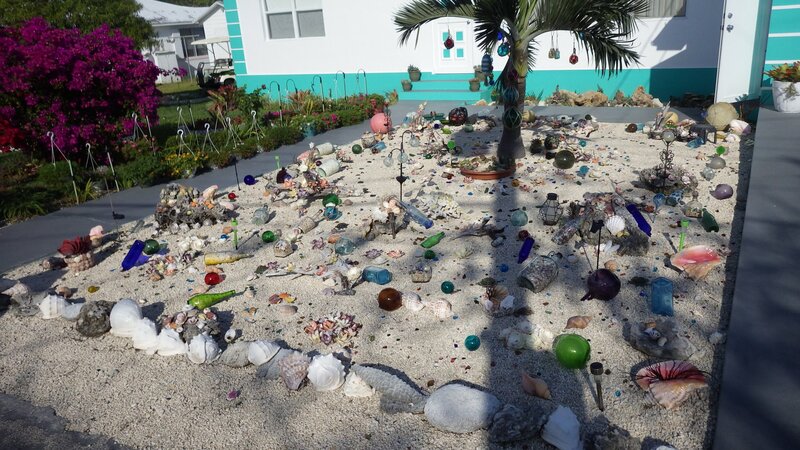 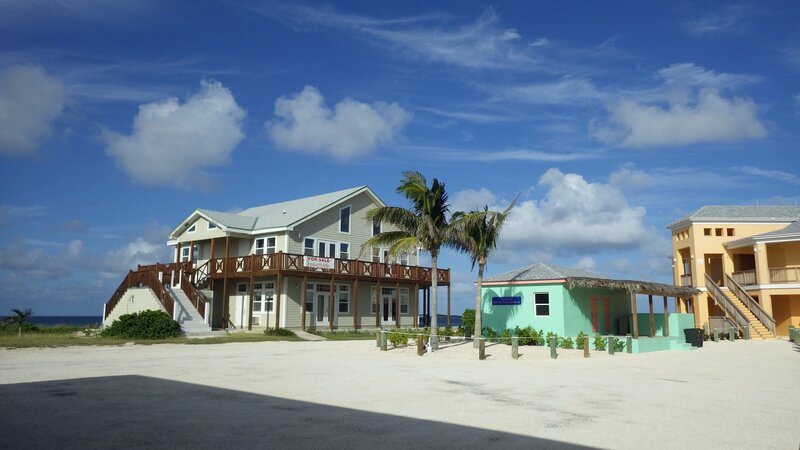 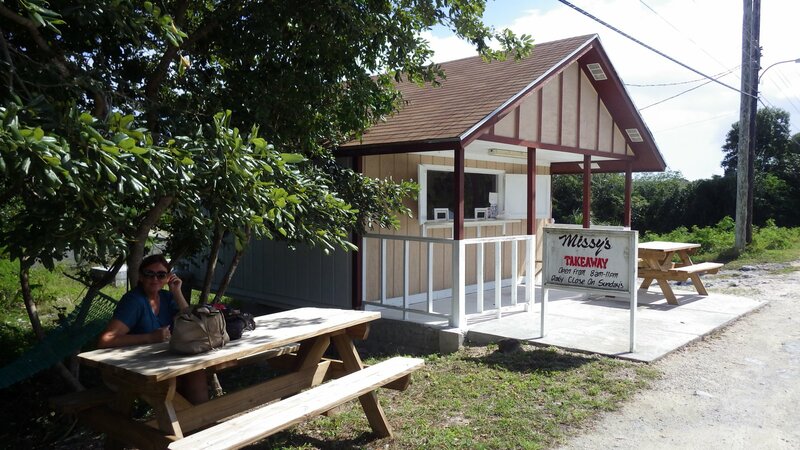 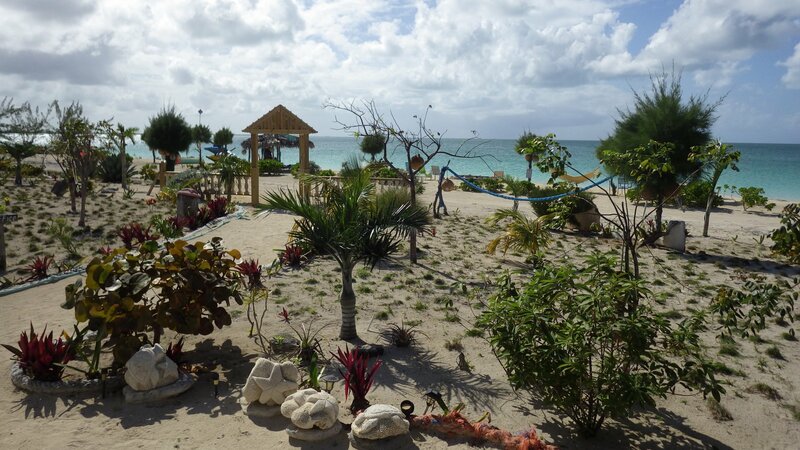 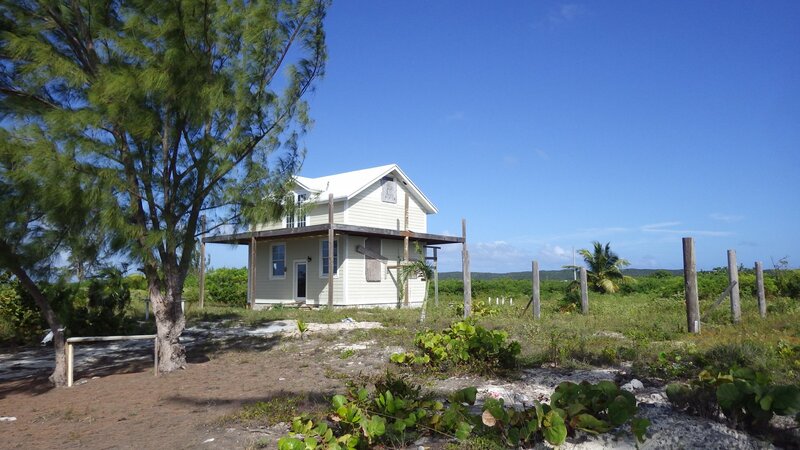 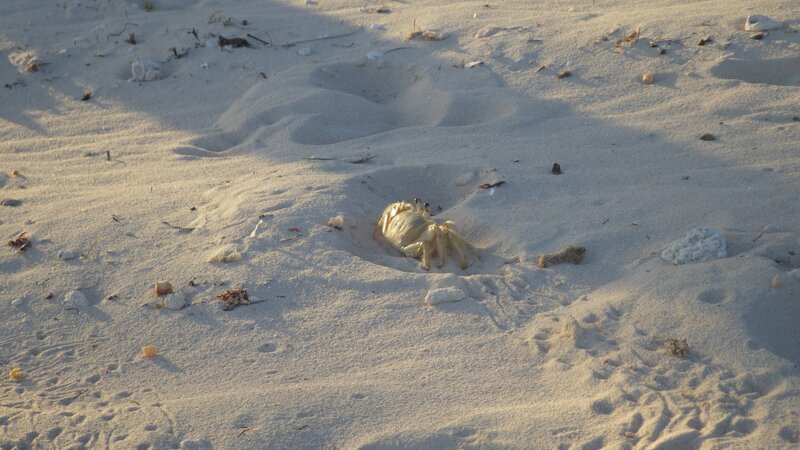 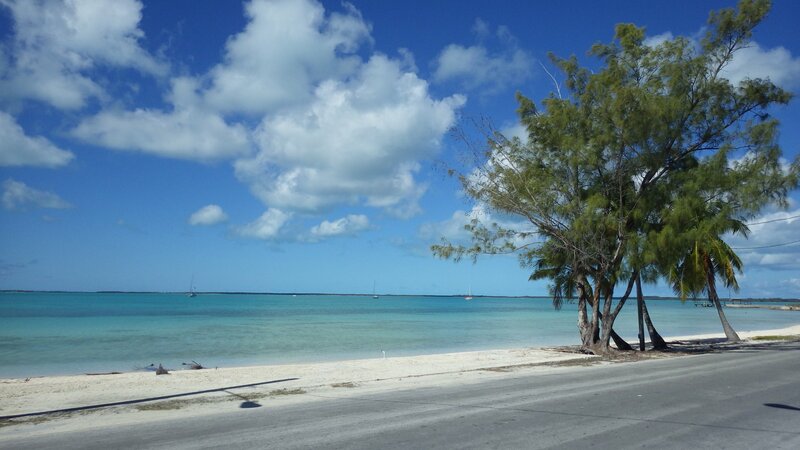 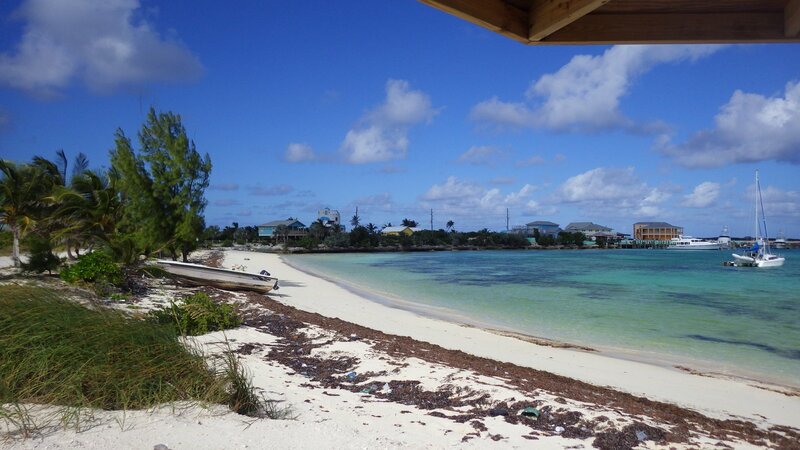 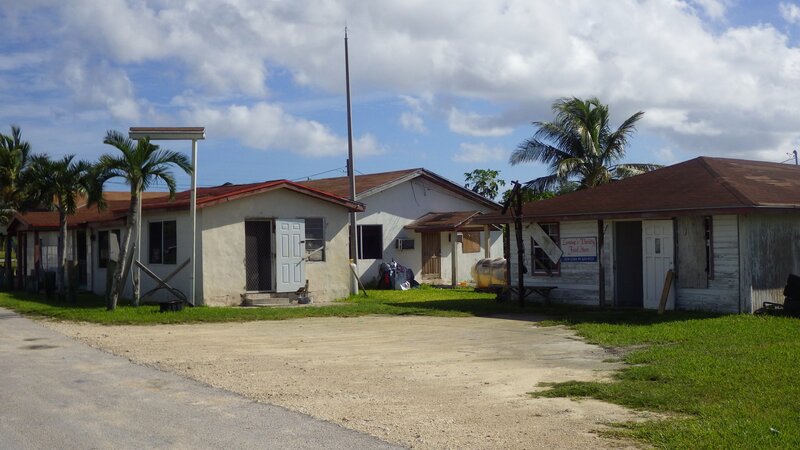 Alice Town was OK, with decent stores (for Bahamian standards), but quite lot of garbage around for our taste. 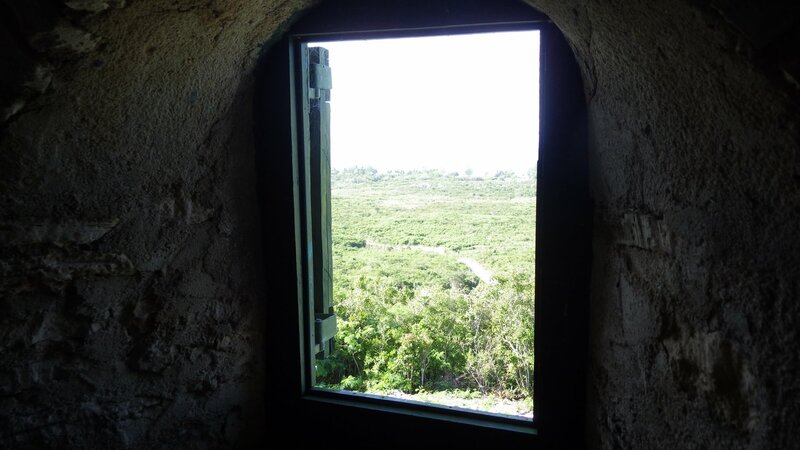 Finally, Glass Window � a very interesting place. 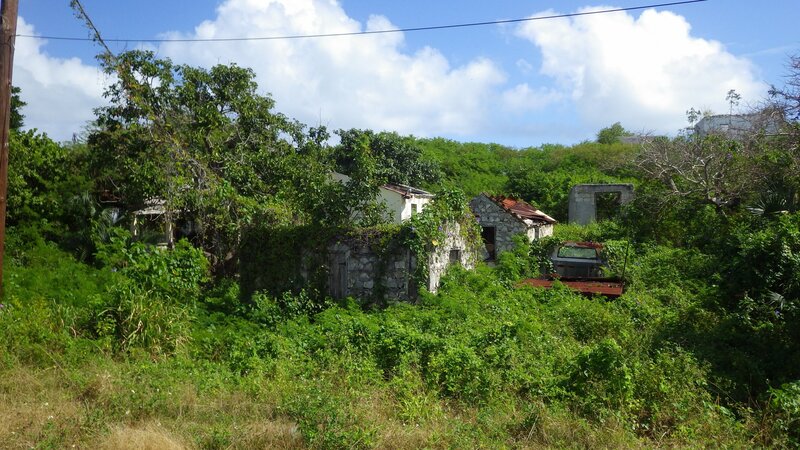 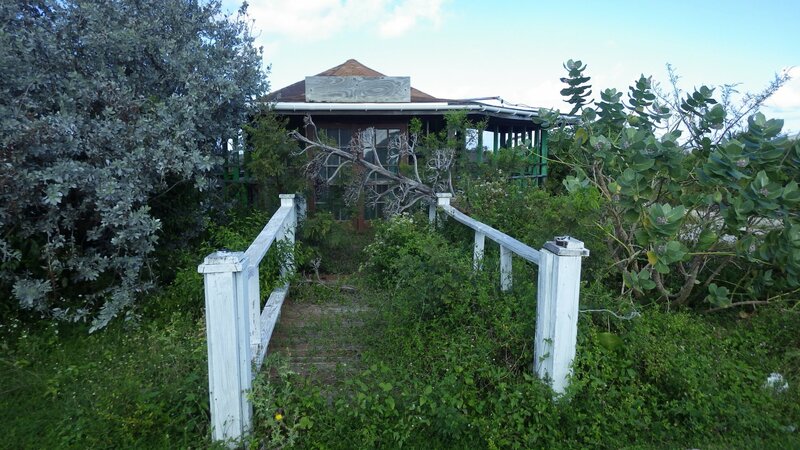 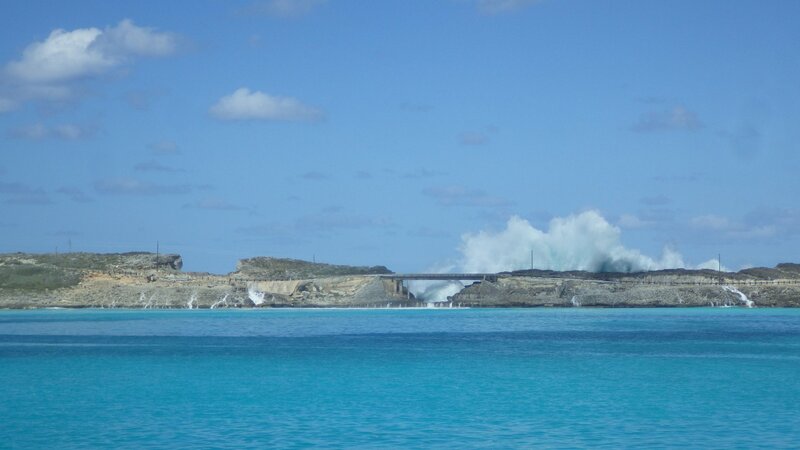 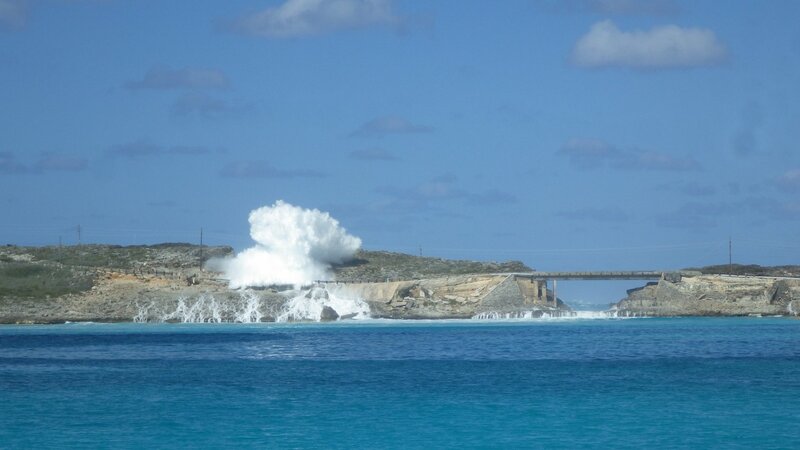 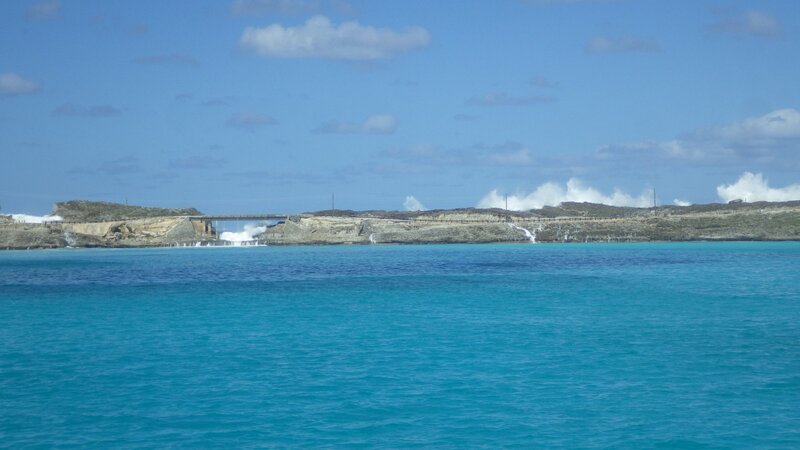 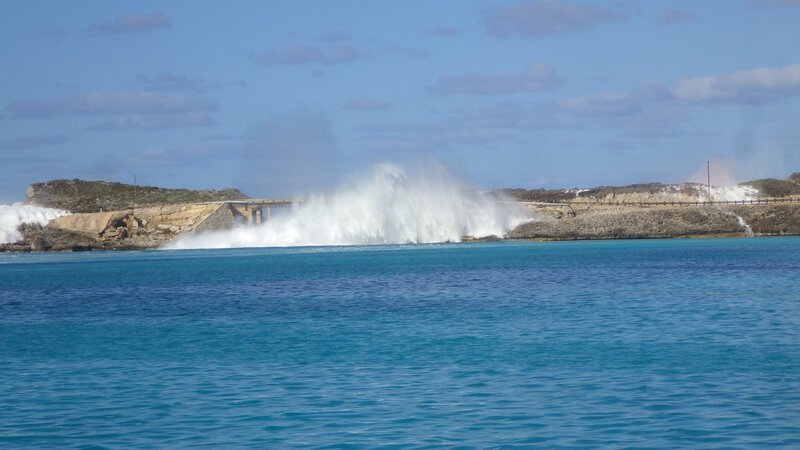 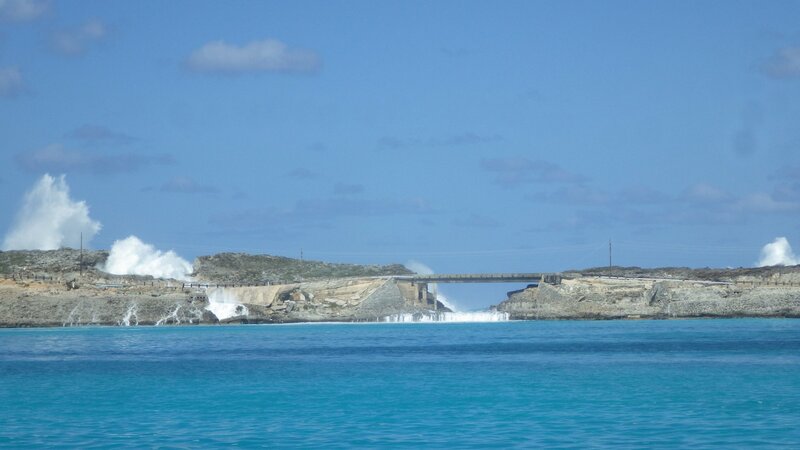 It is the narrowest part of the entire island, and when you anchor on the leeward side of it, you can see huge waves from the windward side blasting over the bridge. 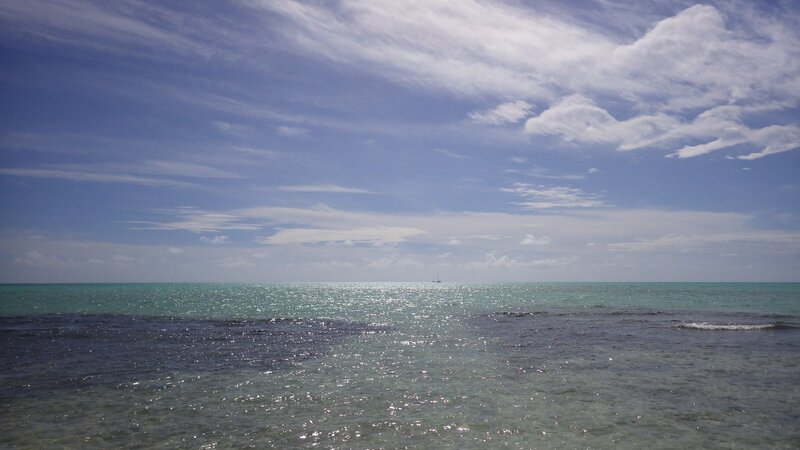 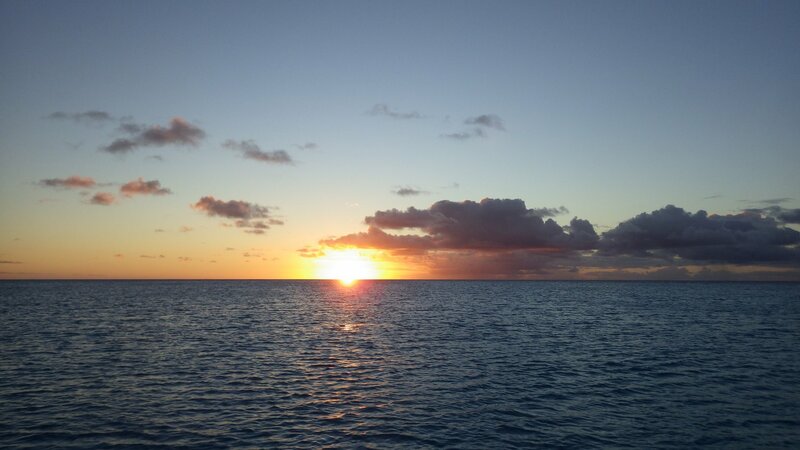 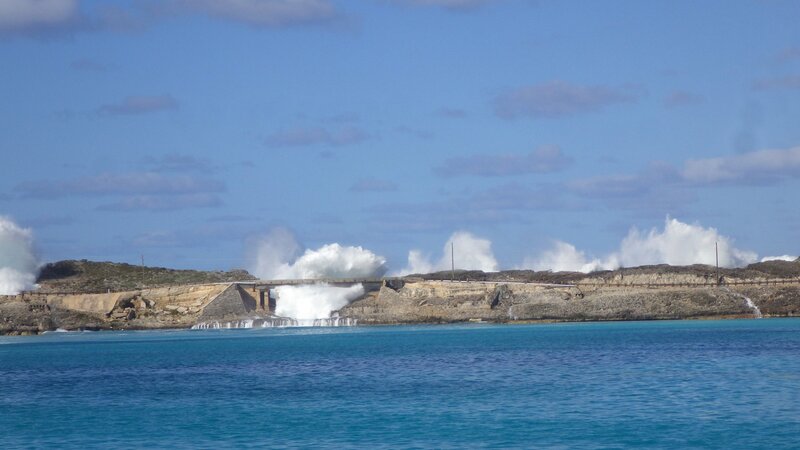 Quite a scenery � really feel the power of ocean. 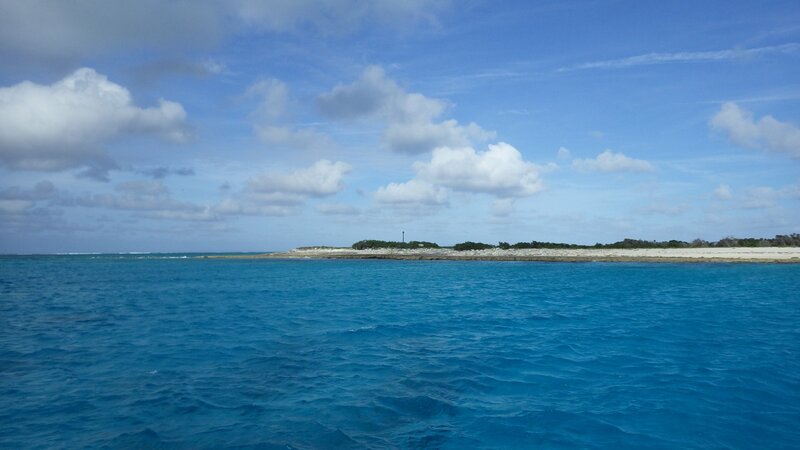 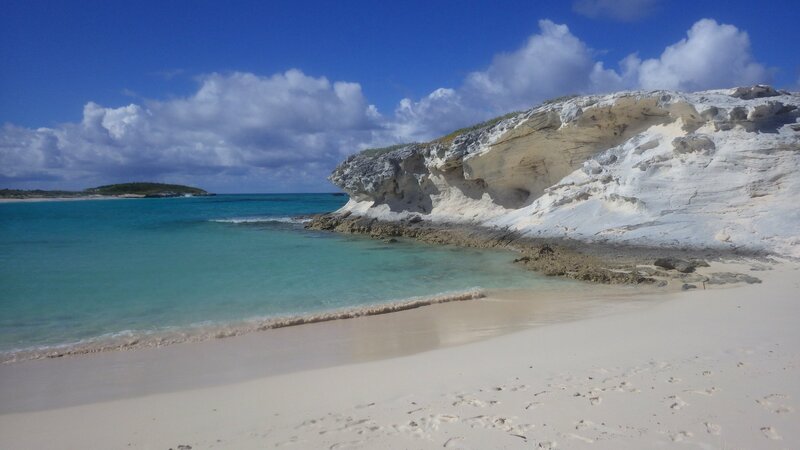 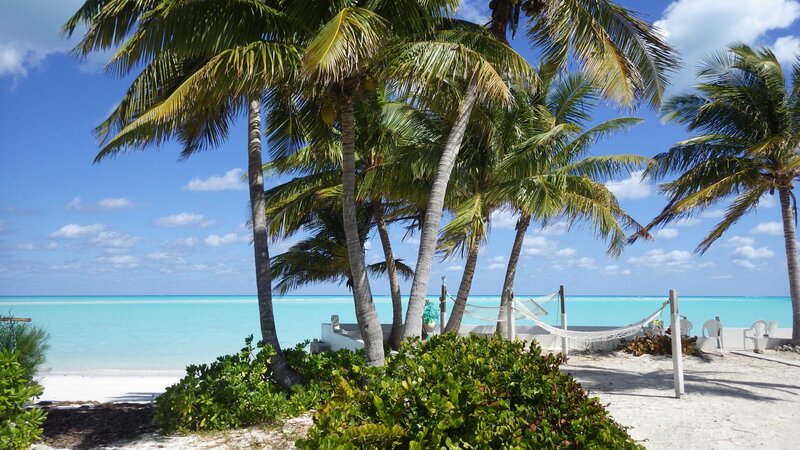 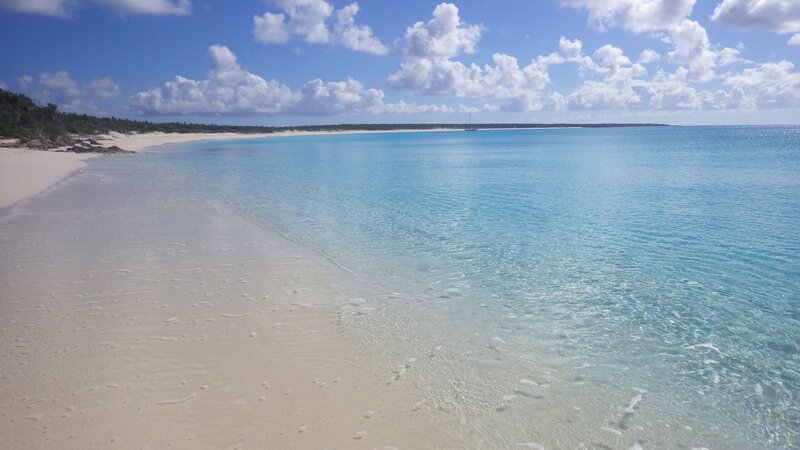 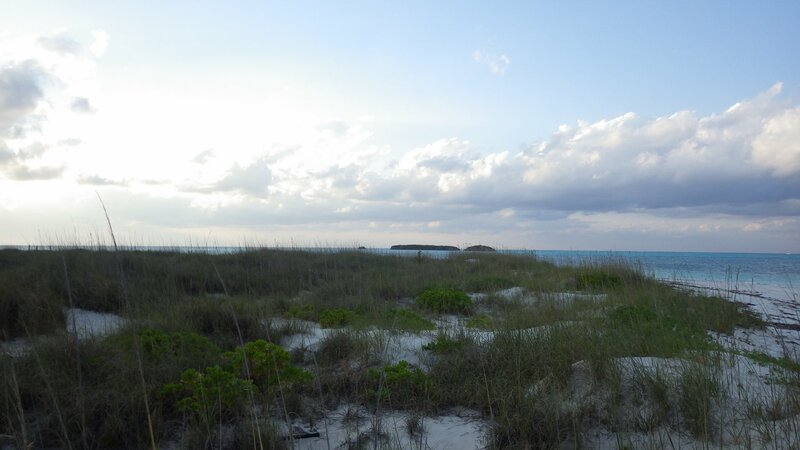 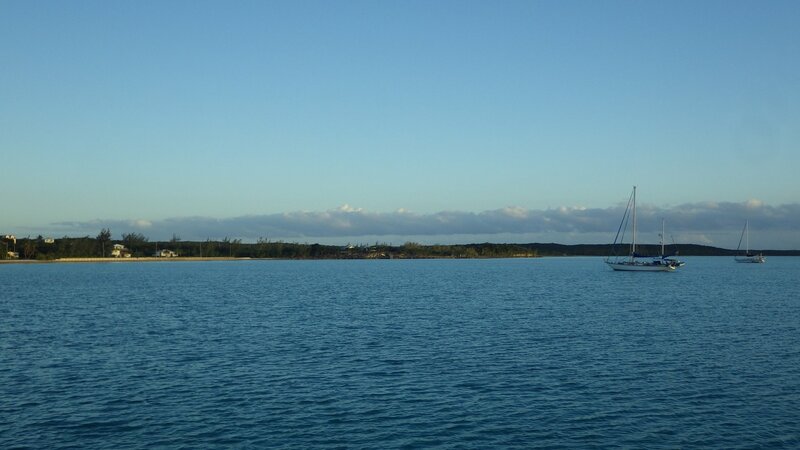 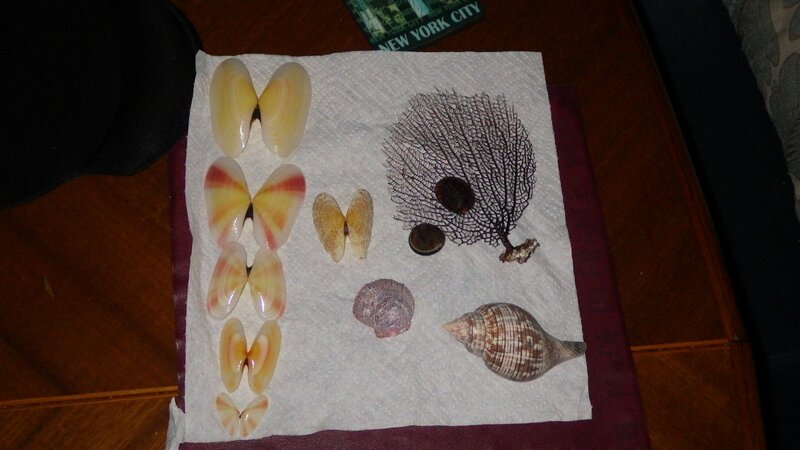 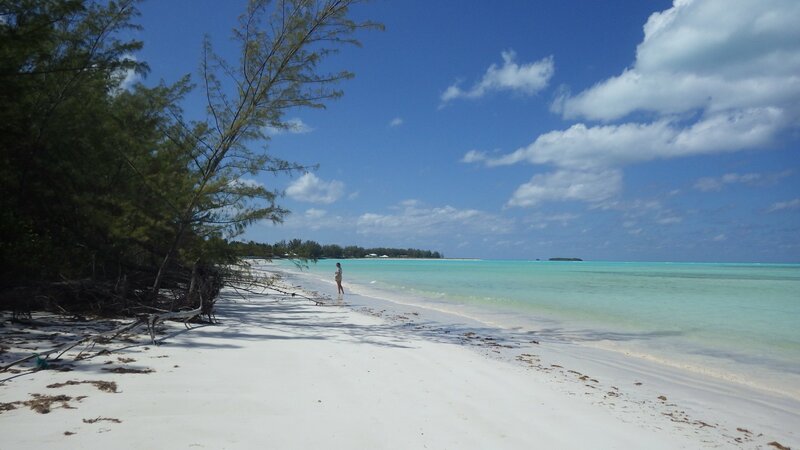 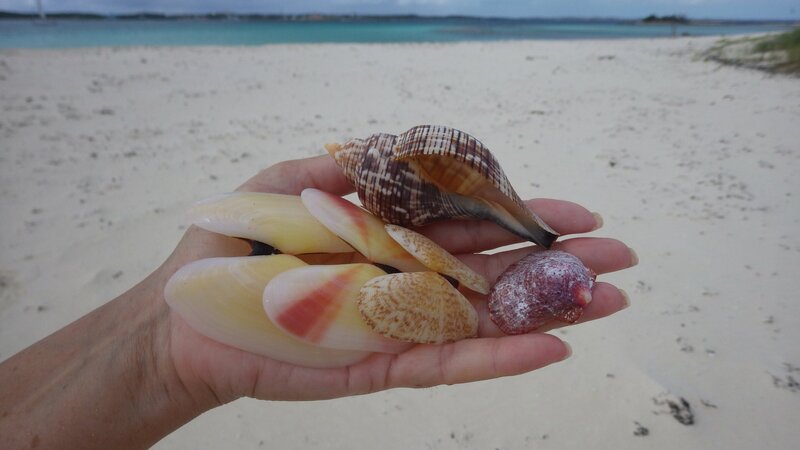 Spanish Wells is a fairly large area of islands and bays, protected from rough weather. 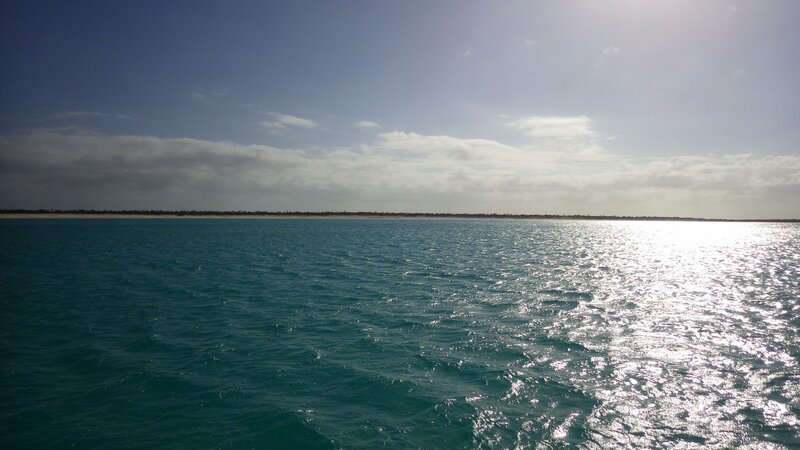 There are many anchorages to choose from, depending on wind direction, needs or likeness. 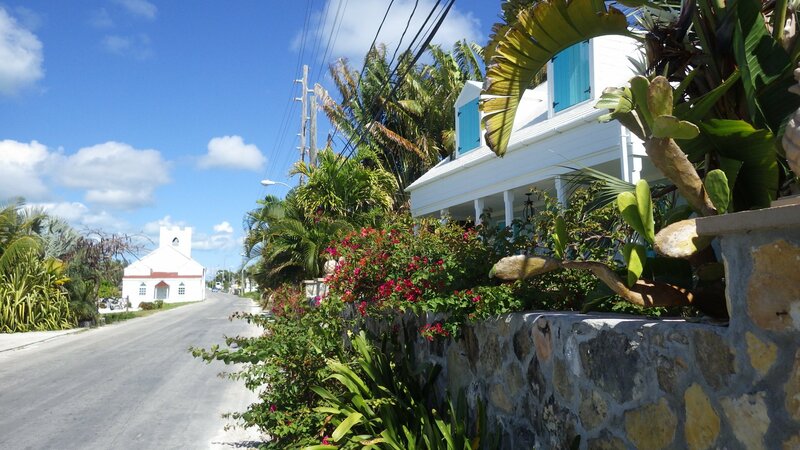 The town is quite pretty, people are friendly. 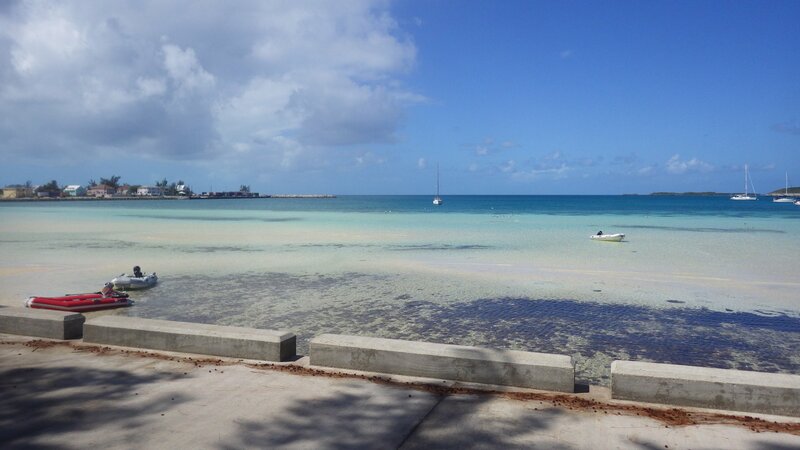 There are stores with decent supplies, places to eat and gorgeous public beach. 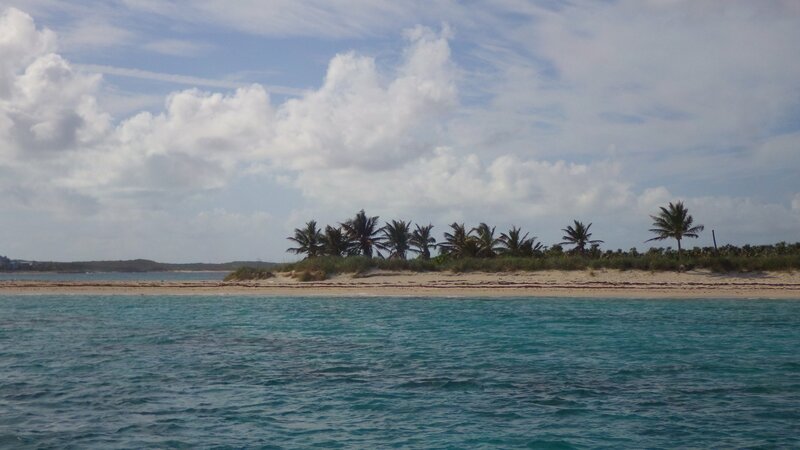 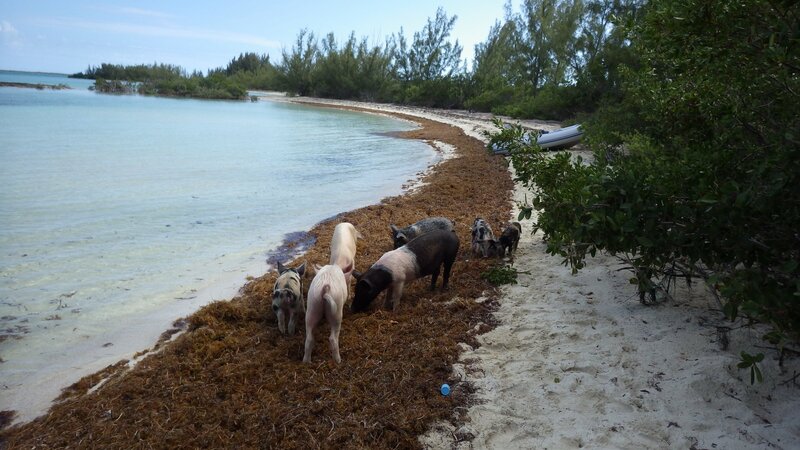 Also anchored at nearby Royal Island, Meeks Patch where there are semi-wild pigs, and had a fun sunset cruisers party at Egg Island beach.